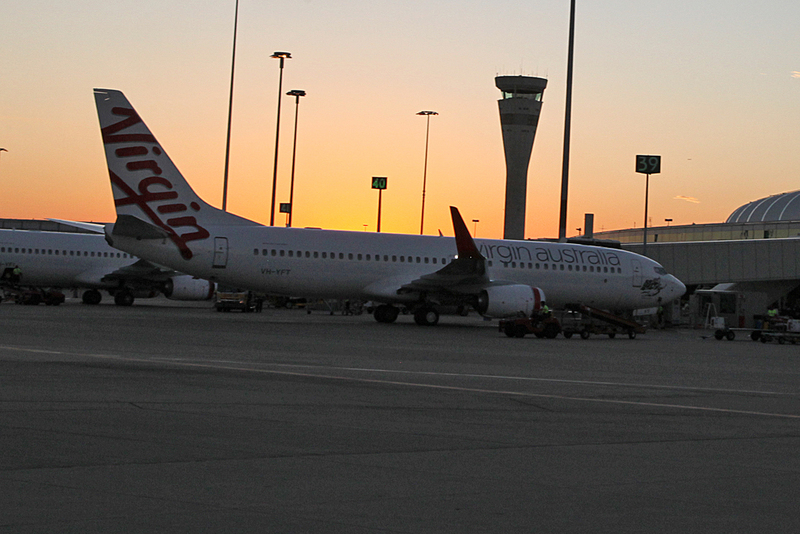 Not as early start as the night before, but still early. 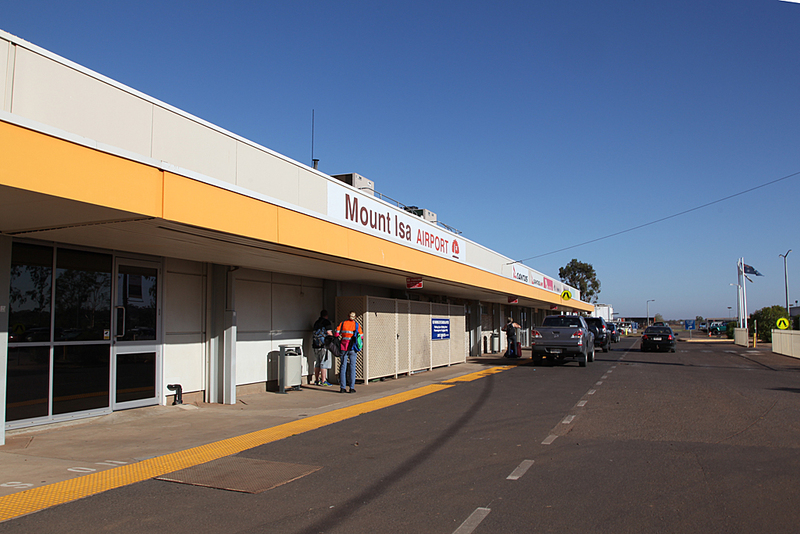 Taxi was at the motel by 7:30 AM. 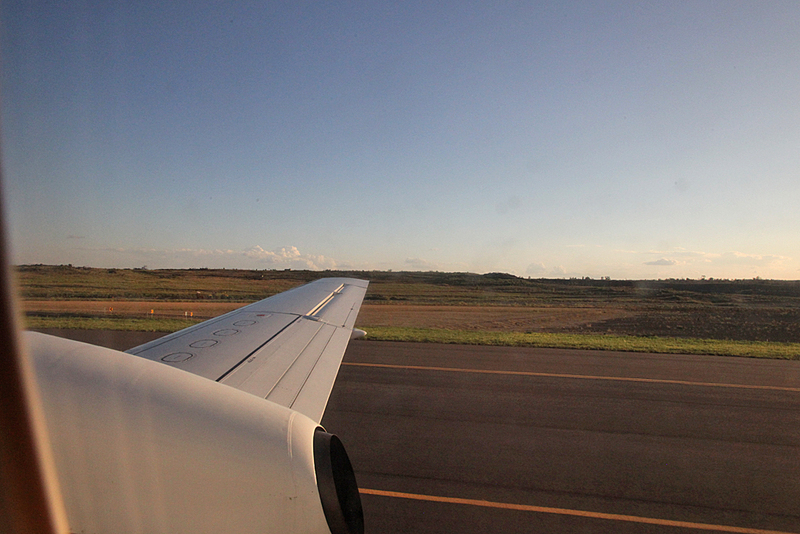 Quick trip the airport. 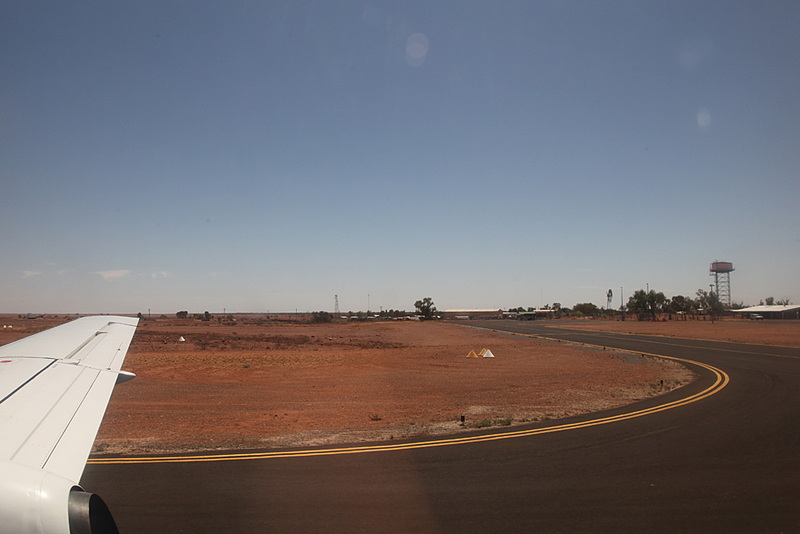 One of the better airport signs I have seen. 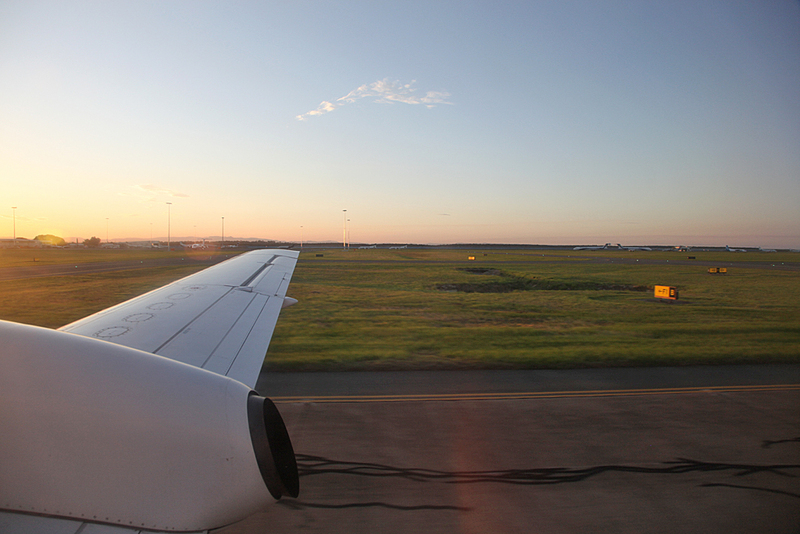 Managed to get through security without anything beeping. 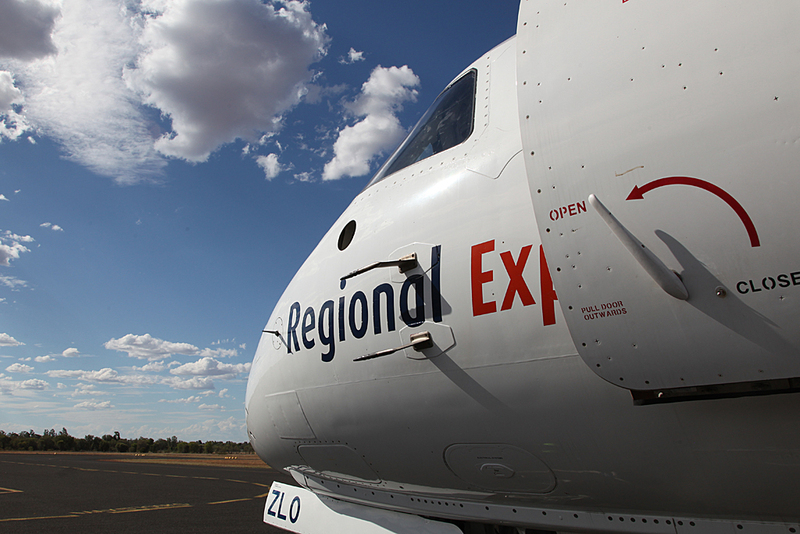 Once word had got around amongst the REX staff, that we were the intrepid travellers that had come up the day before, a copy of the book REX The First 10 Years was presented as as a gift. 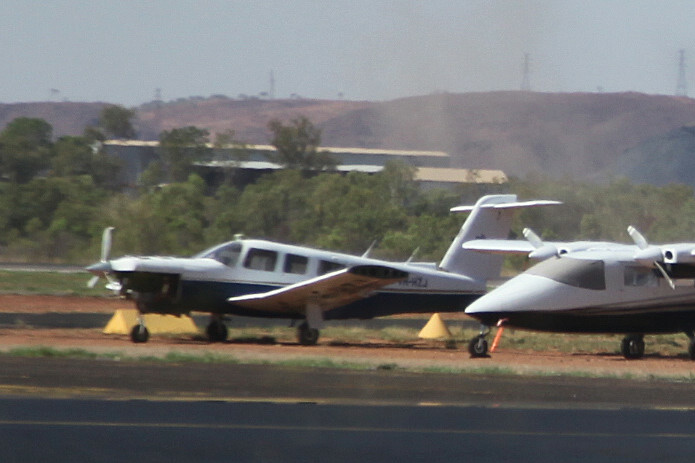 A few aircraft seen while waiting. 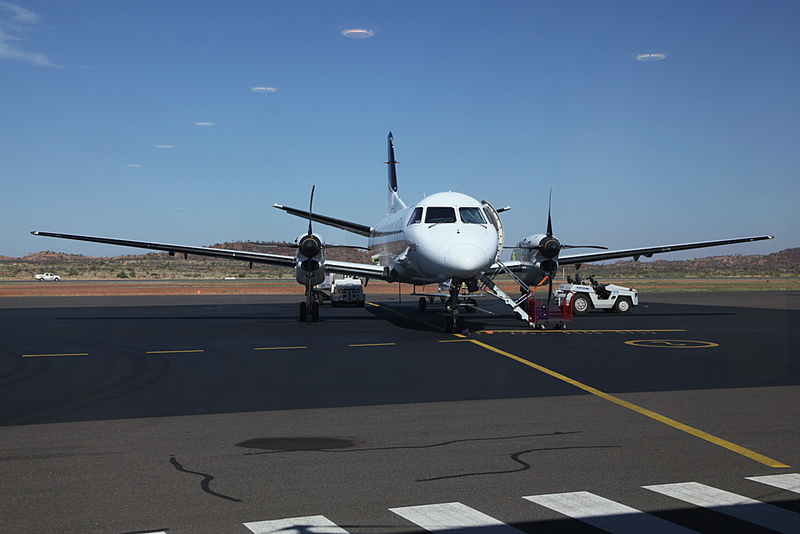 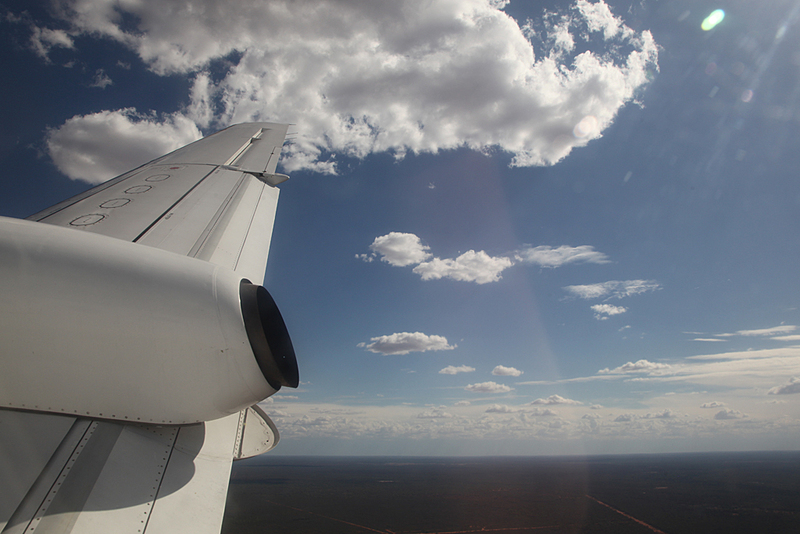 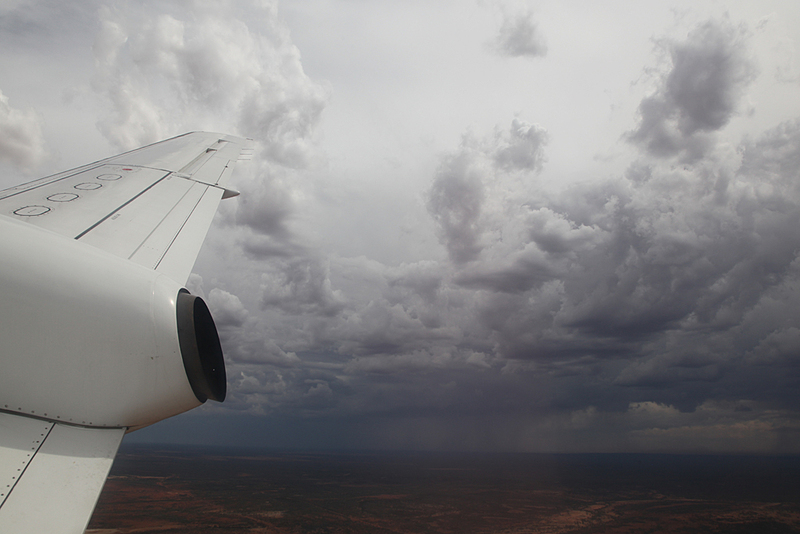 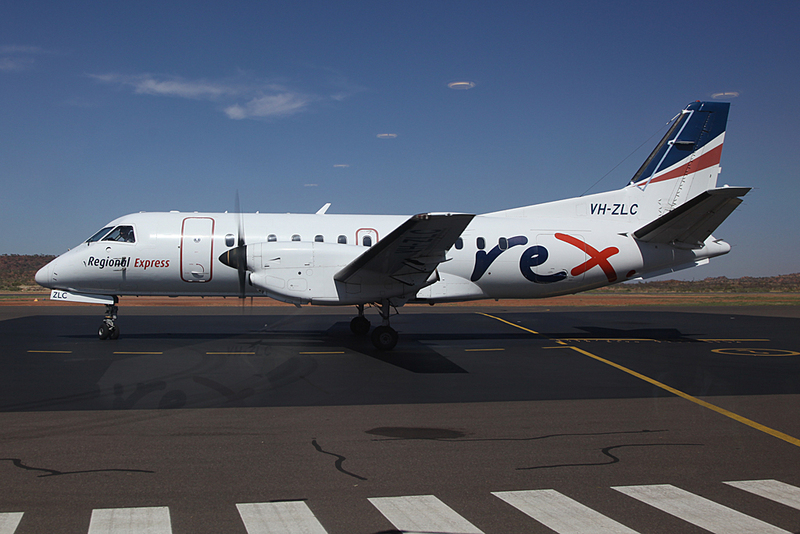 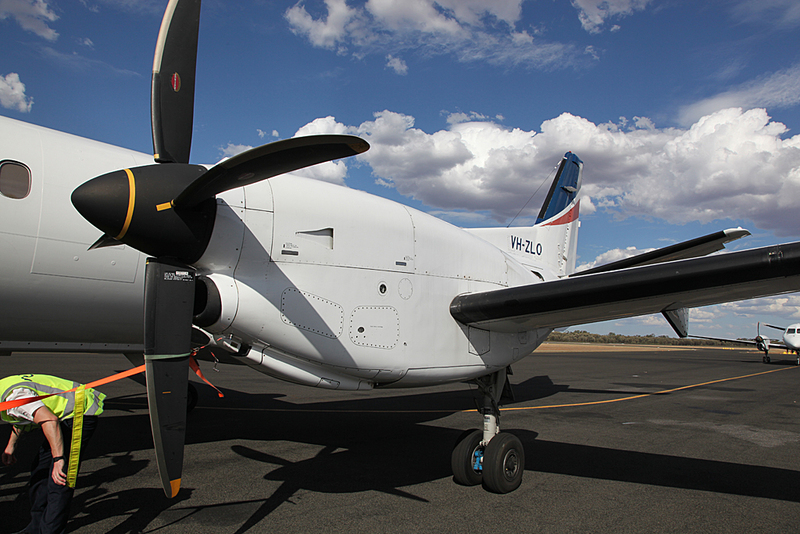 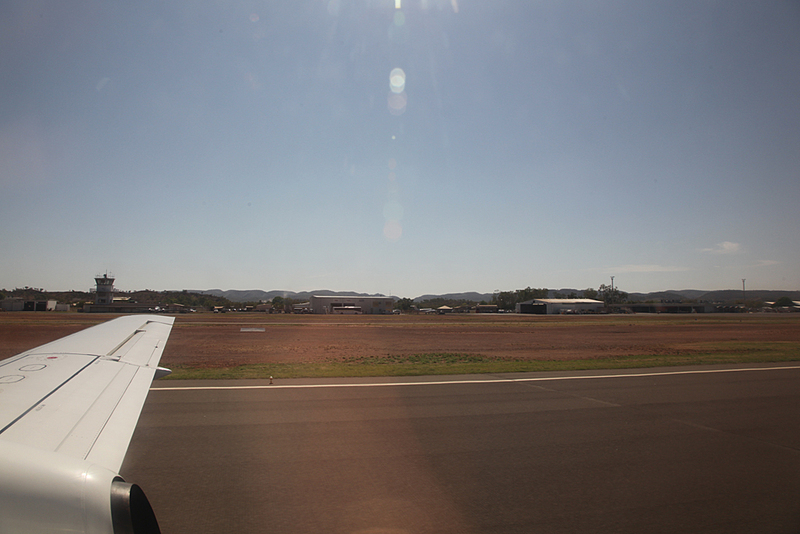 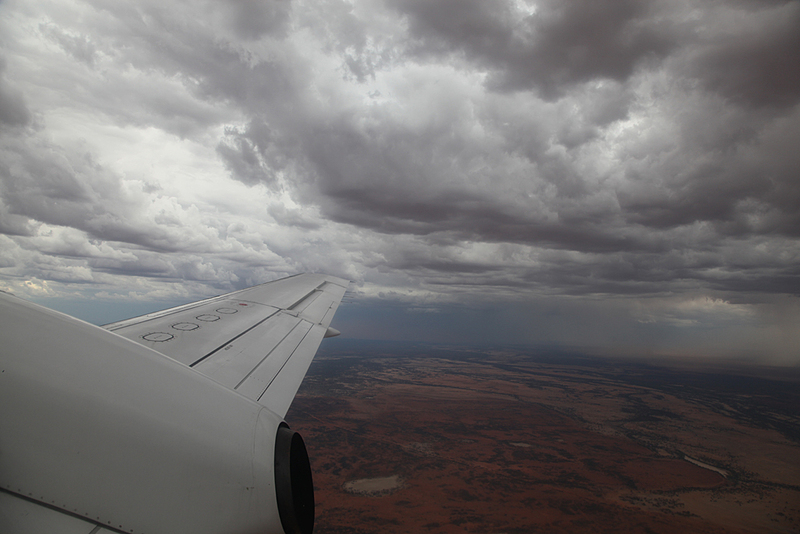 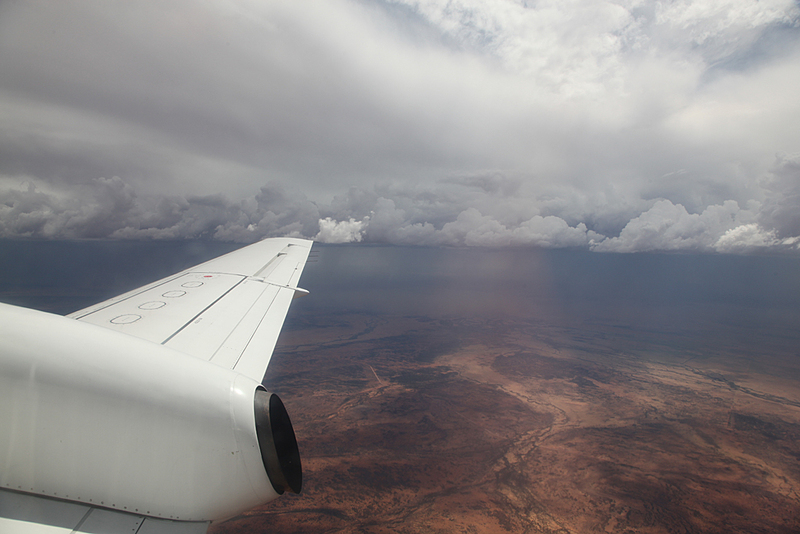 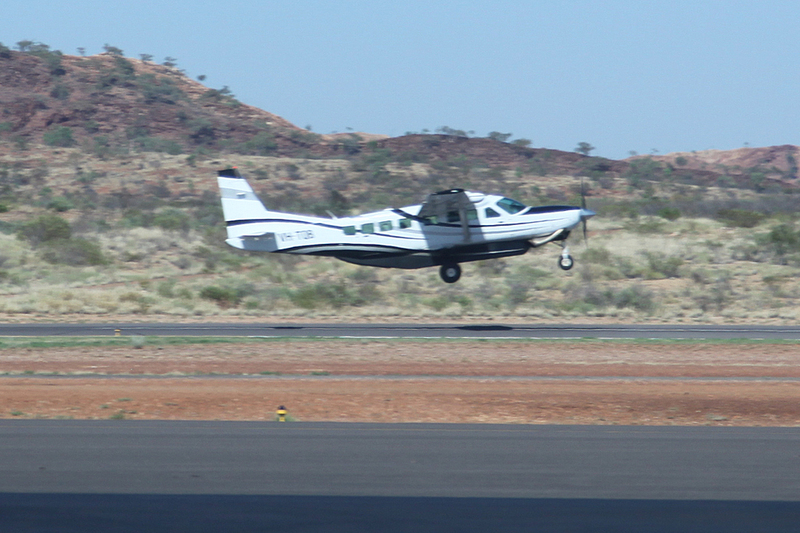 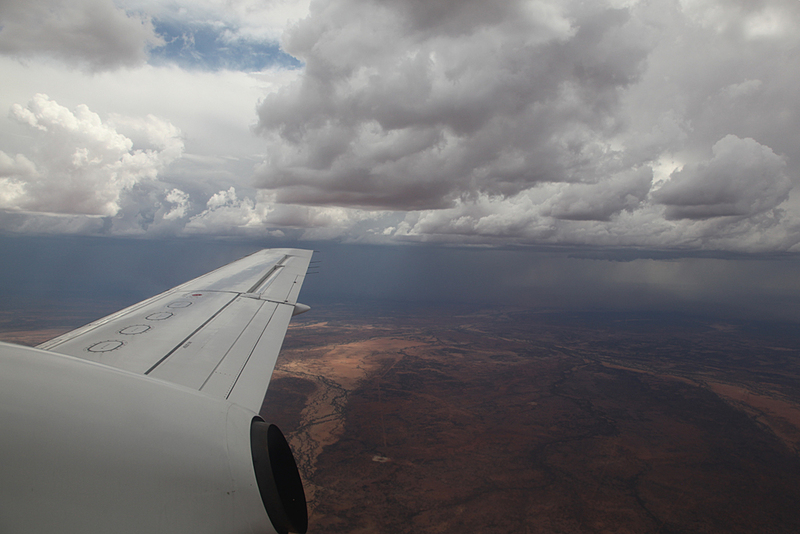 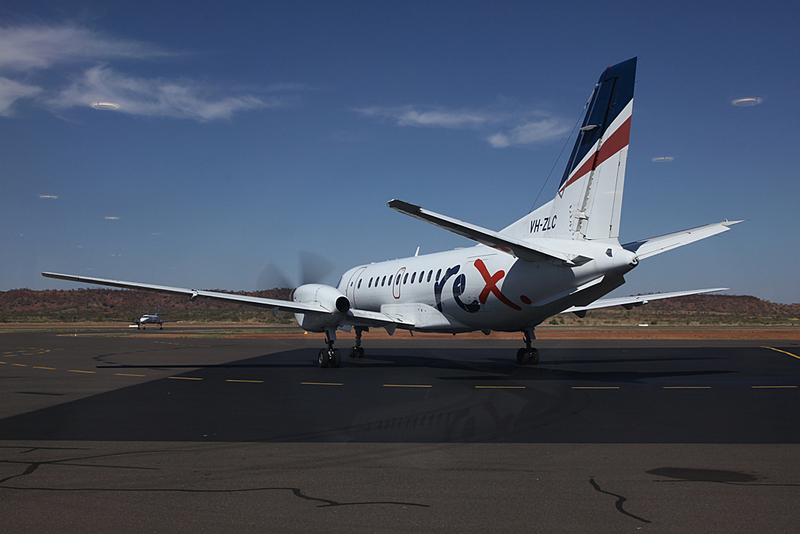 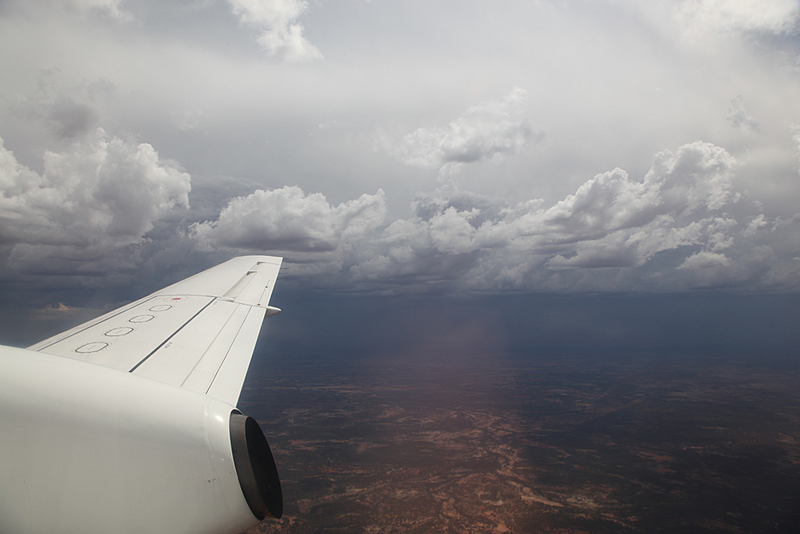 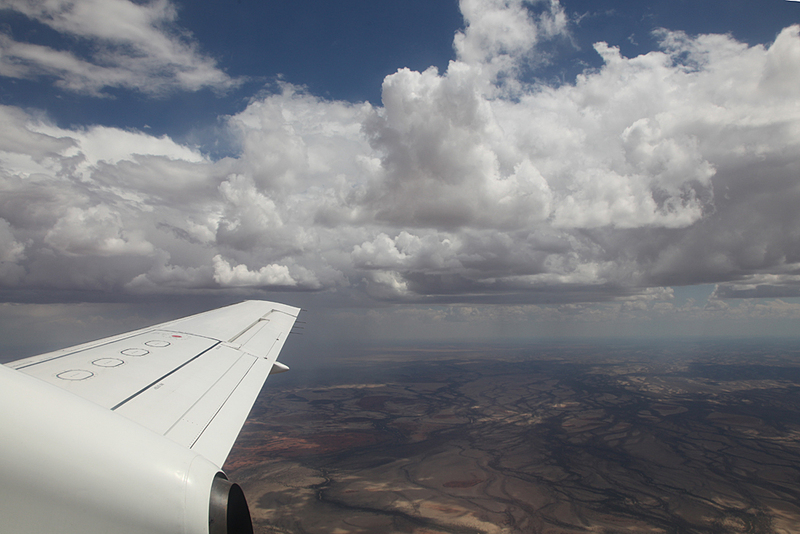 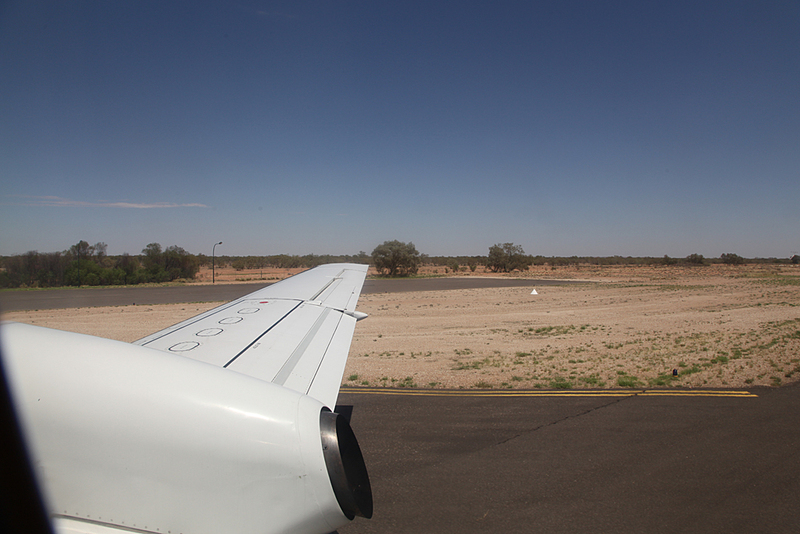 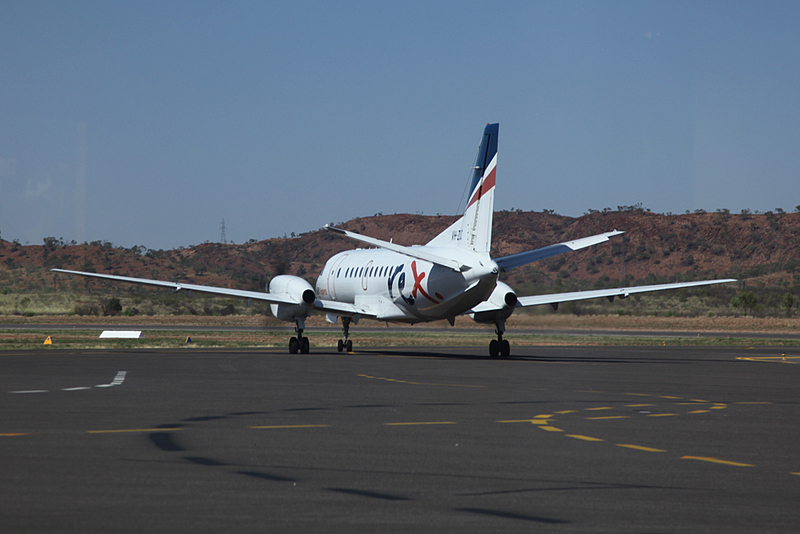 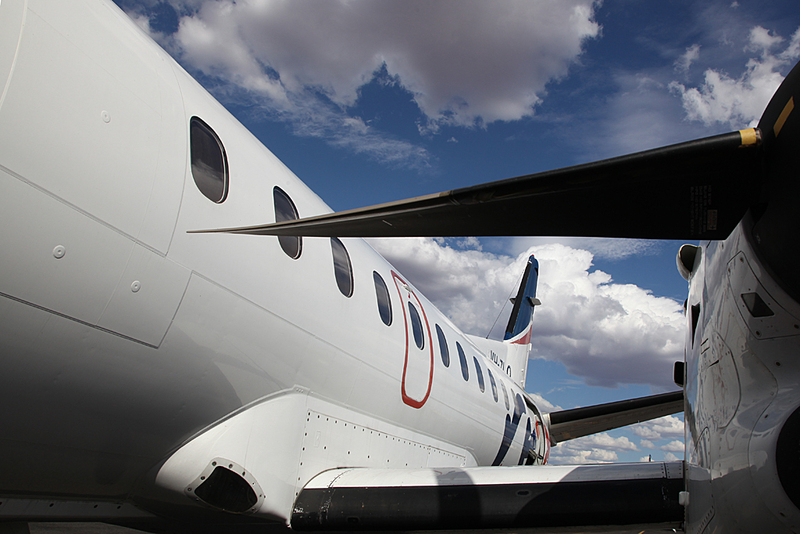 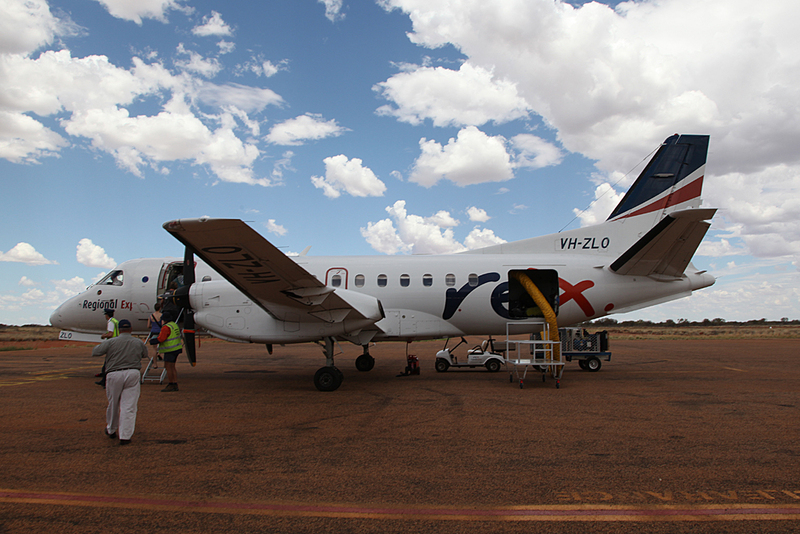 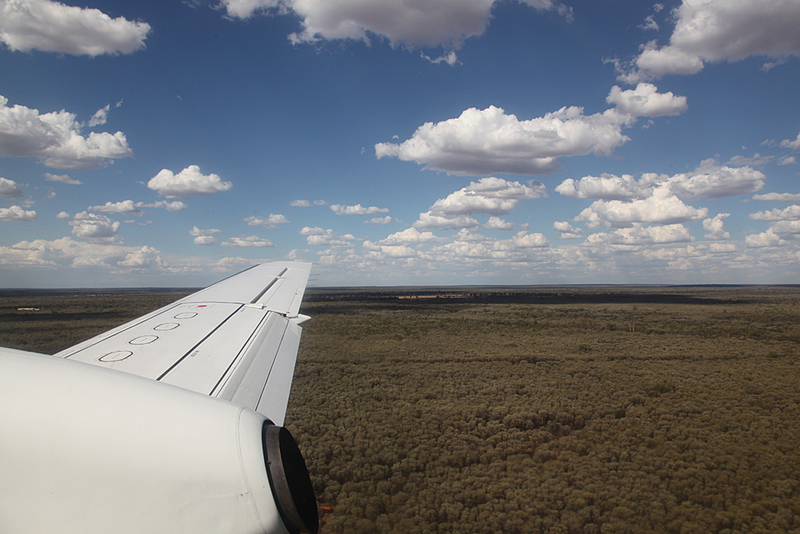 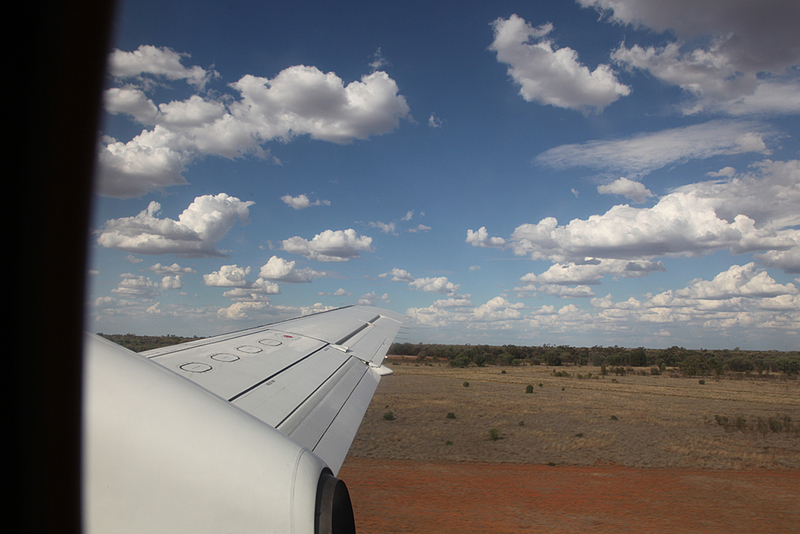 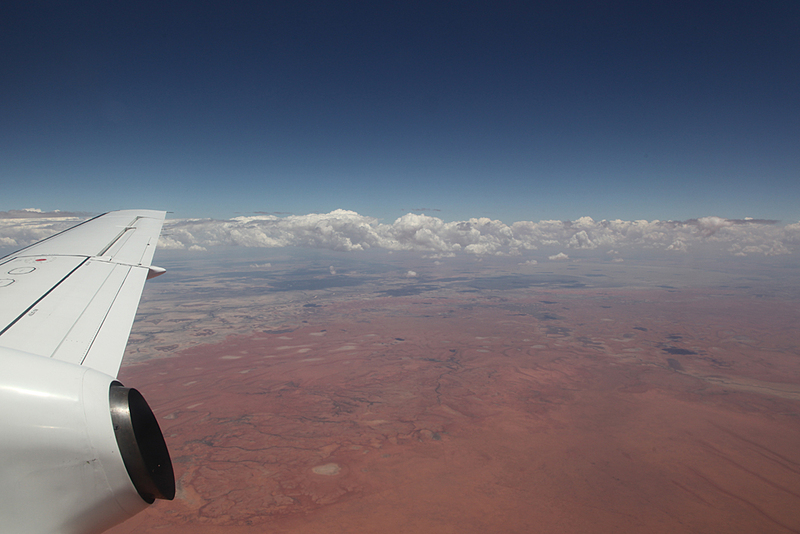 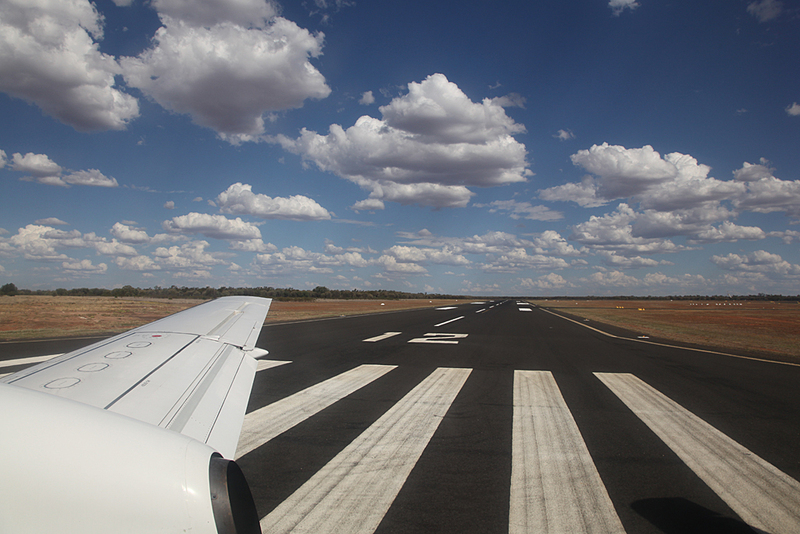 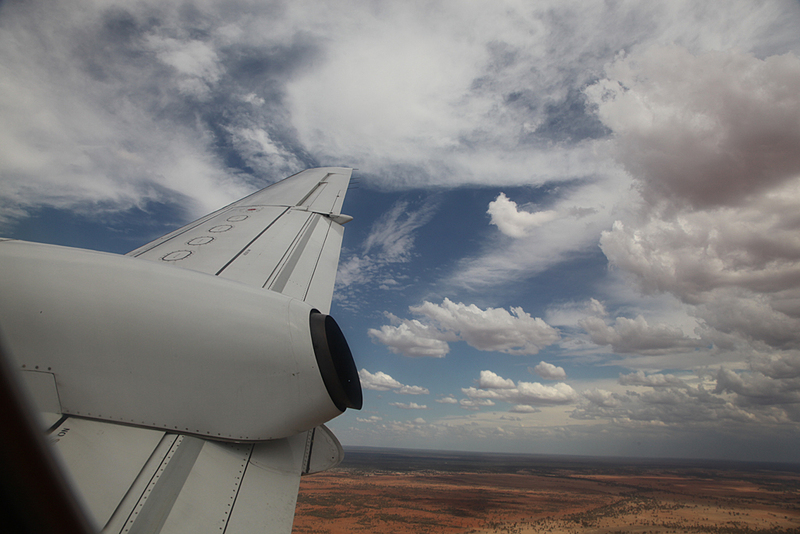 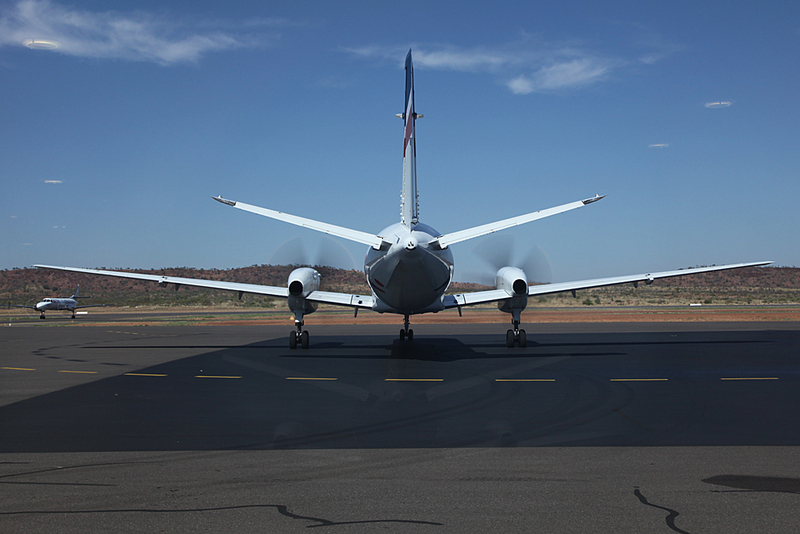 Another REX flight off to Townsville that makes stops at Richmond, Julia Creek, Hughenden and Townsville. 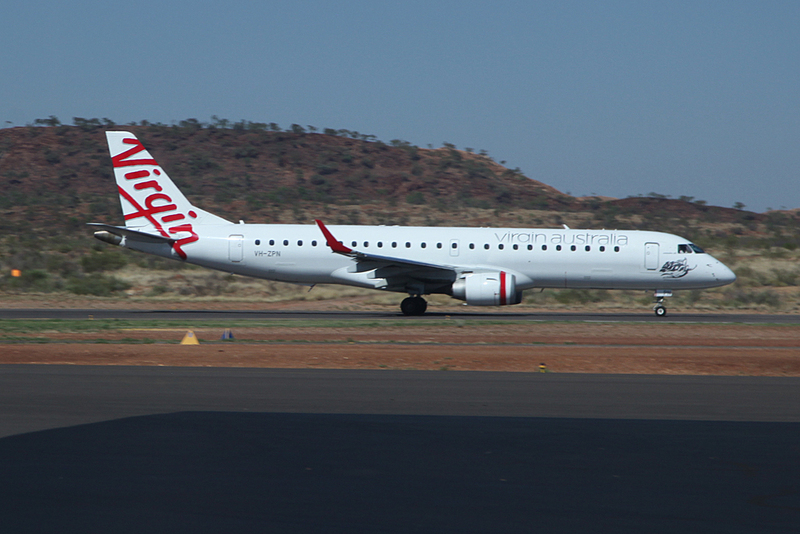 Virgin Australia ERJ-190 yaking the faster, less exciting route to Brisbane. 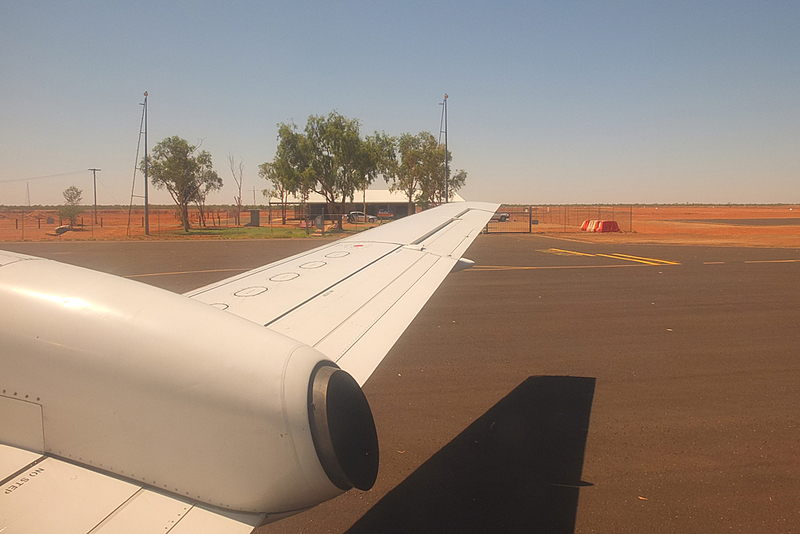 Boarding was called and since dad and I are the only two passengers on the first leg to Boulia, boarding was quickly done. 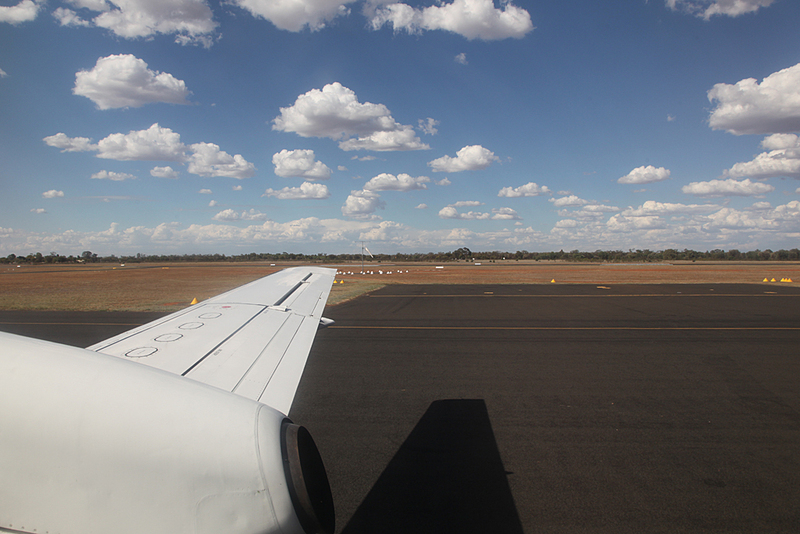 A lengthy walk across the tarmac and again no one has a go at me for taking a couple of photos. 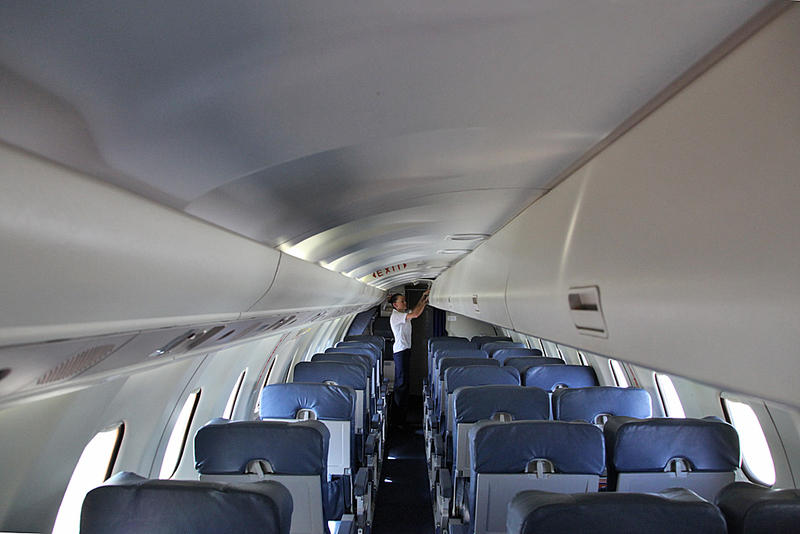 Aircraft was getting a bit warm inside until the air conditioning got going. 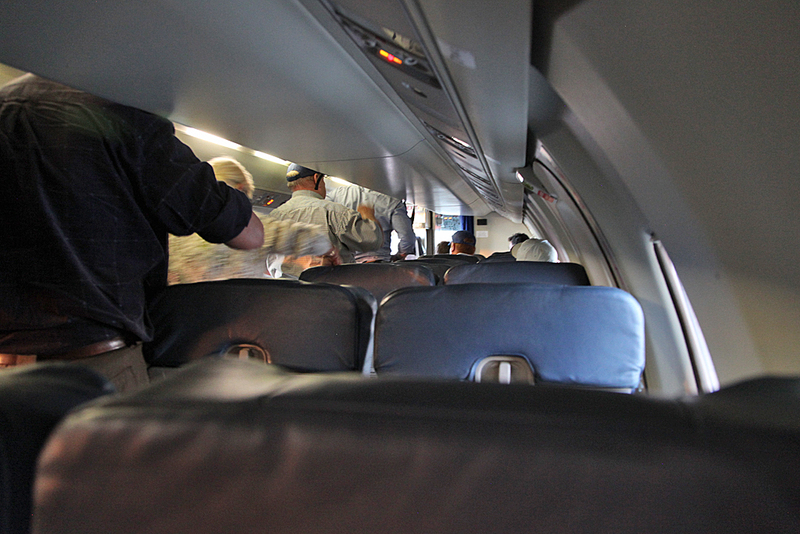 Water was handed out before take off. 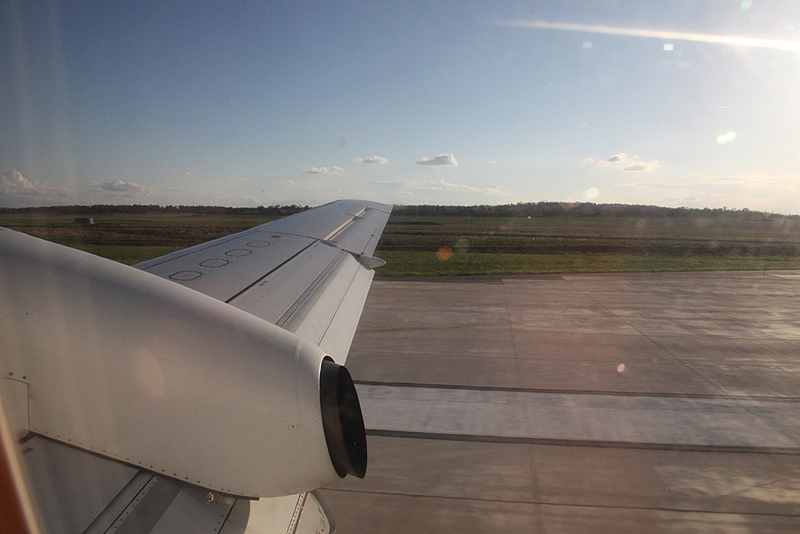 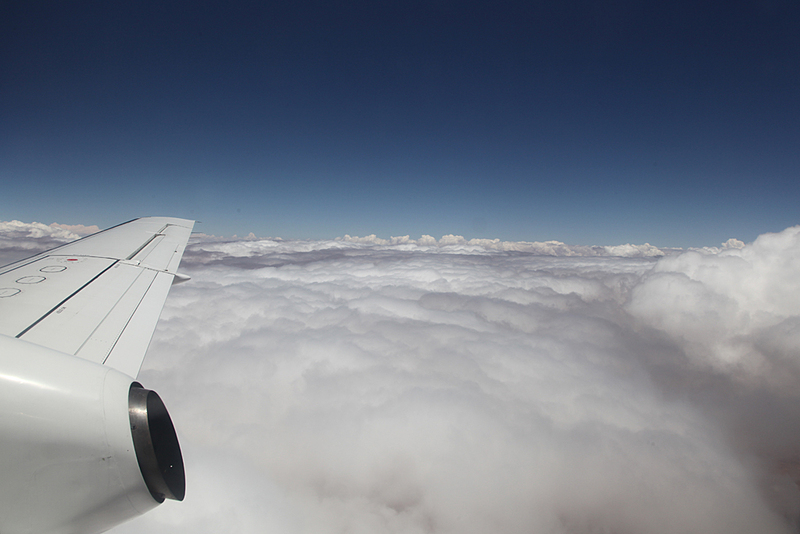 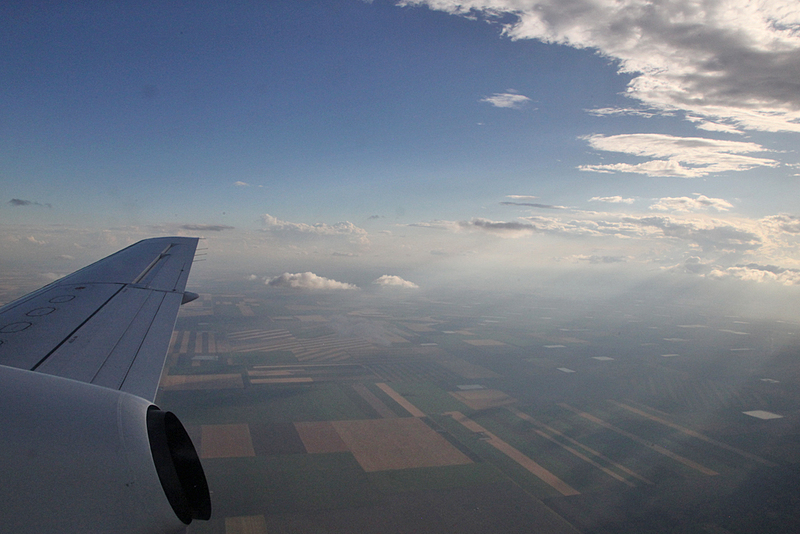 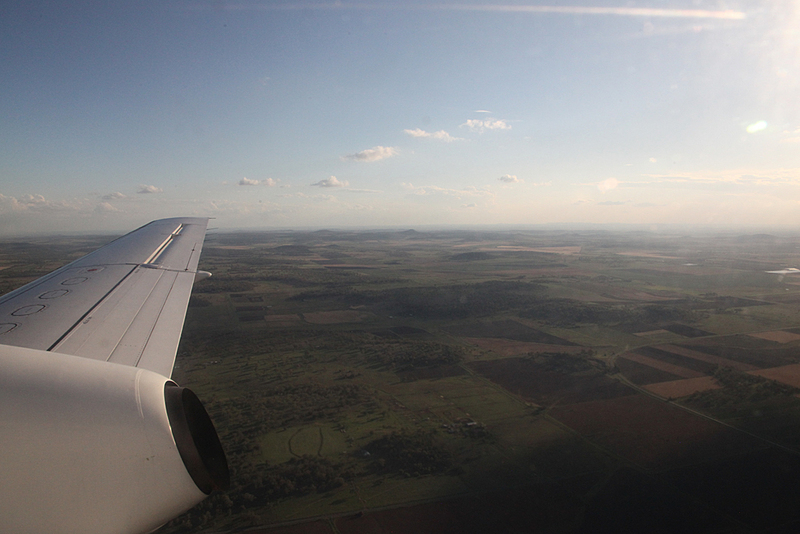 Took off to the south and fairly smooth take off and climb. 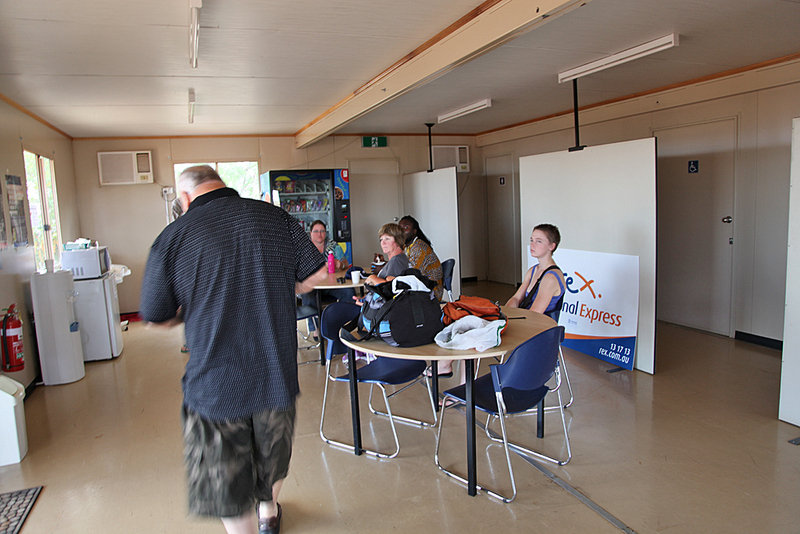 Snacks were offered. 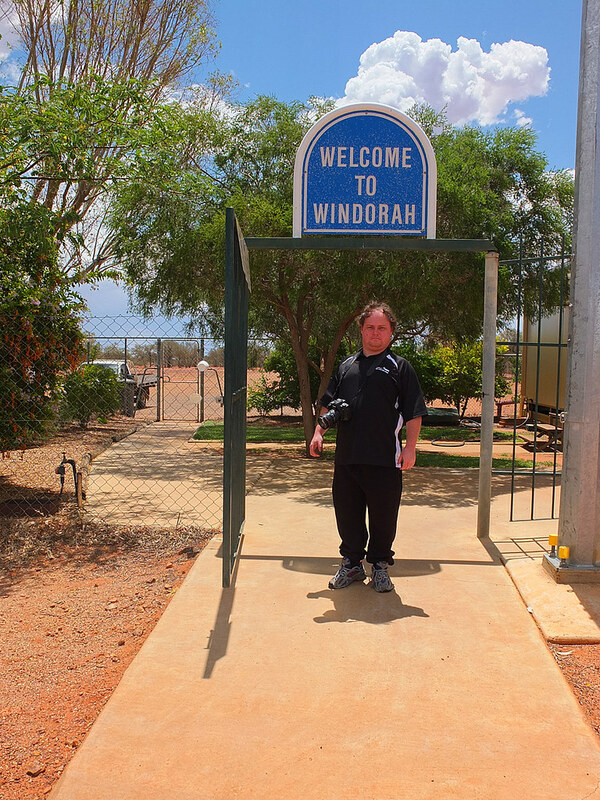 Had the savoury snack. 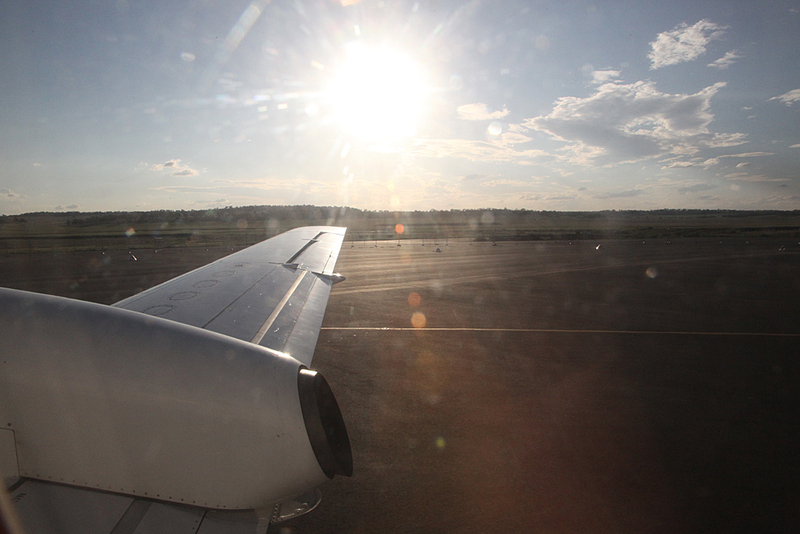 Flight time about 35 minutes. 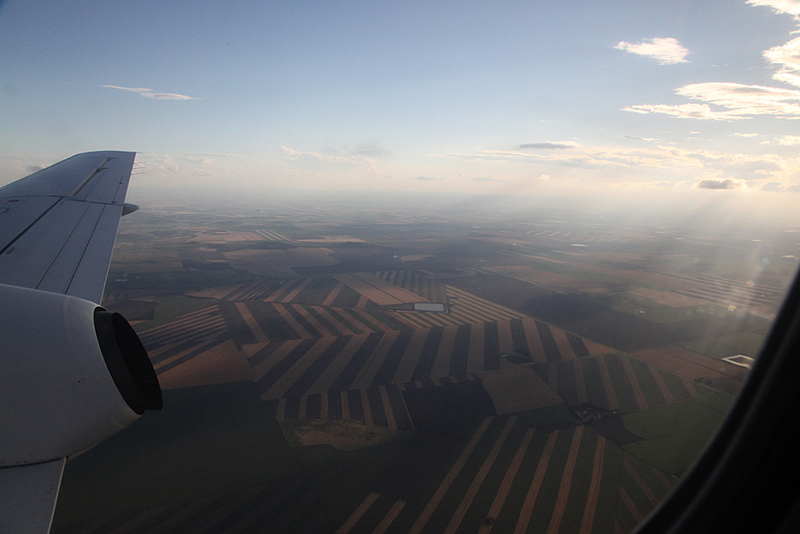 Again on this sector only dad and I plus the crew. 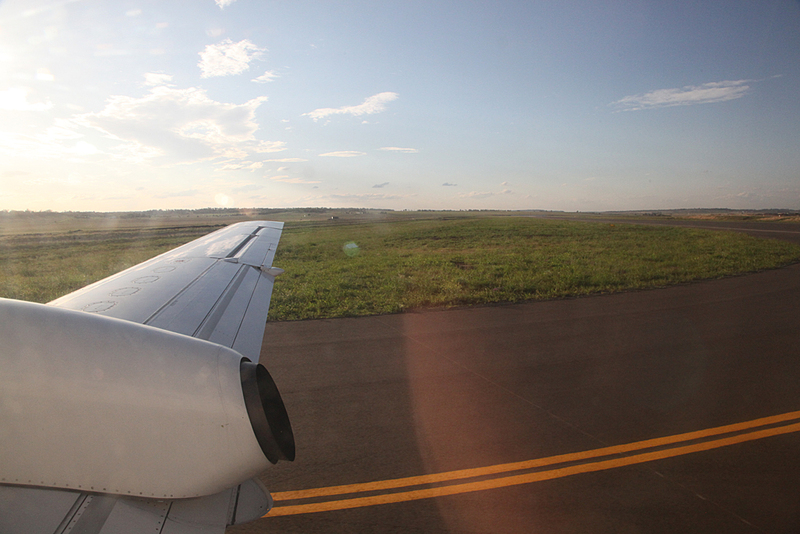 Like last night landing was a bit rough. 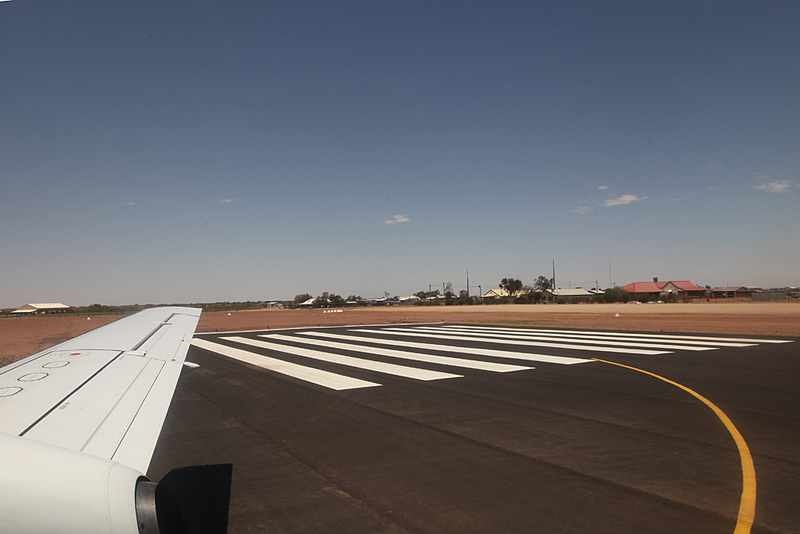 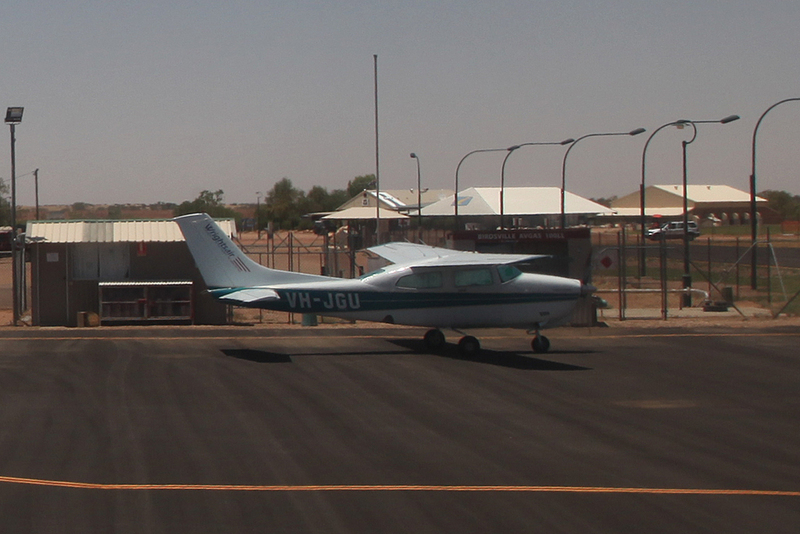 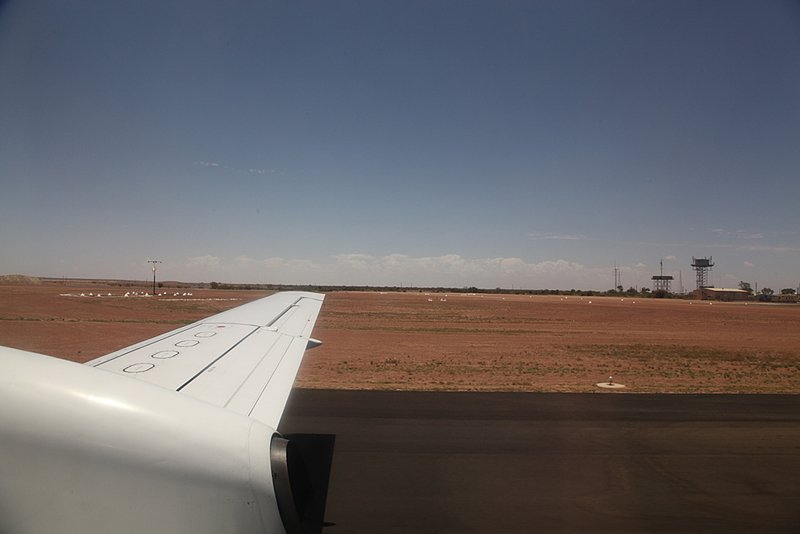 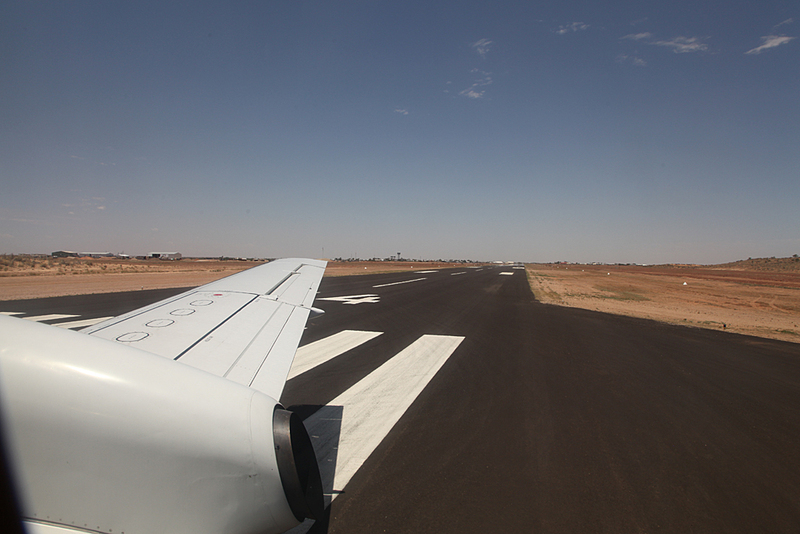 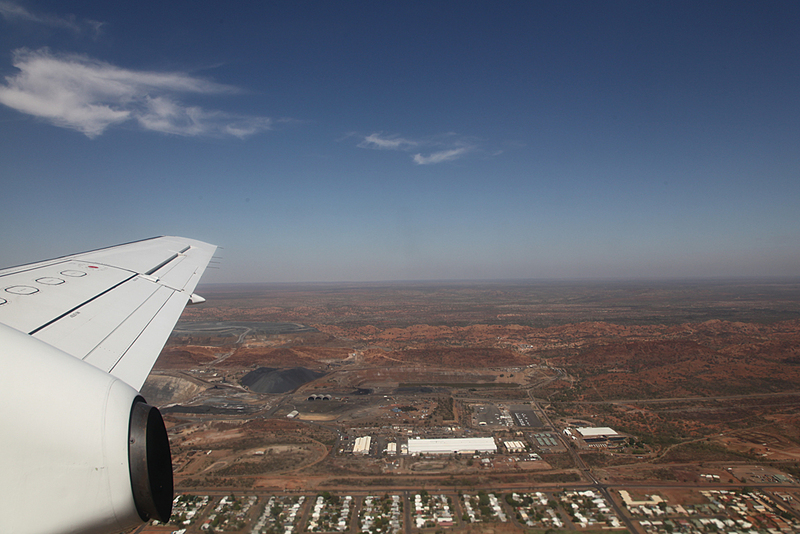 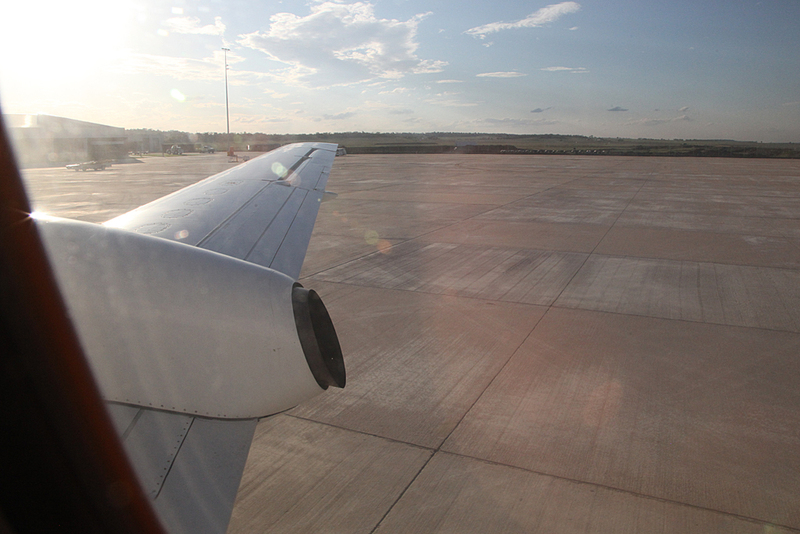 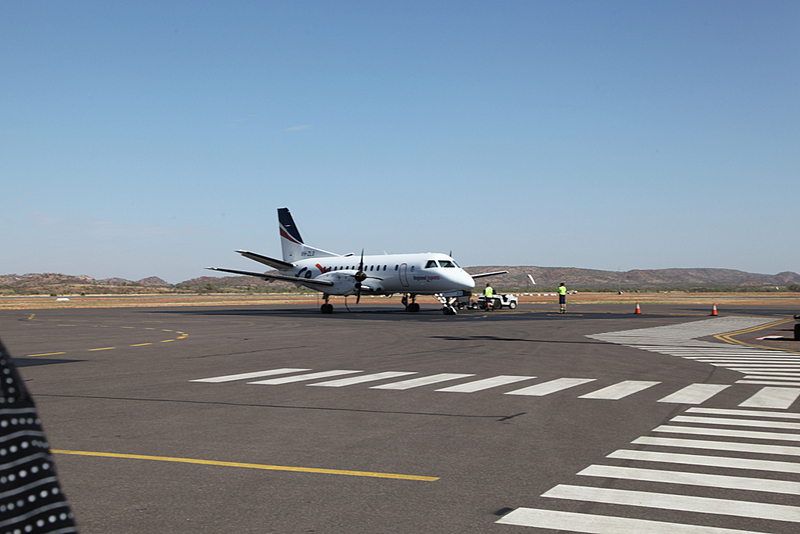 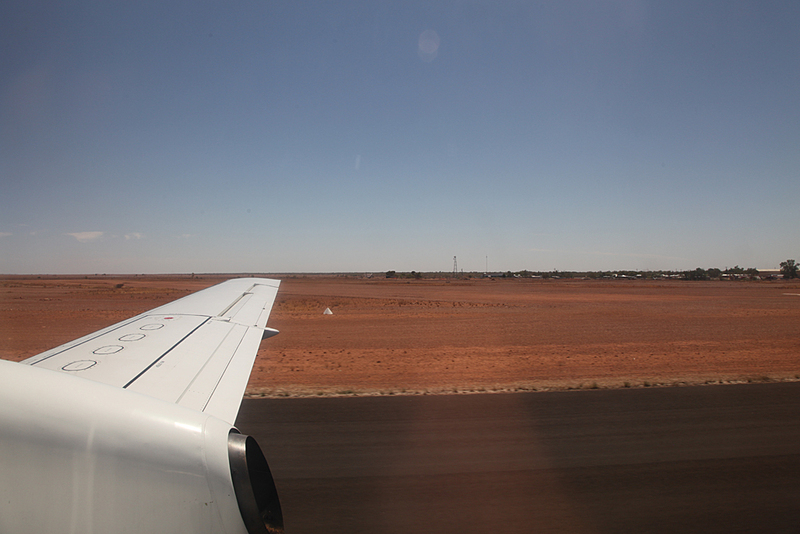 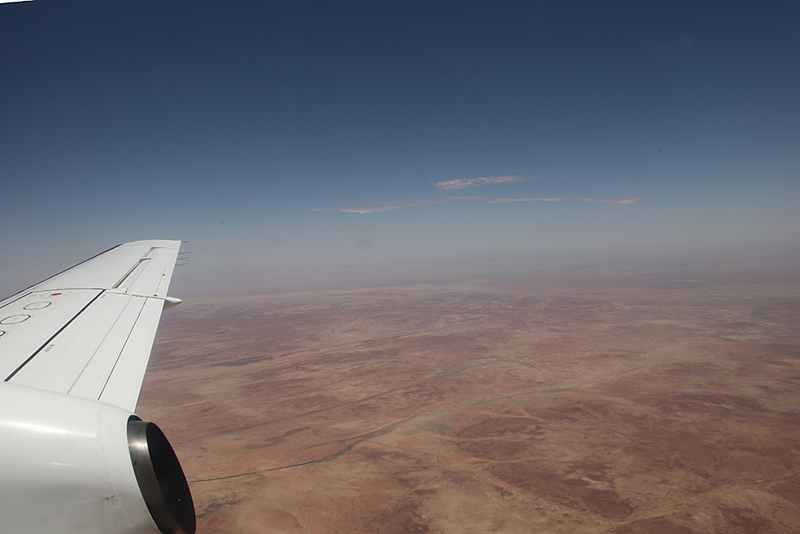 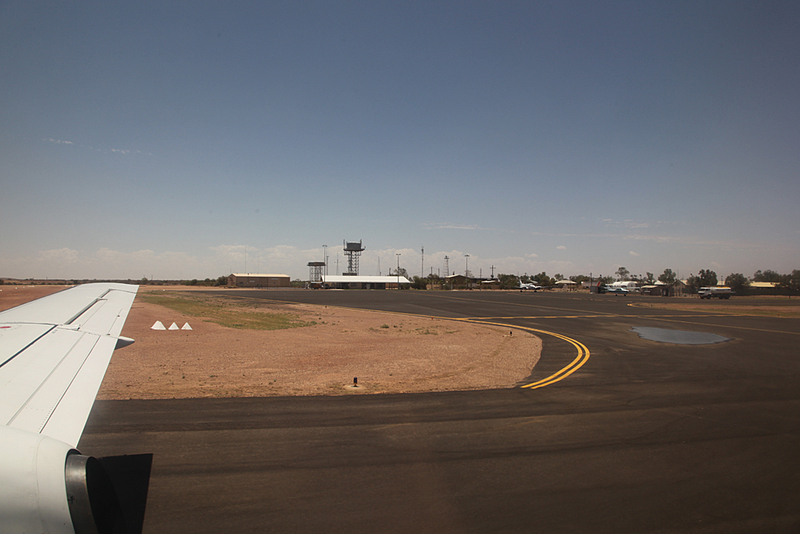 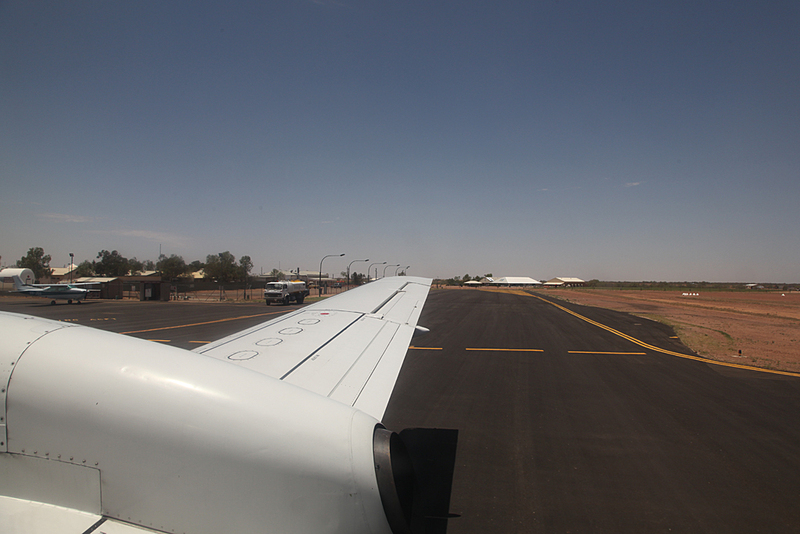 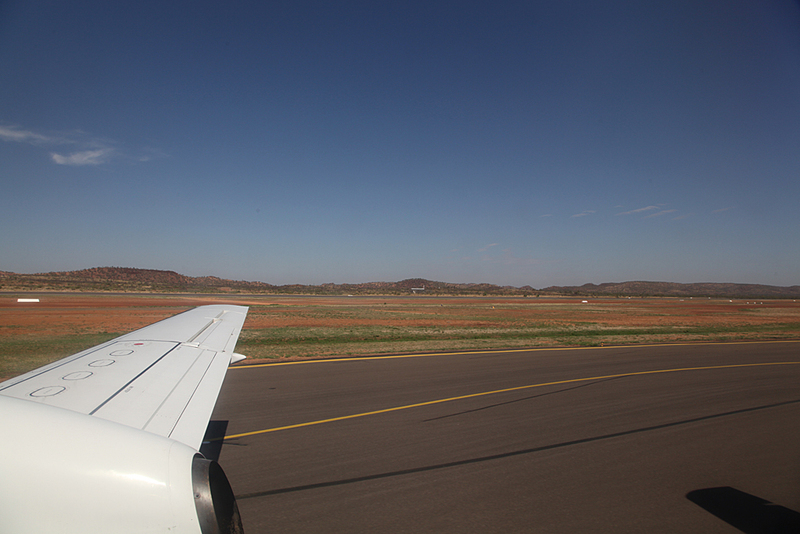 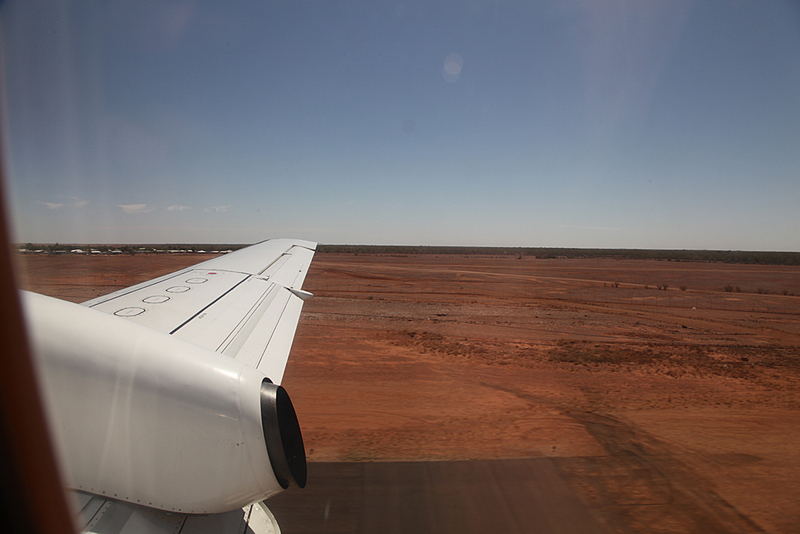 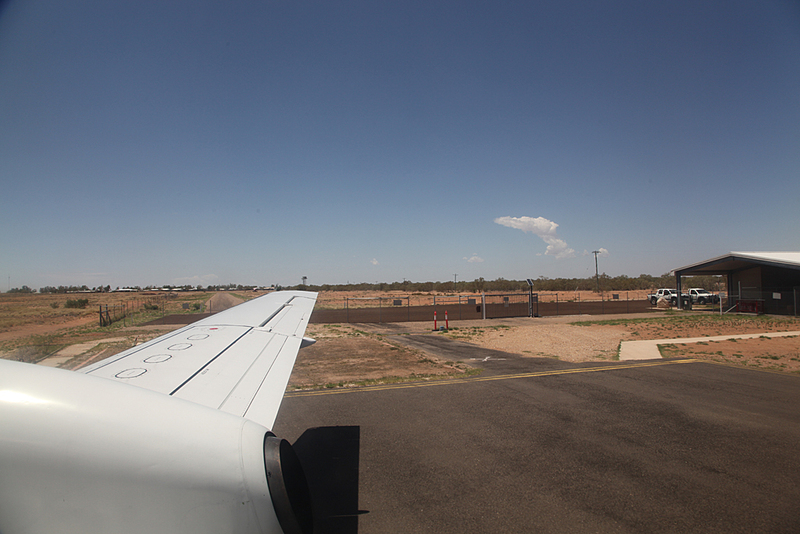 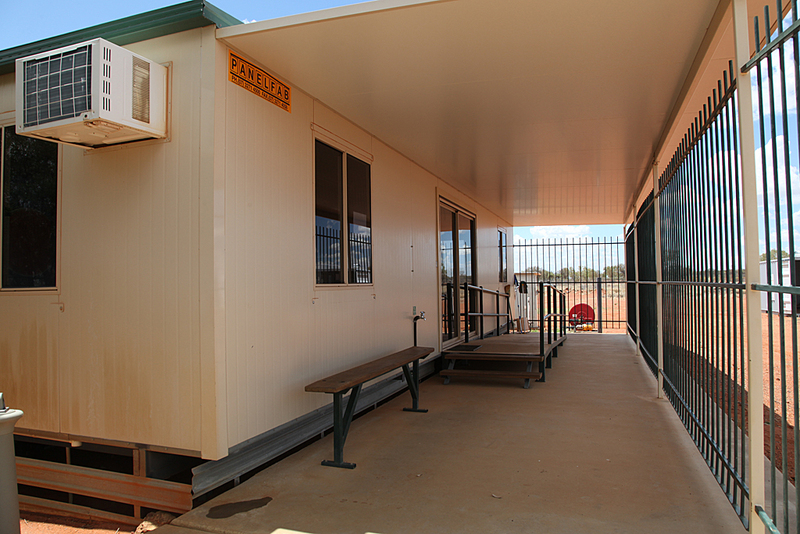 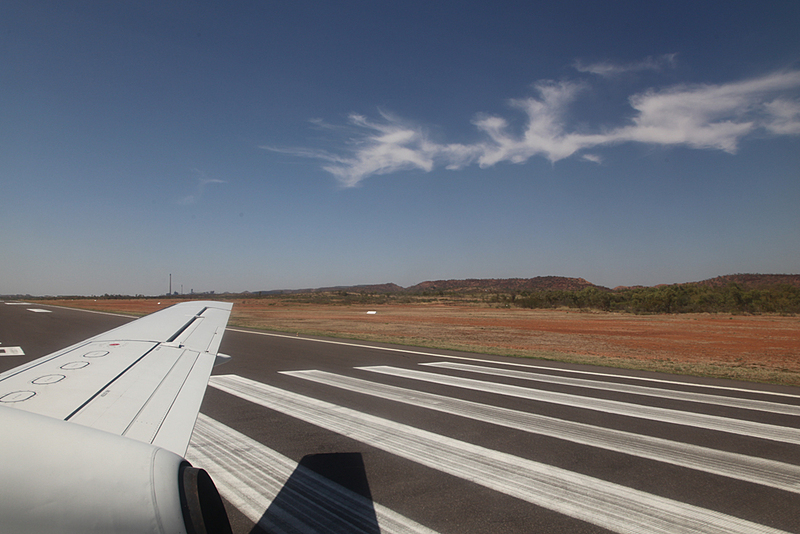 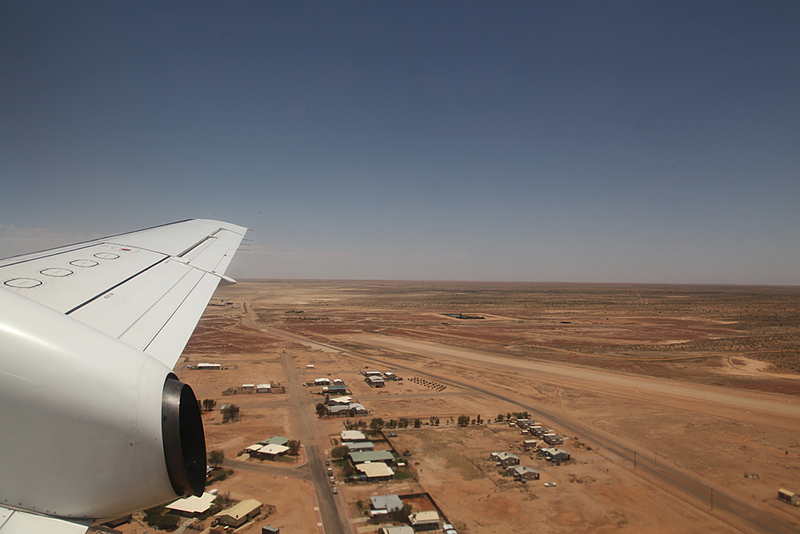 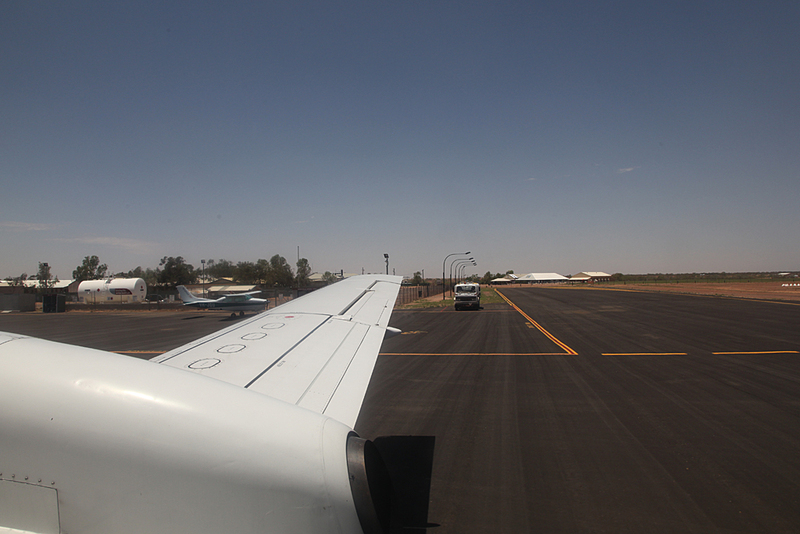 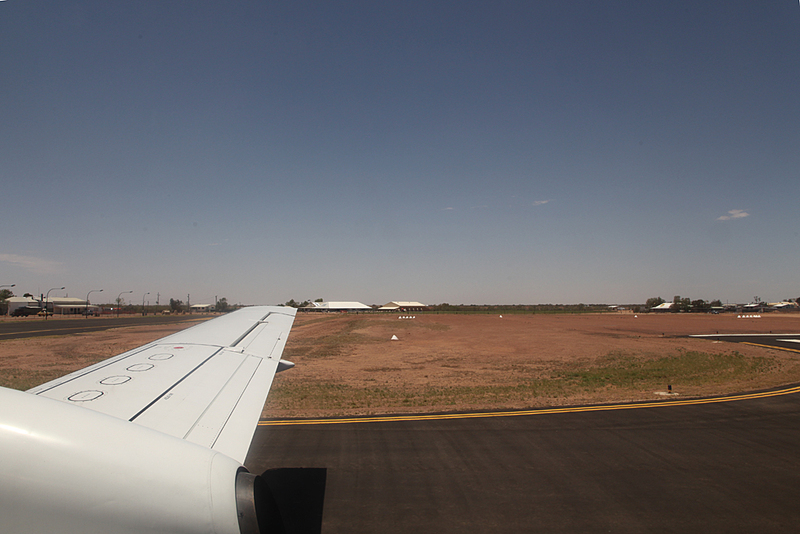 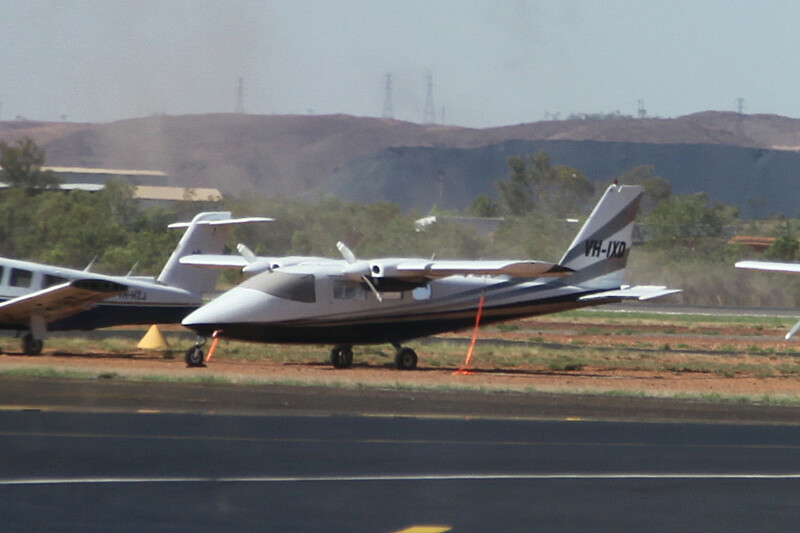 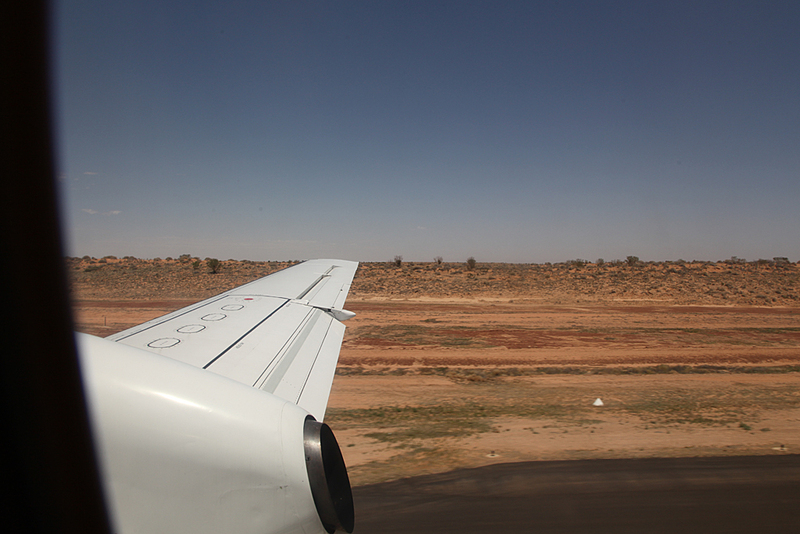 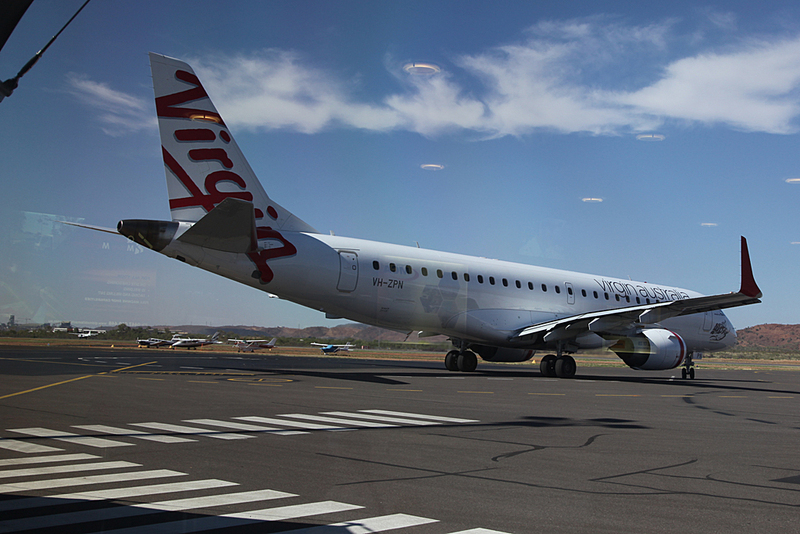 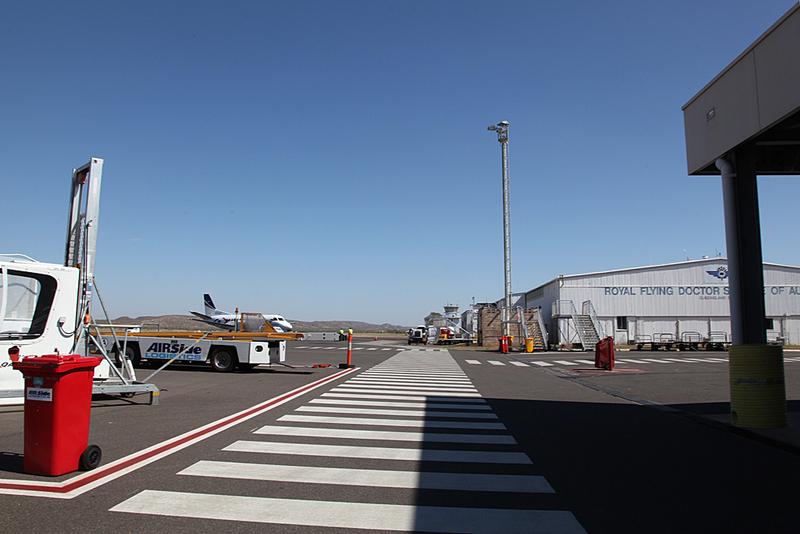 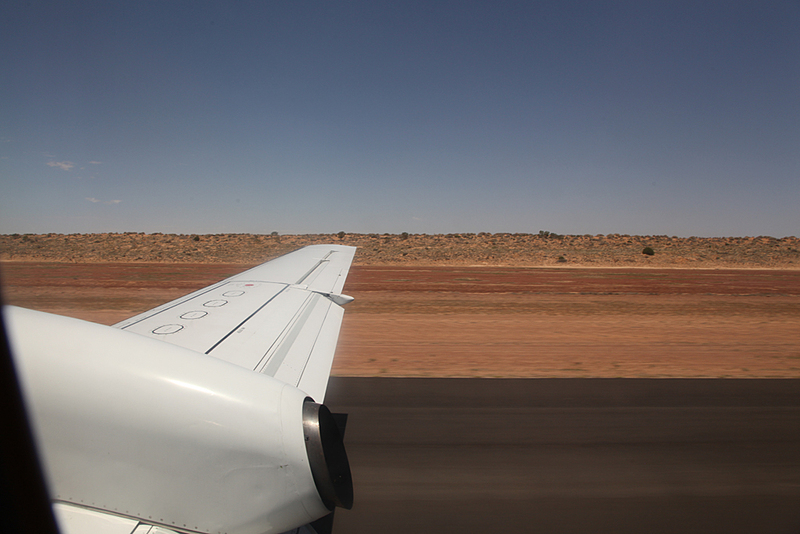 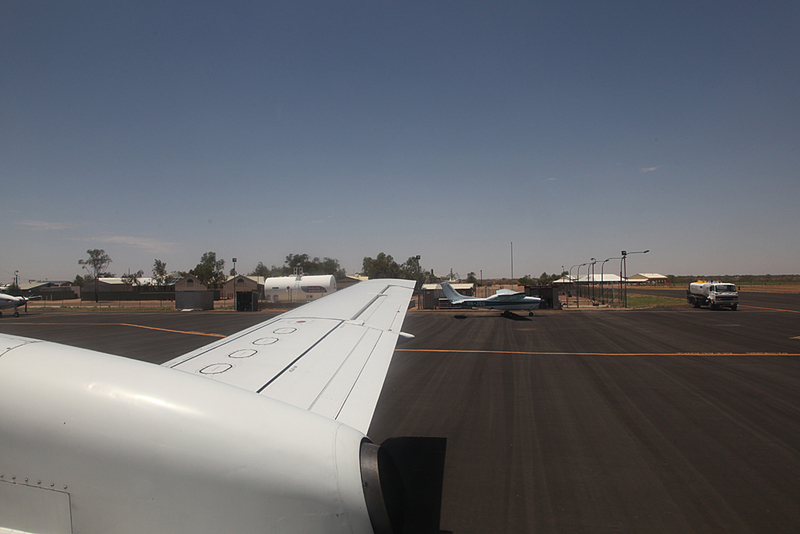 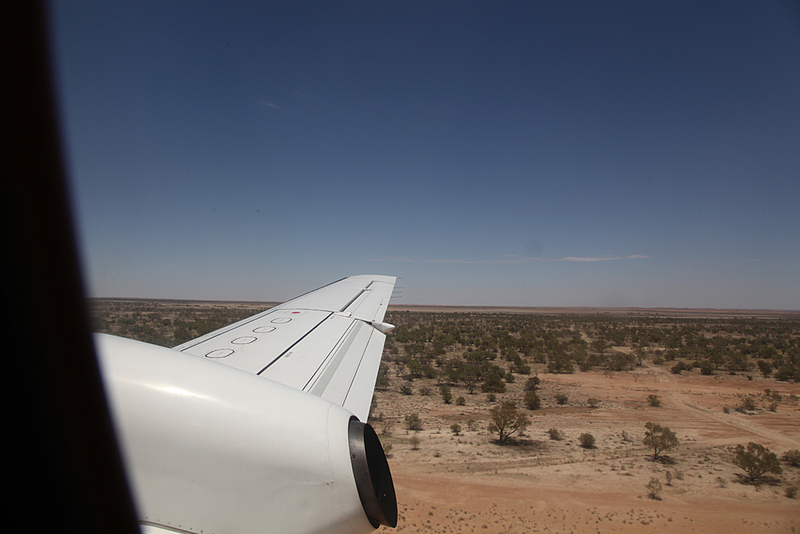 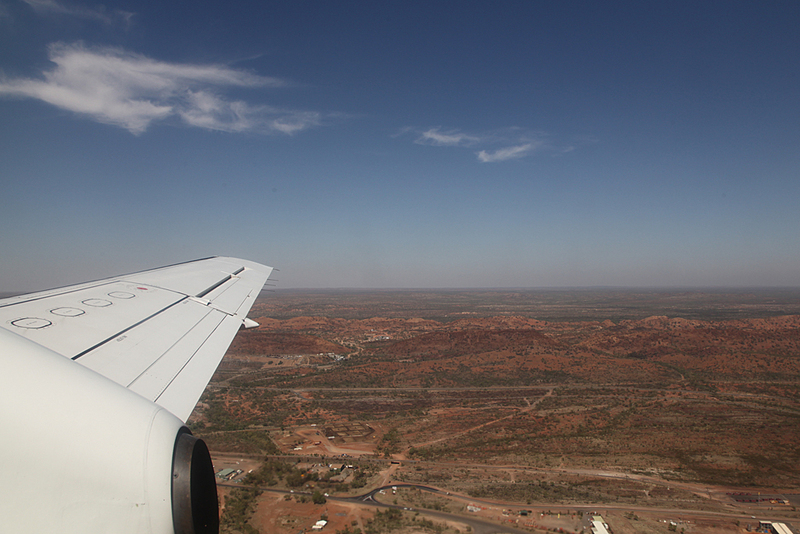 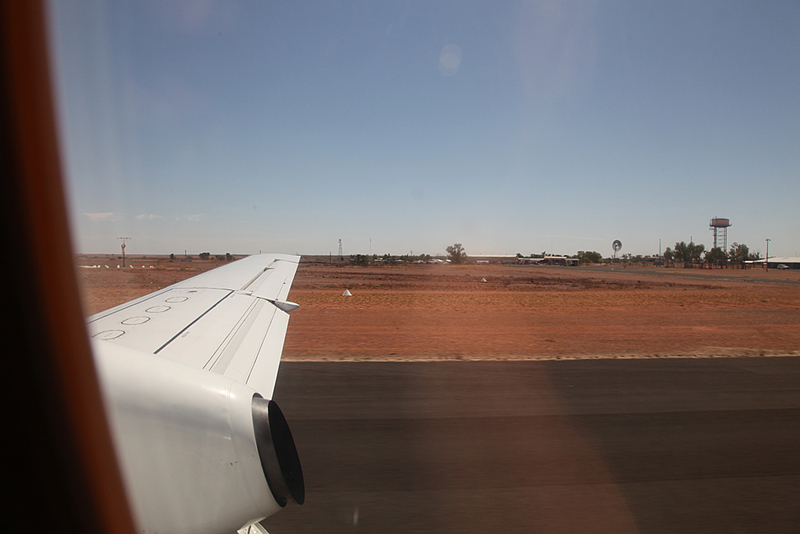 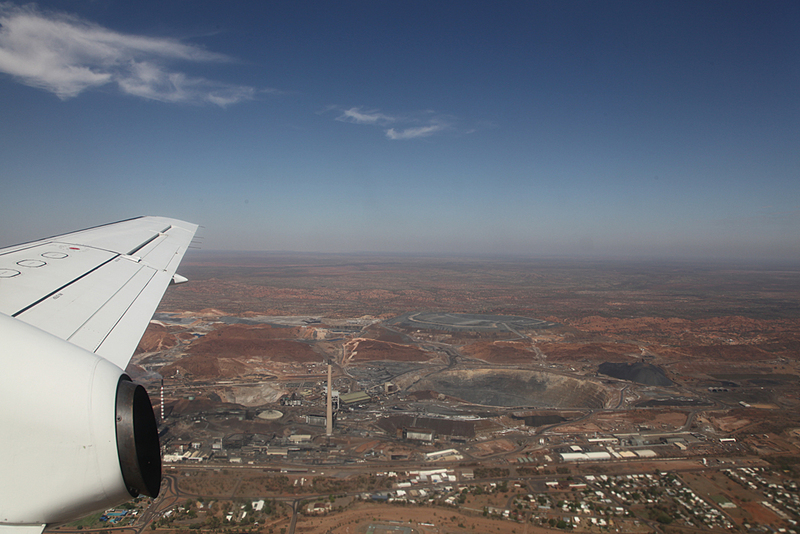 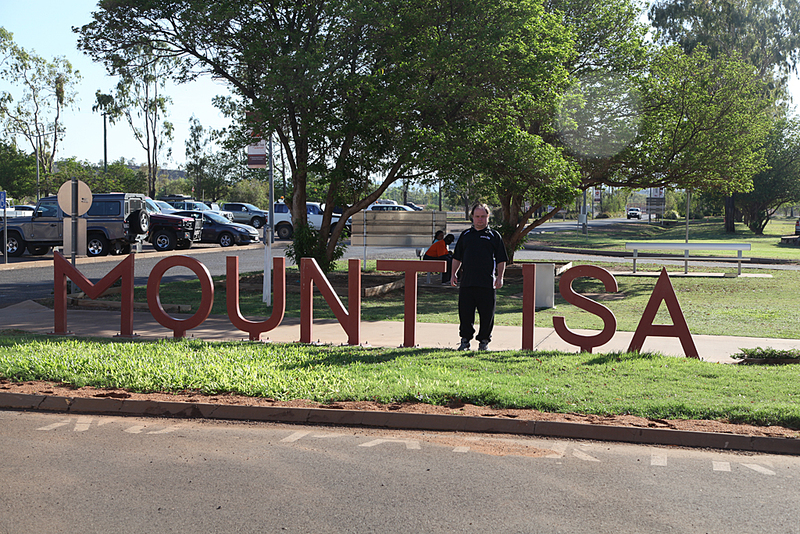 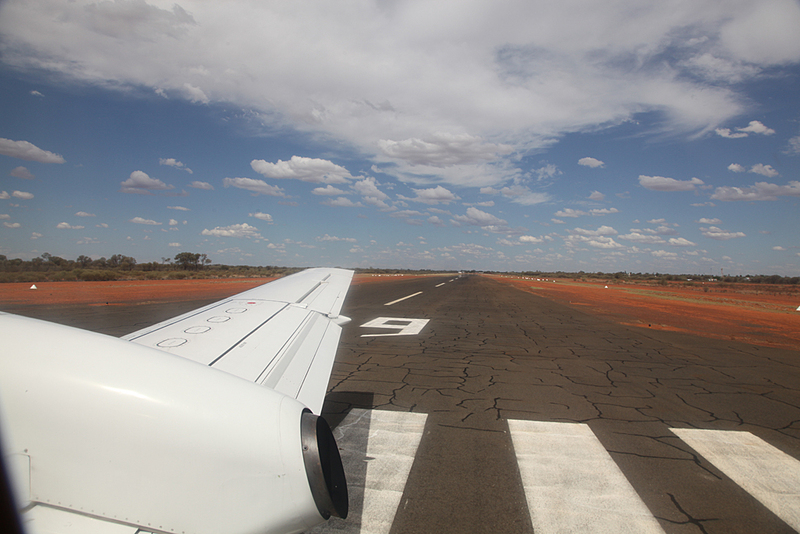 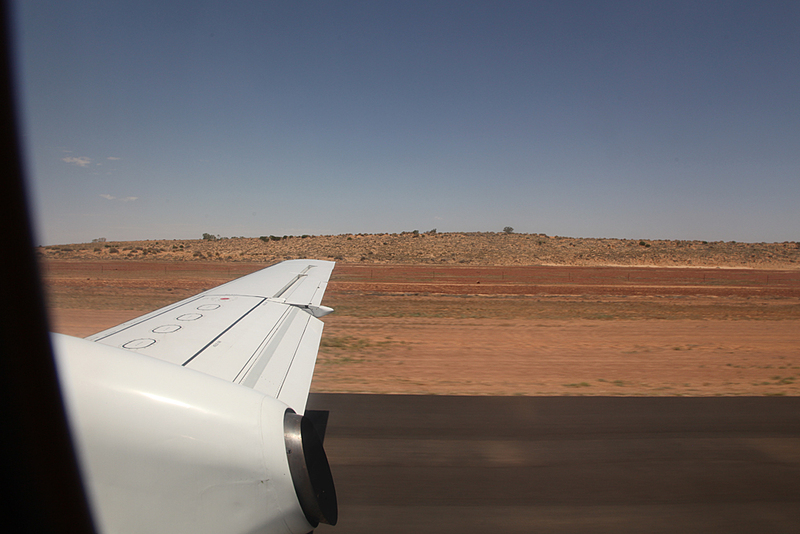 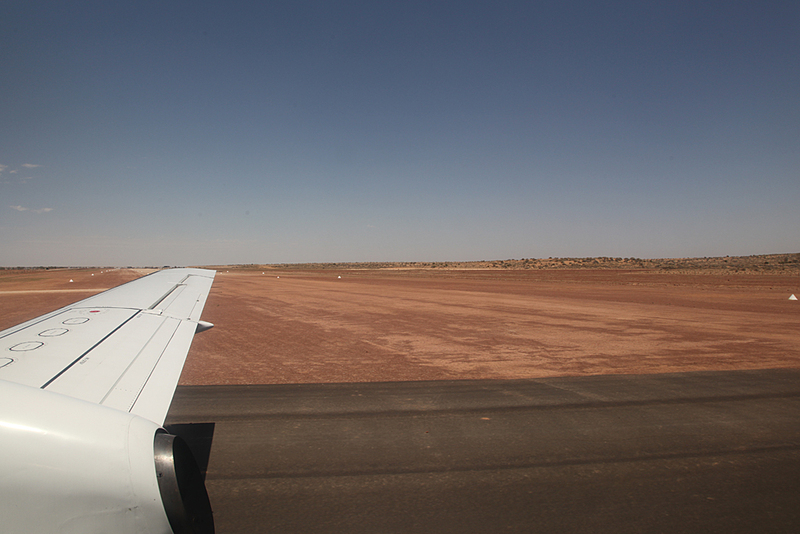 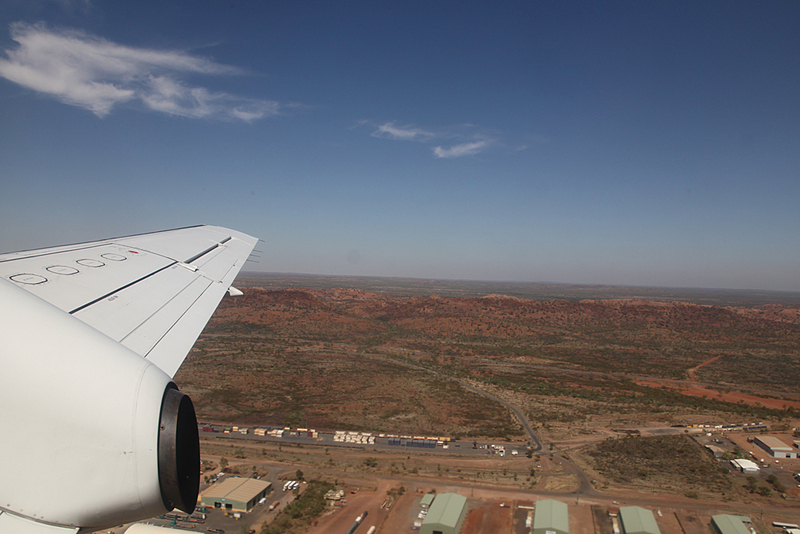 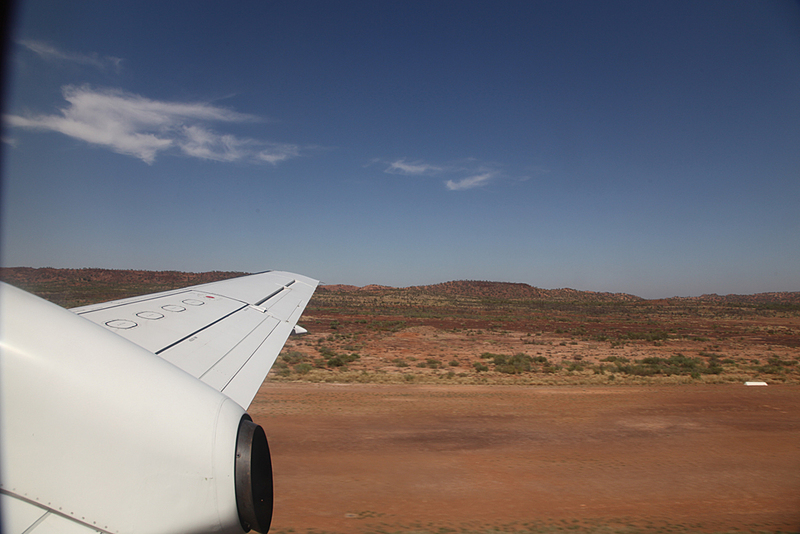 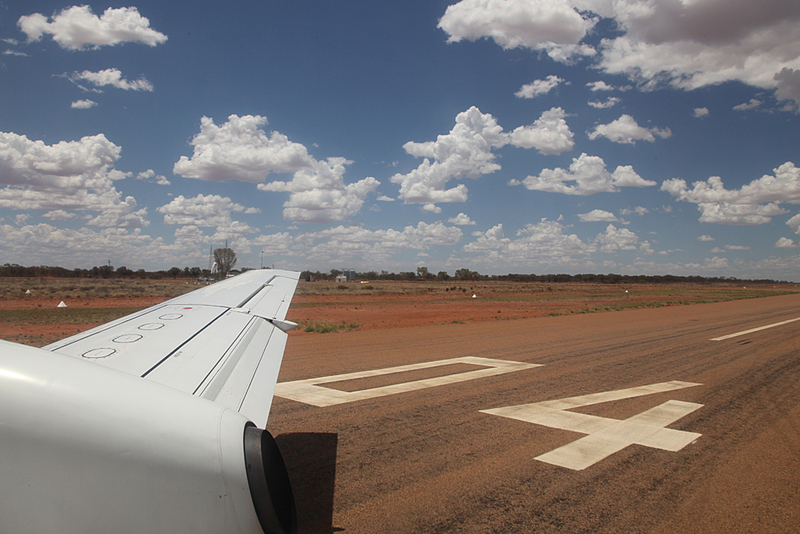 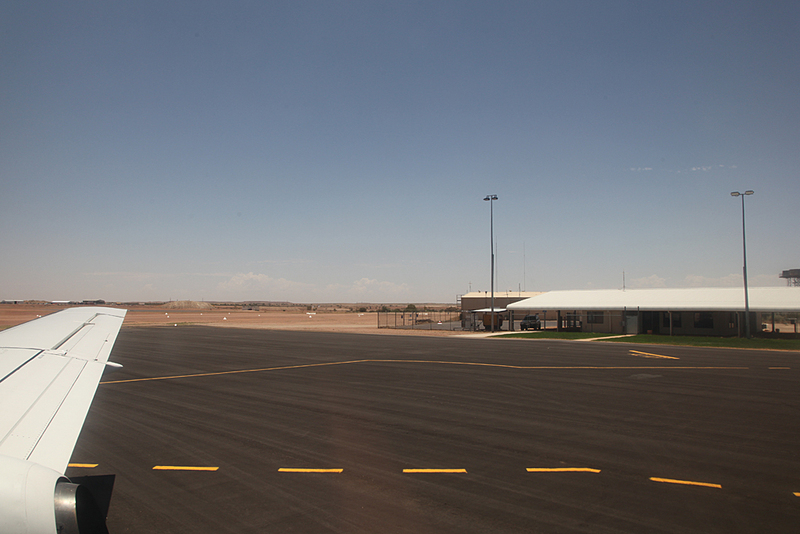 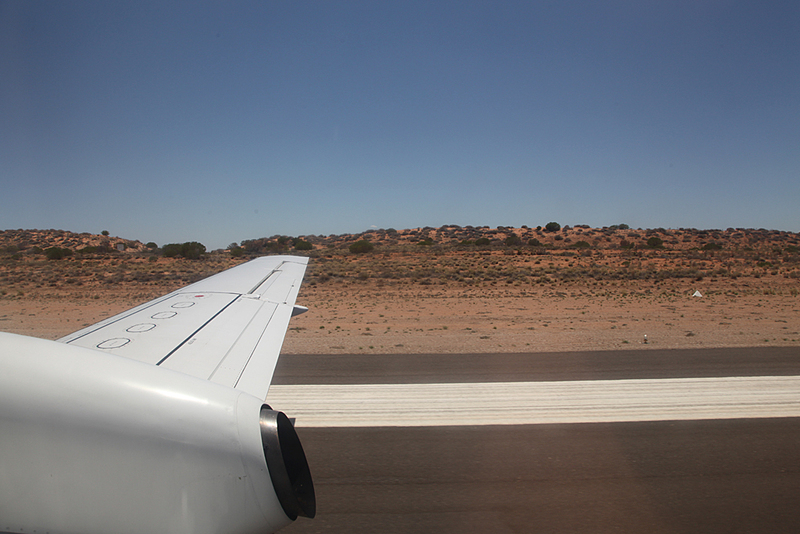 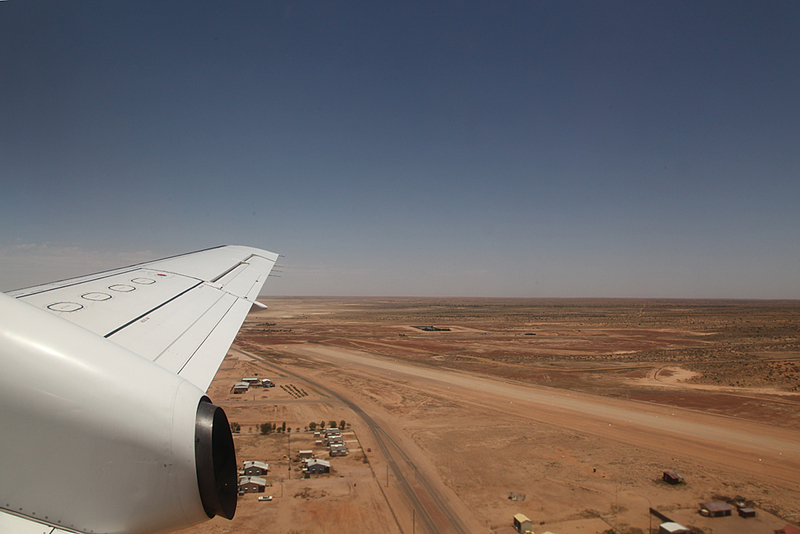 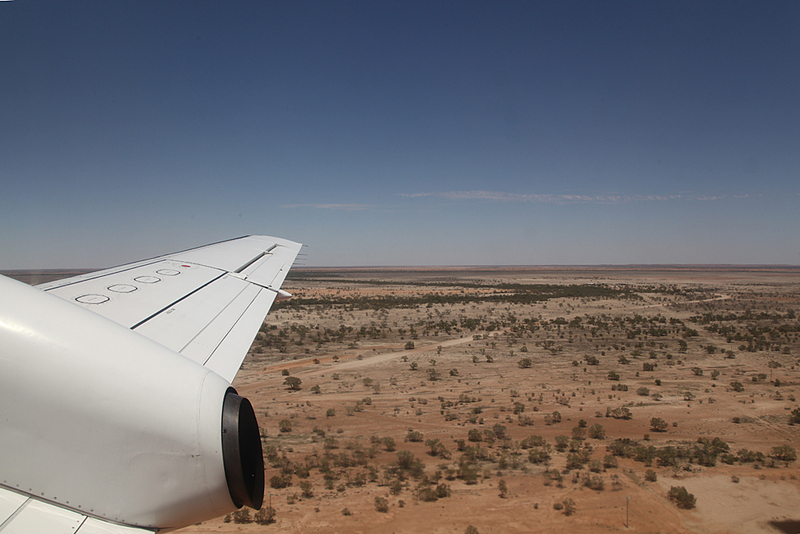 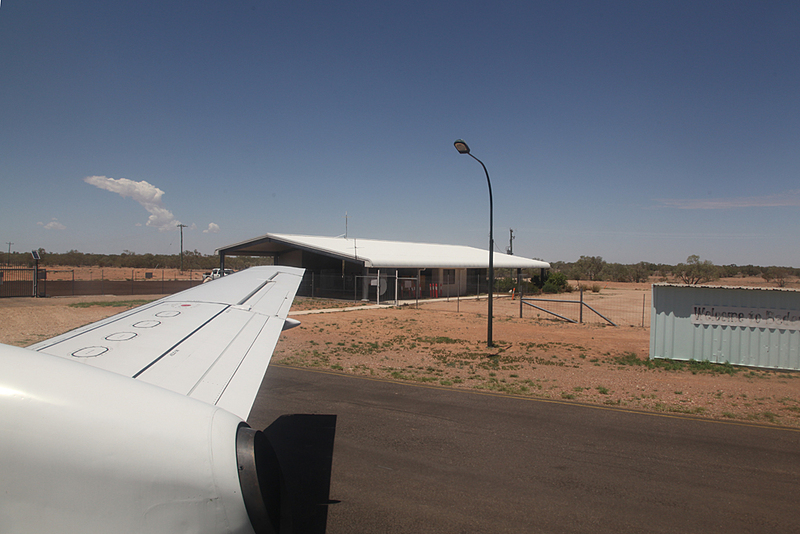 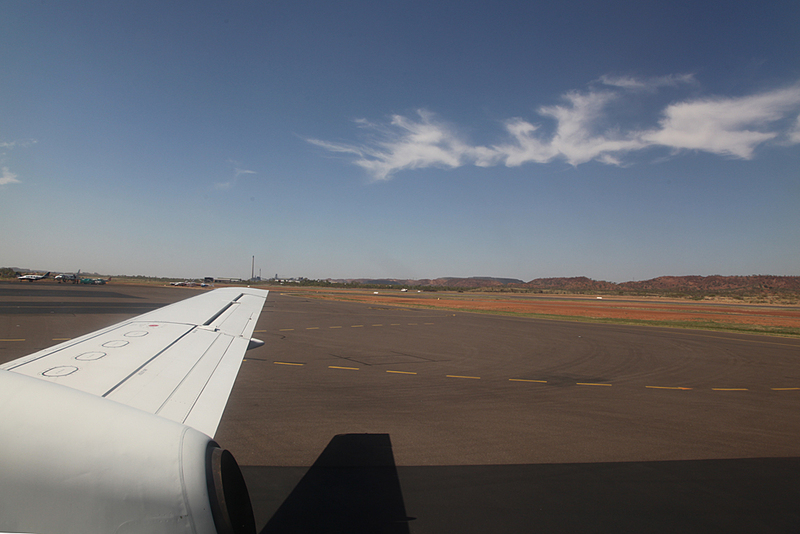 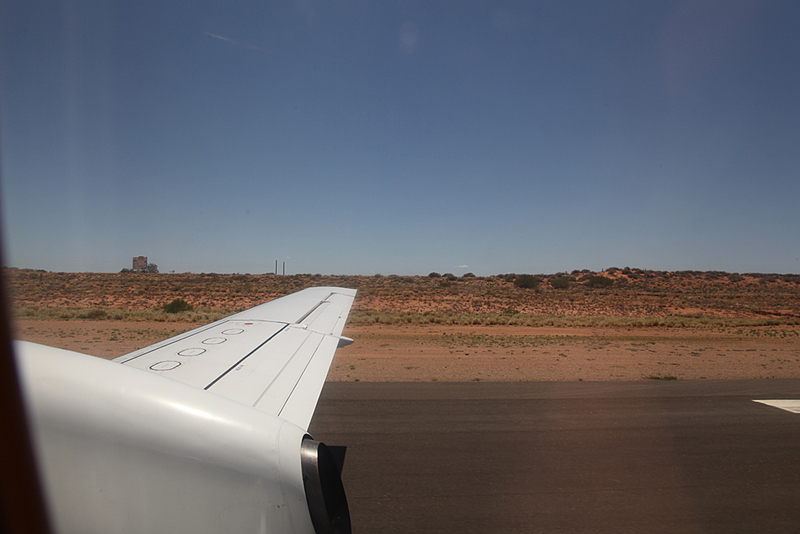 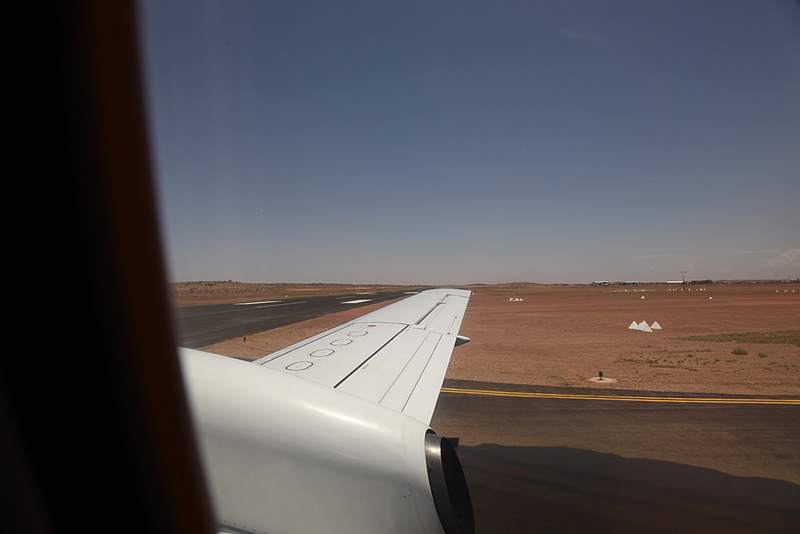 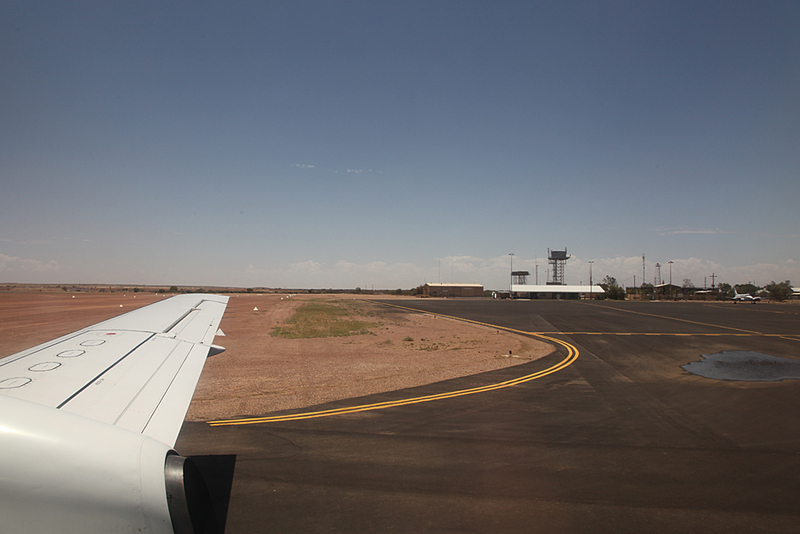 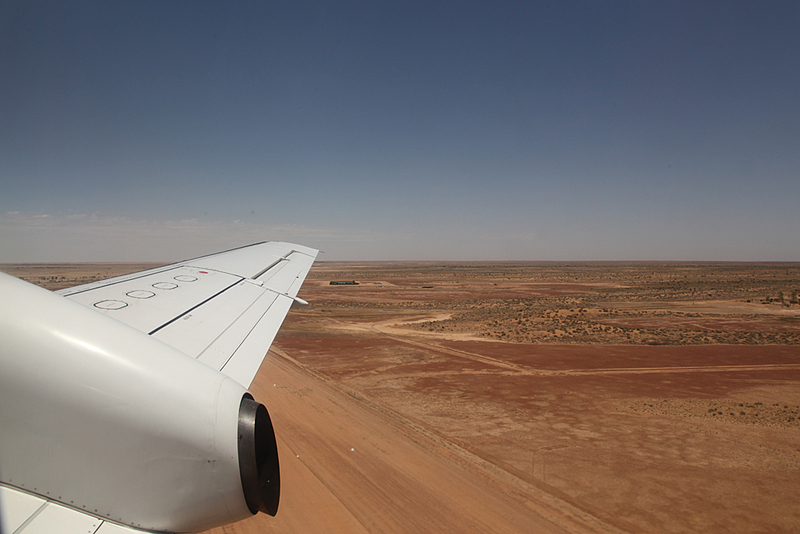 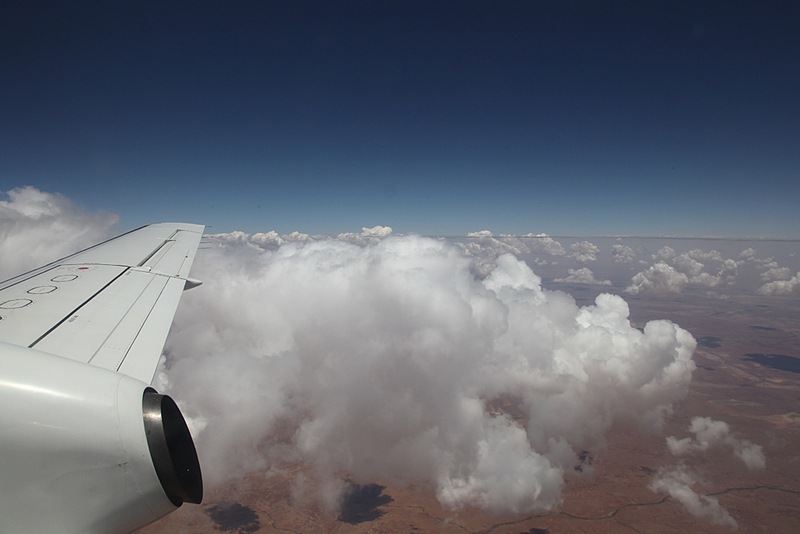 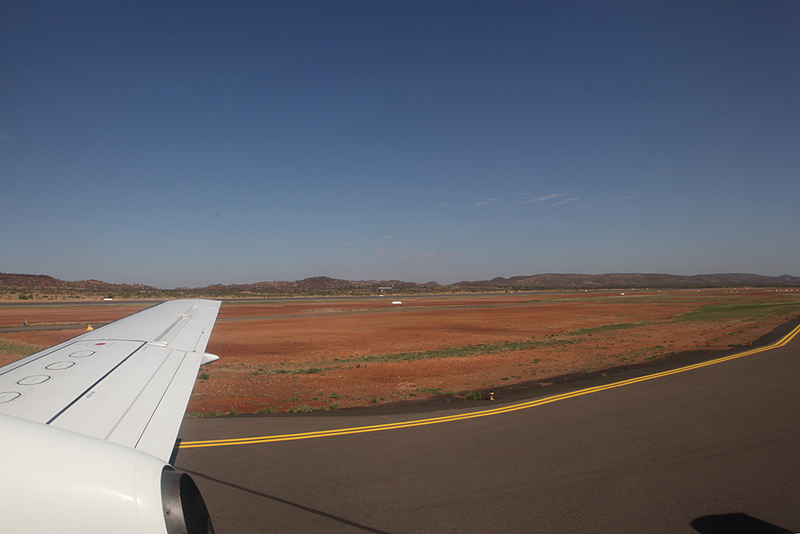 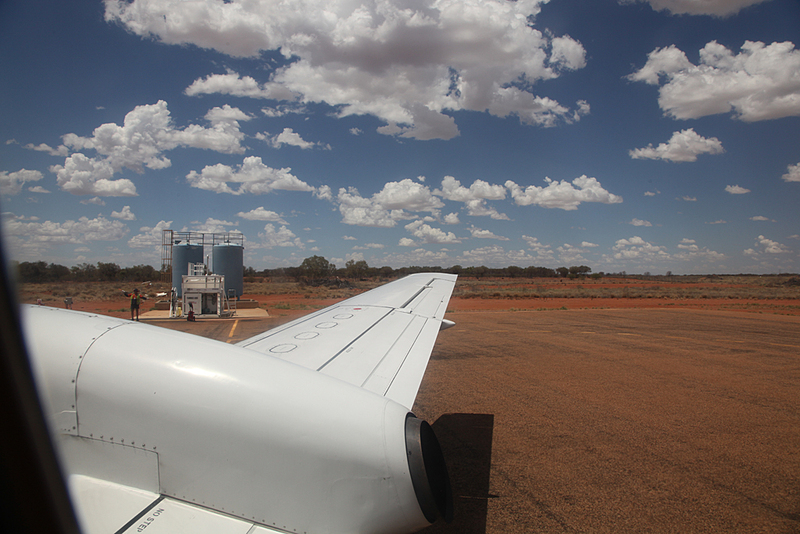 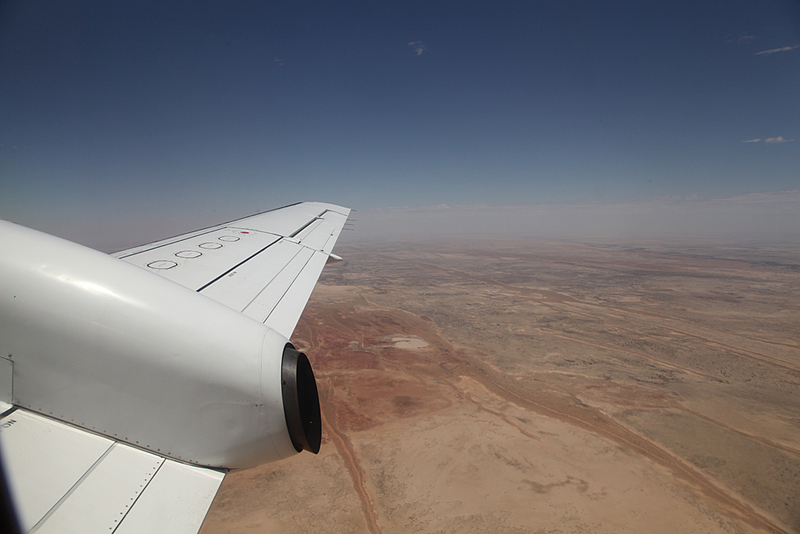 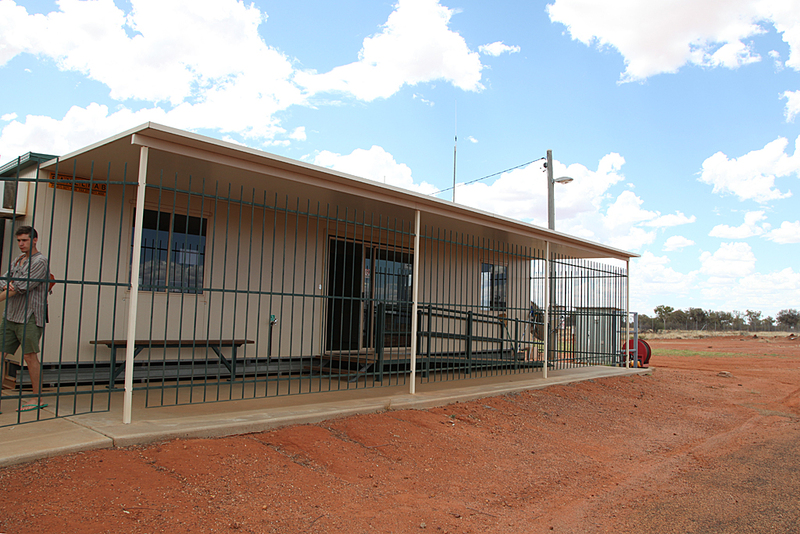 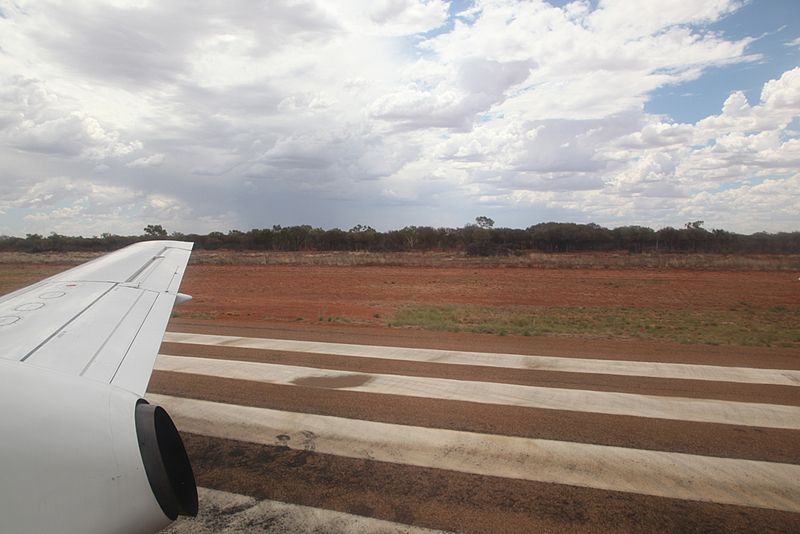 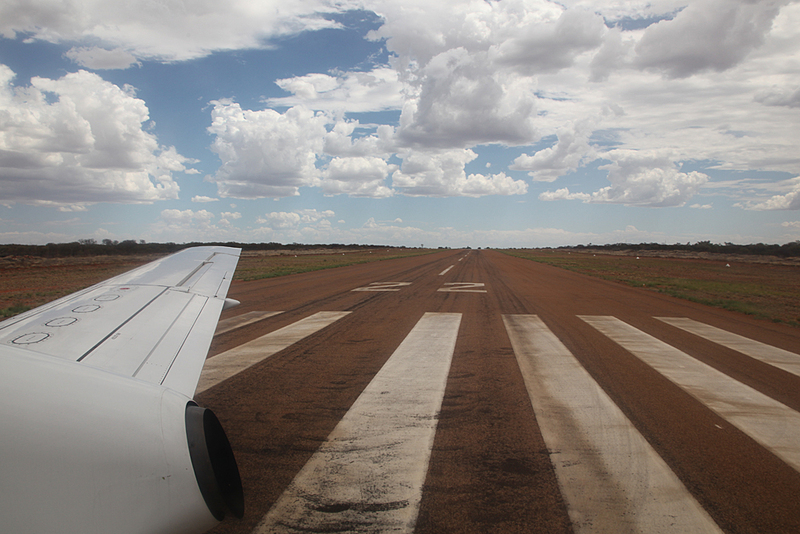 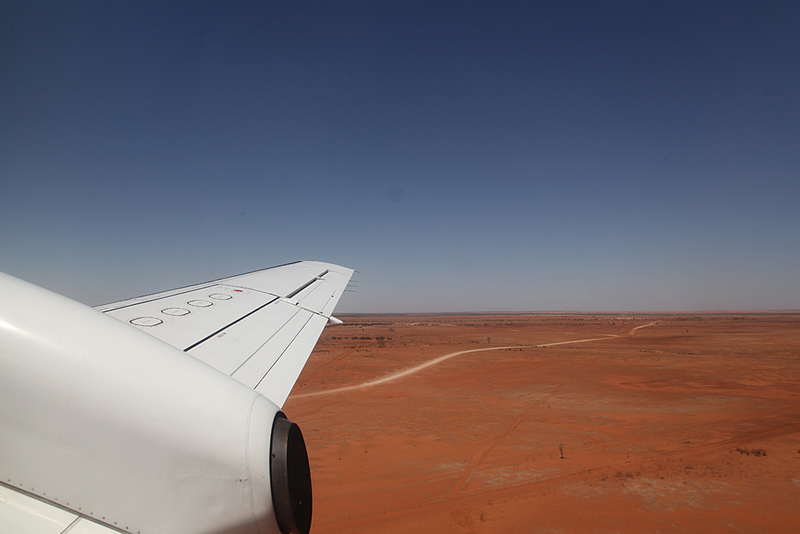 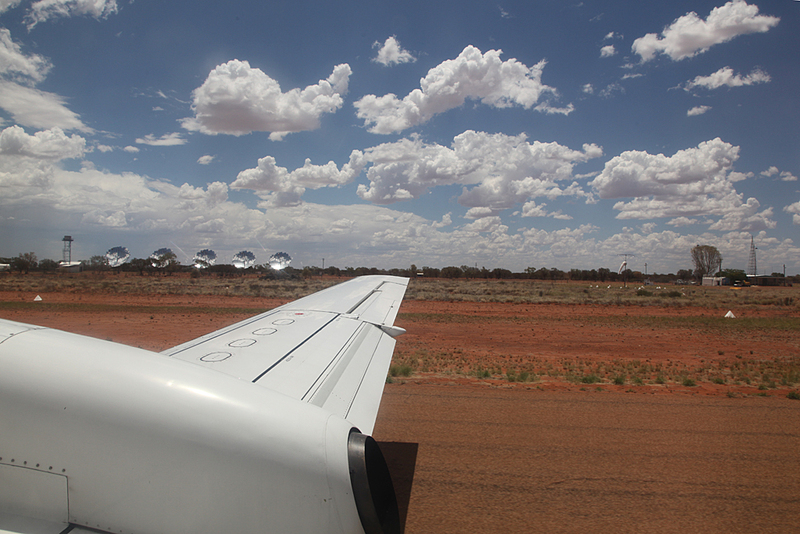 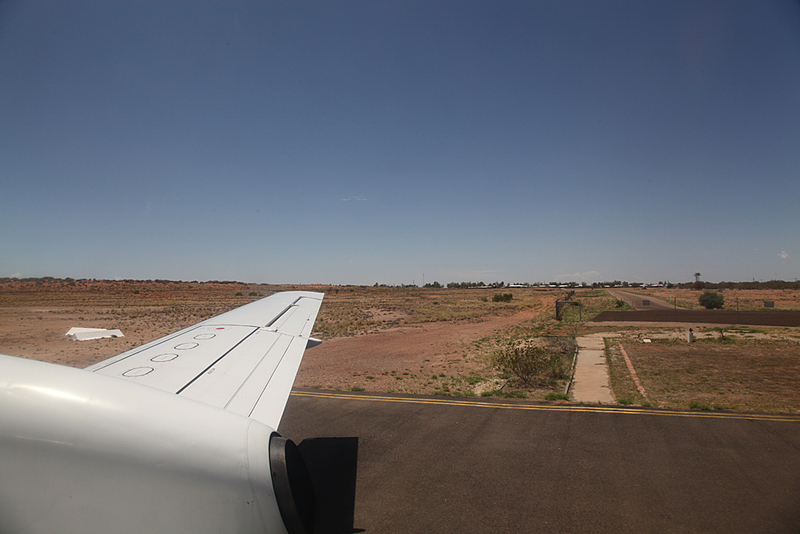 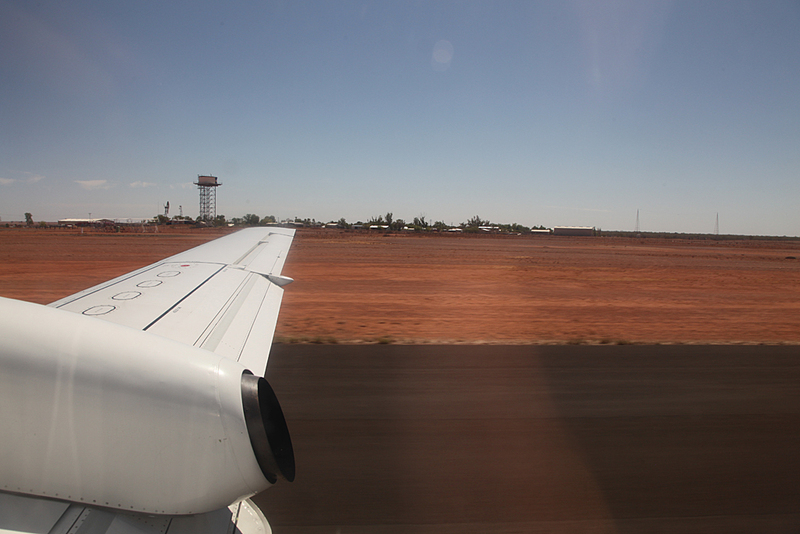 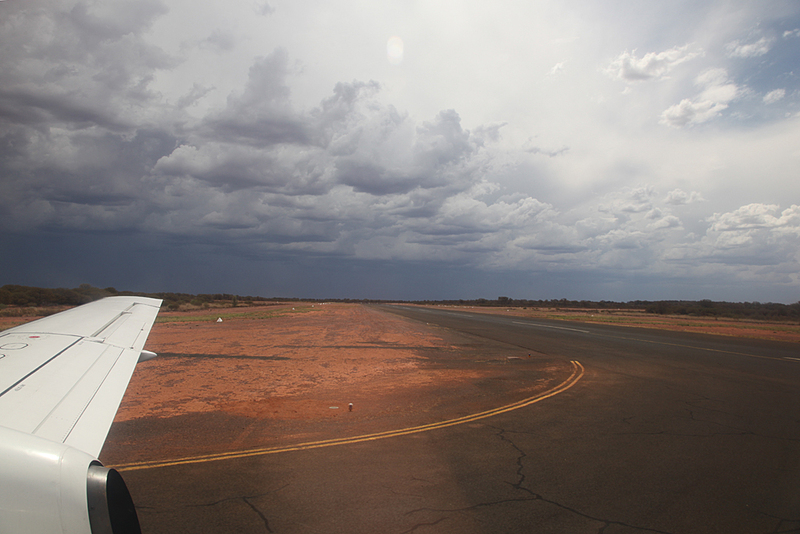 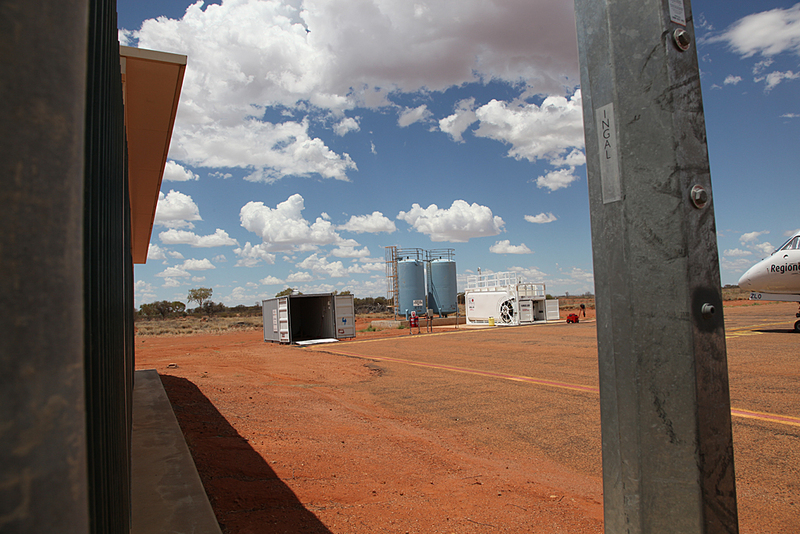 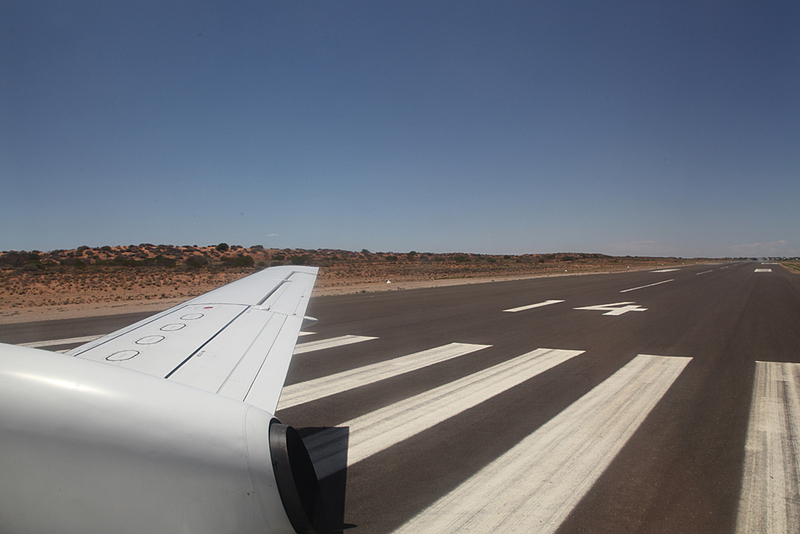 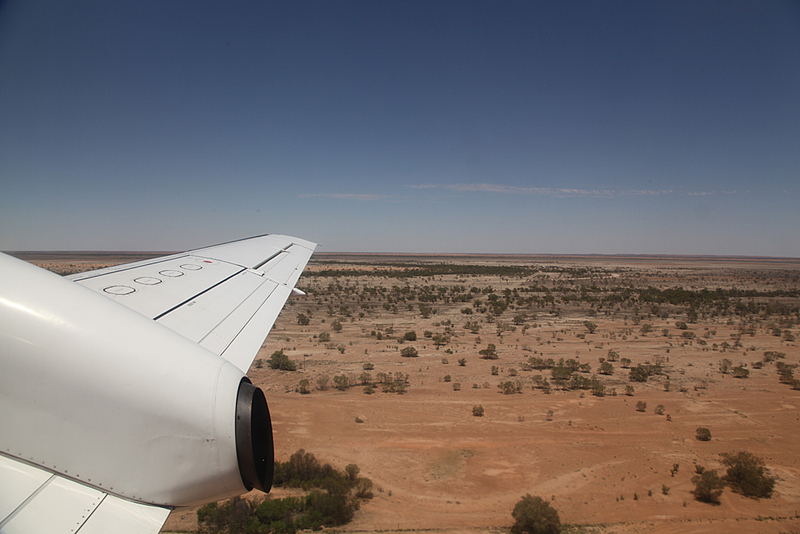 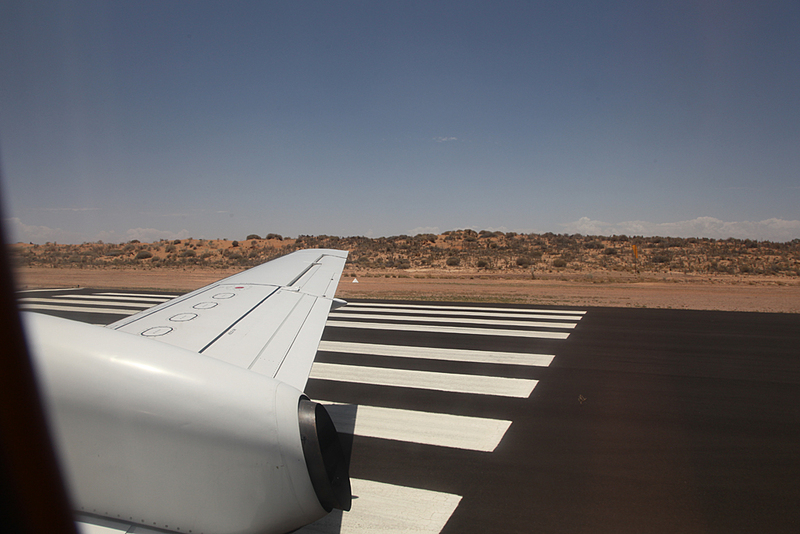 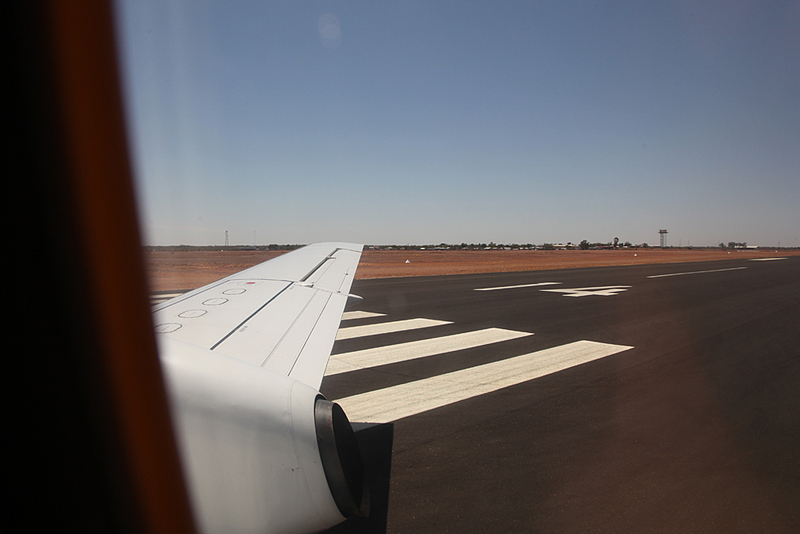 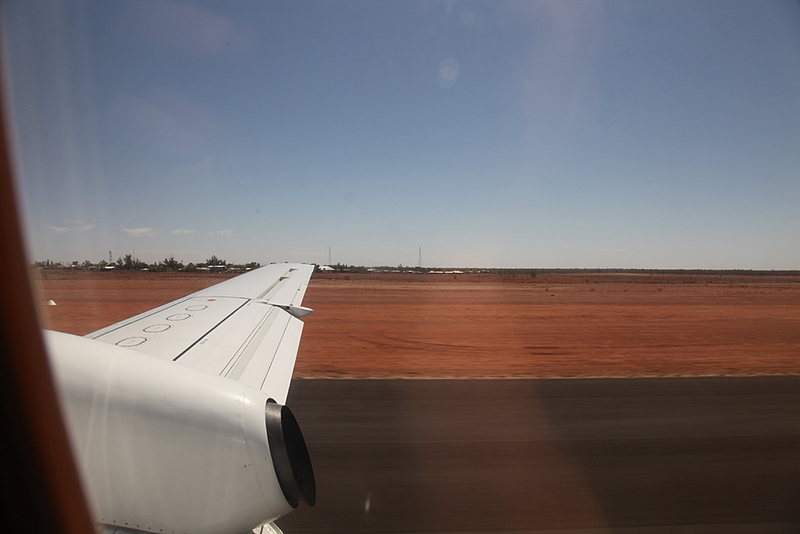 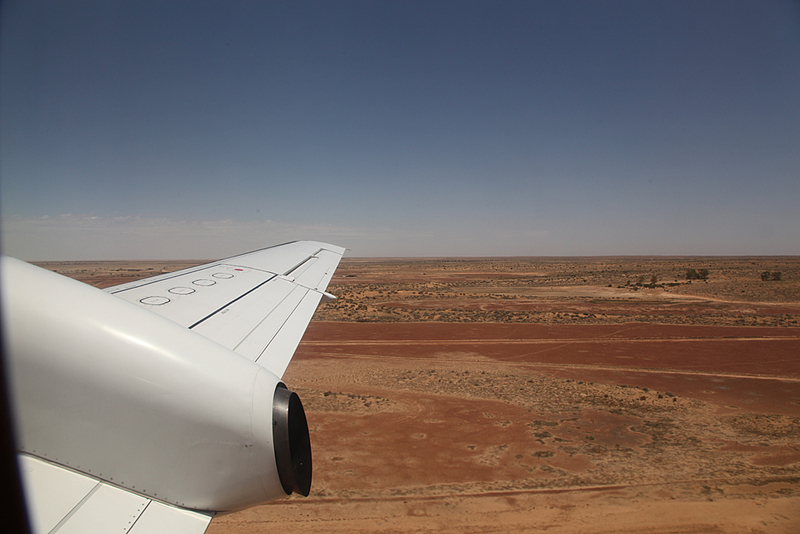 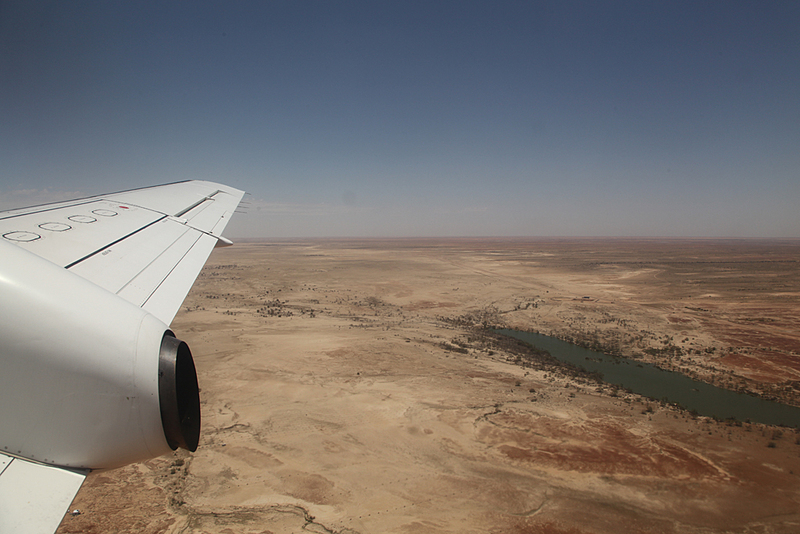 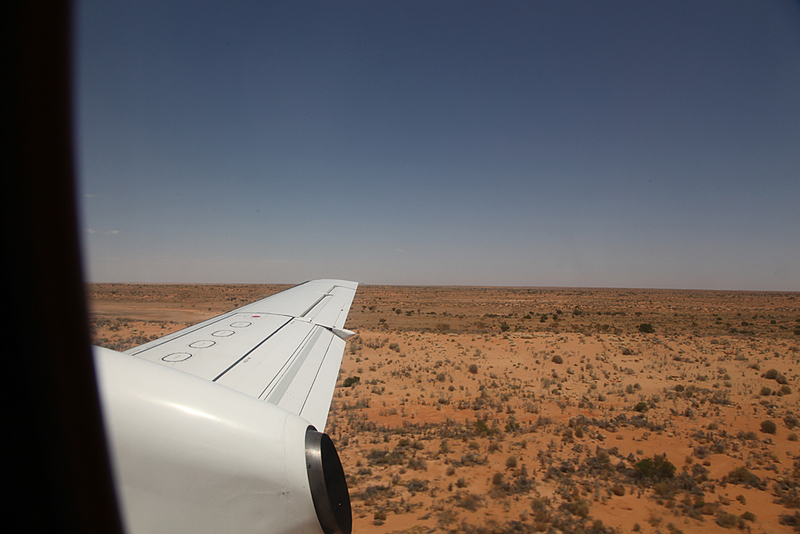 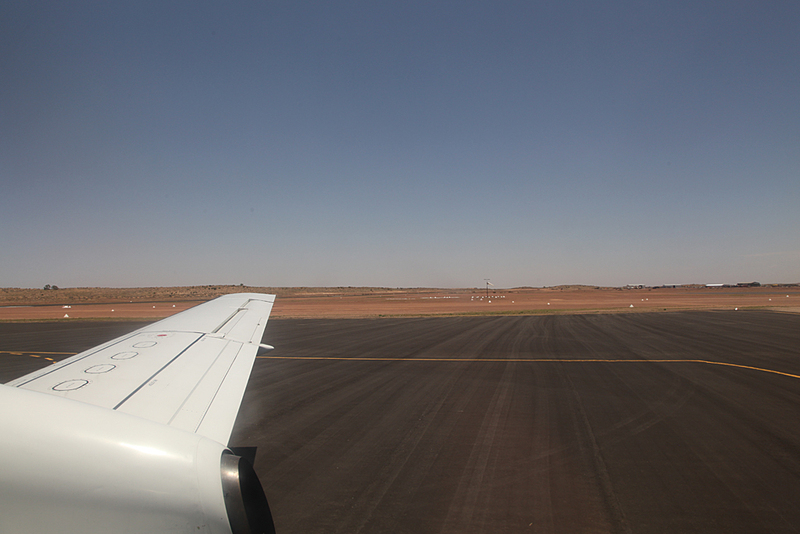 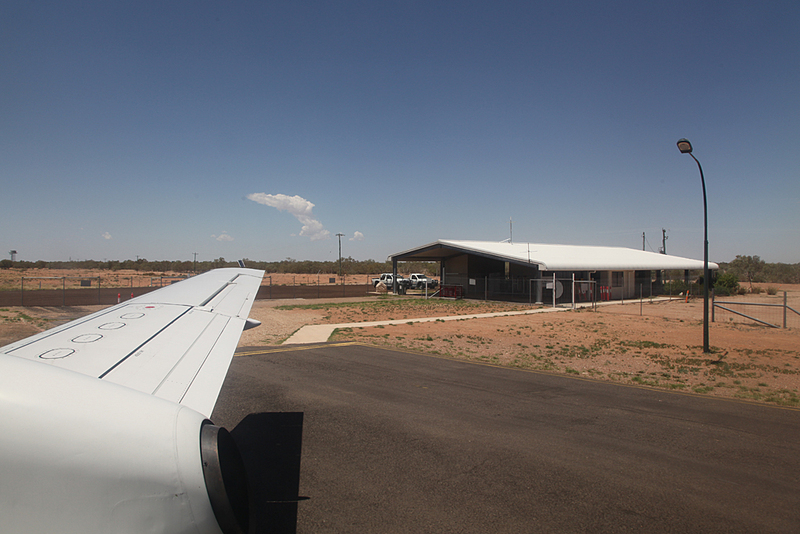 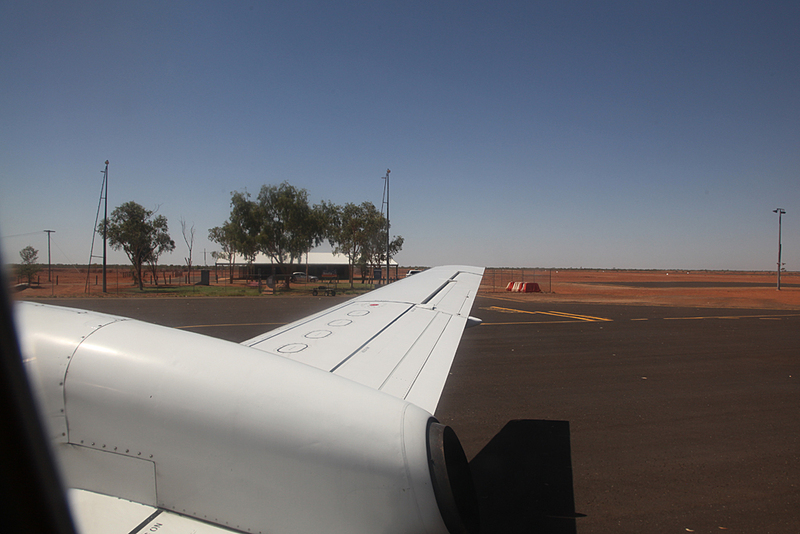 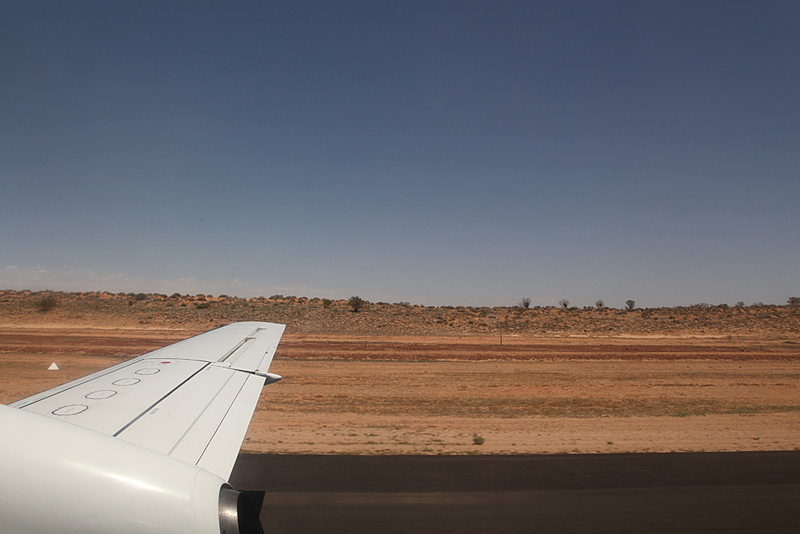 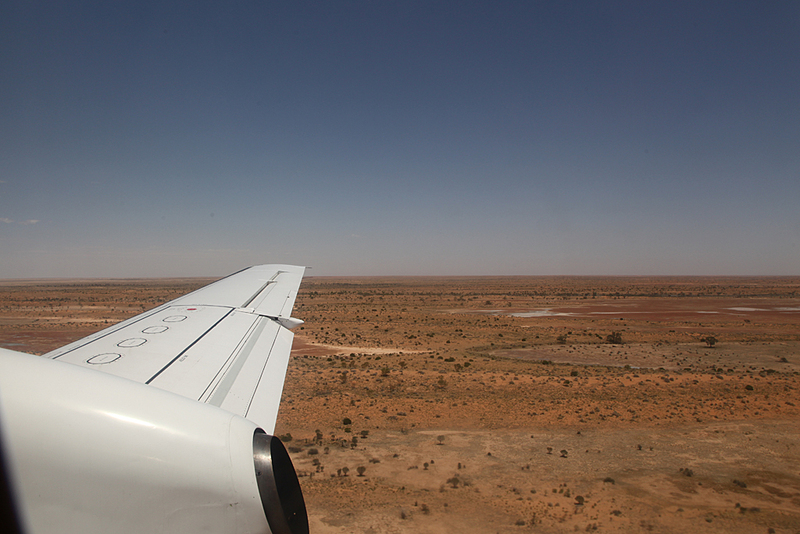 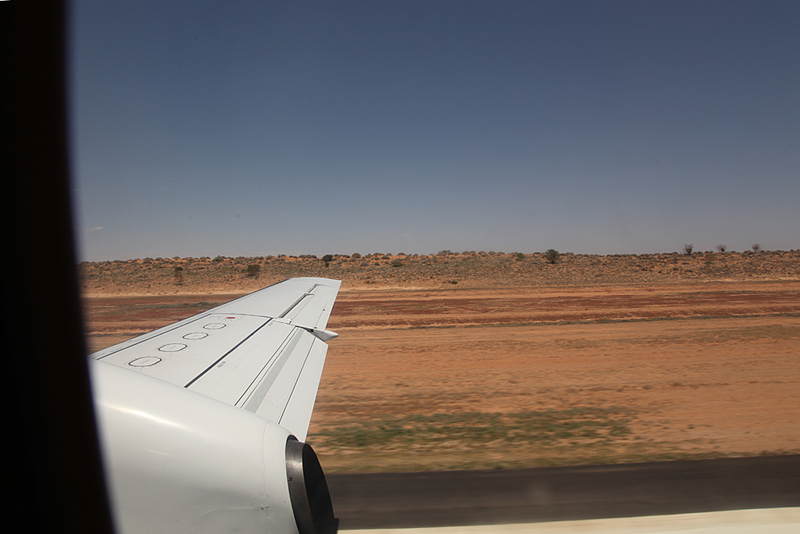 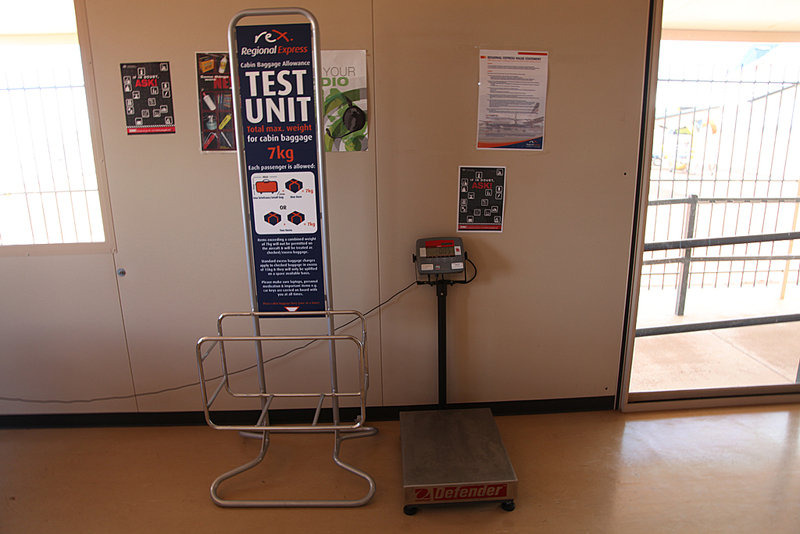 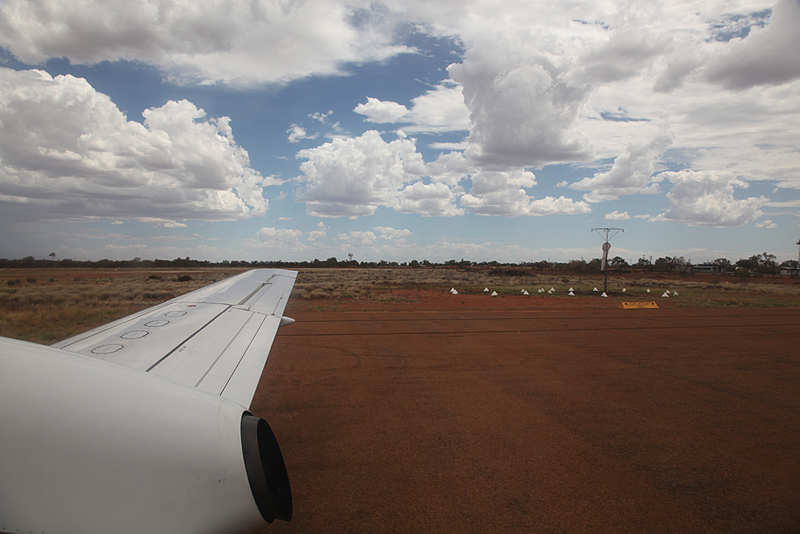 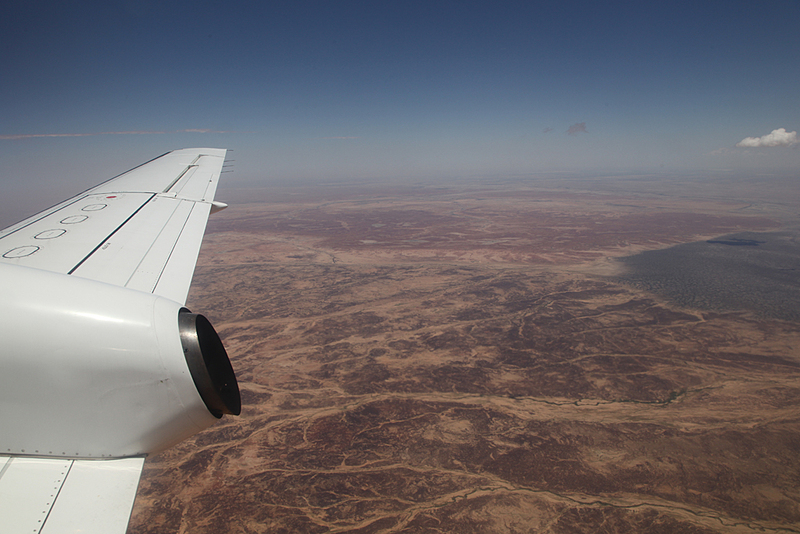 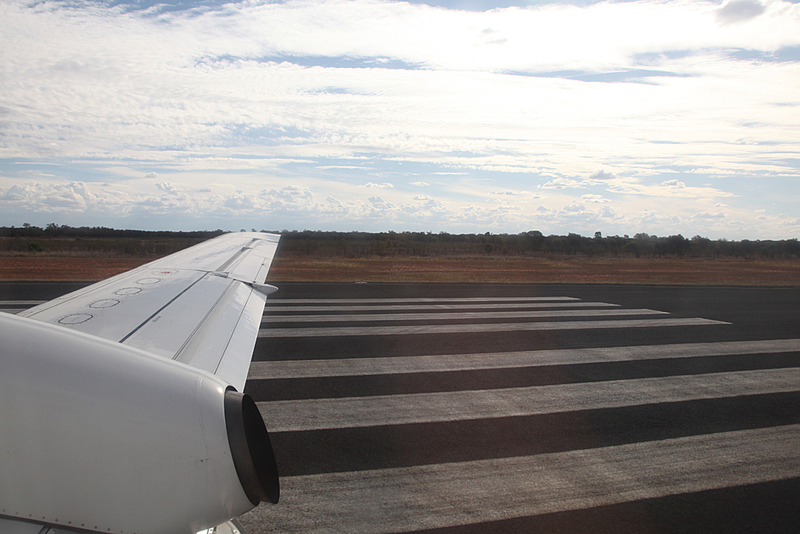 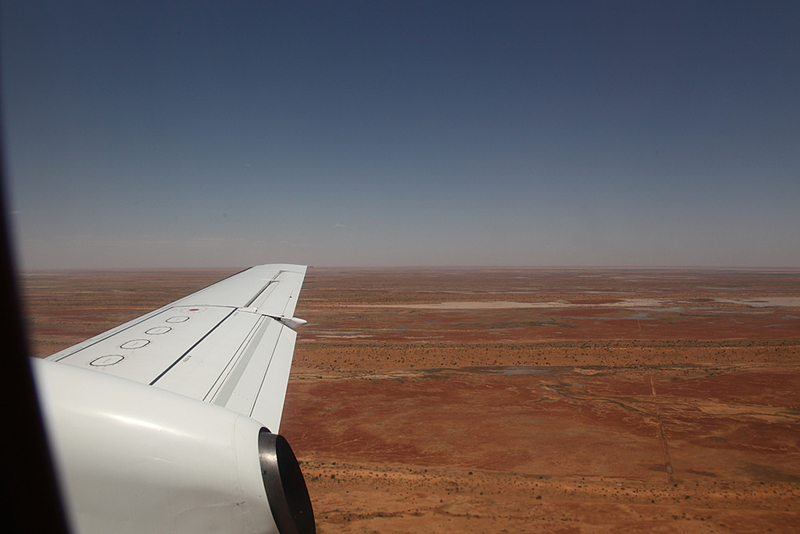 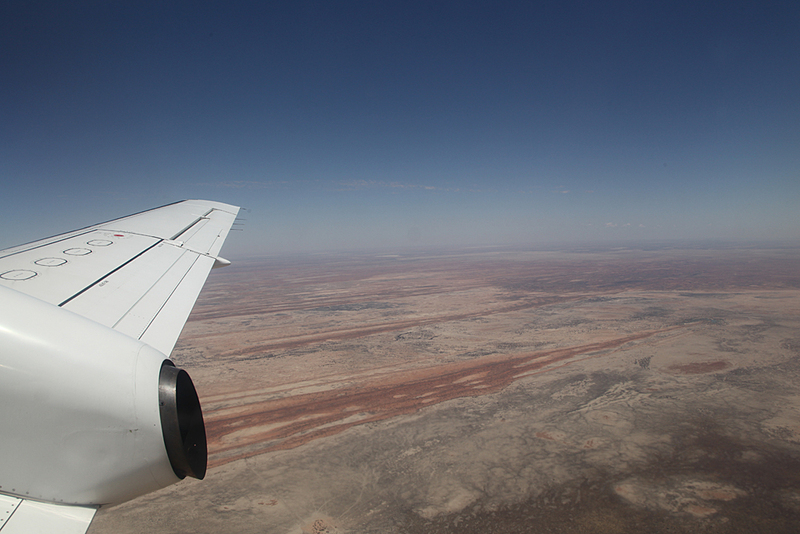 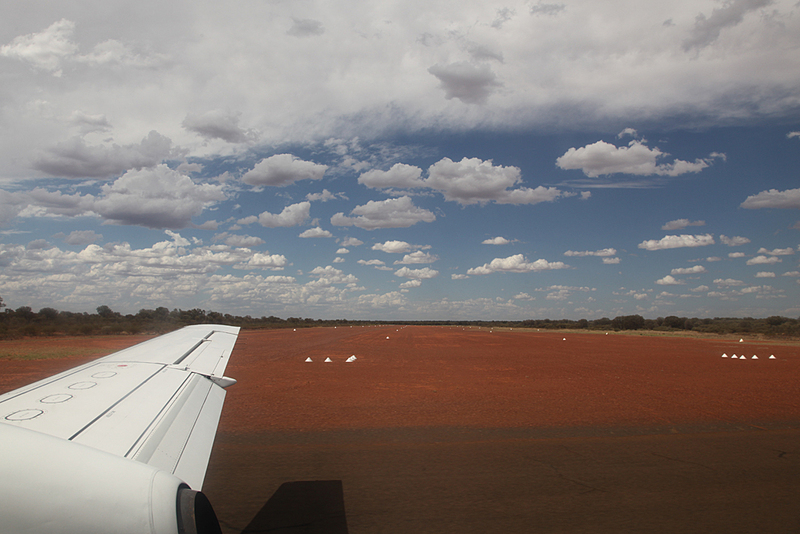 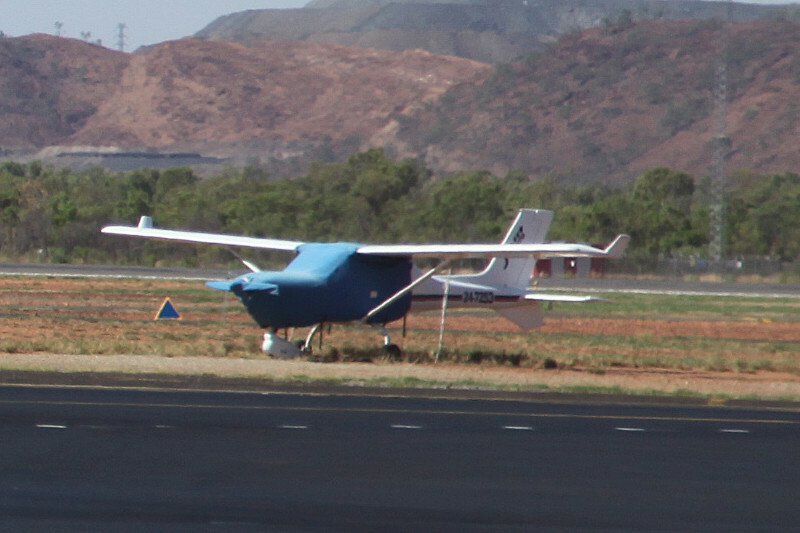 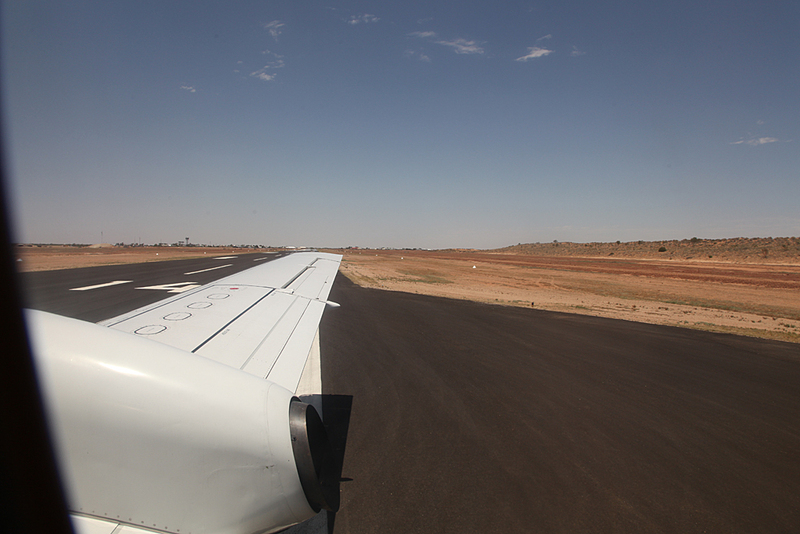 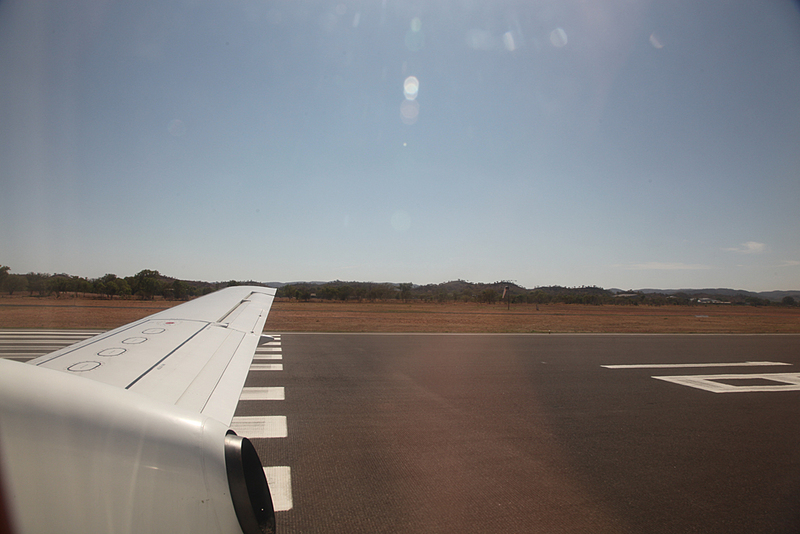 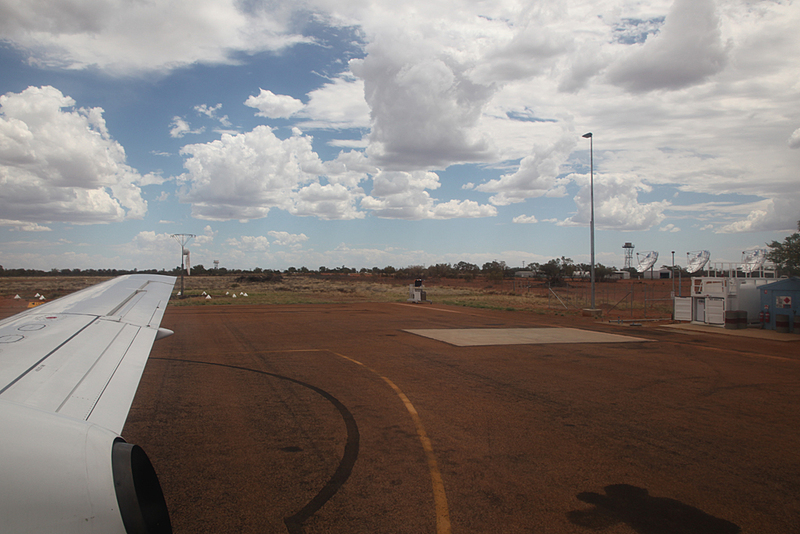 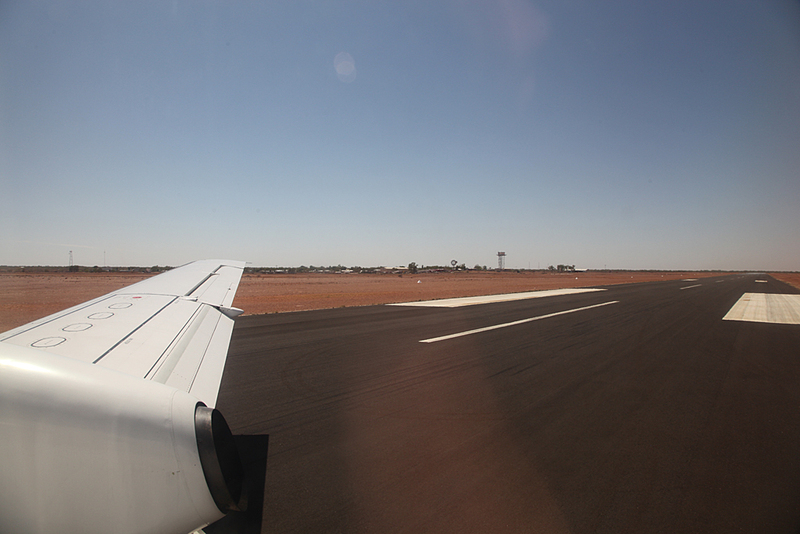 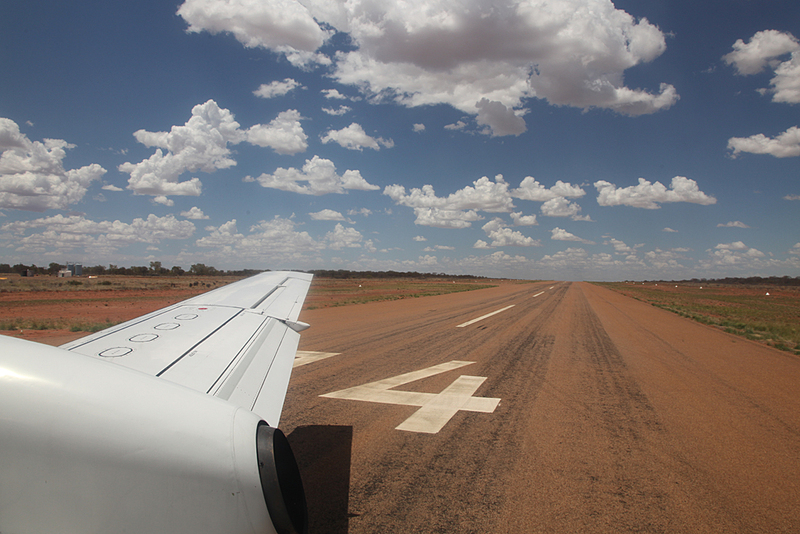 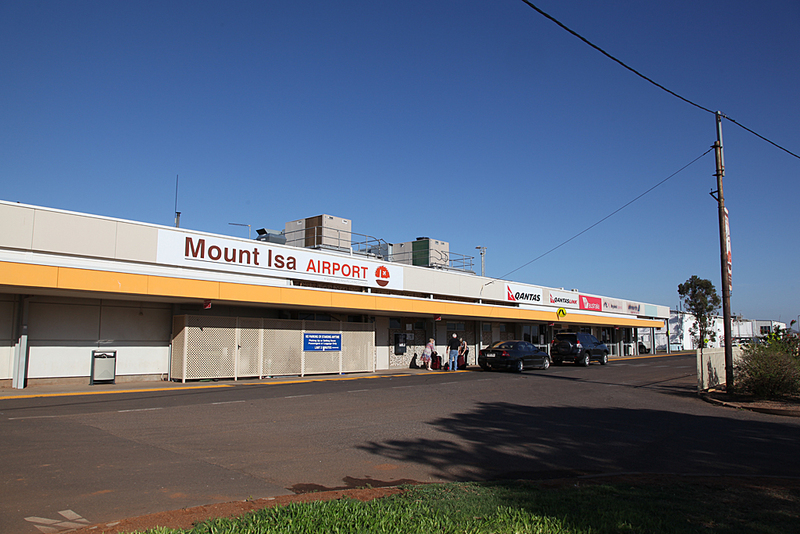 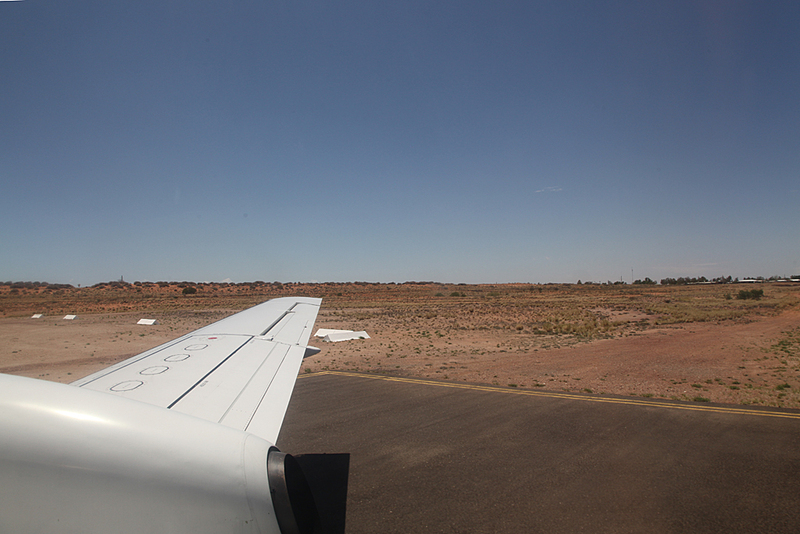 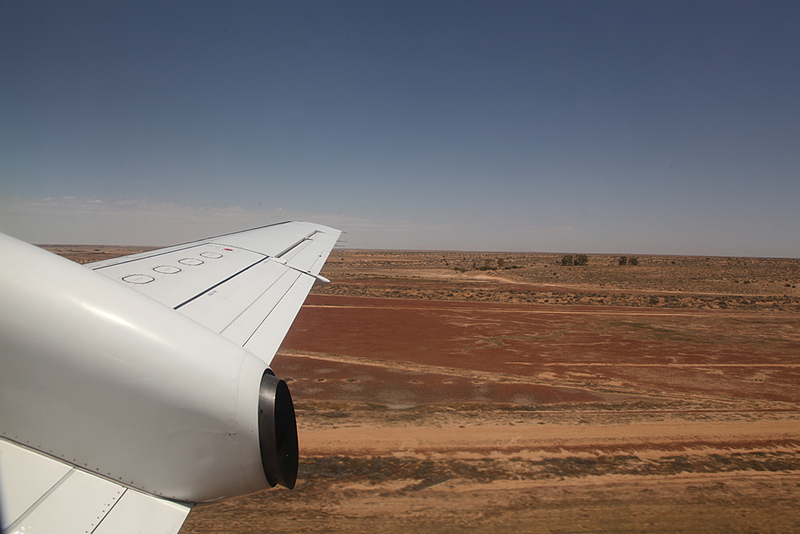 Since Palmjet's visit in 2011, Boulia and Bedourie had new terminals built. 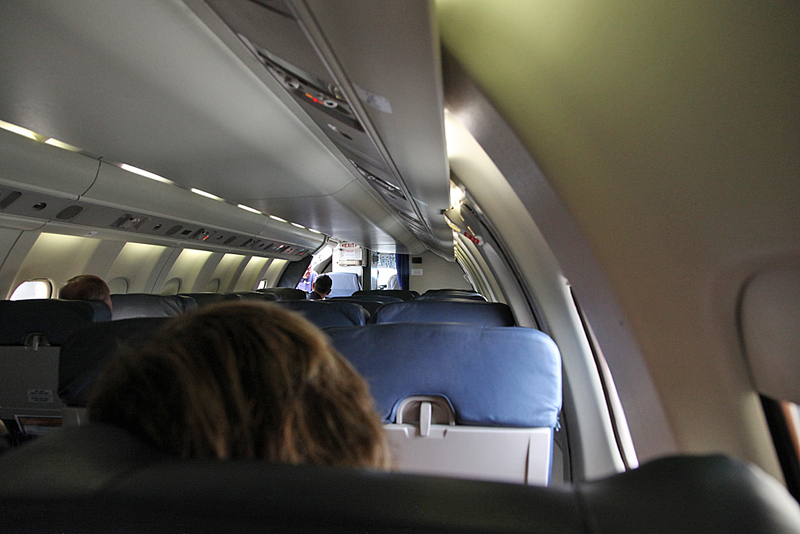 While on the ground at these transit stops, the flight attendant puts the window shades on the sun side of the aircraft down in an effort to try and keep the cabin a bit cooler. 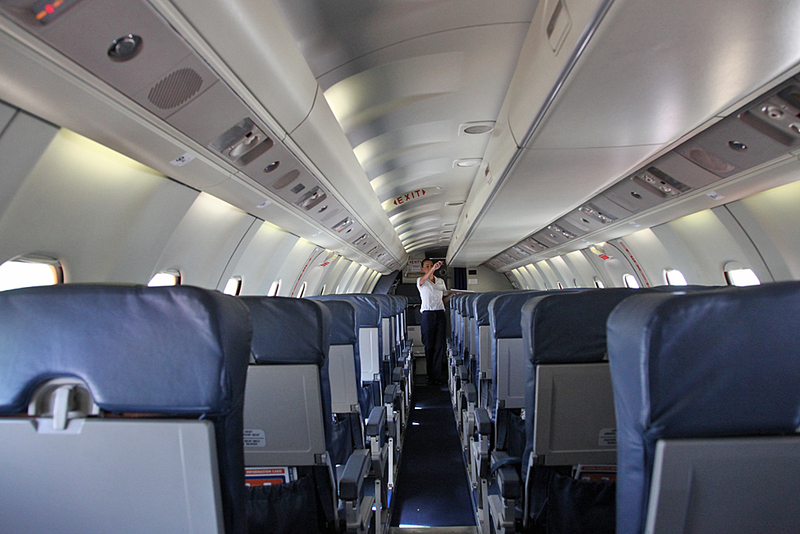 One passenger joined us here. 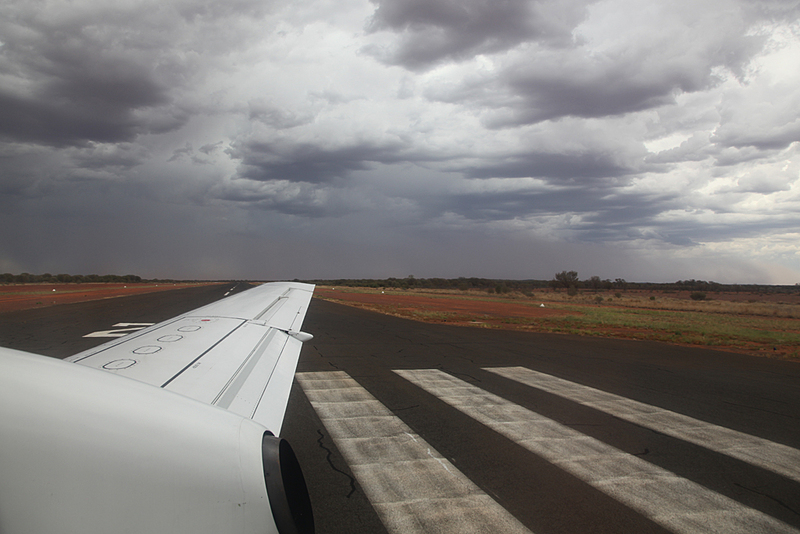 Got a bit rough on approach. 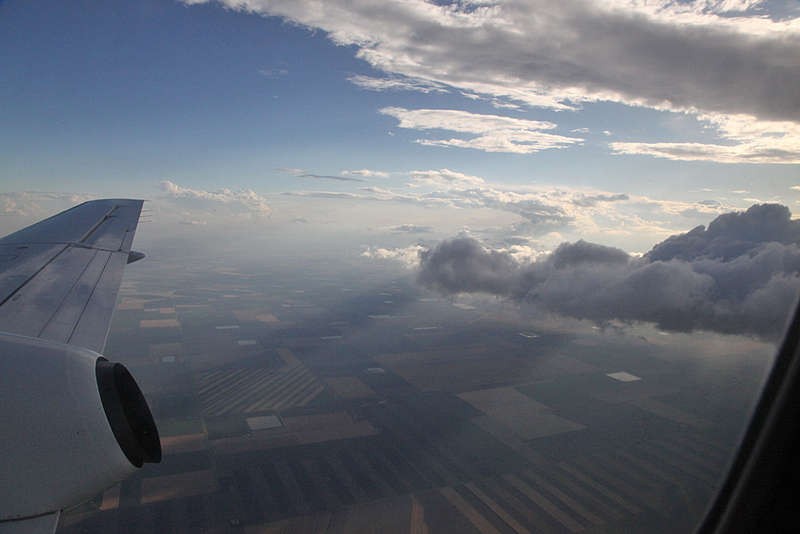 The thermals are starting to form. 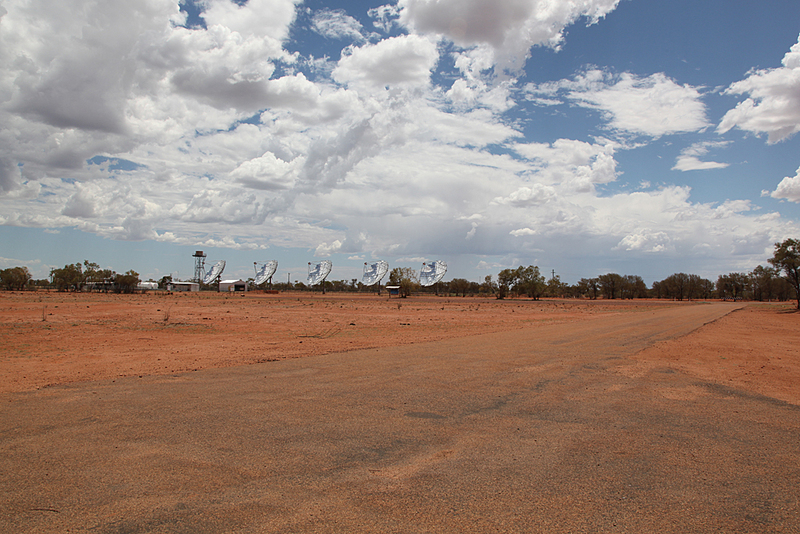 Out here you are better off owning something like this as distances between places are huge. 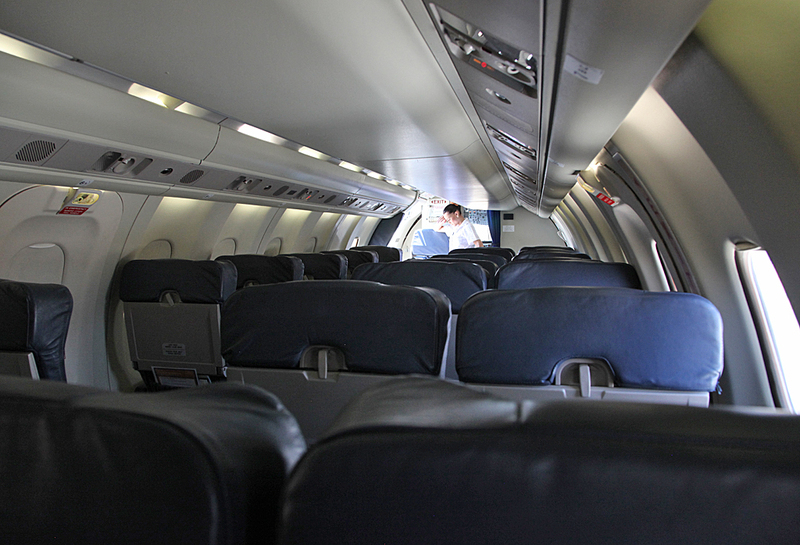 About 7 passengers joined us here. 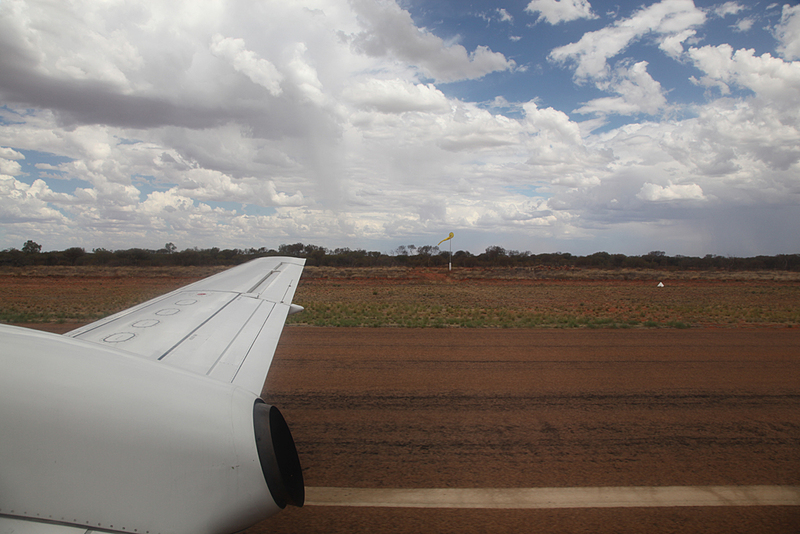 Take offs are getting a bit rougher as the day goes on due to thermals. 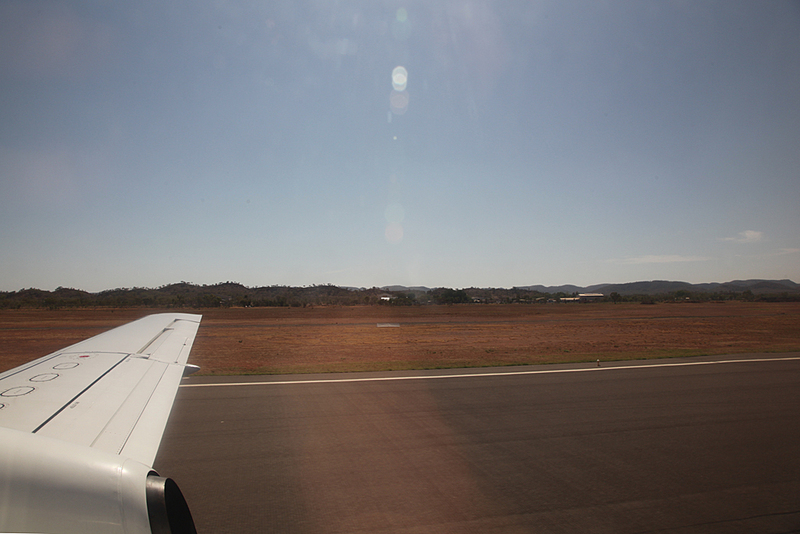 Bet the house with the clear, cool blue swimming pool is popular this time of year as this part of Queensland gets very hot this time of year. 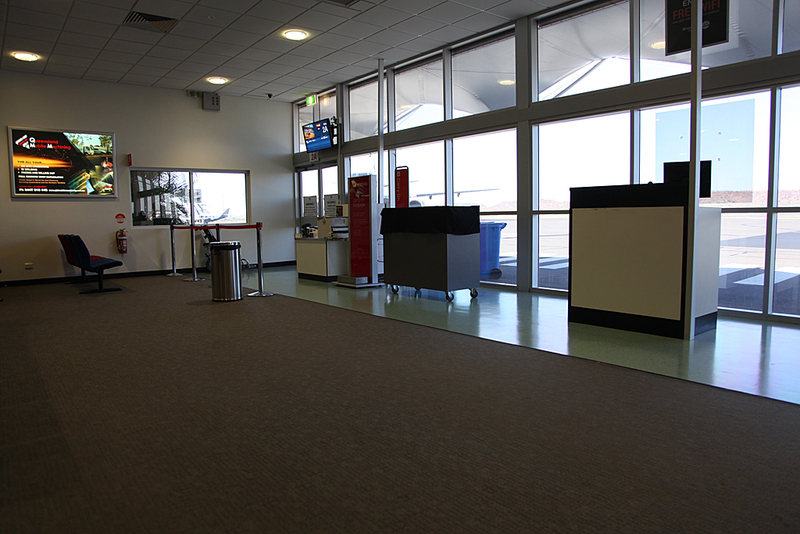 Snacks and water again offered. 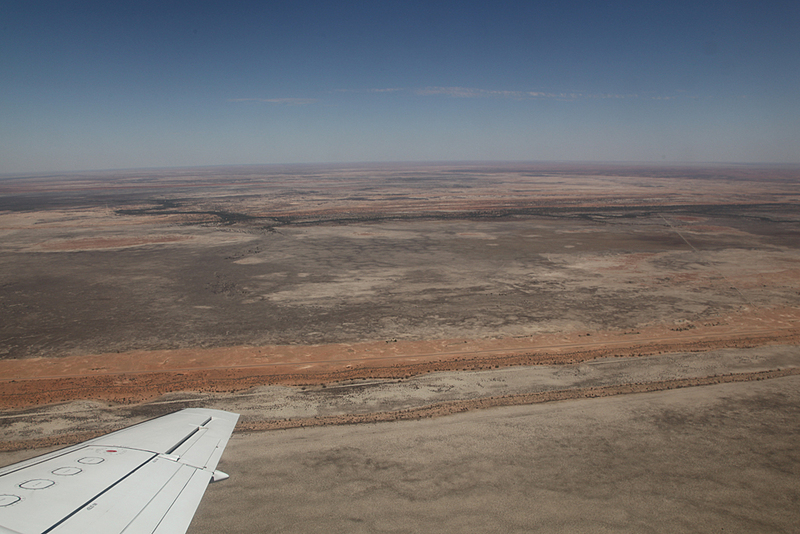 The vast empty desert is clearly shown here. 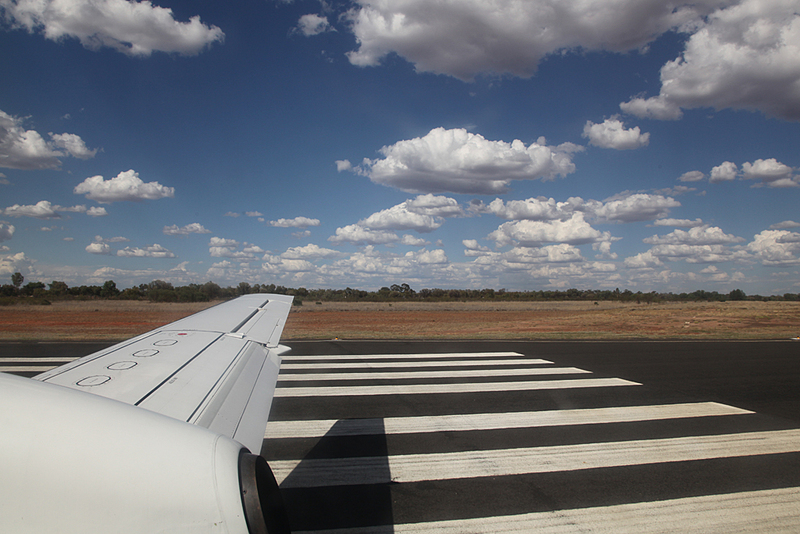 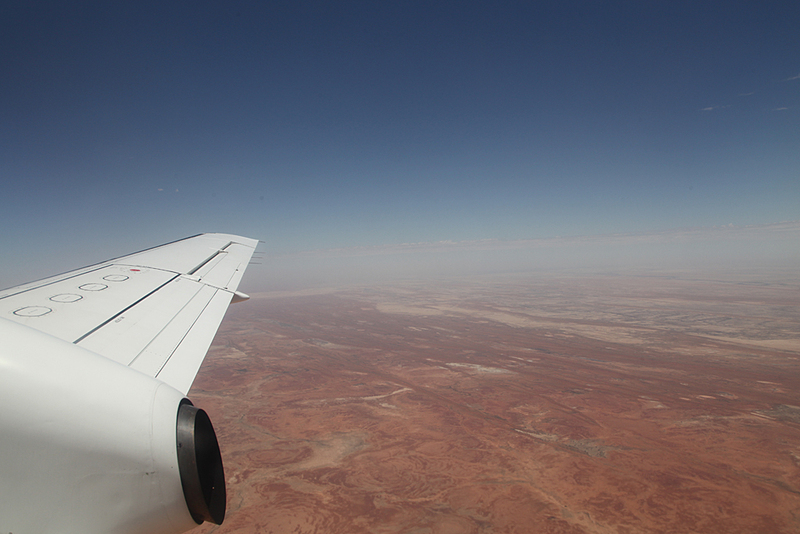 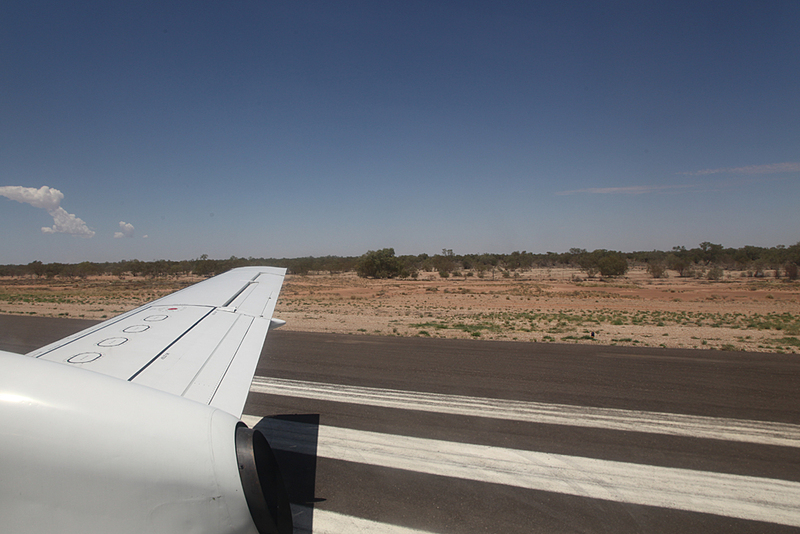 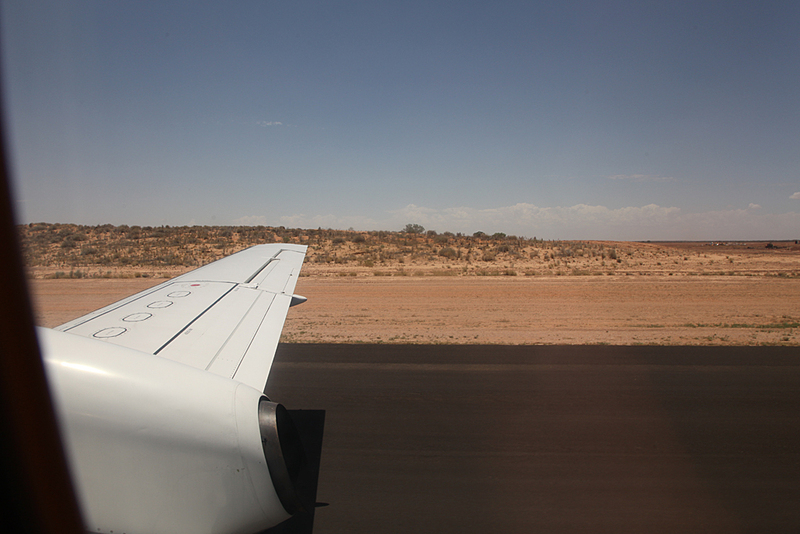 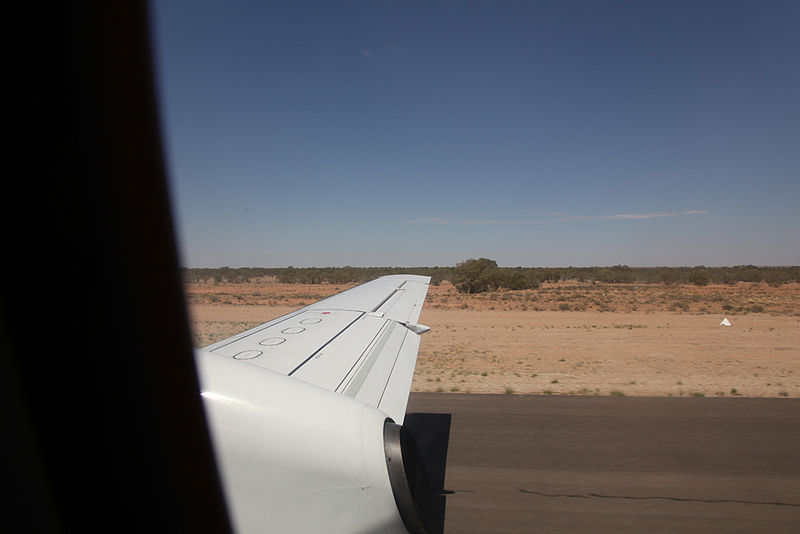 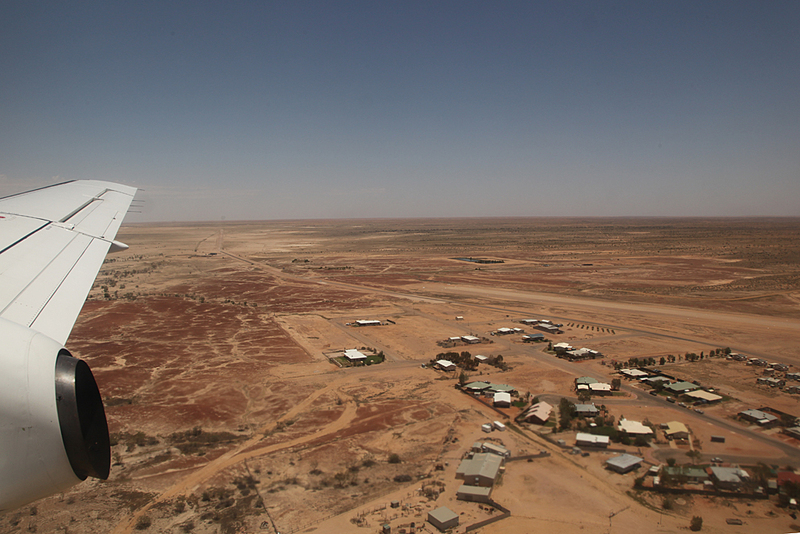 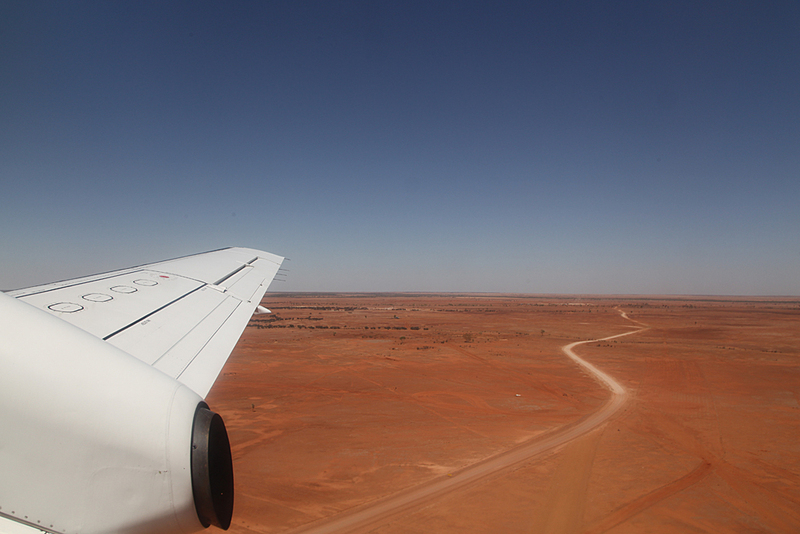 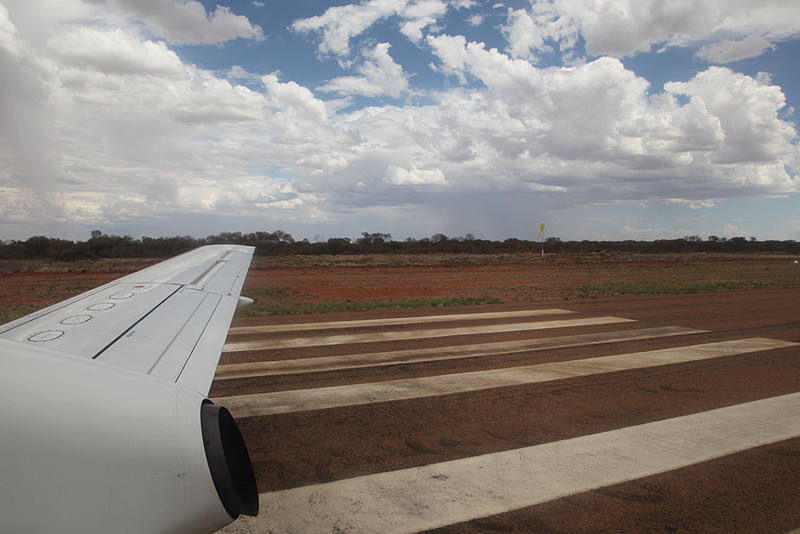 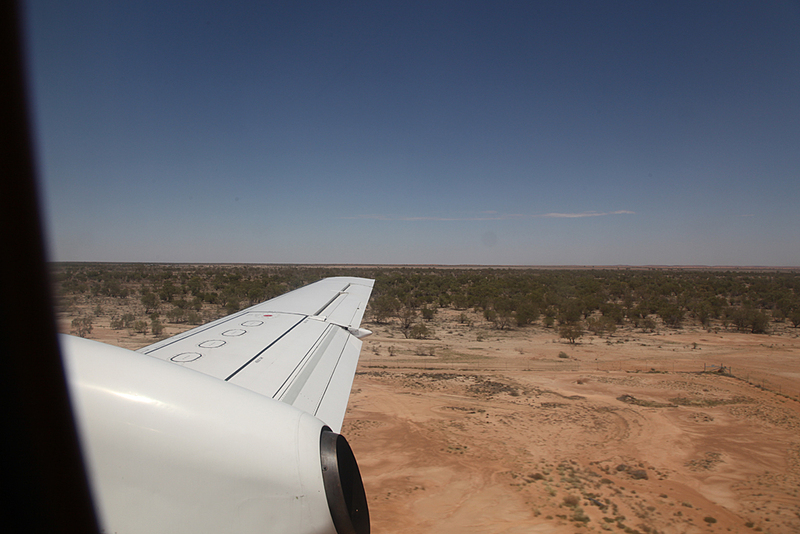 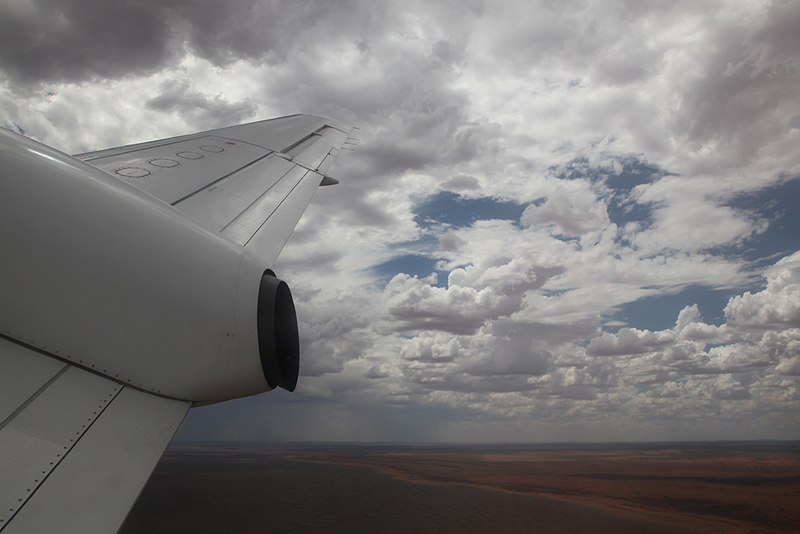 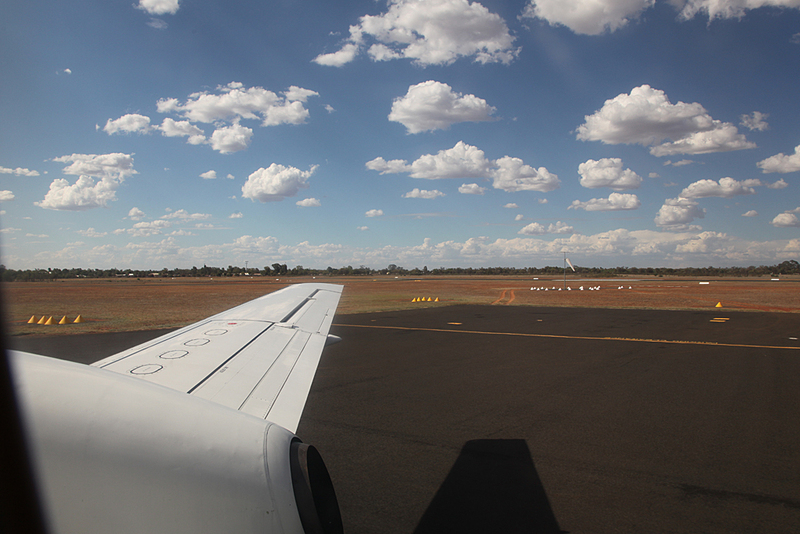 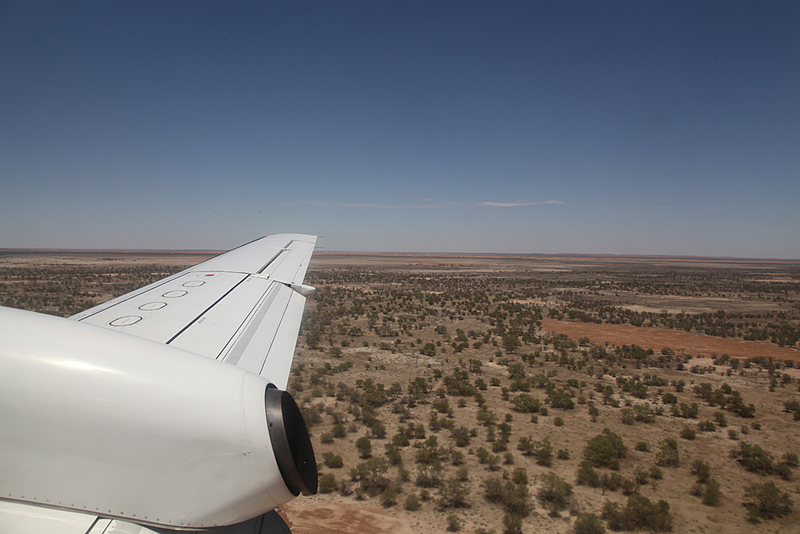 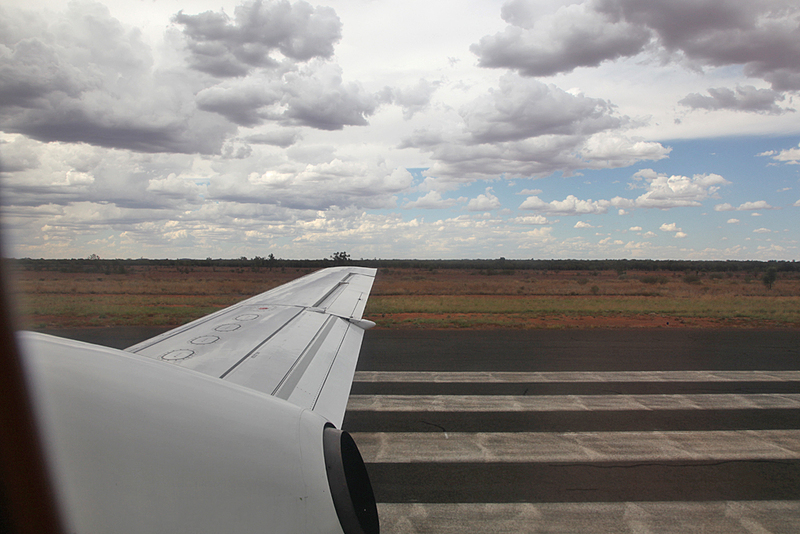 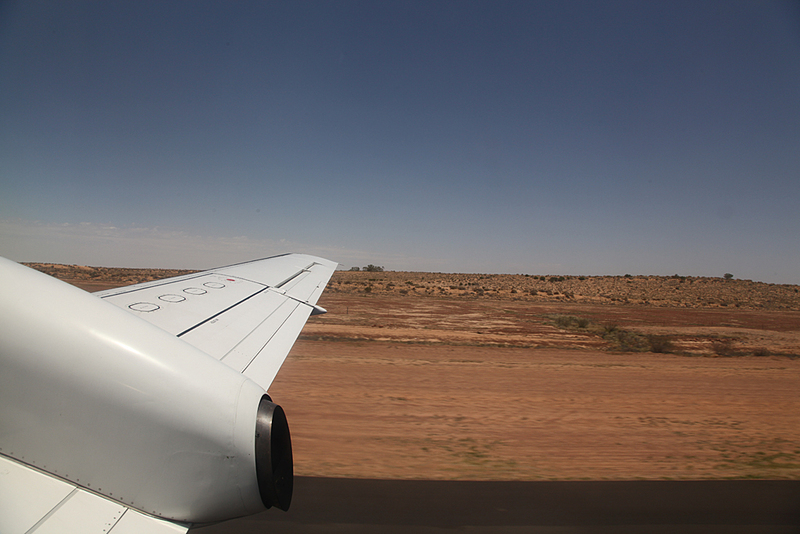 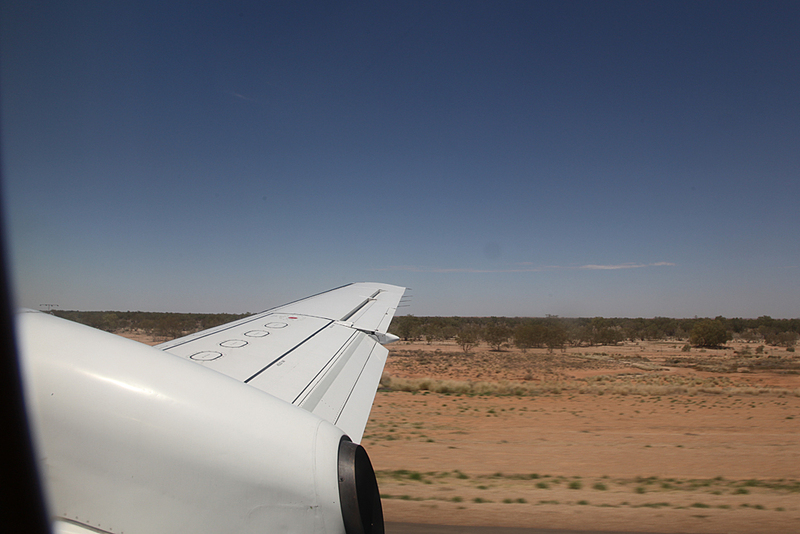 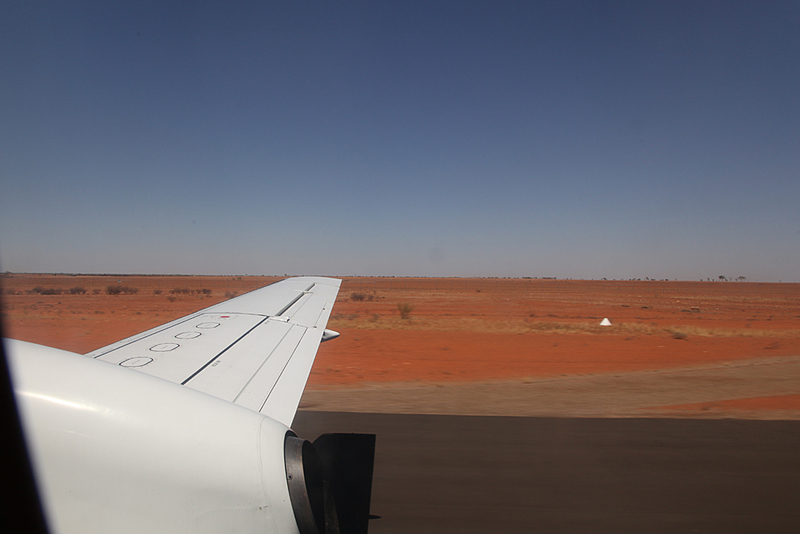 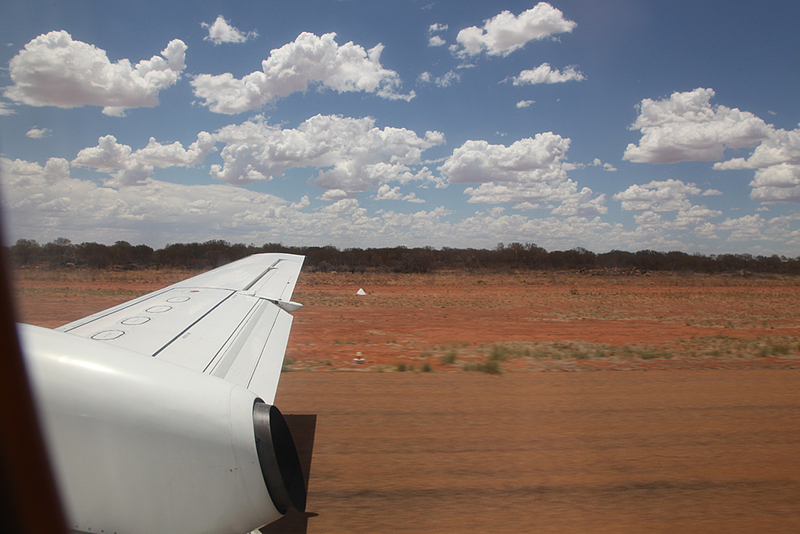 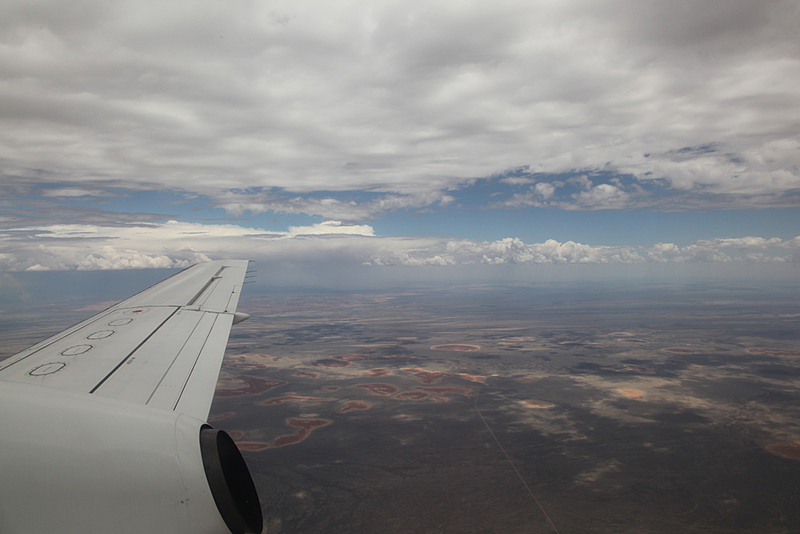 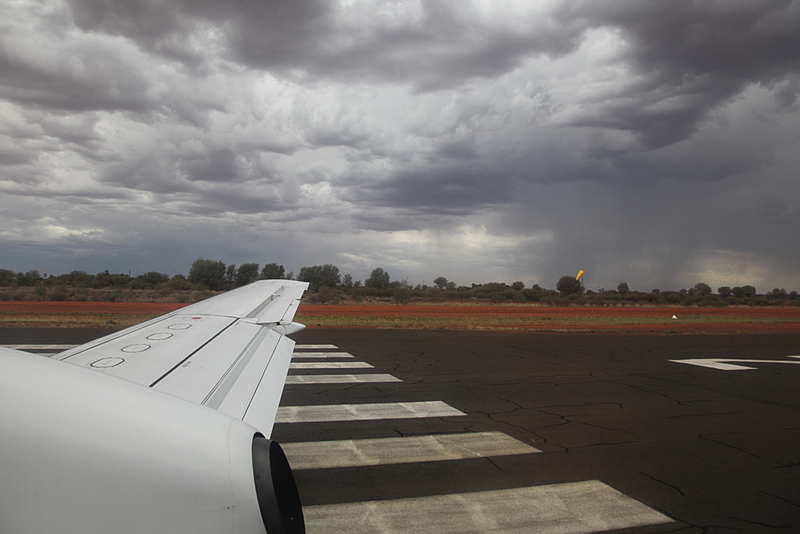 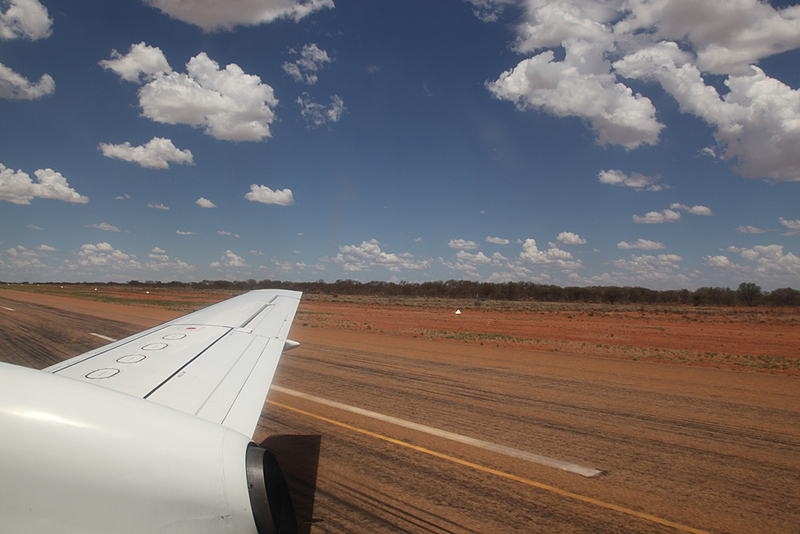 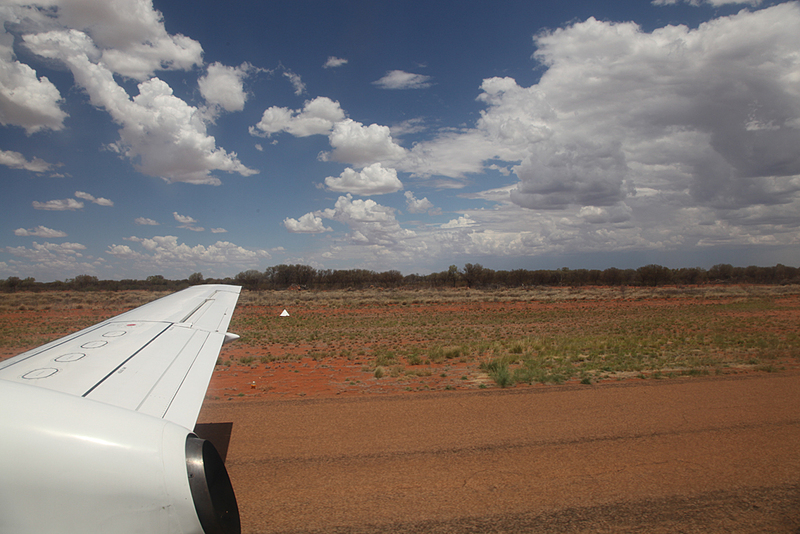 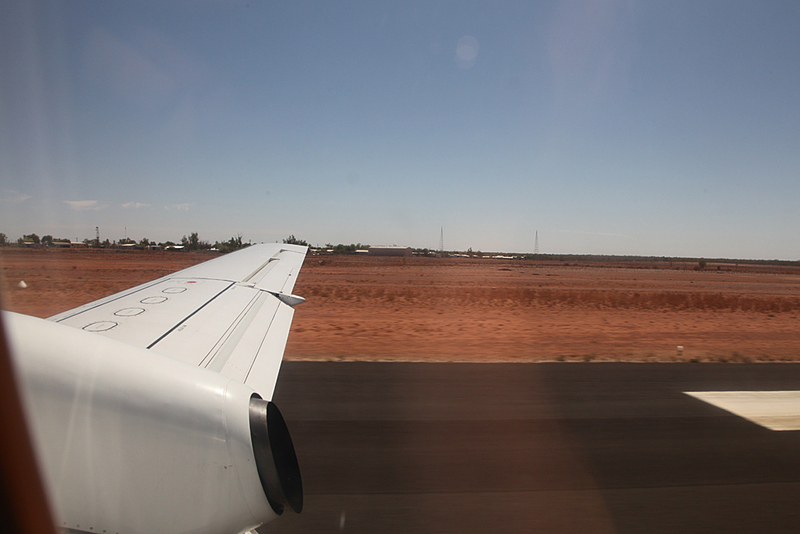 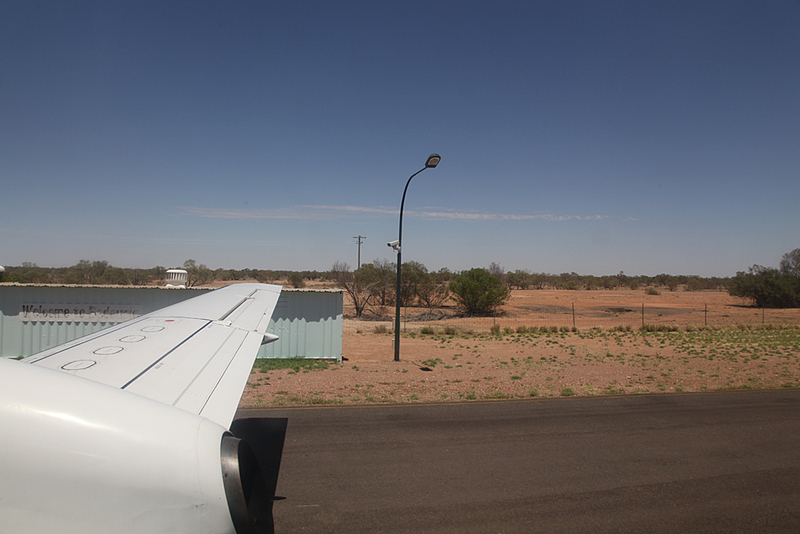 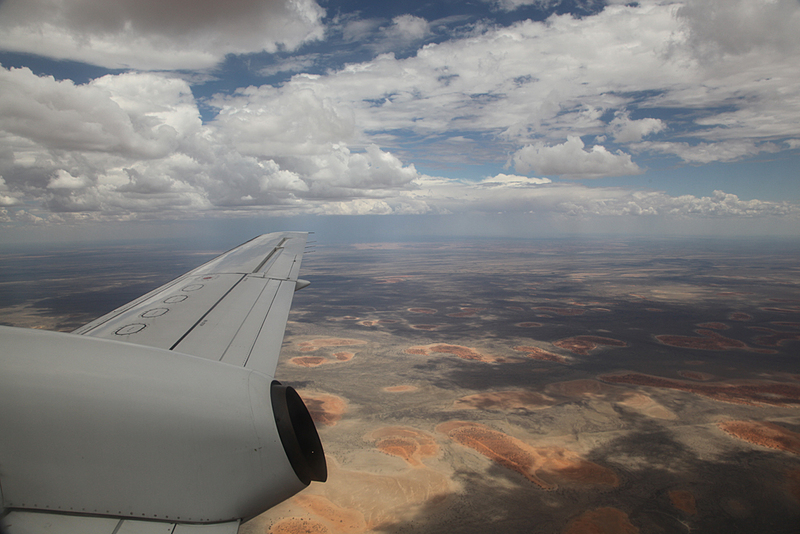 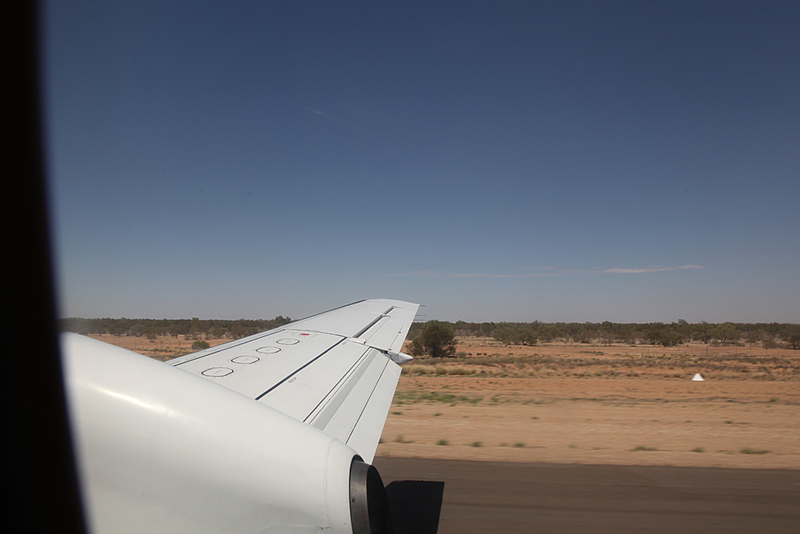 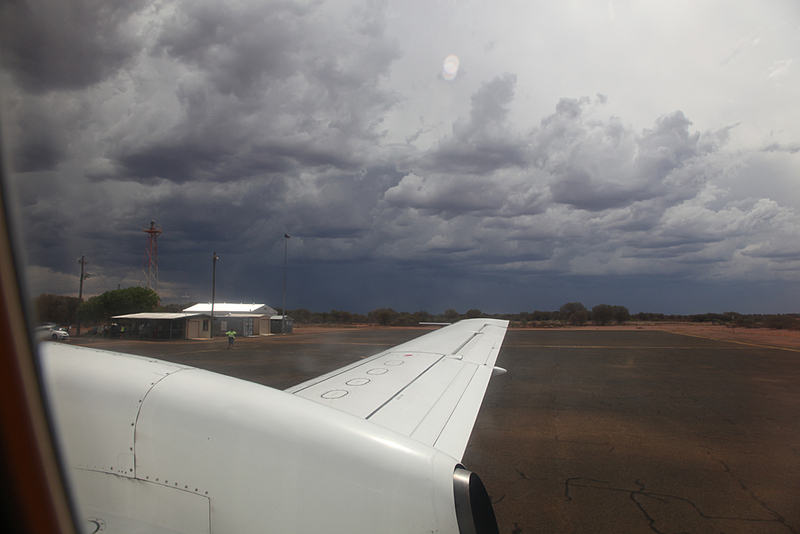 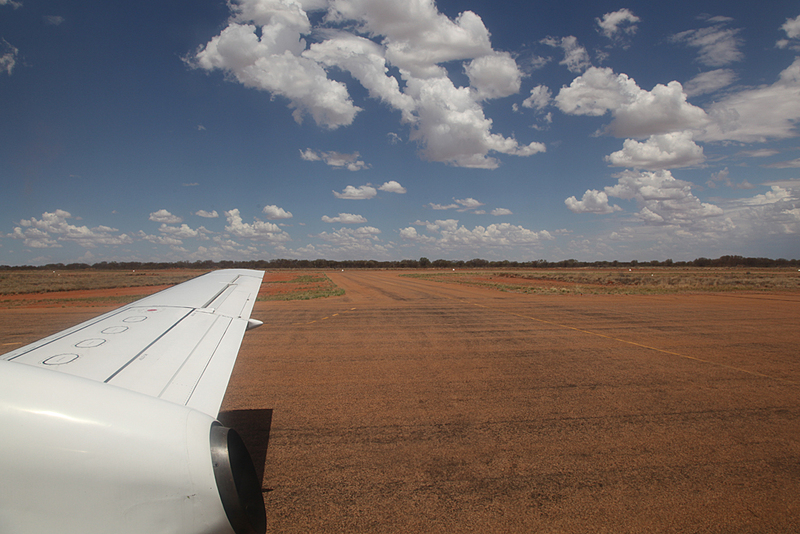 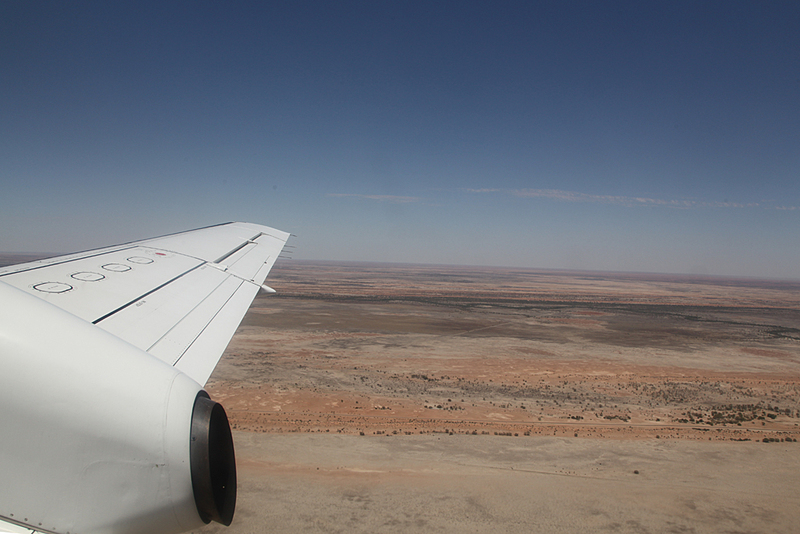 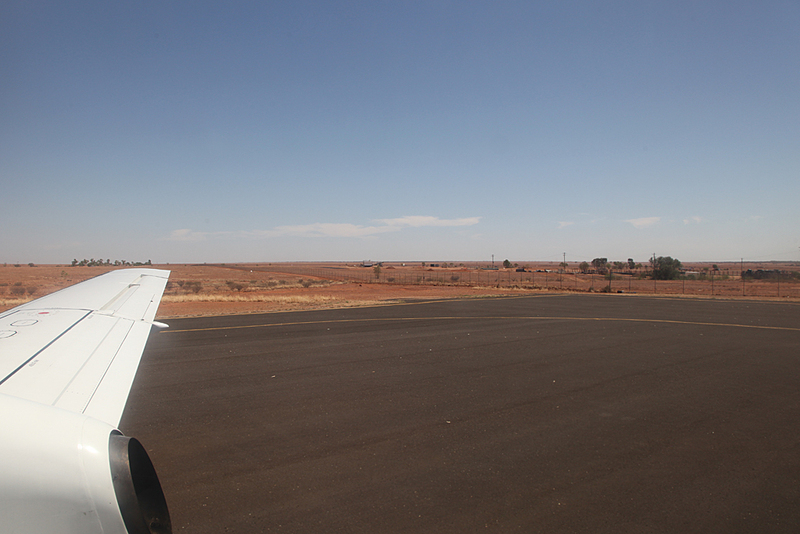 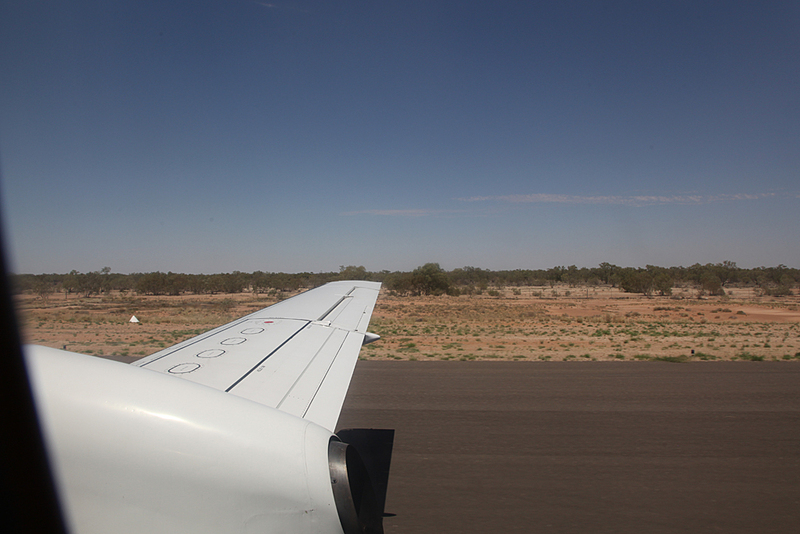 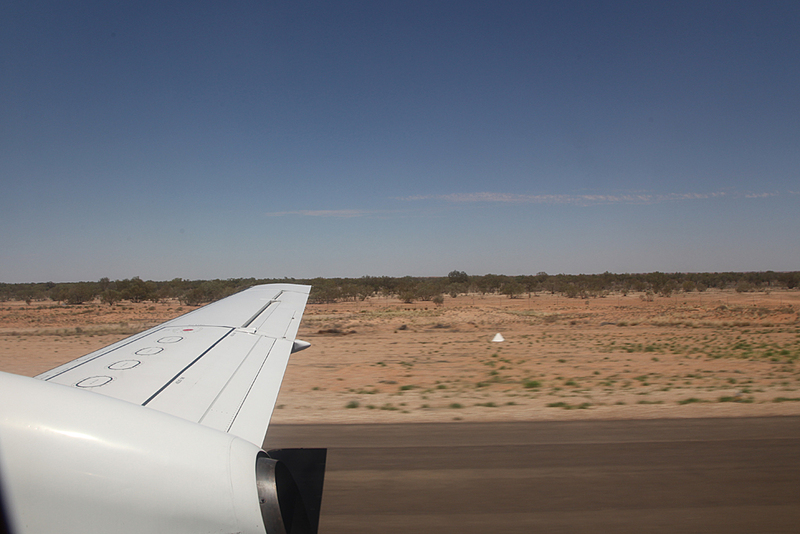 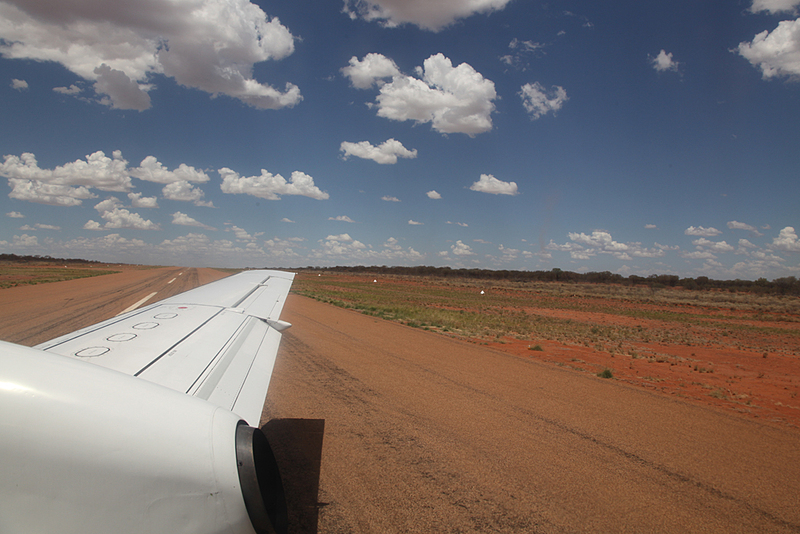 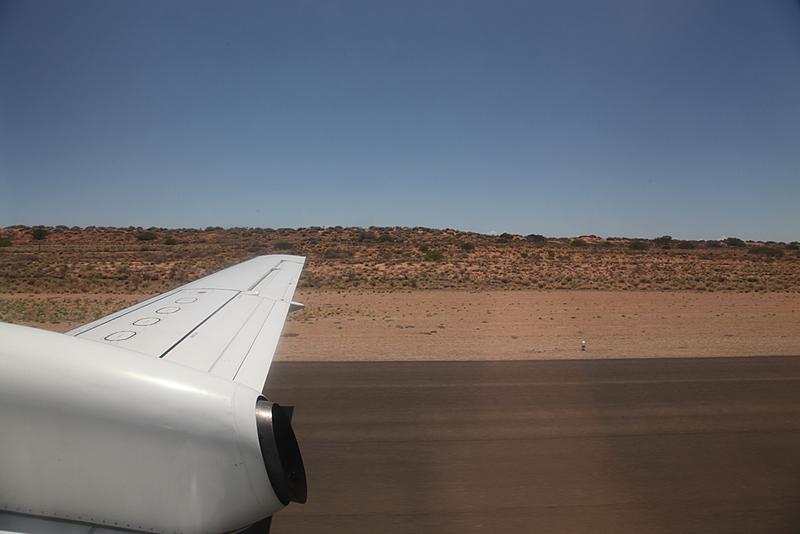 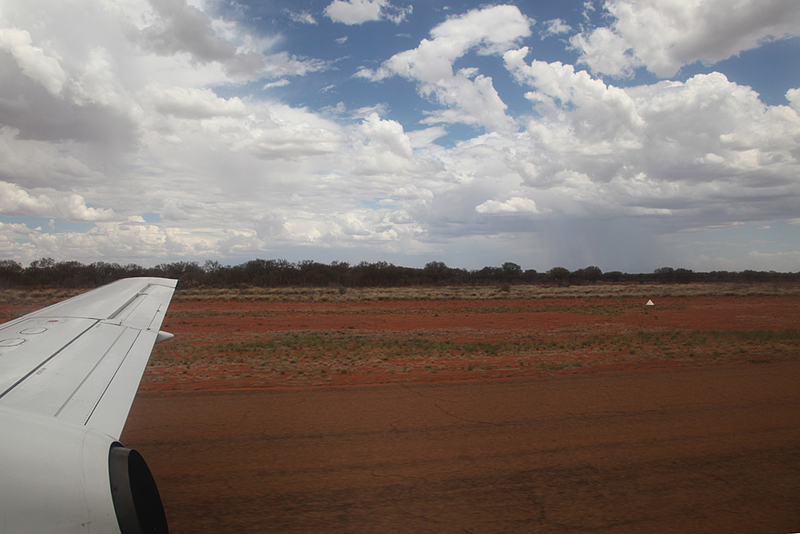 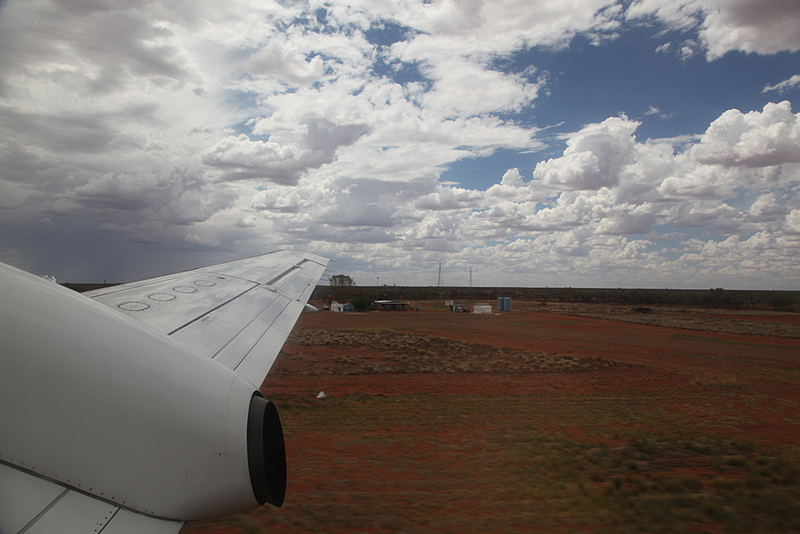 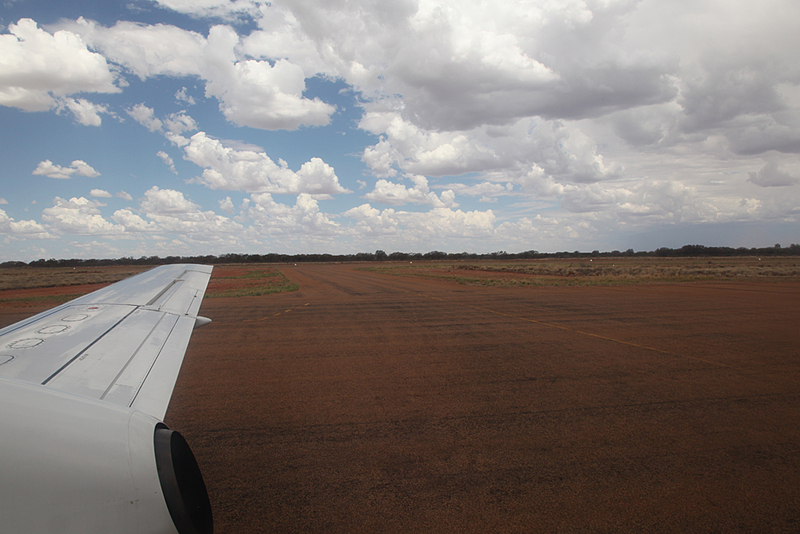 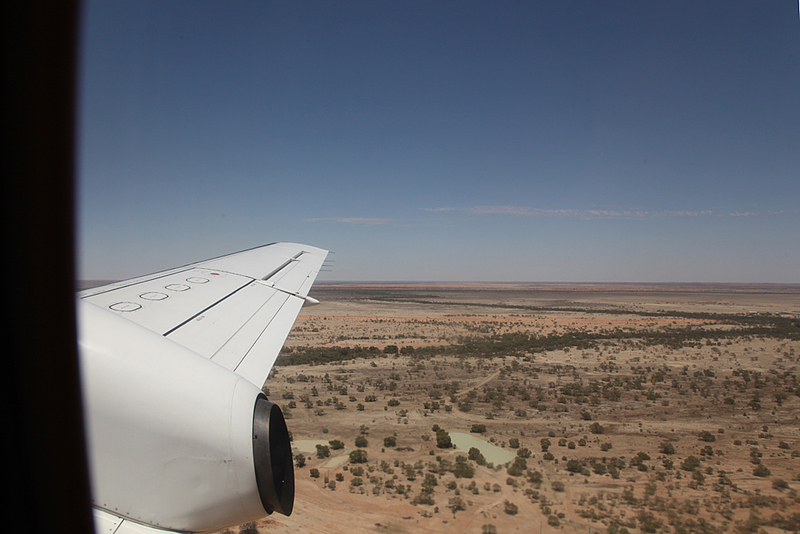 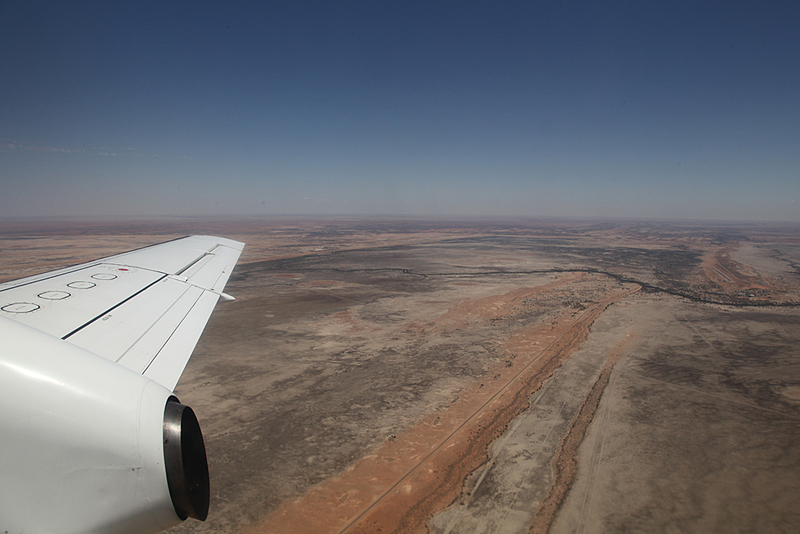 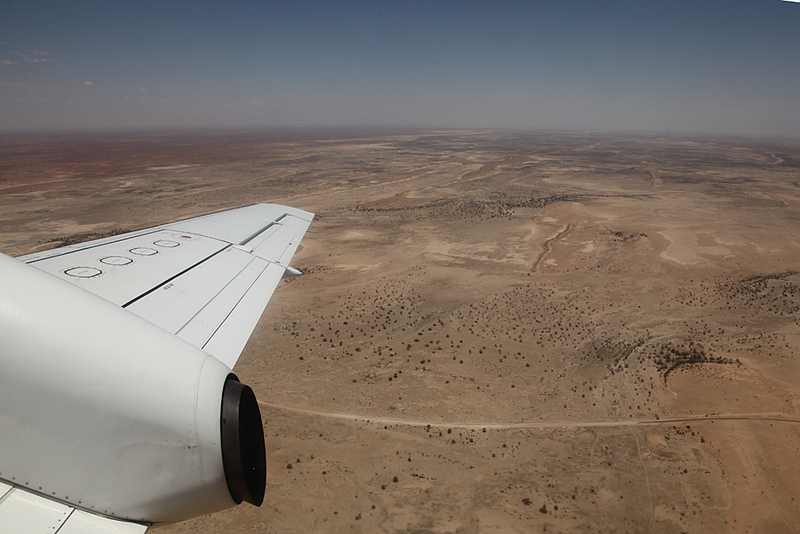 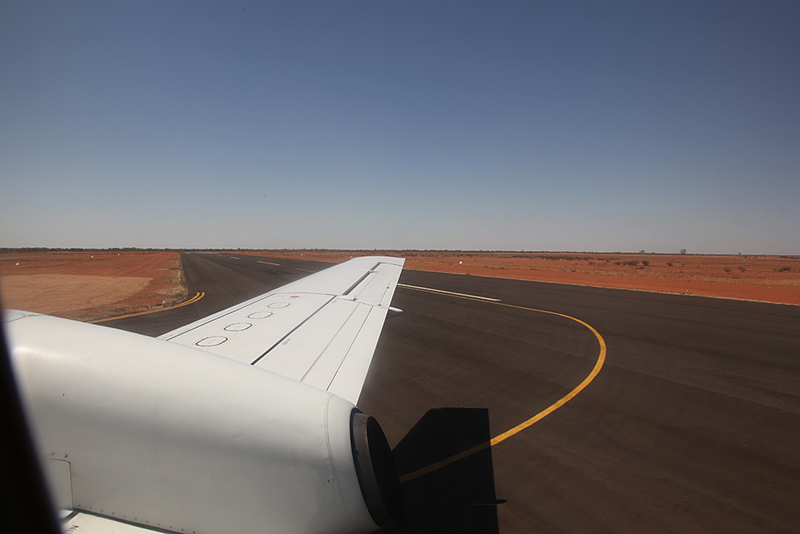 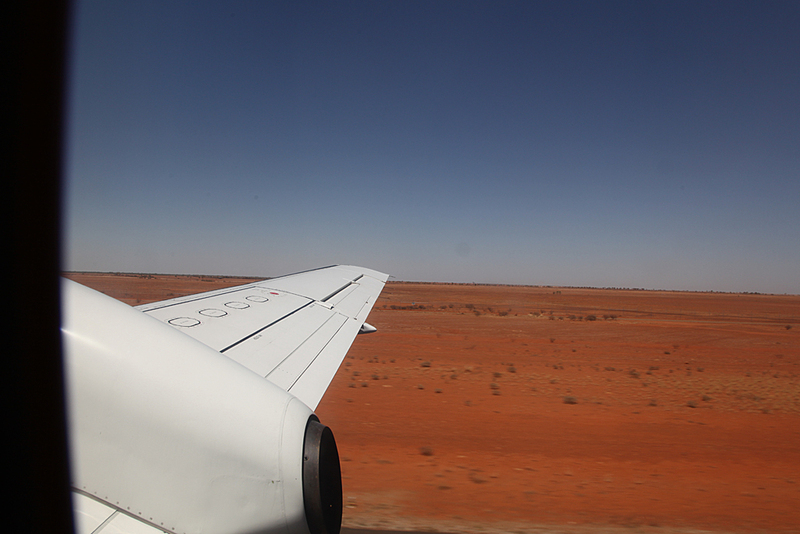 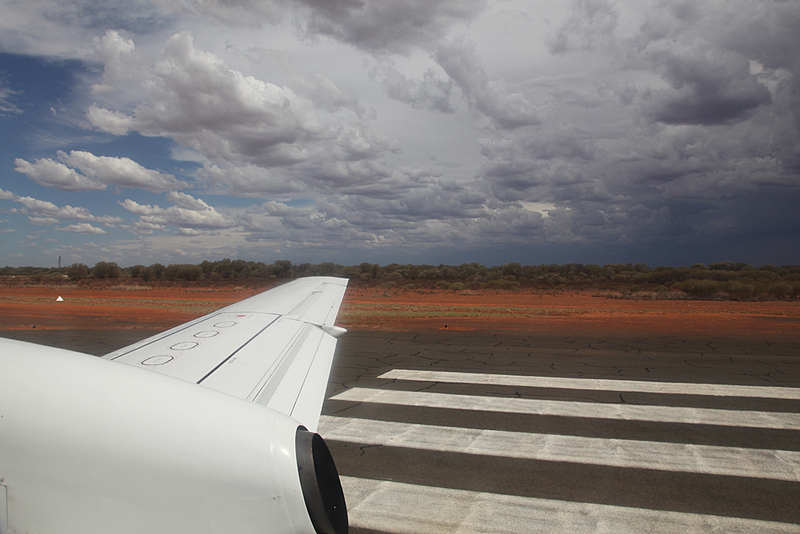 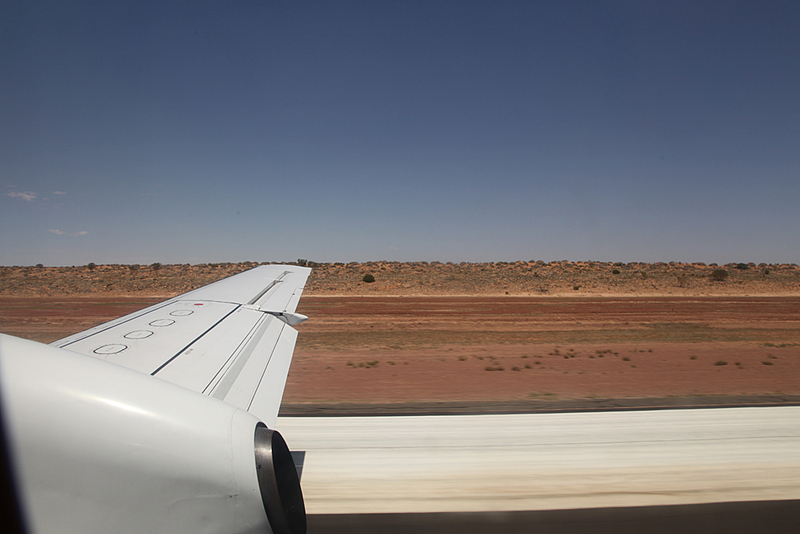 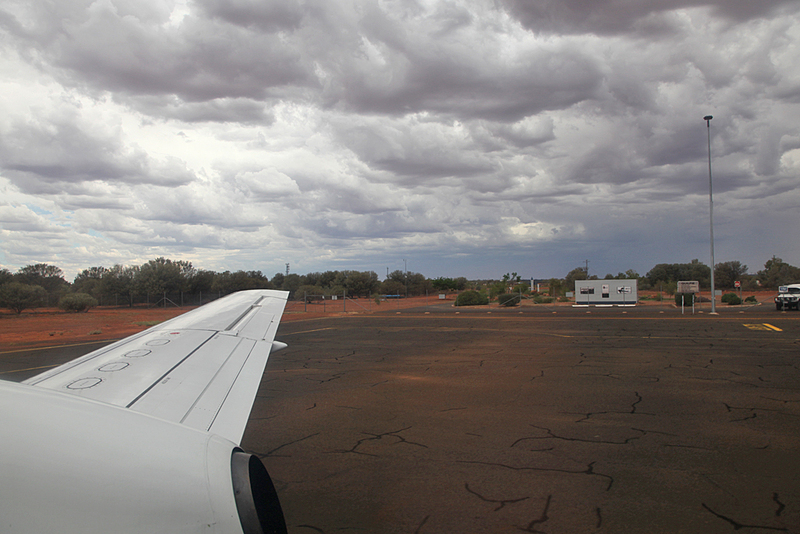 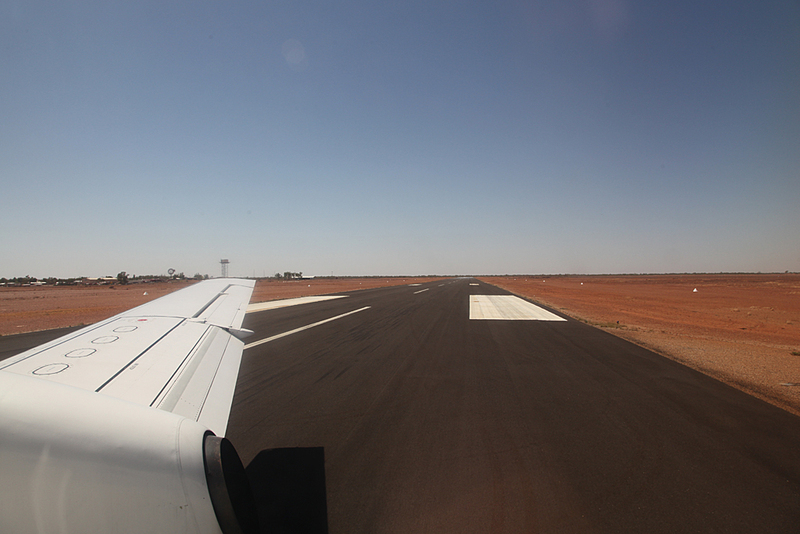 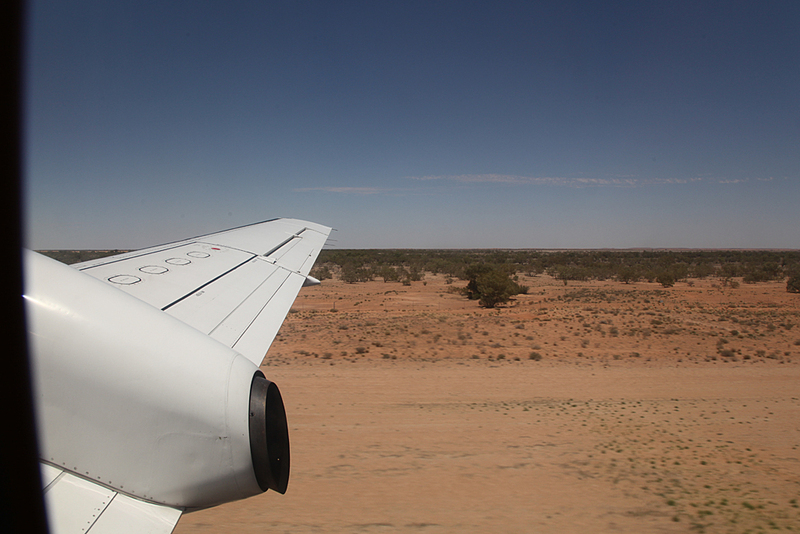 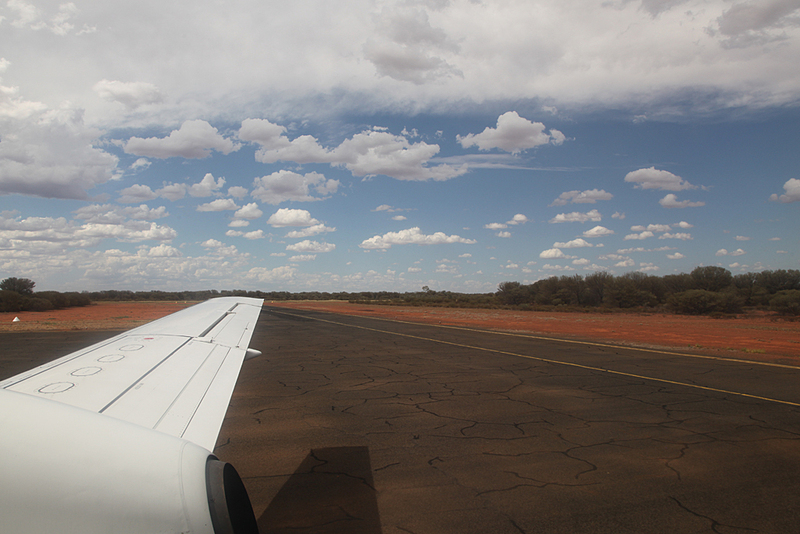 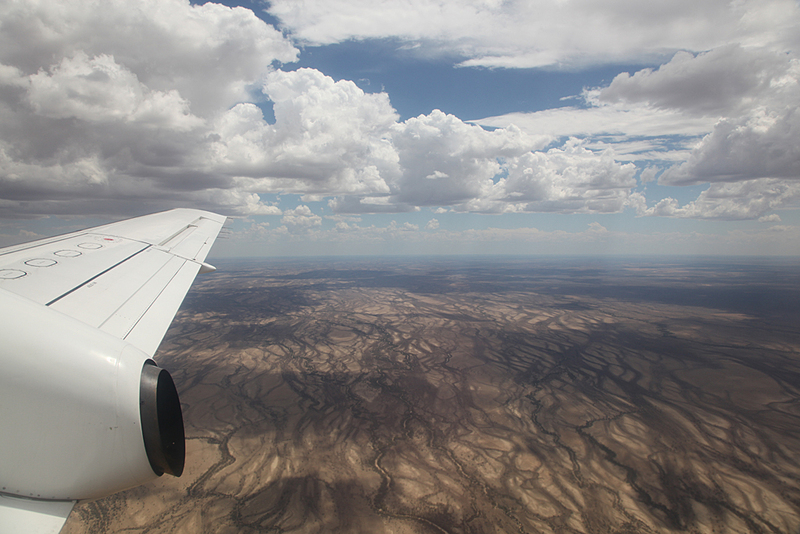 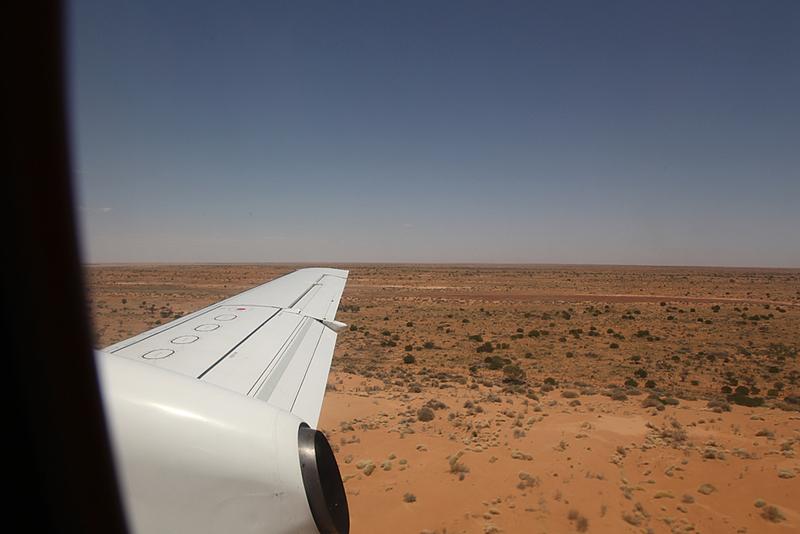 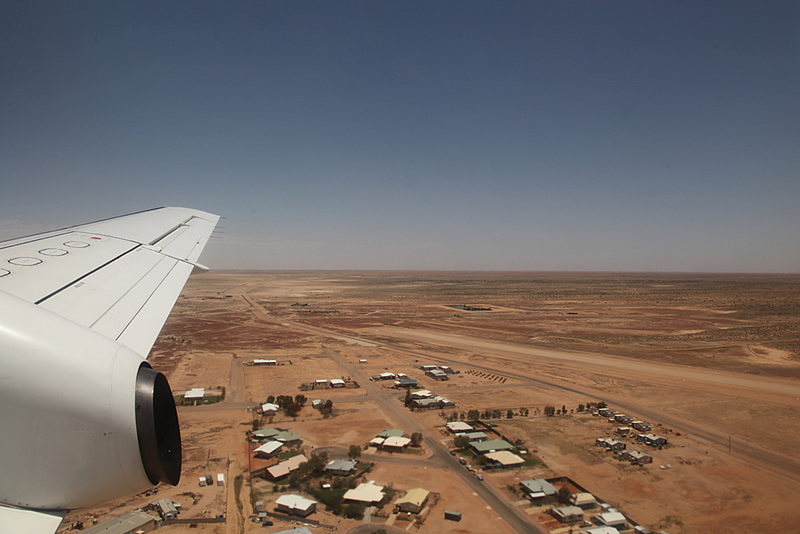 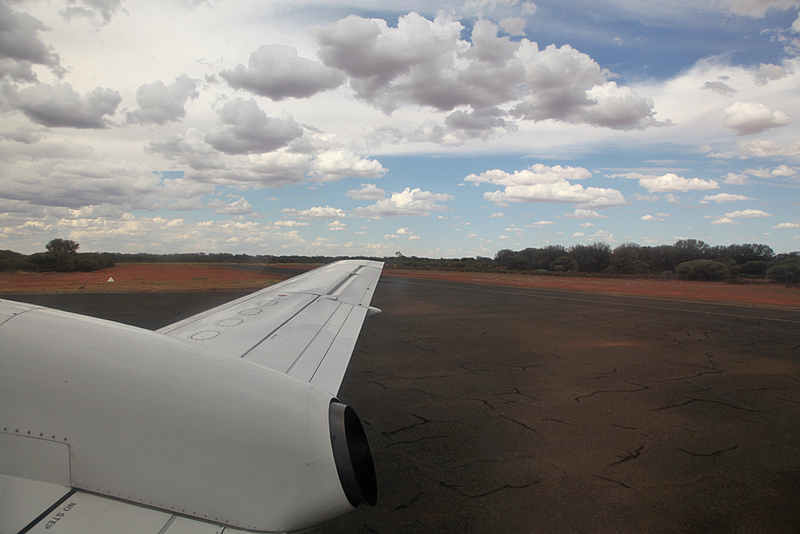 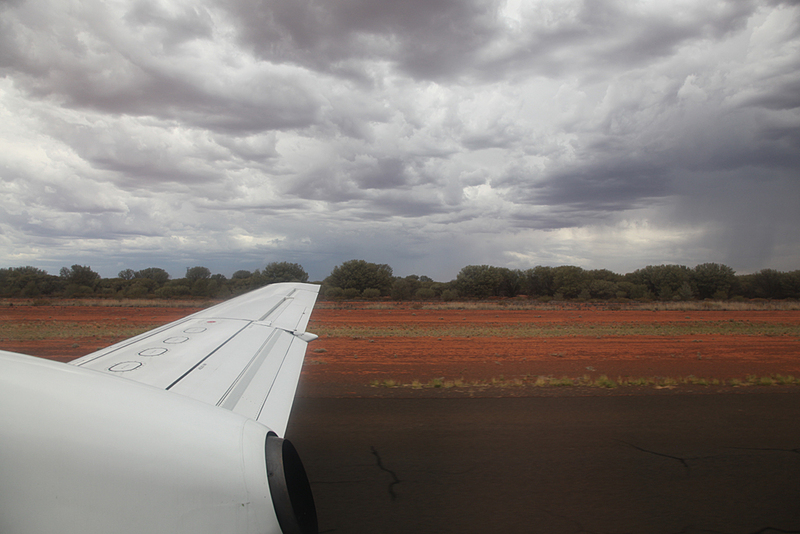 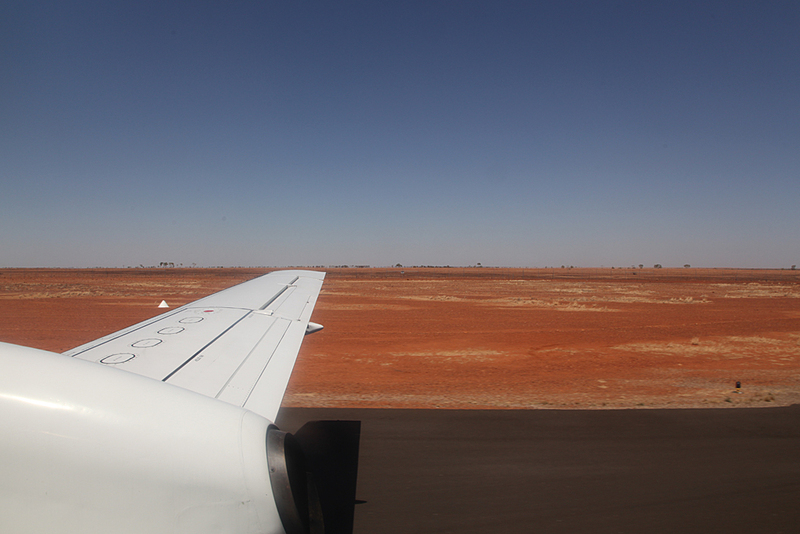 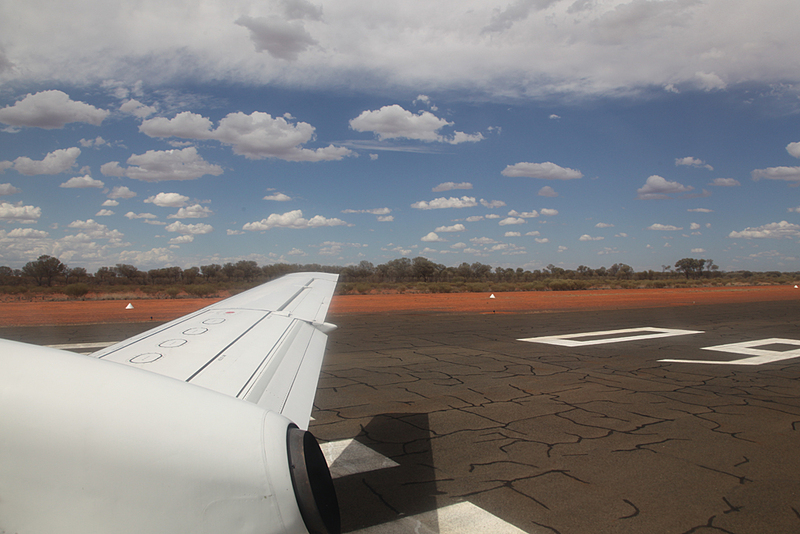 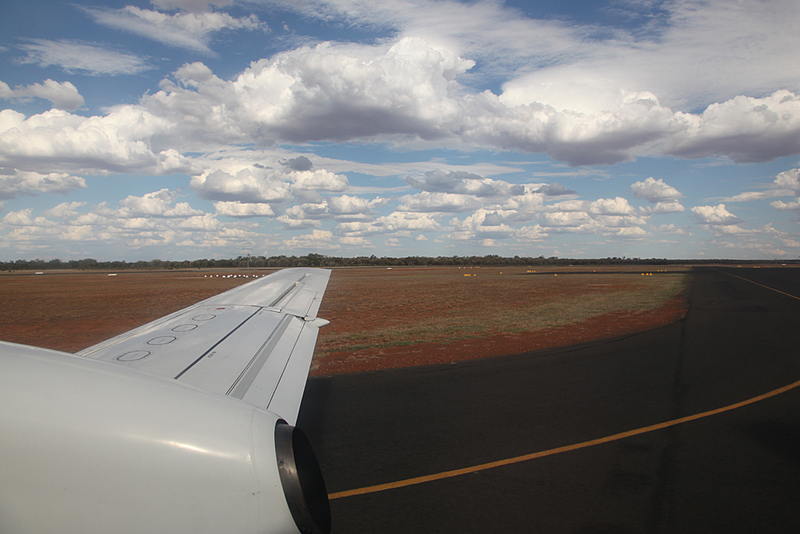 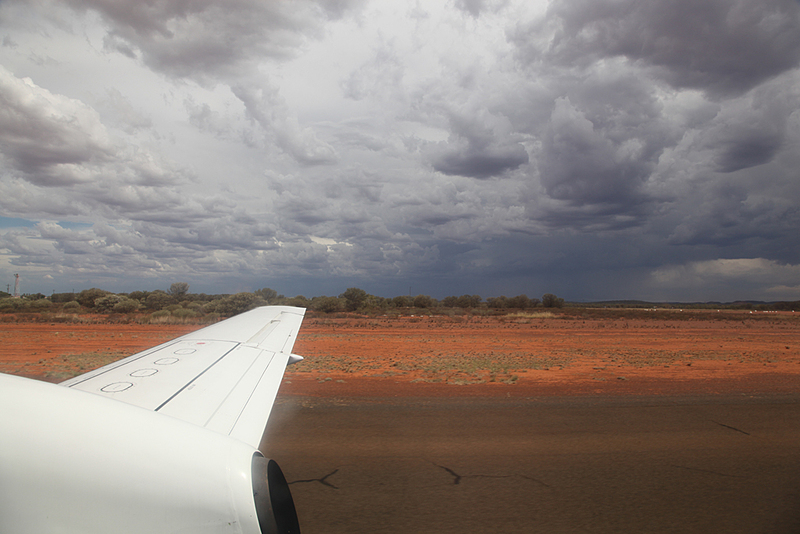 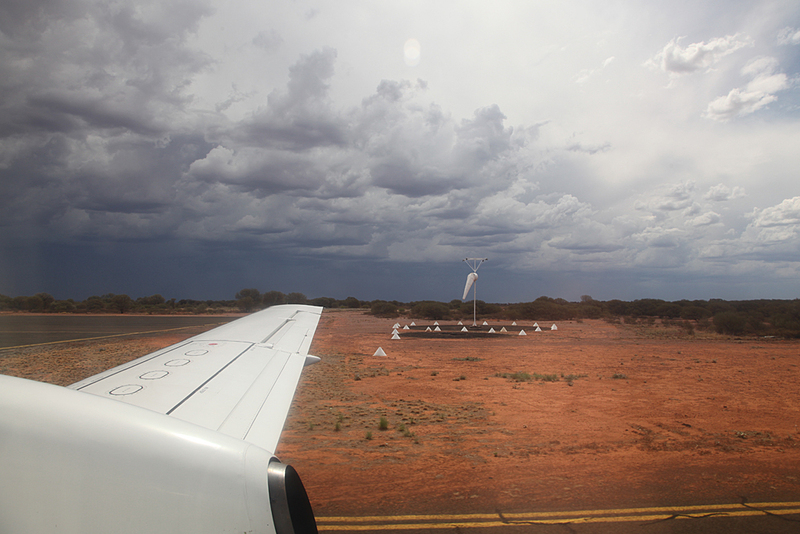 Landed in birdsville to pick up freight only. 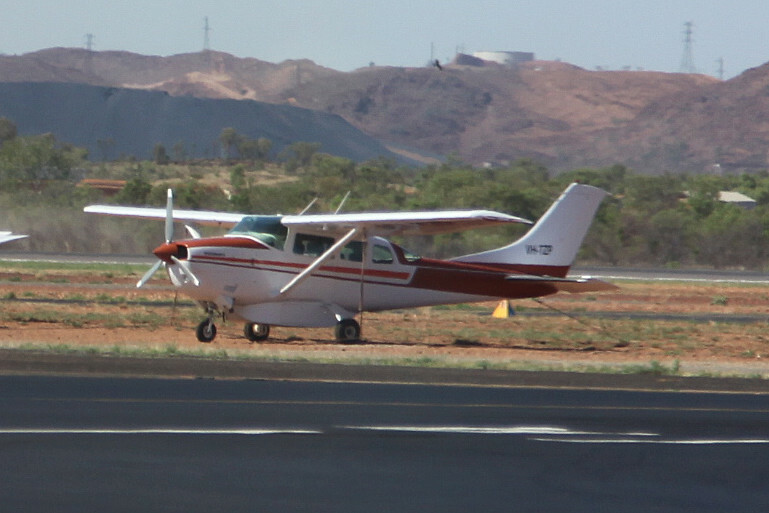 Wrights Air Cessna 210 visiting from William Creek. 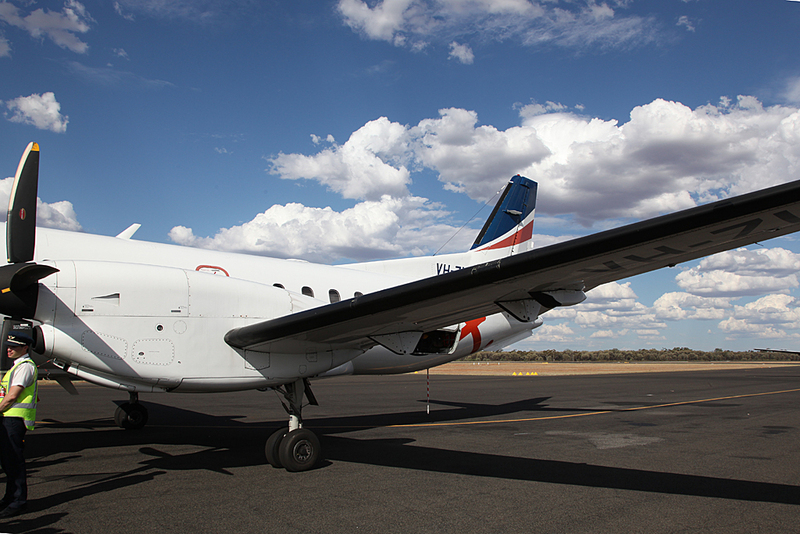 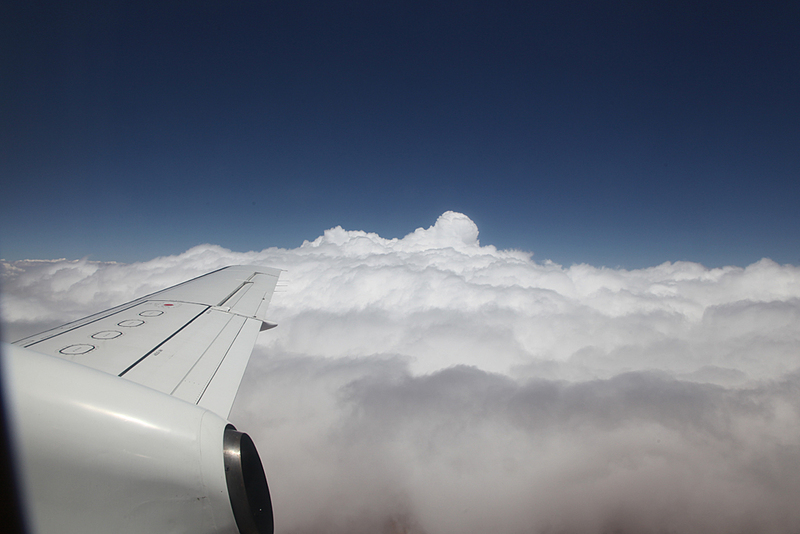 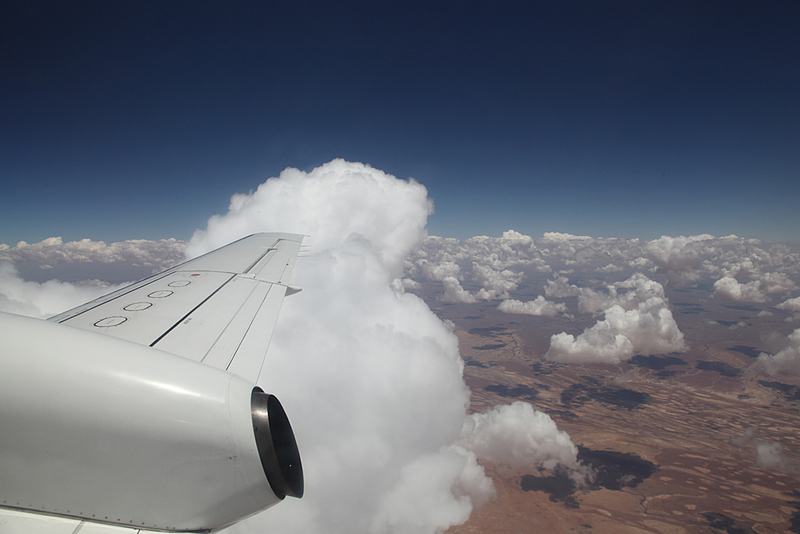 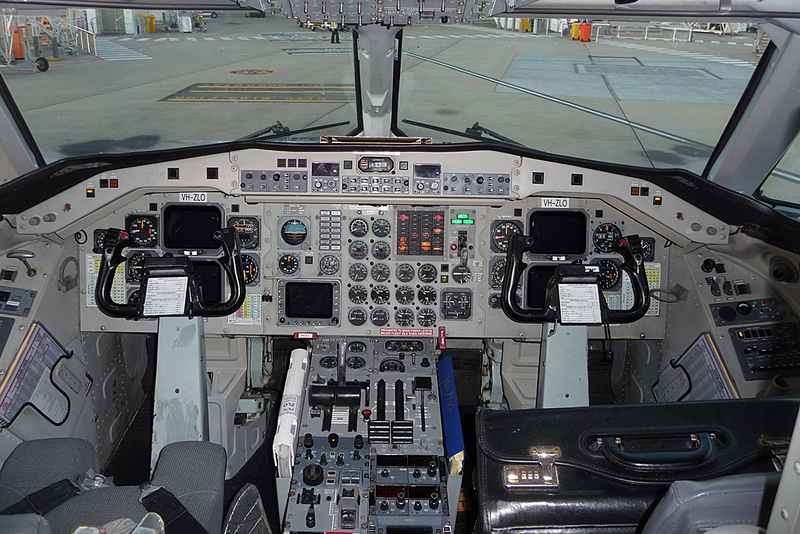 Royal Flying Doctor Service Beech 200. 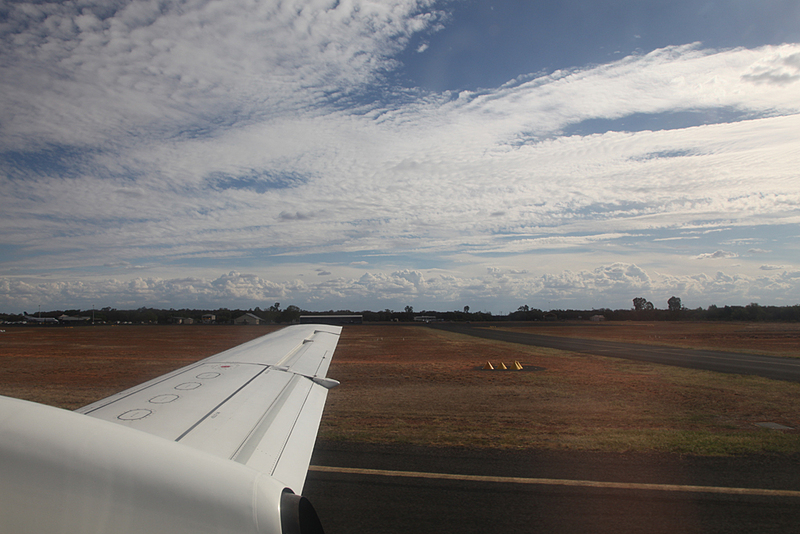 Took off for Windorah, a bit choppy in places. 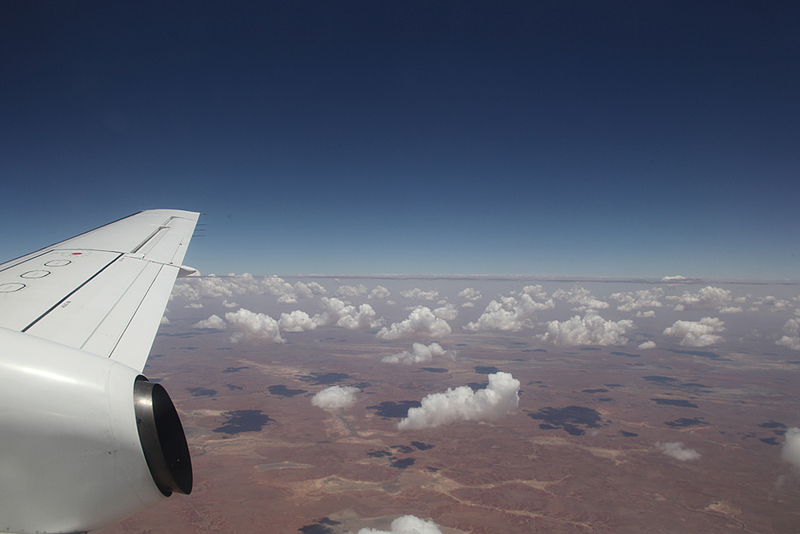 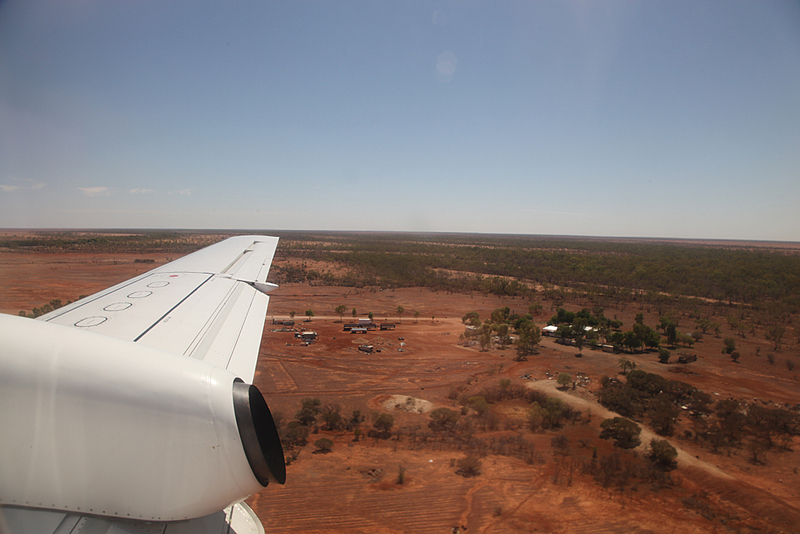 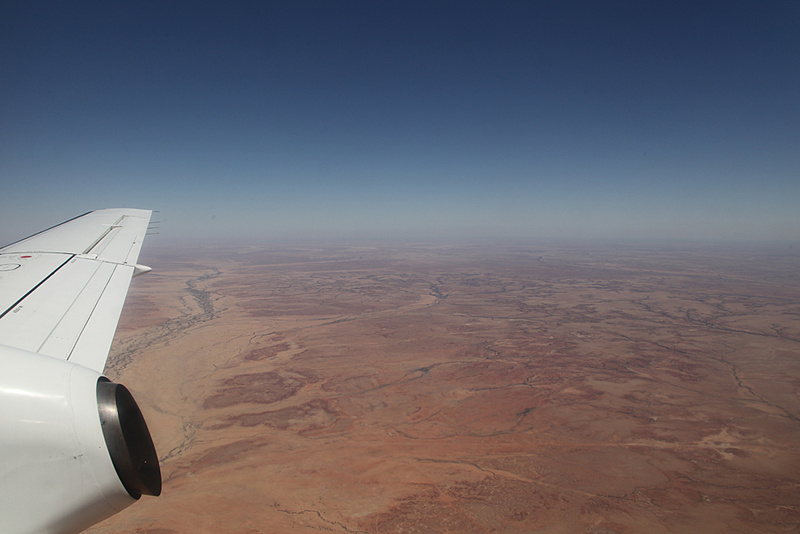 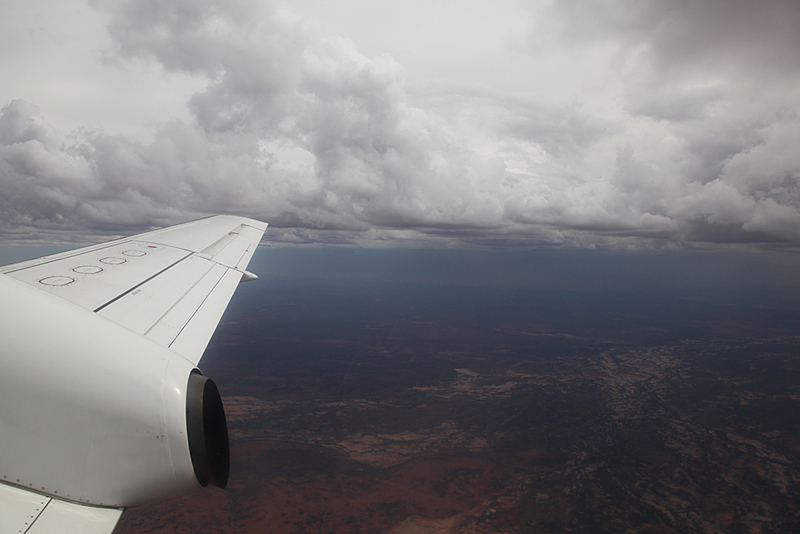 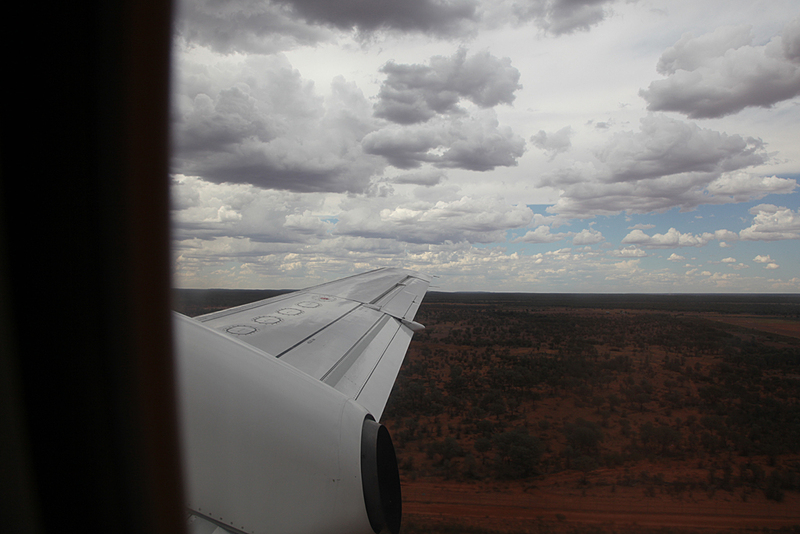 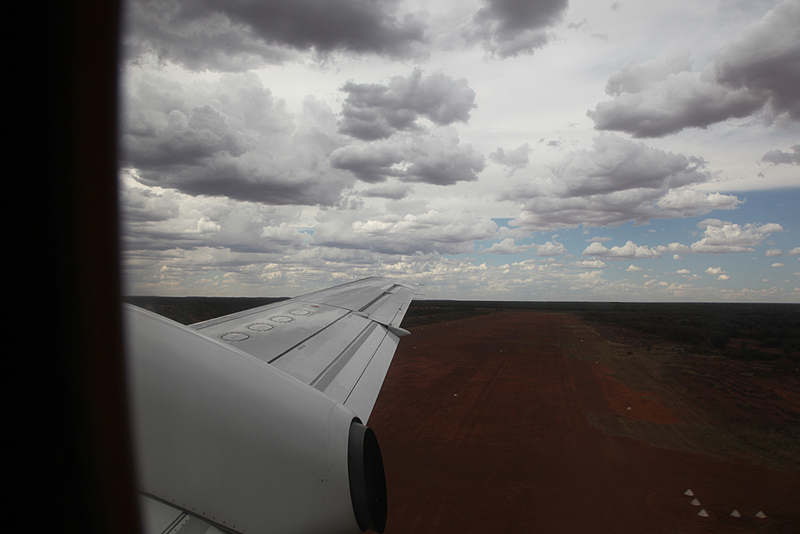 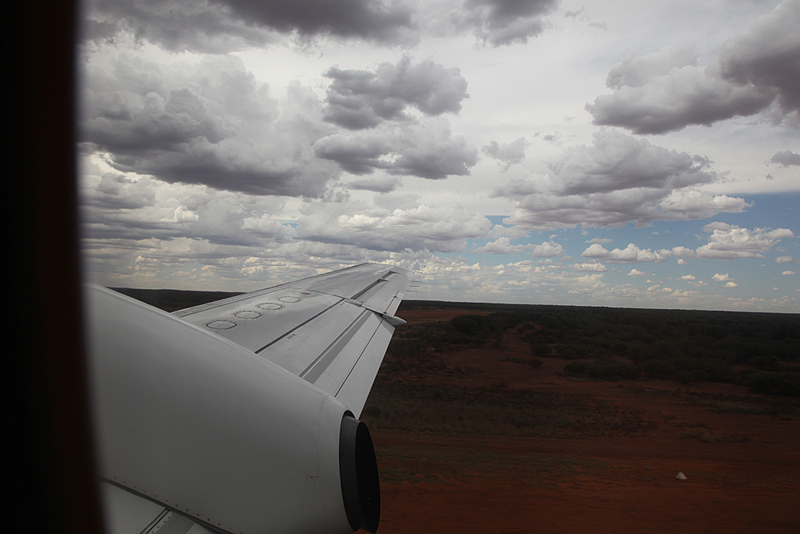 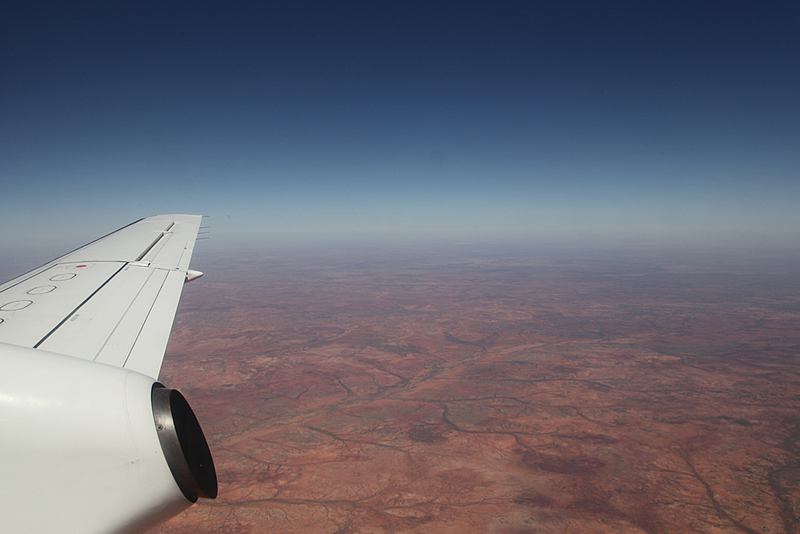 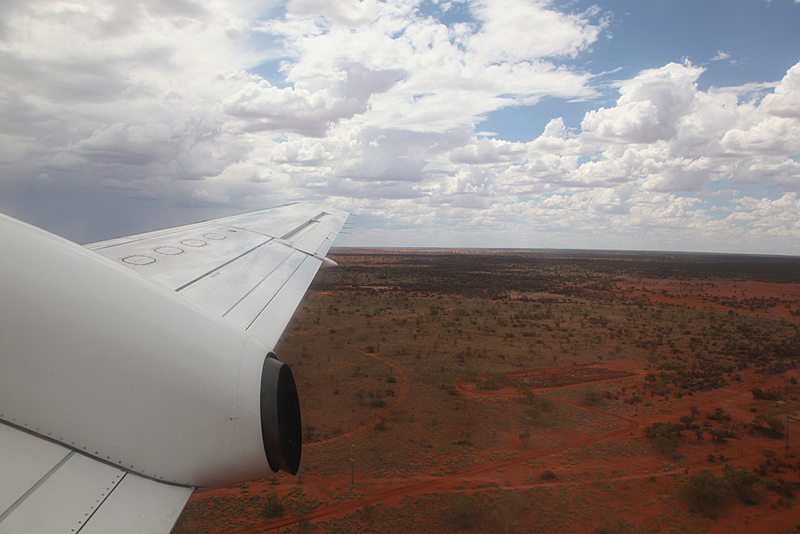 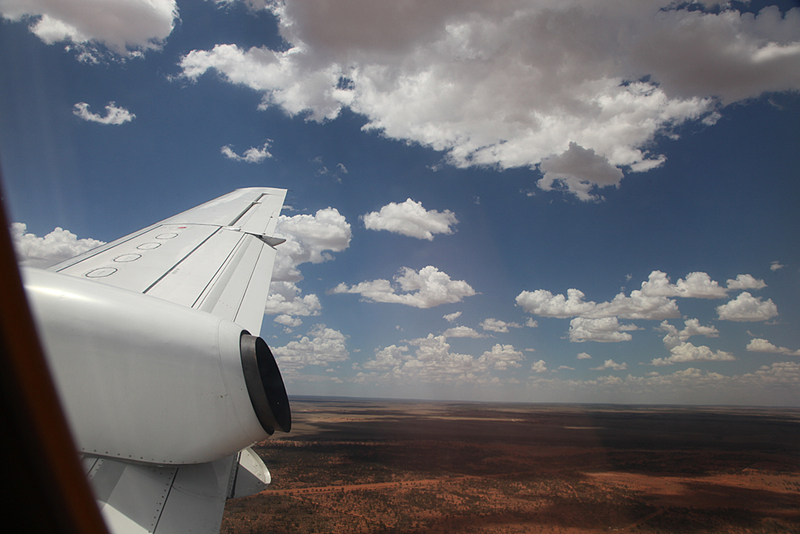 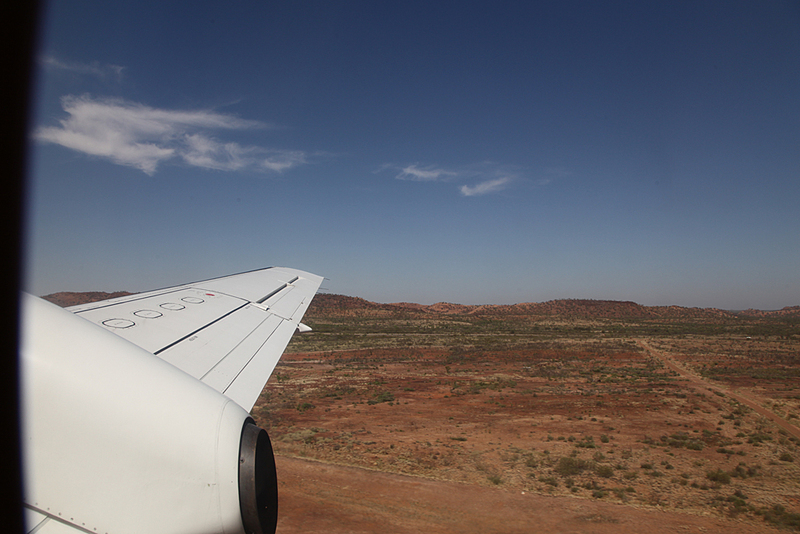 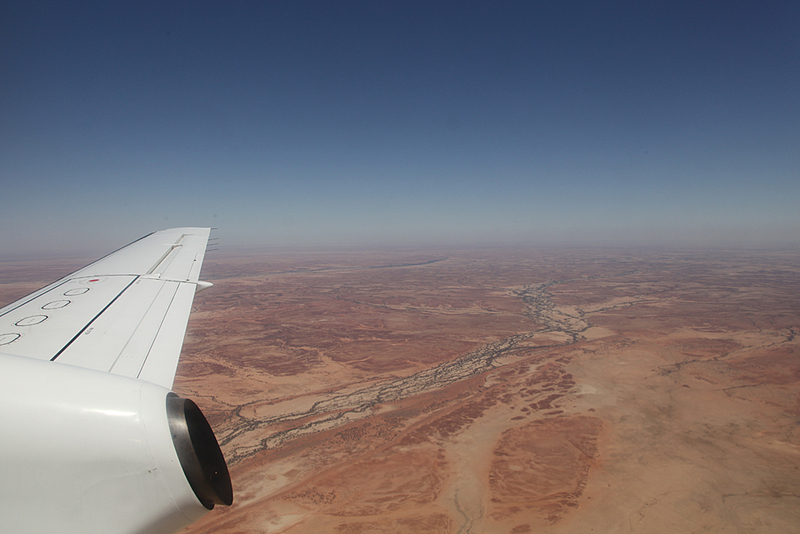 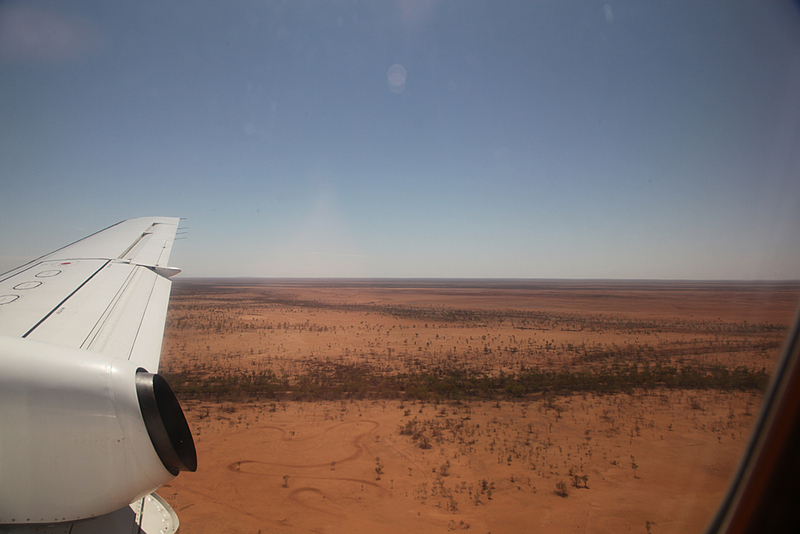 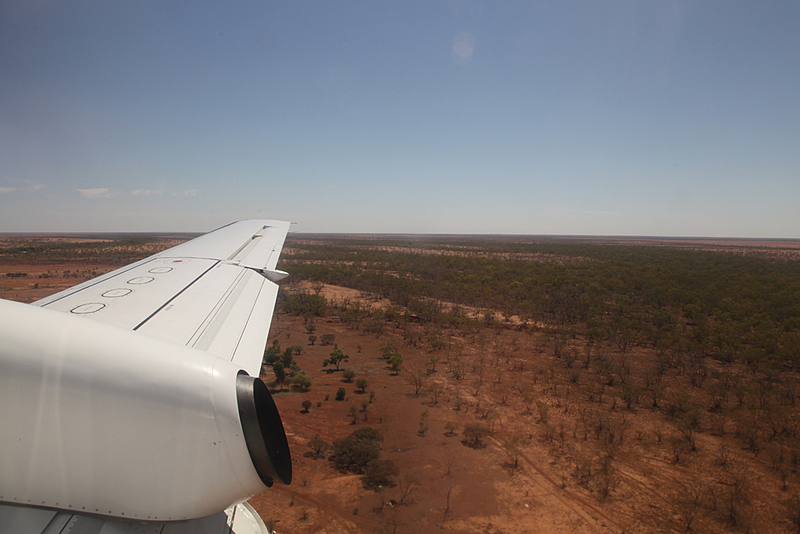 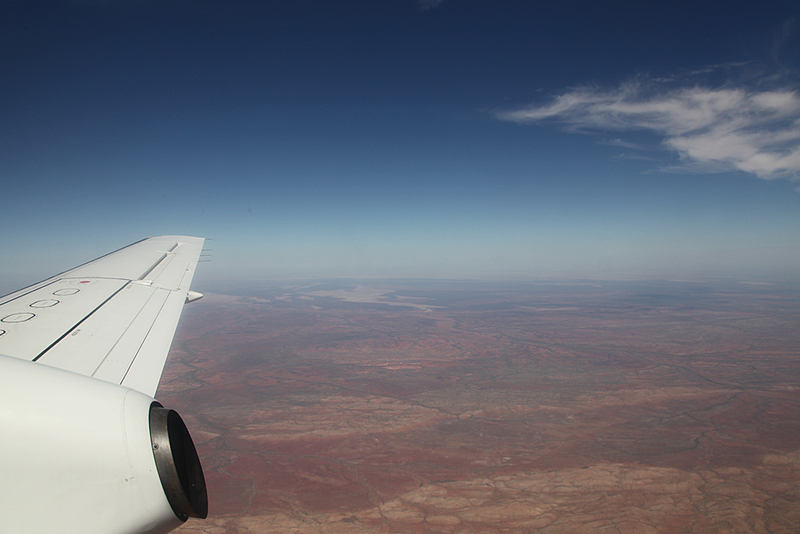 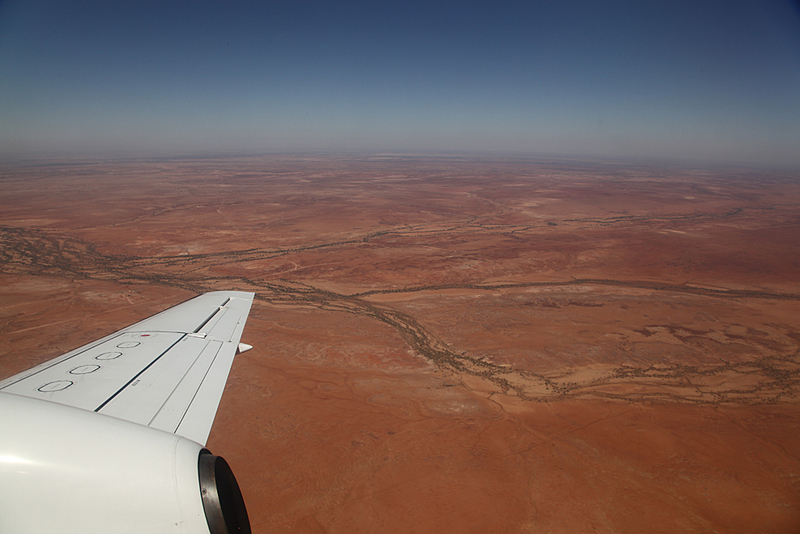 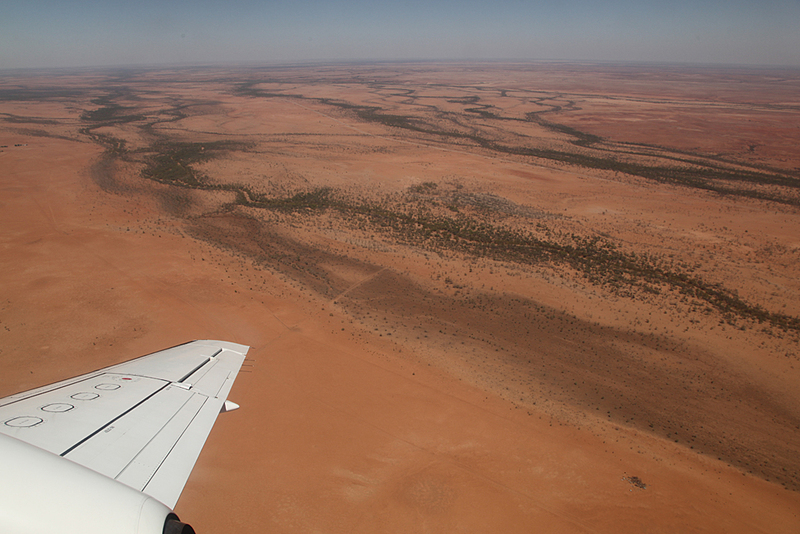 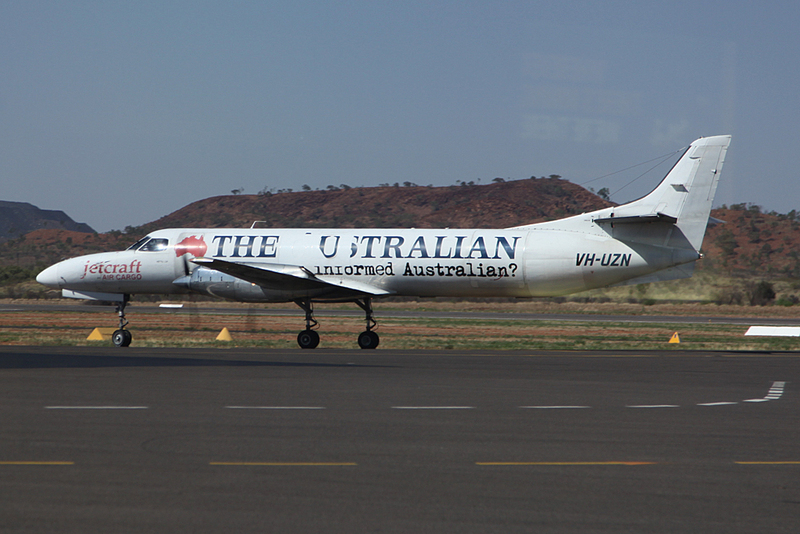 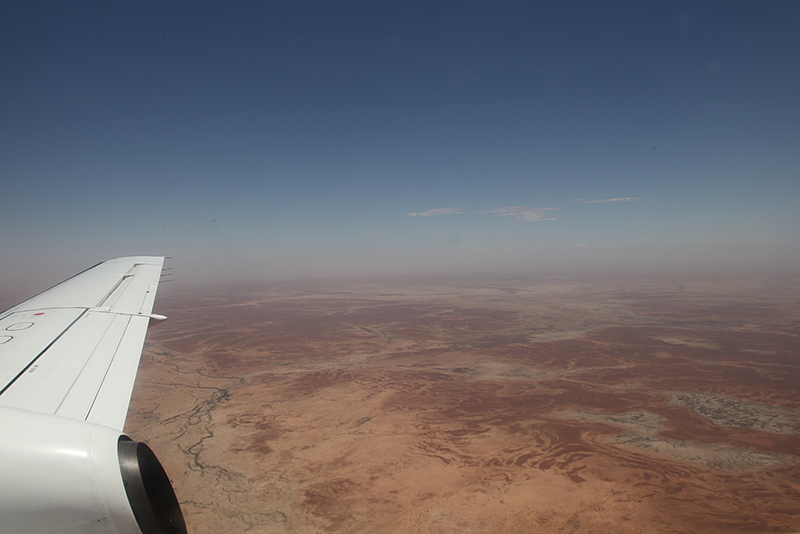 Originally we were going to bypass Windorah as there were no passengers or freight to pick up, but it was realized during the earlier stages of the flight that fuel would be needed before we got to Charleville. 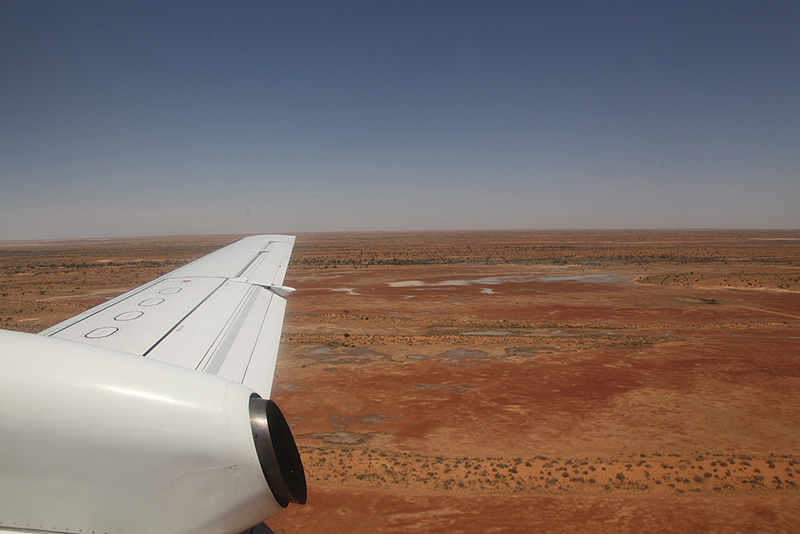 Surprising amount of water out here. 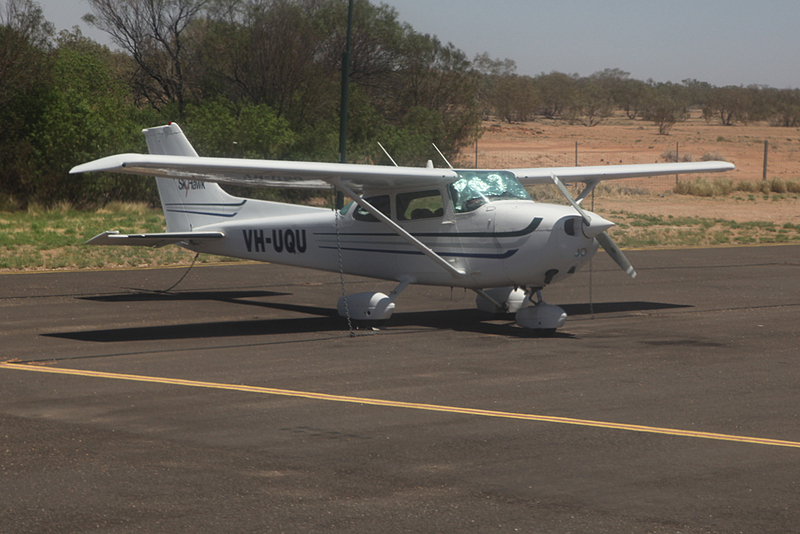 Flight time to Windorah was about 50 minutes. 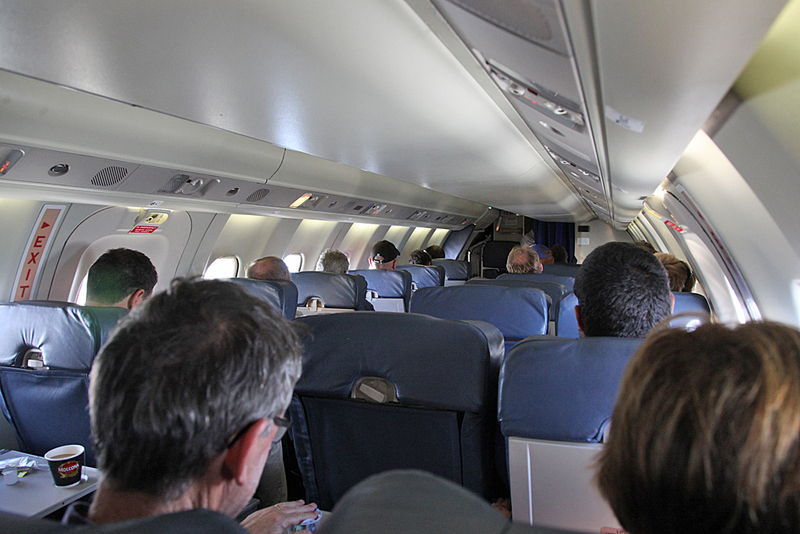 Sweet or savoury snacks were again offered with water. 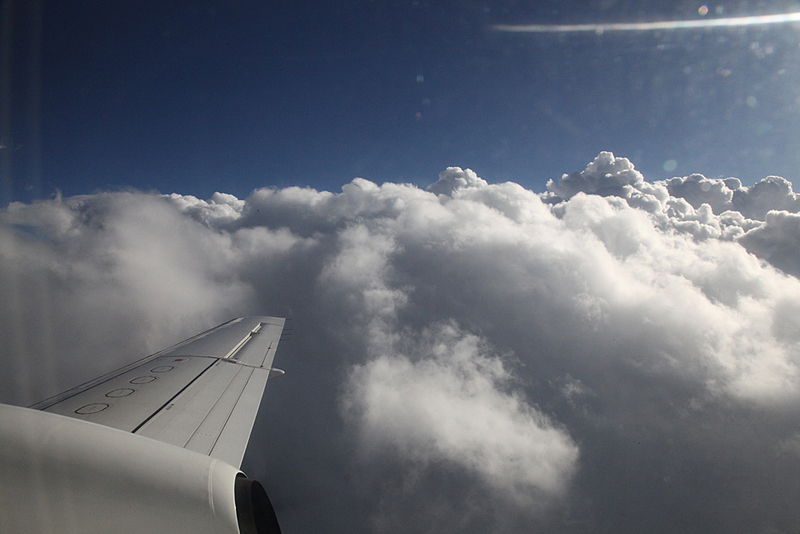 Not much of a sweet tooth so it's the savoury snack every time. 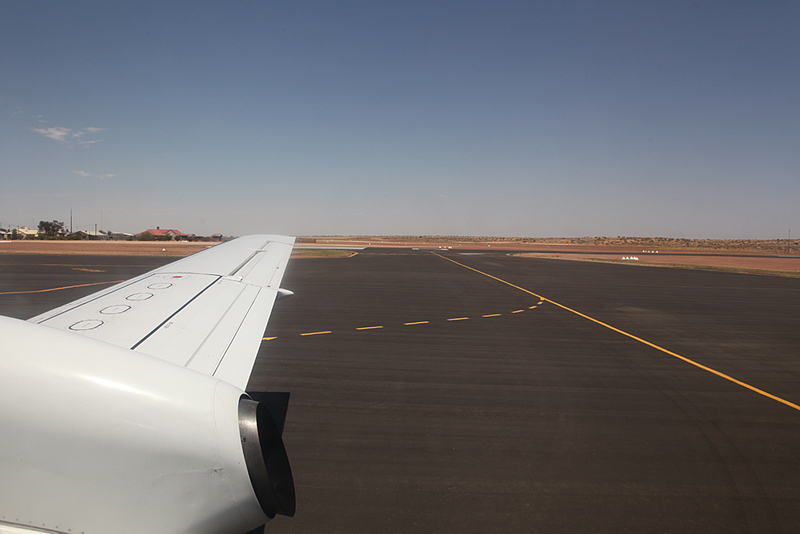 Tea or coffee was also offered on this leg. 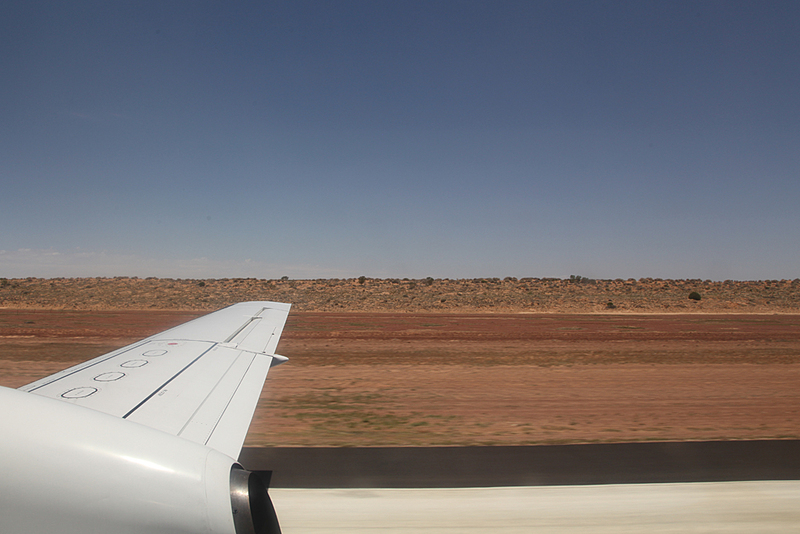 A bumpy approach and landing. 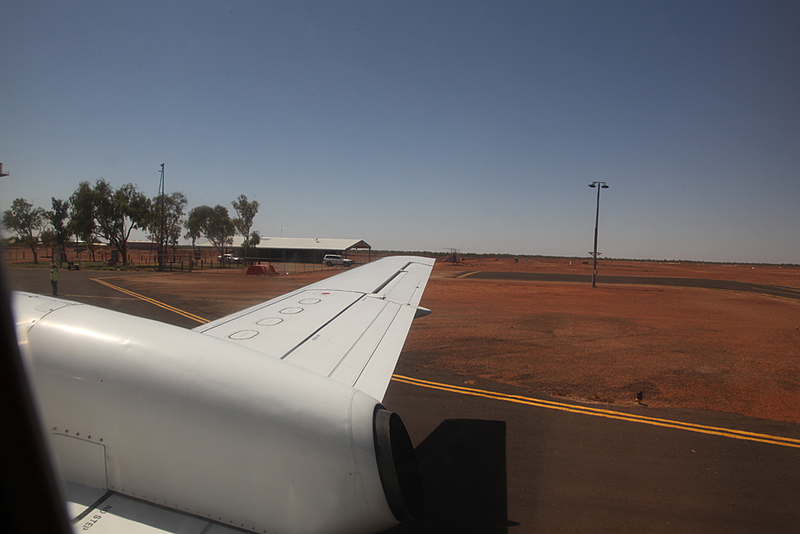 Stop in Windorah was for refueling and some last minute freight was also loaded. 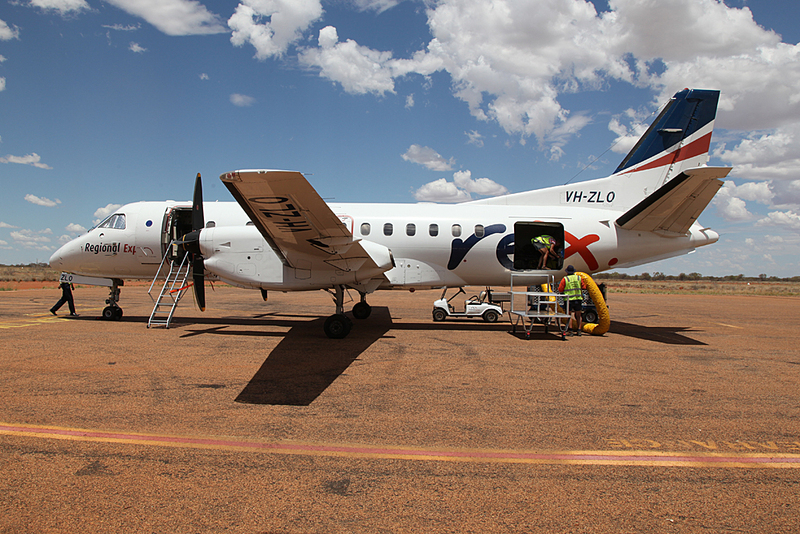 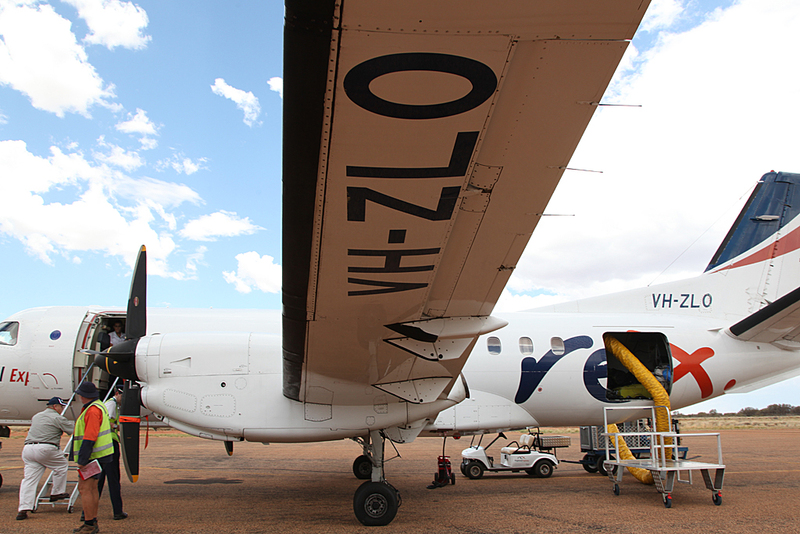 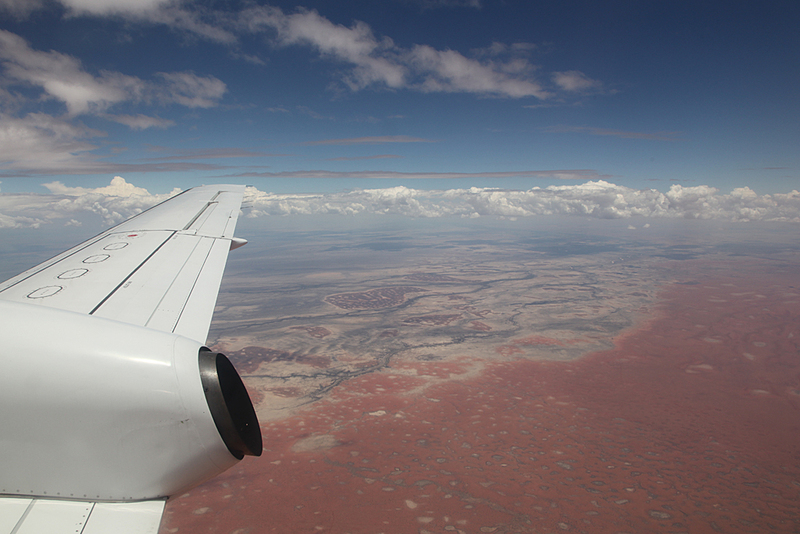 This flight is the only way to get time critical freight like blood samples etc to either Brisbane or Mount Isa. 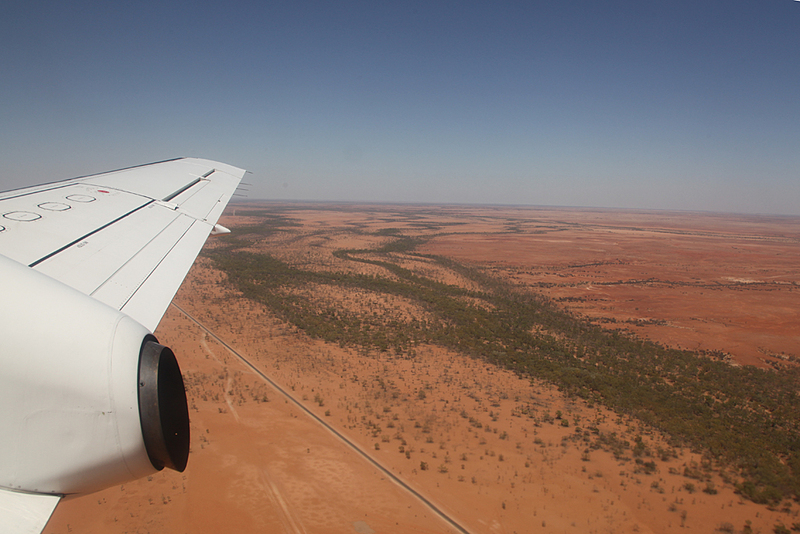 A route like this would not be profitable so is Government subsidised. 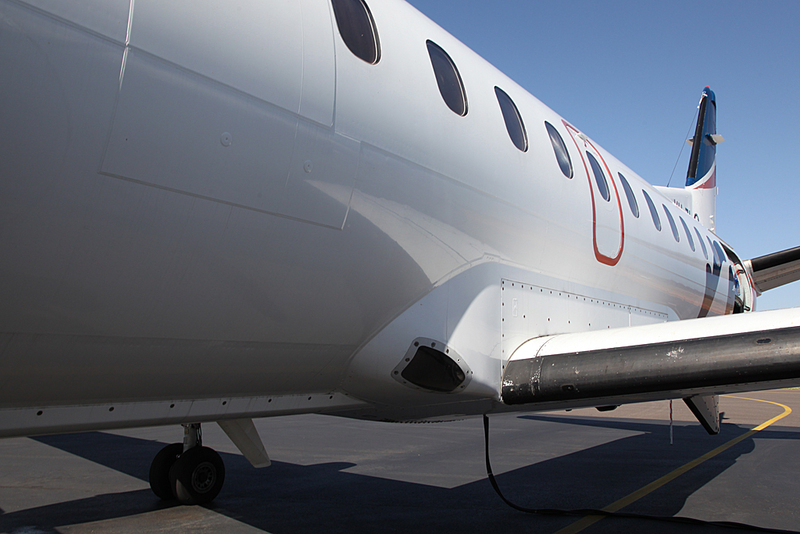 The hose going into the hold is connected to an airconditioner cart that pumps cool air into the cabin during extended stops like this one. 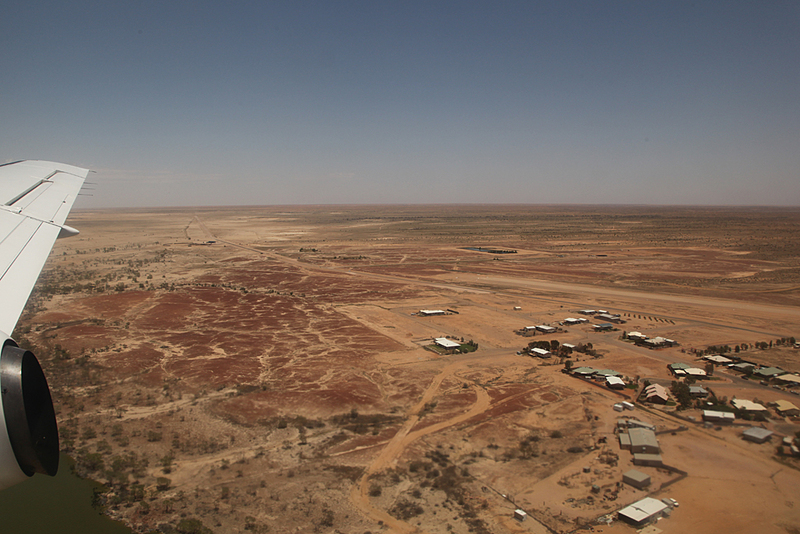 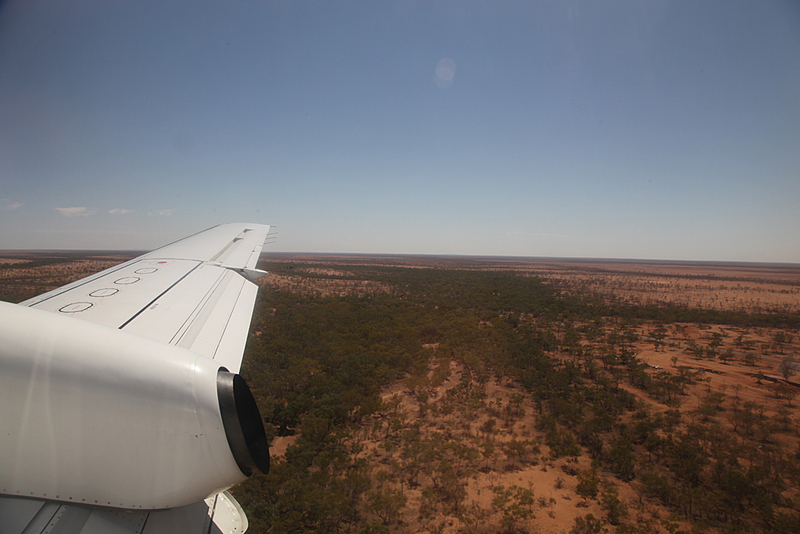 Remember this is the hot arid outback where the summers are ferociously hot. 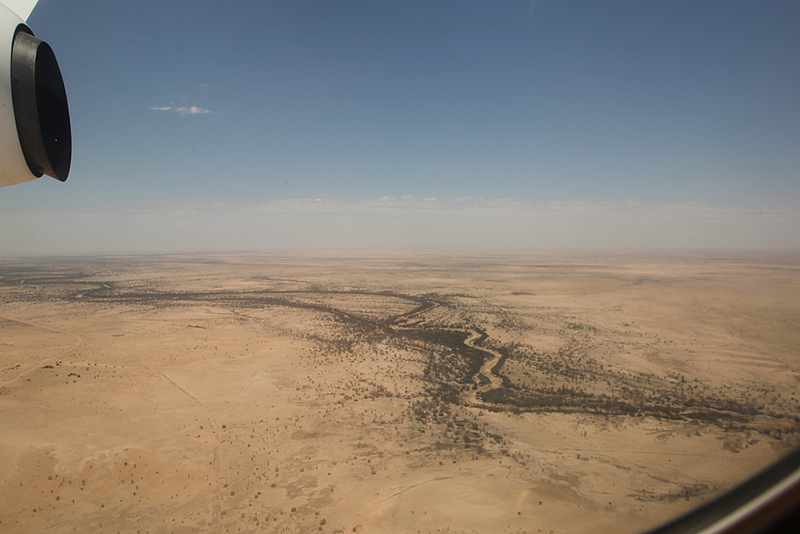 The "I was here" photo. 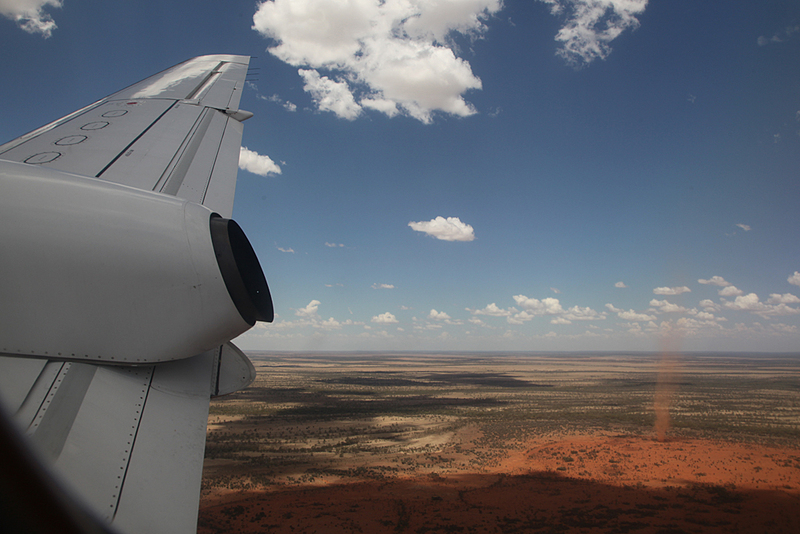 The welcoming party of flies were out to greet us. 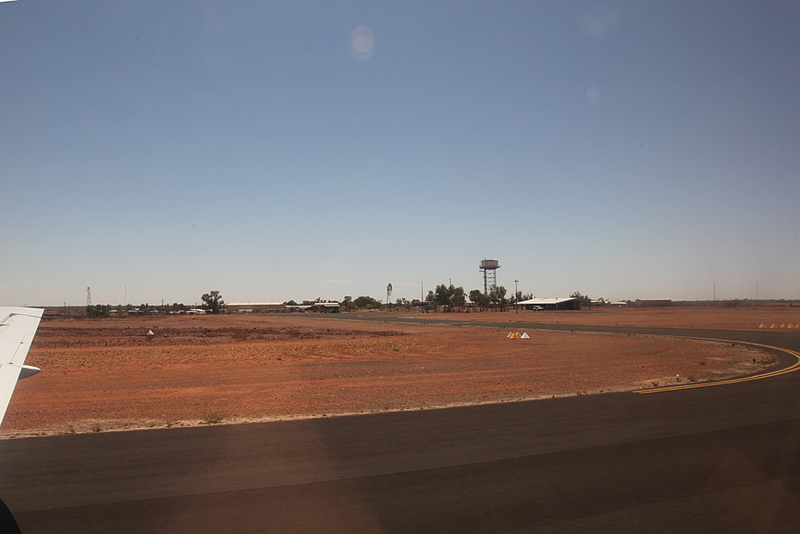 Quite hot in Windorah. 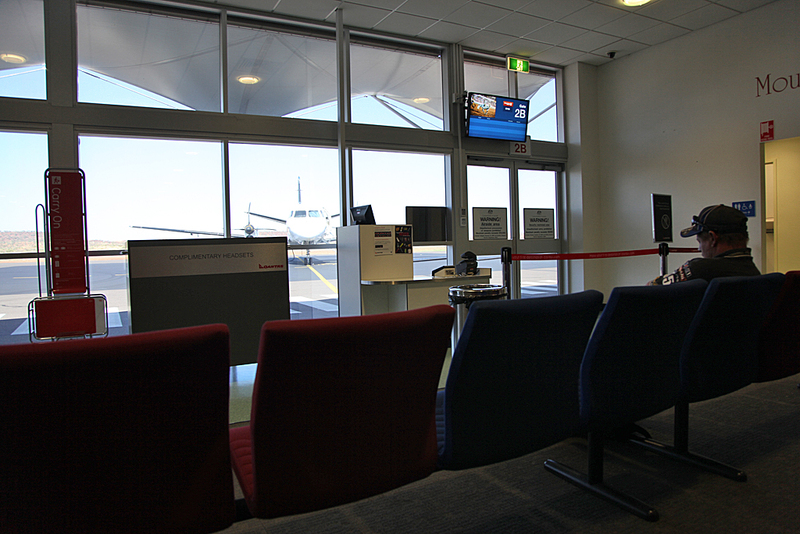 A quick wander around the tiny terminal and a drink. 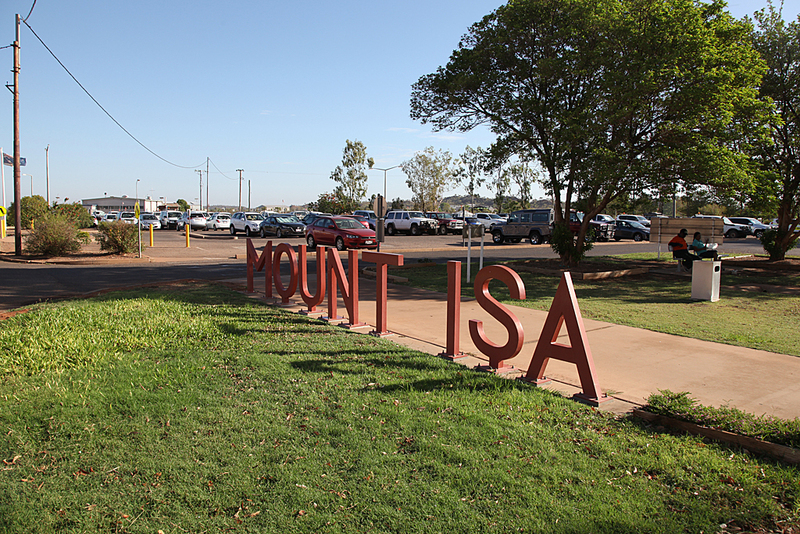 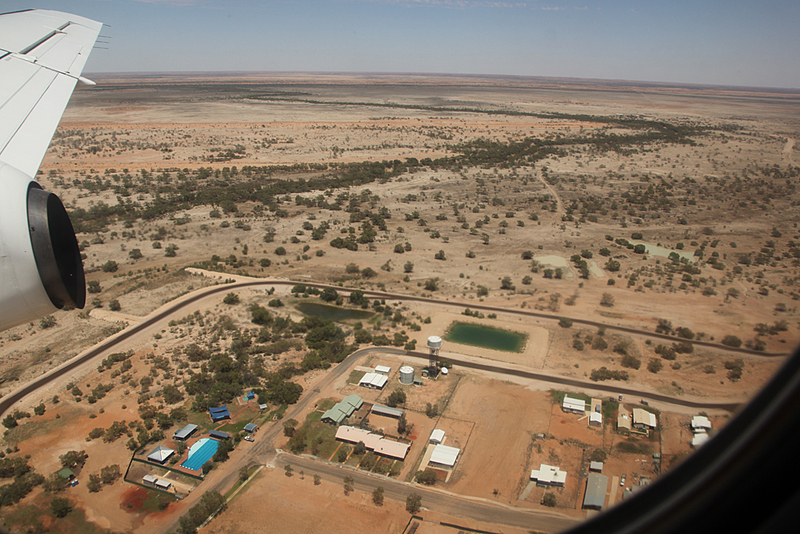 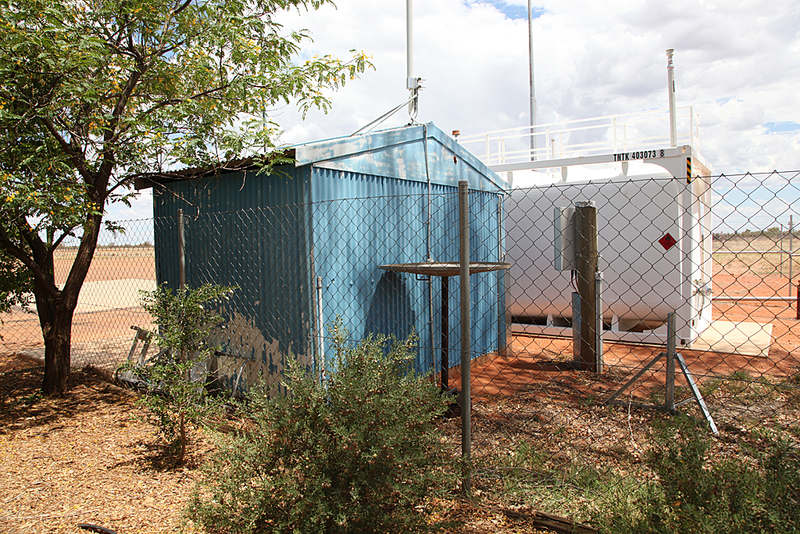 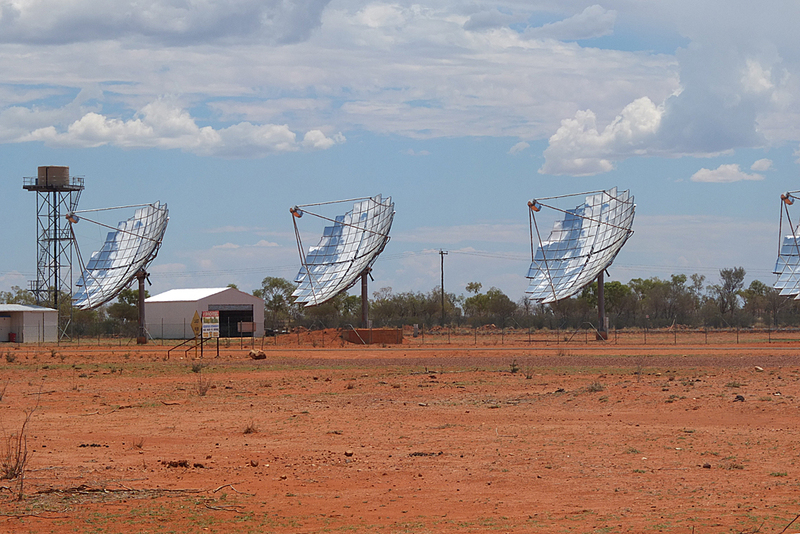 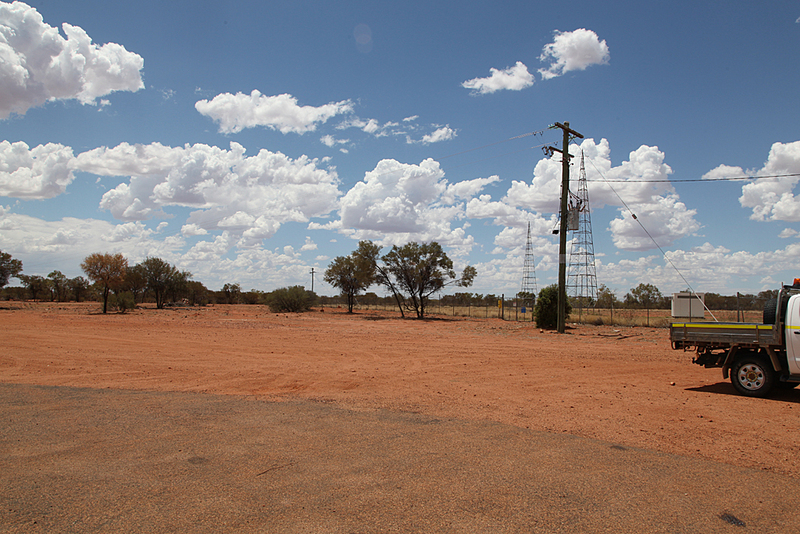 Since Windorah isn't on the main electricity grid, the hardy few people who live here have to rely on a solar power station, as well as a back up diesel generator. 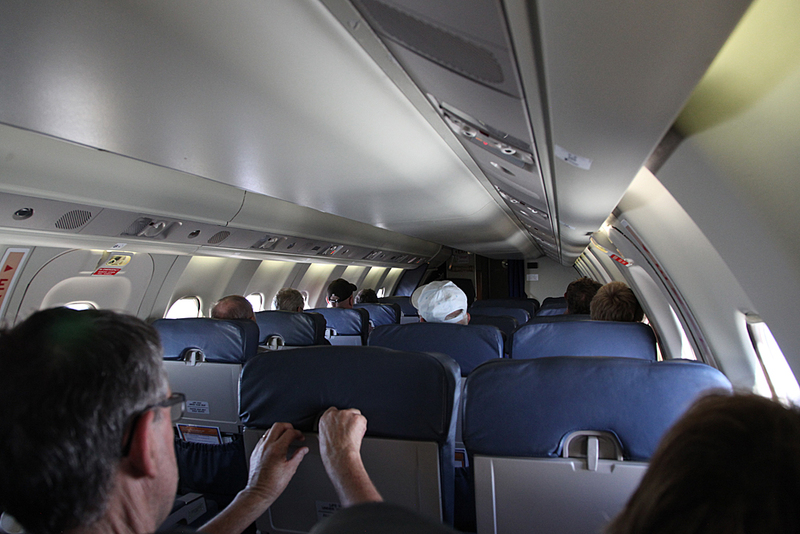 Reboarded the aircraft and since all the shades had been pulled down to keep the cabin cool, it was very dark inside. 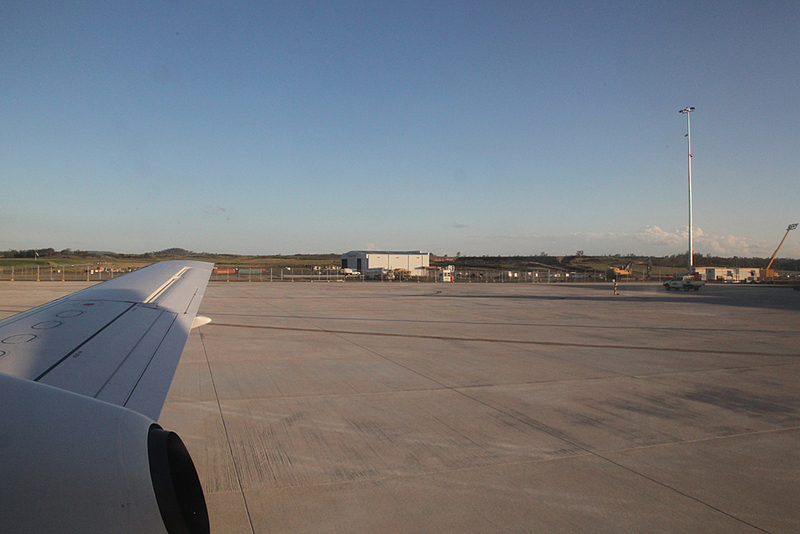 One last look at the terminal. 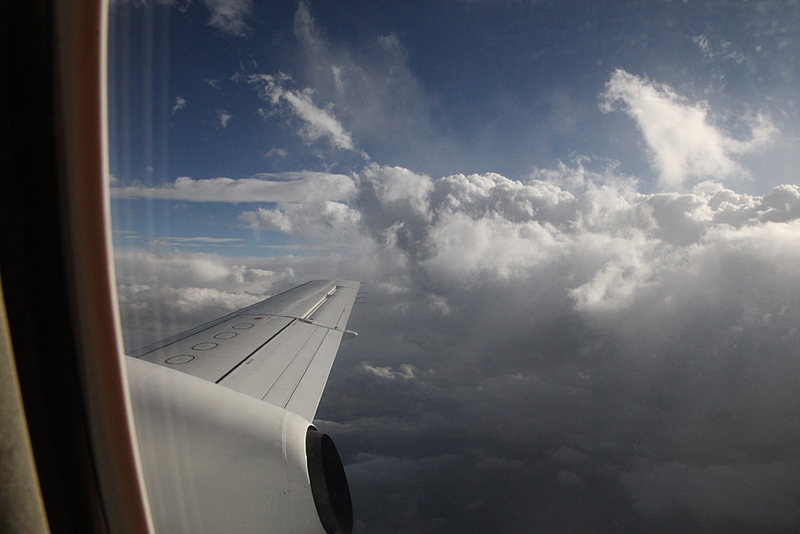 Take off was a tad rough but got real bumpy in the cruise. 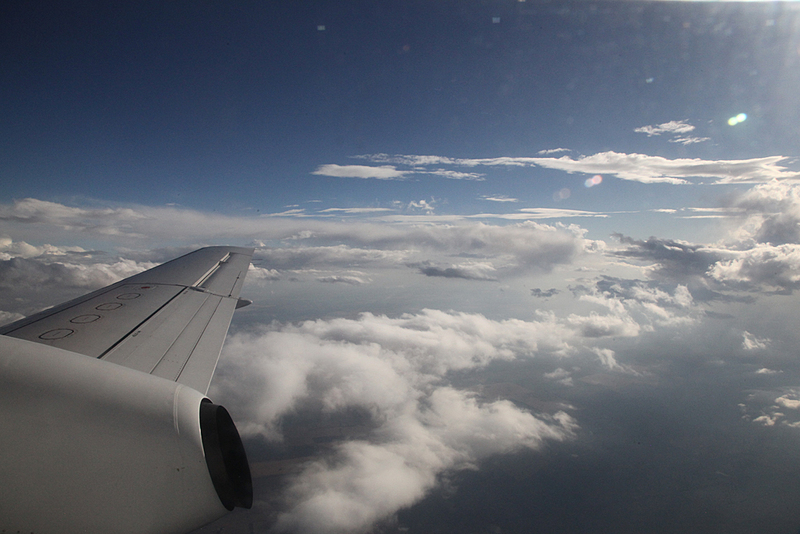 Flight time was 30 minutes. 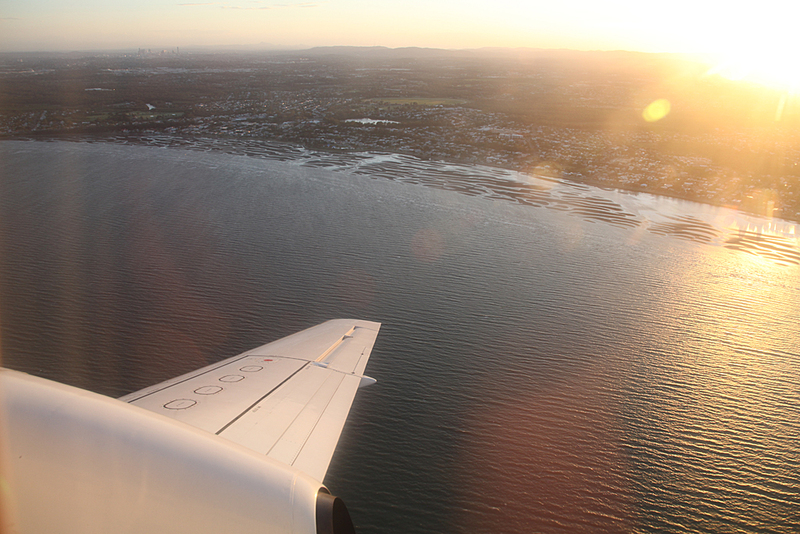 Vack over the Channel Country. 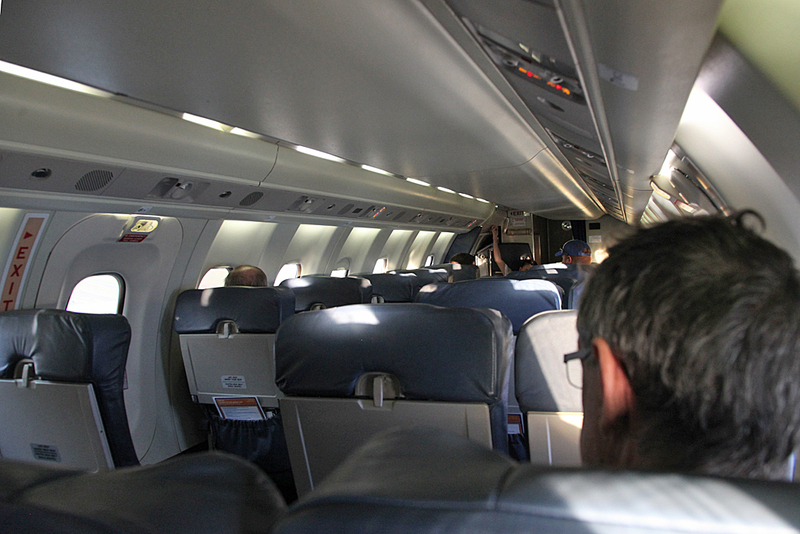 Flight attendant nearly dropped the box of snacks. 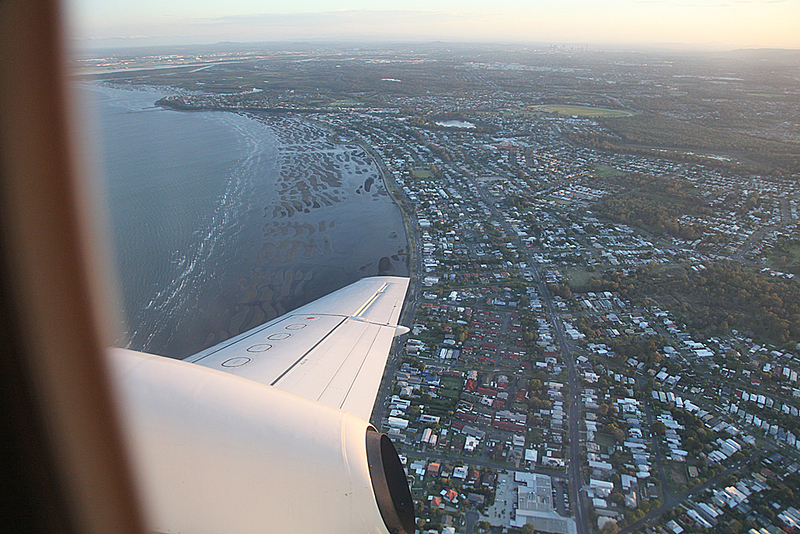 Bit bumpy the approach and landing here. 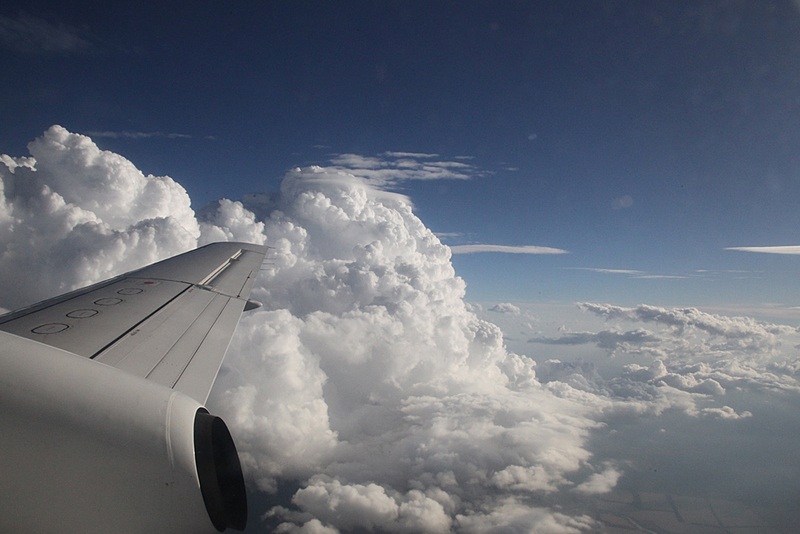 Looks a bit stormy out there. 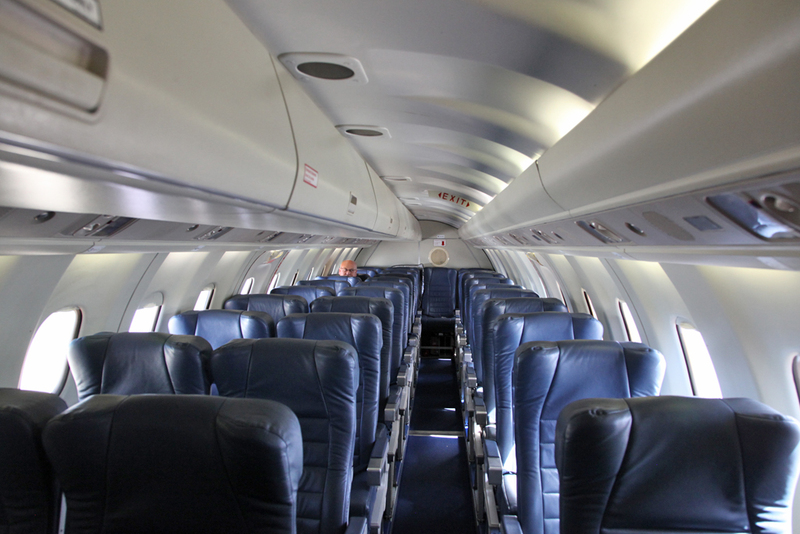 One passenger got off and about 10 got on. 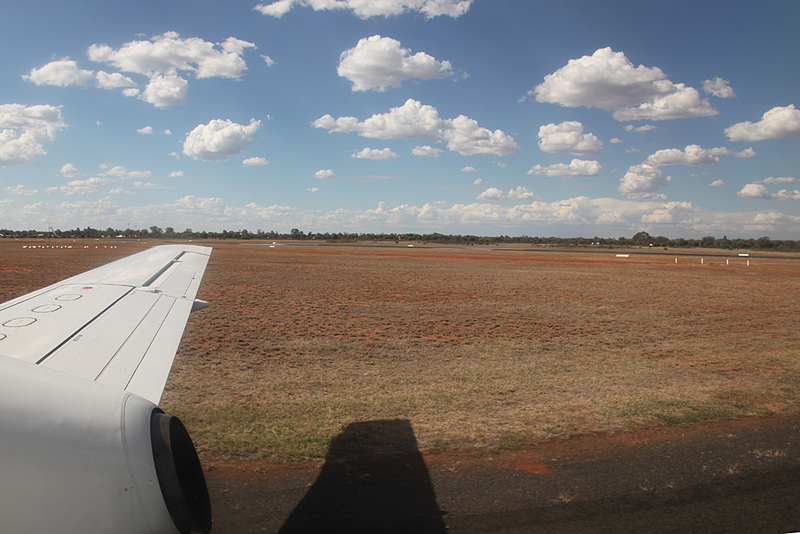 Starting to fill up. 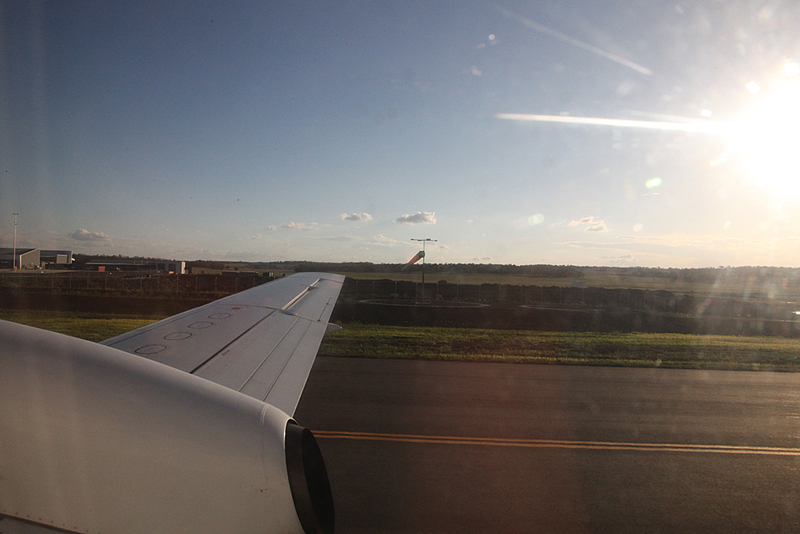 Take off wasn't too bad but a bit bumpy in the air. 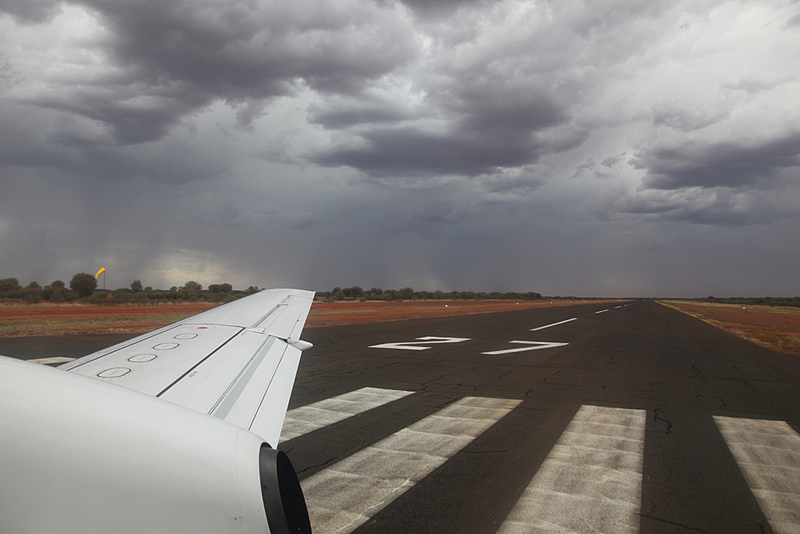 Lets get out of here before that storm hits. 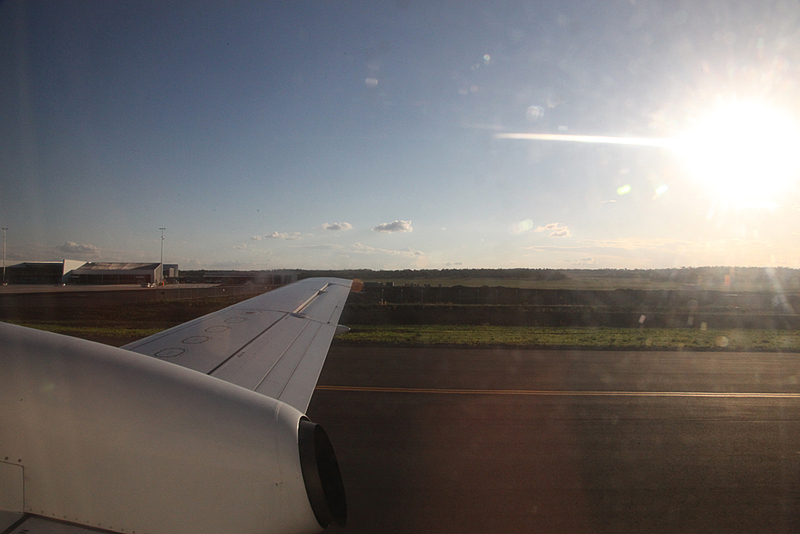 Flight time about 28 minutes. 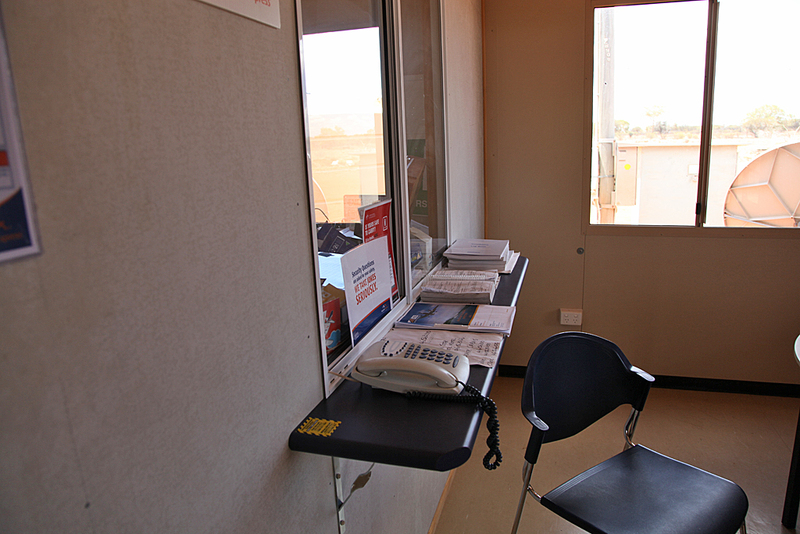 Same snacks and water offered. 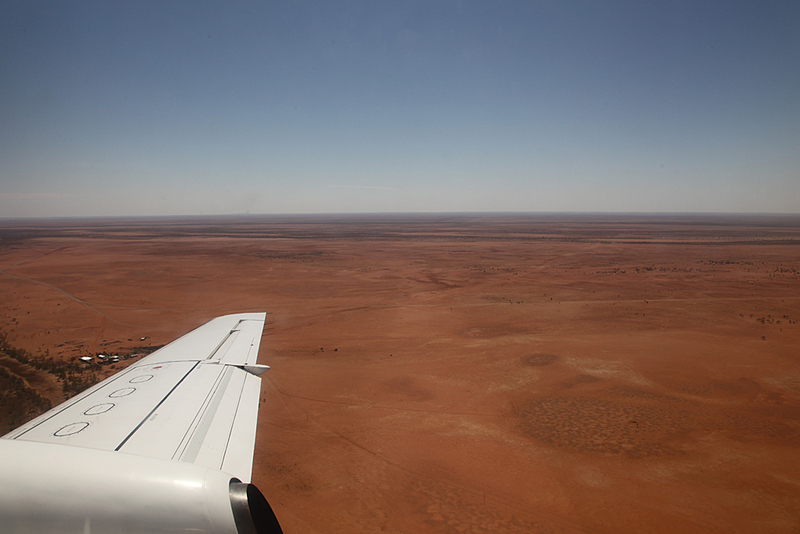 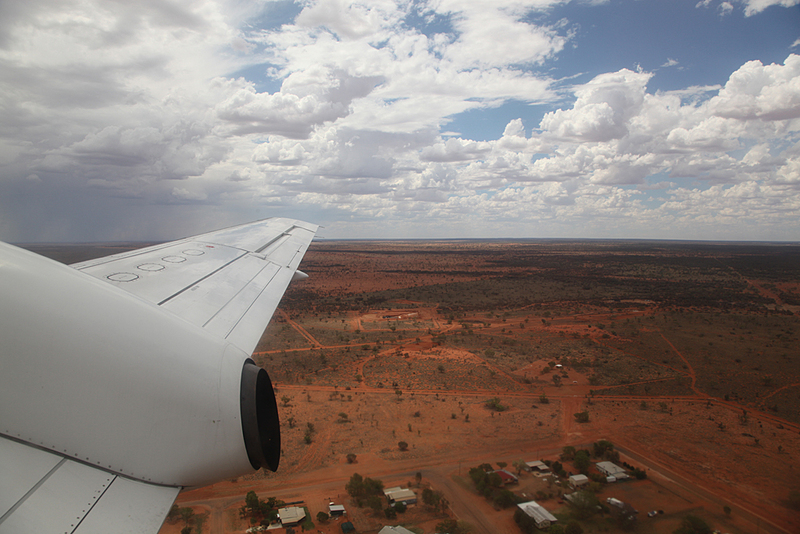 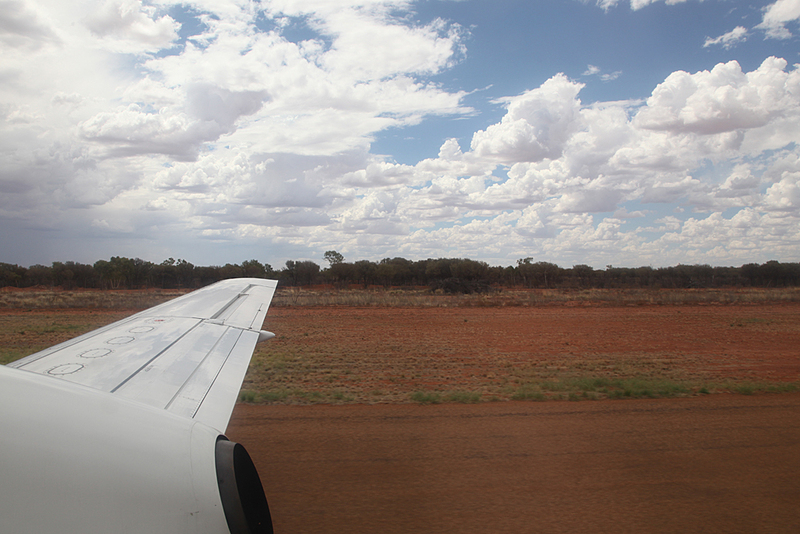 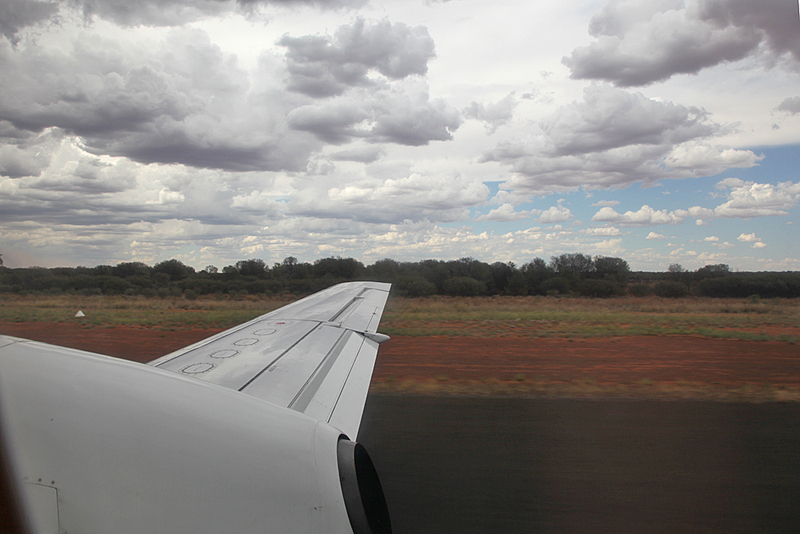 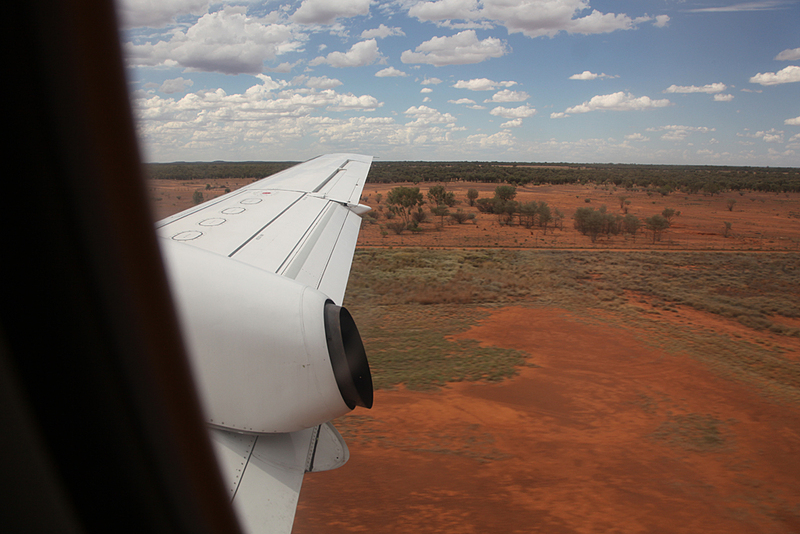 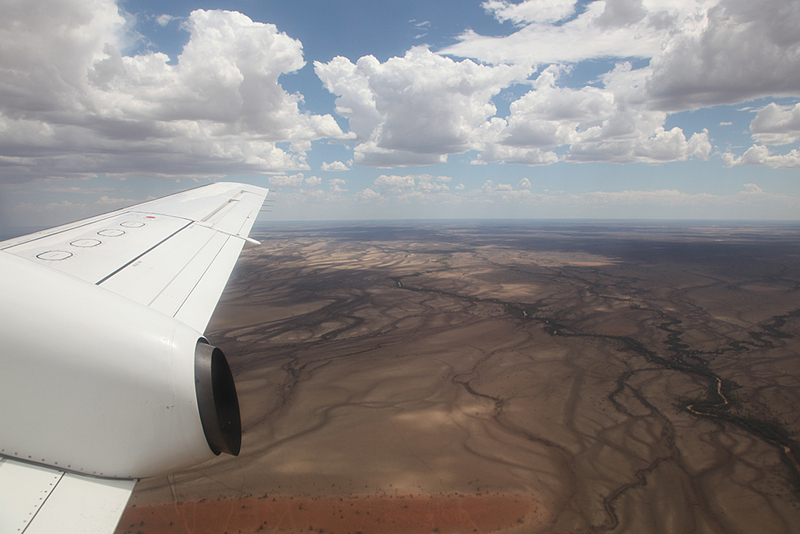 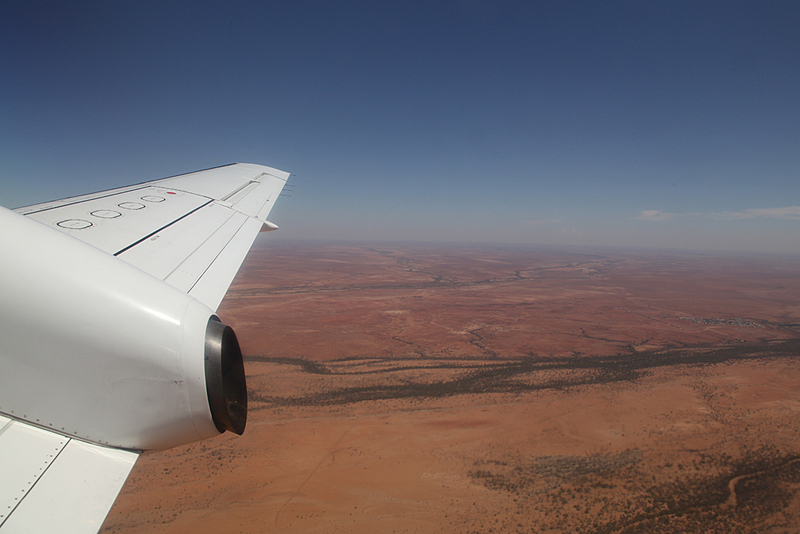 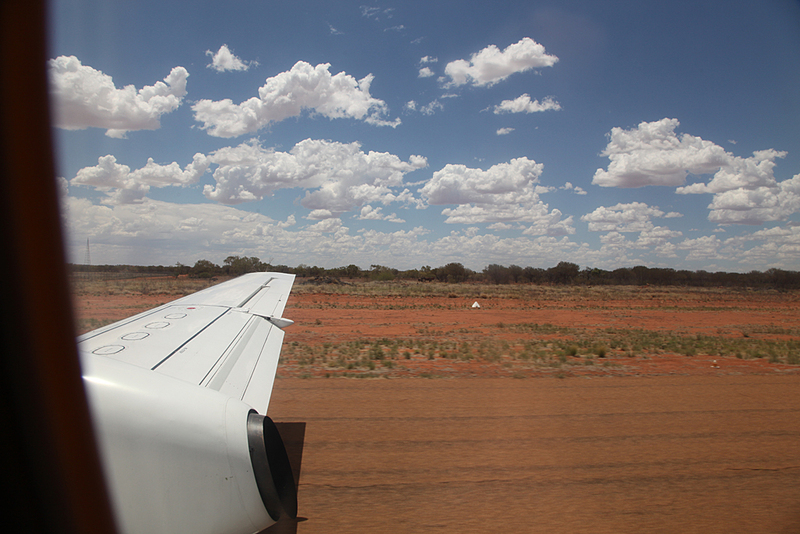 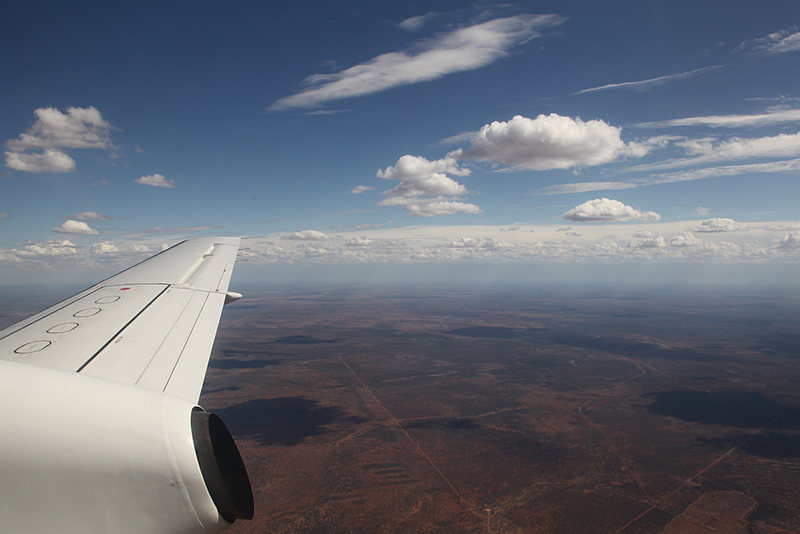 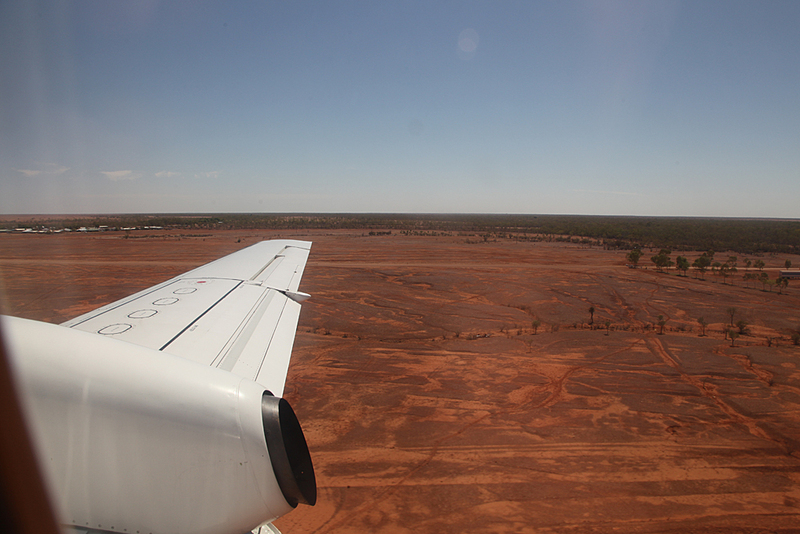 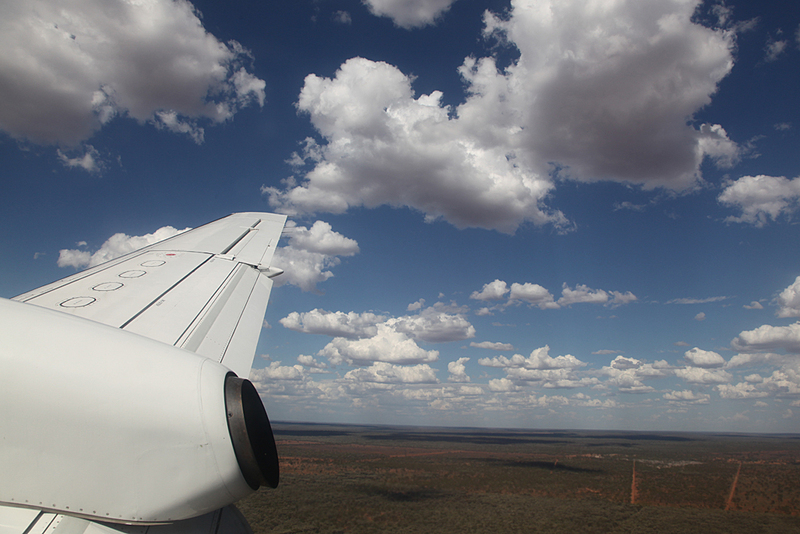 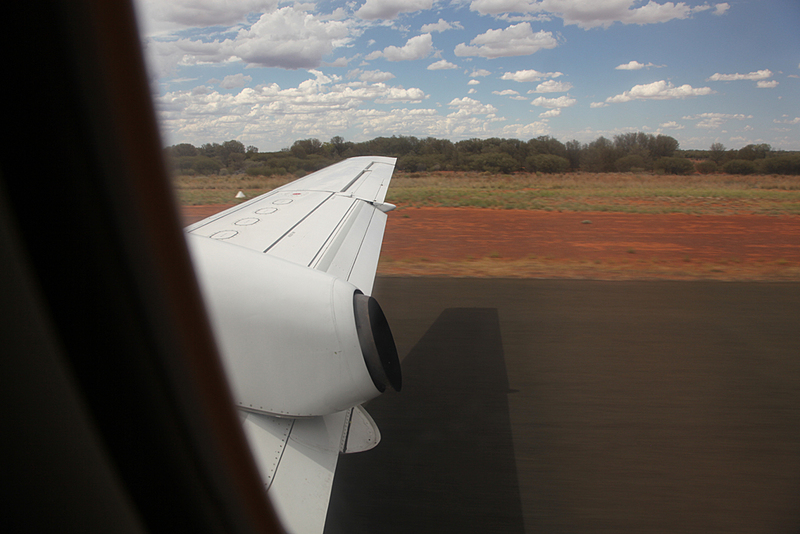 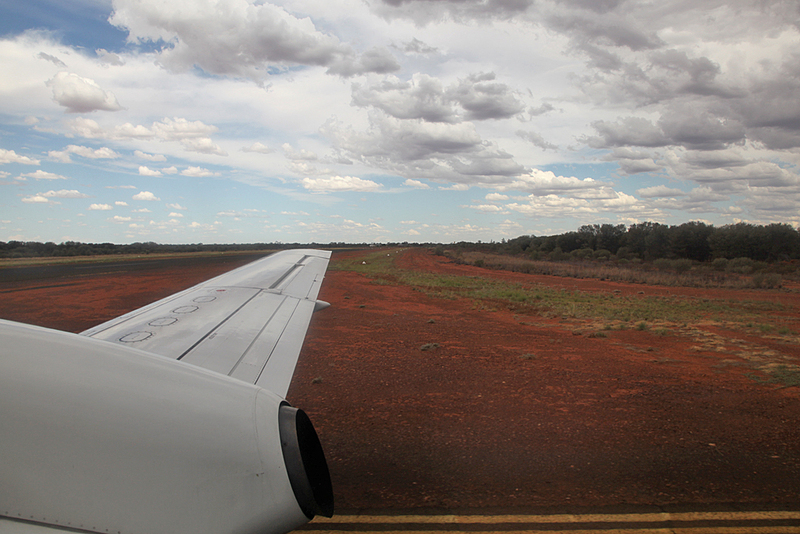 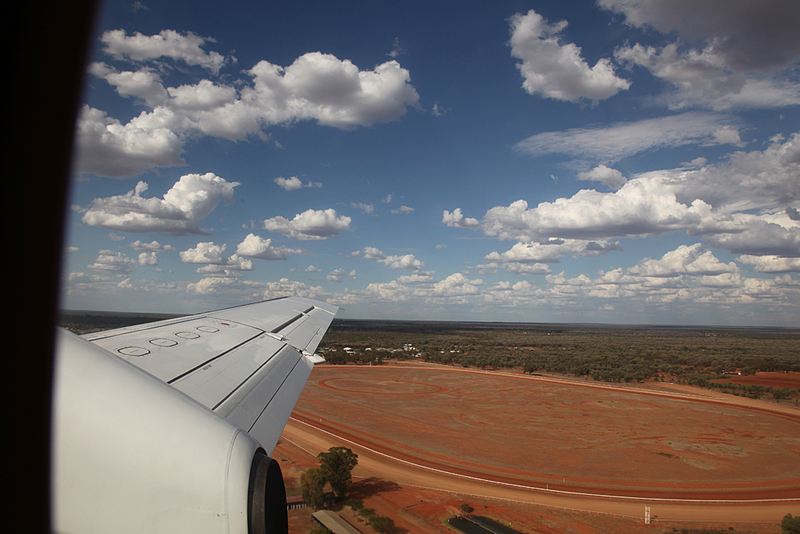 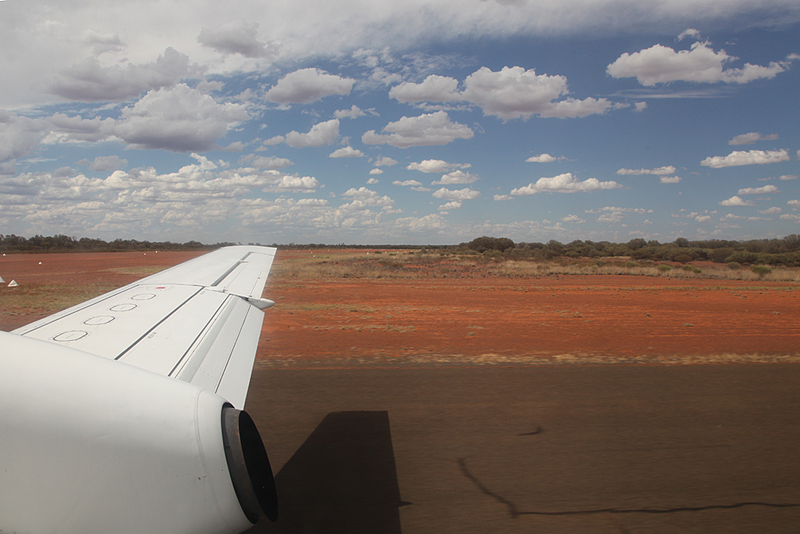 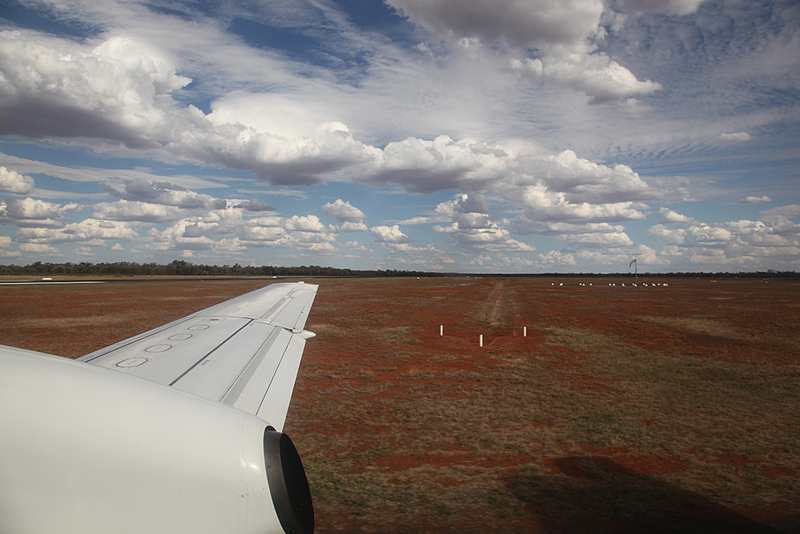 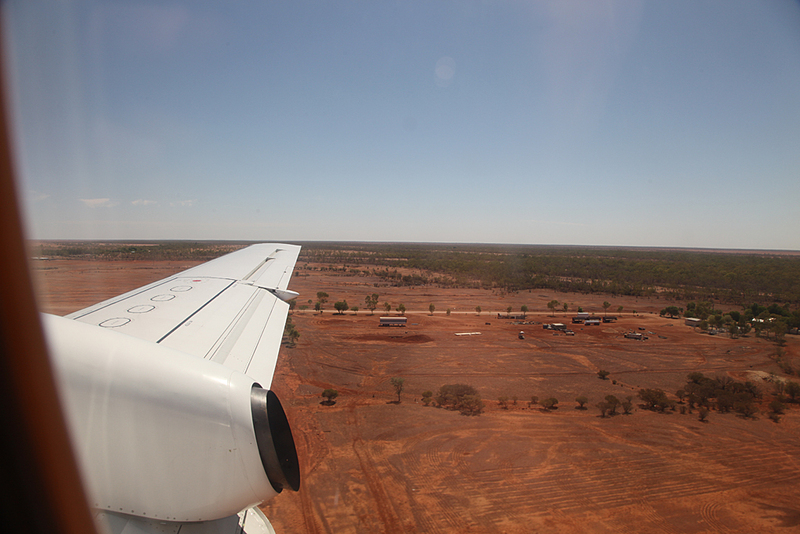 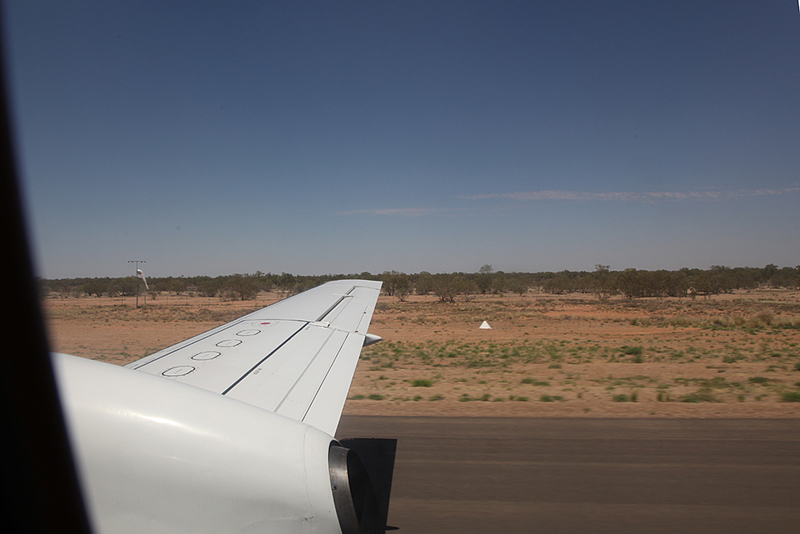 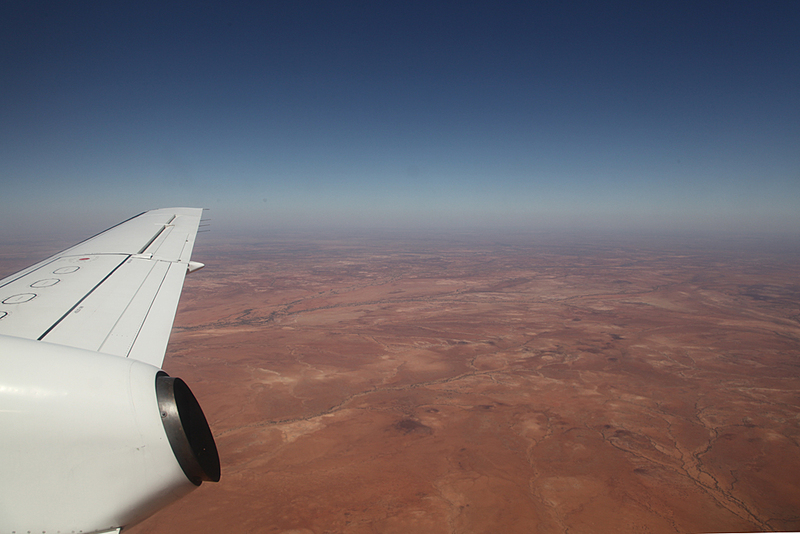 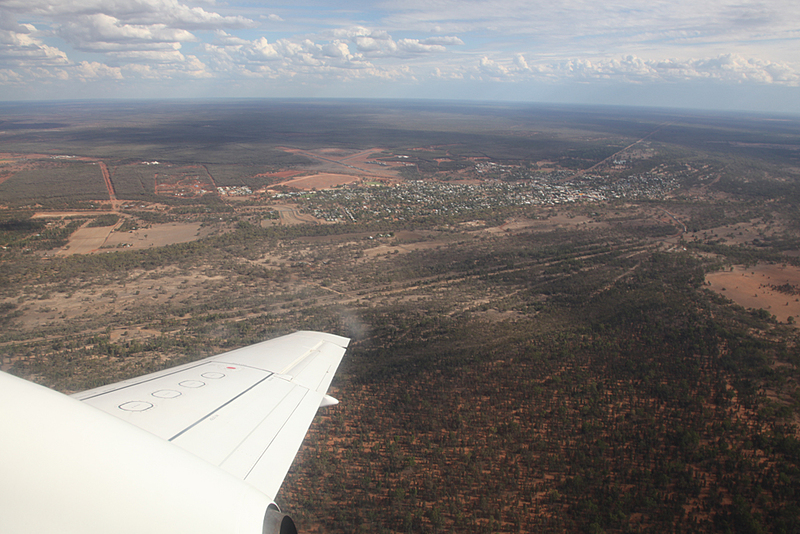 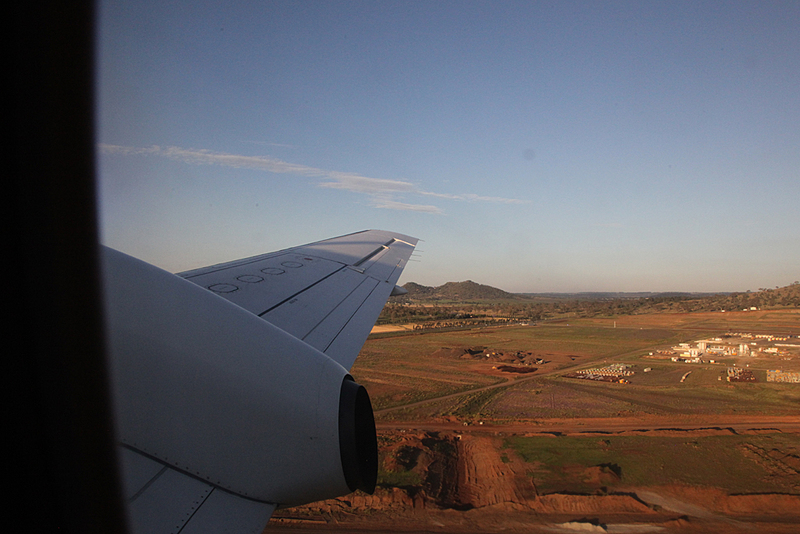 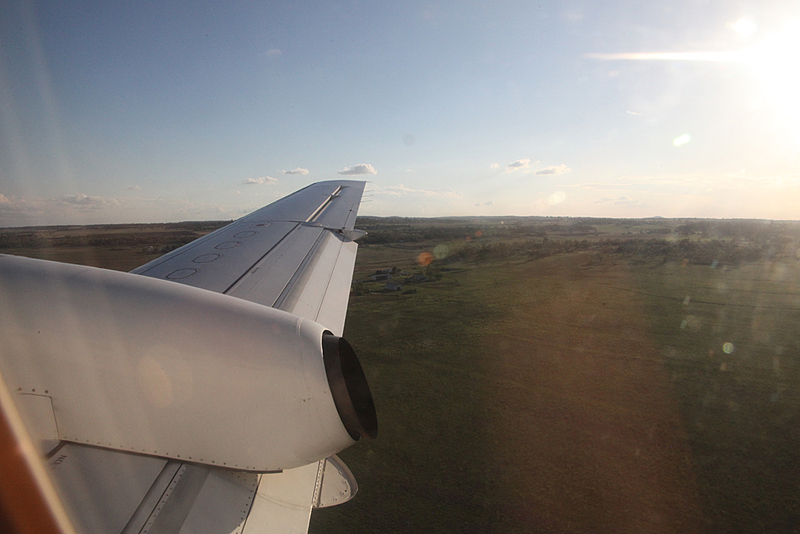 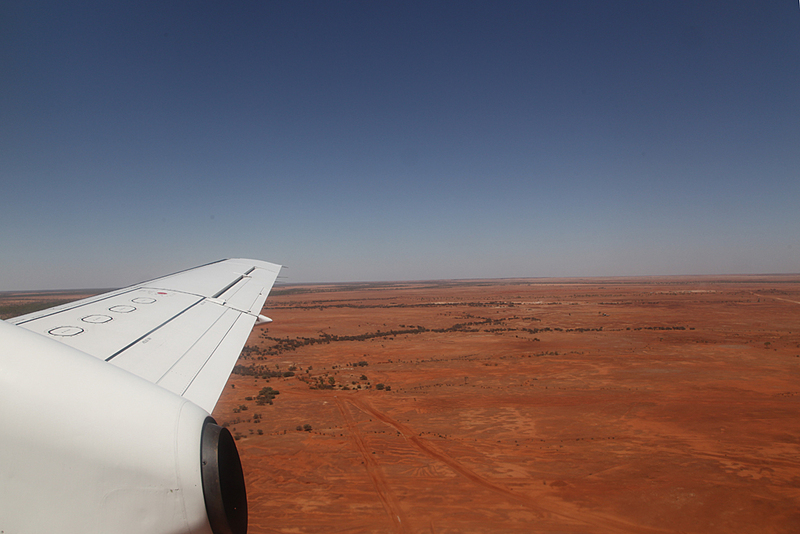 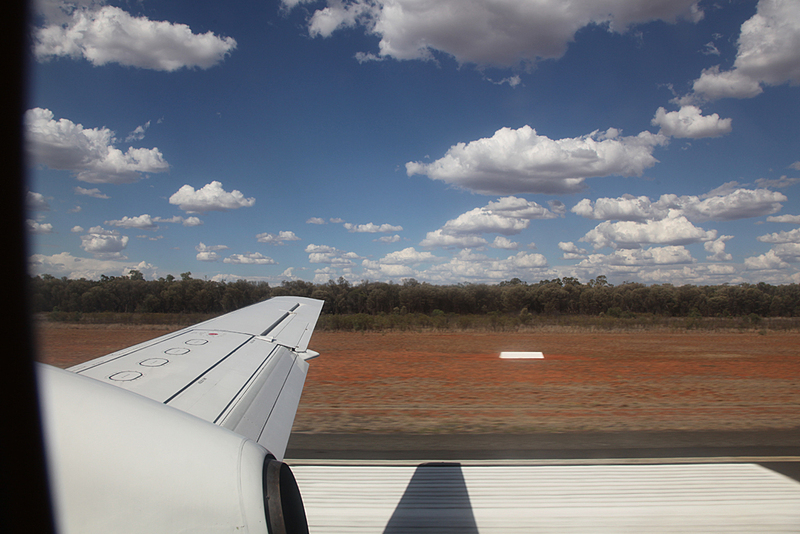 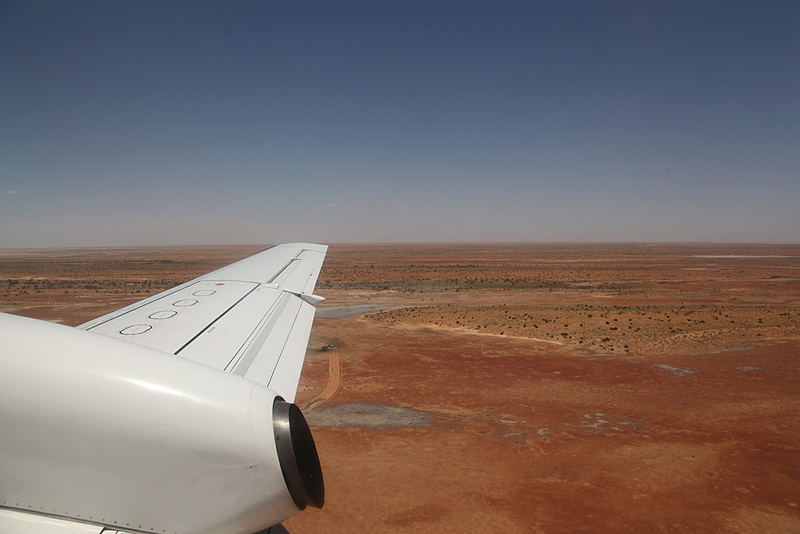 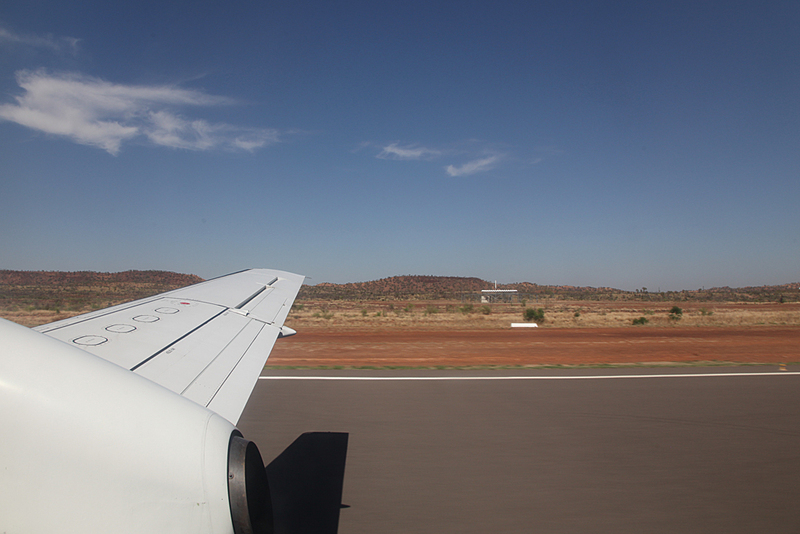 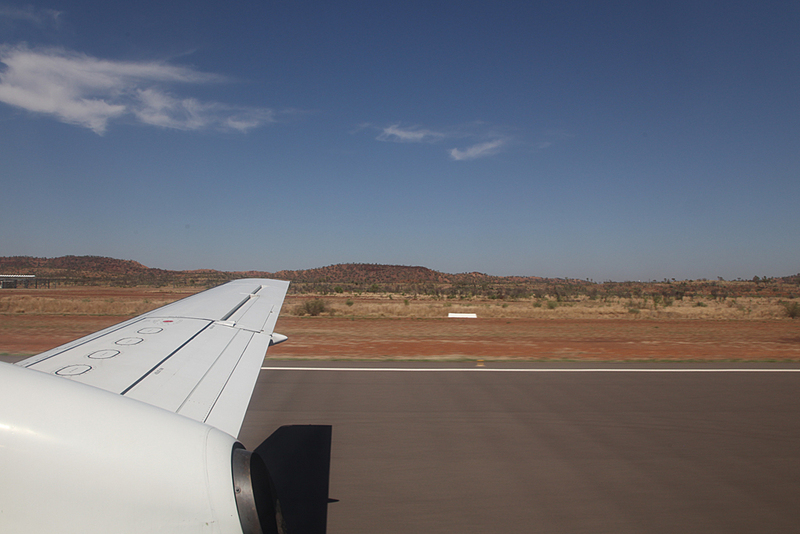 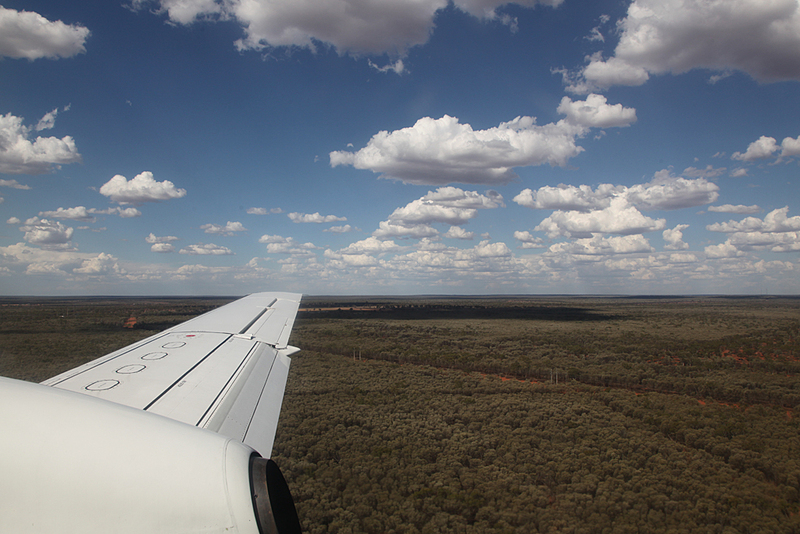 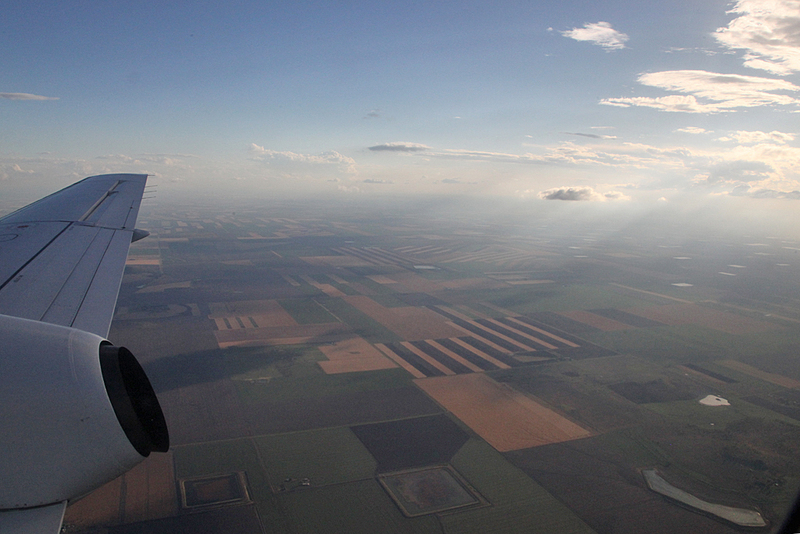 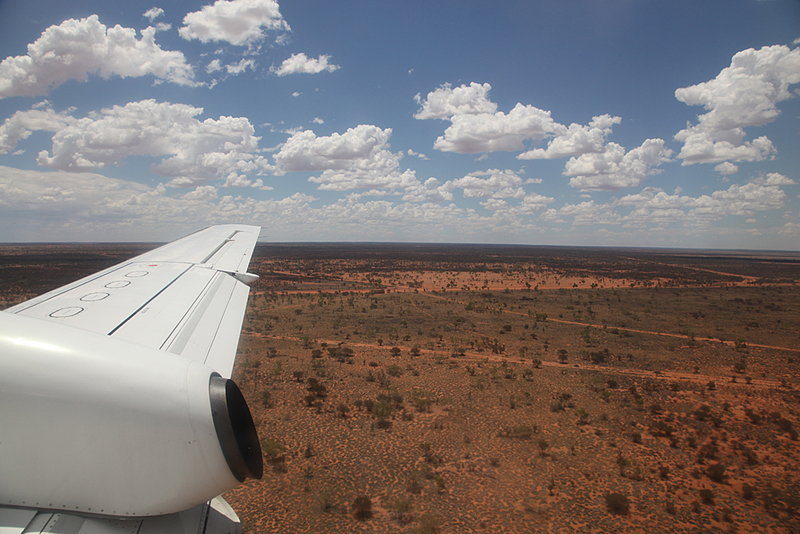 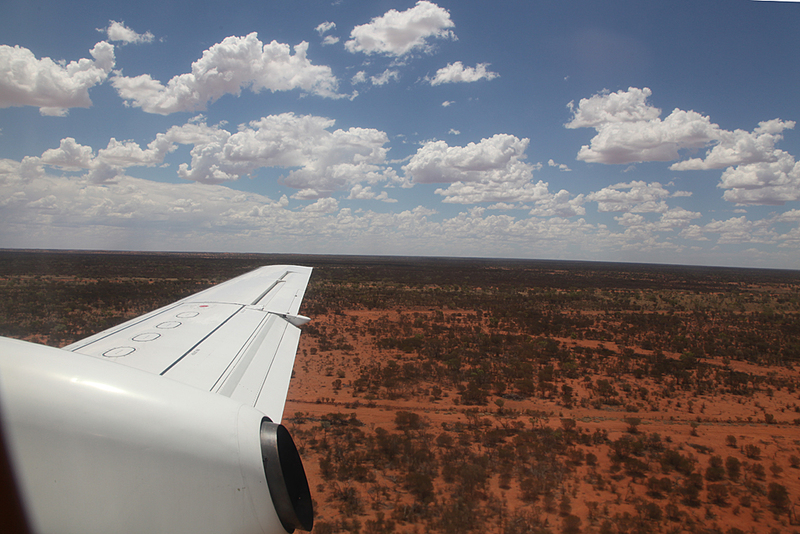 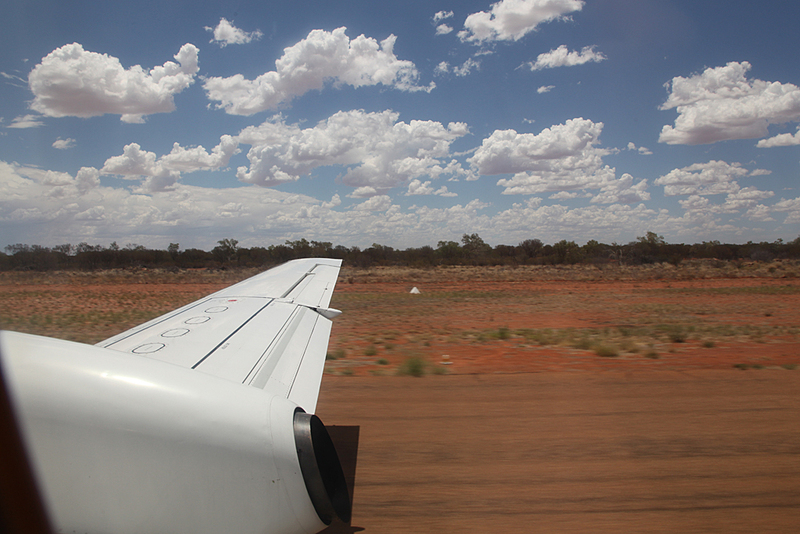 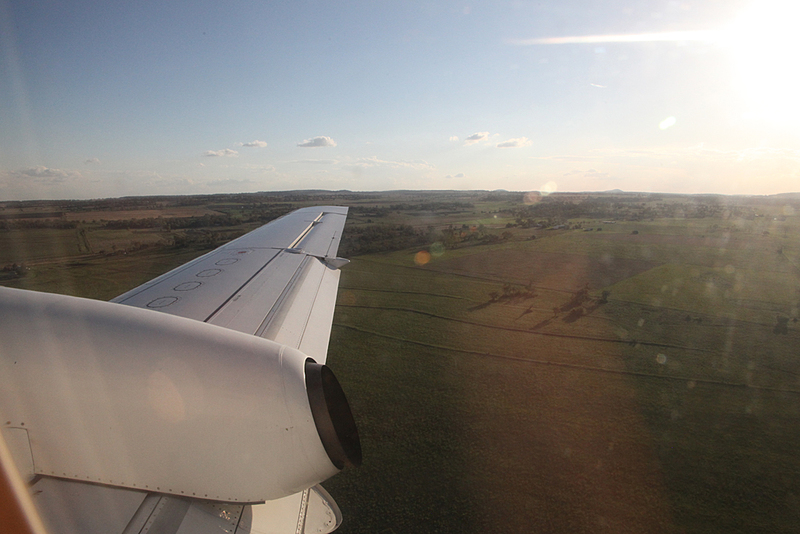 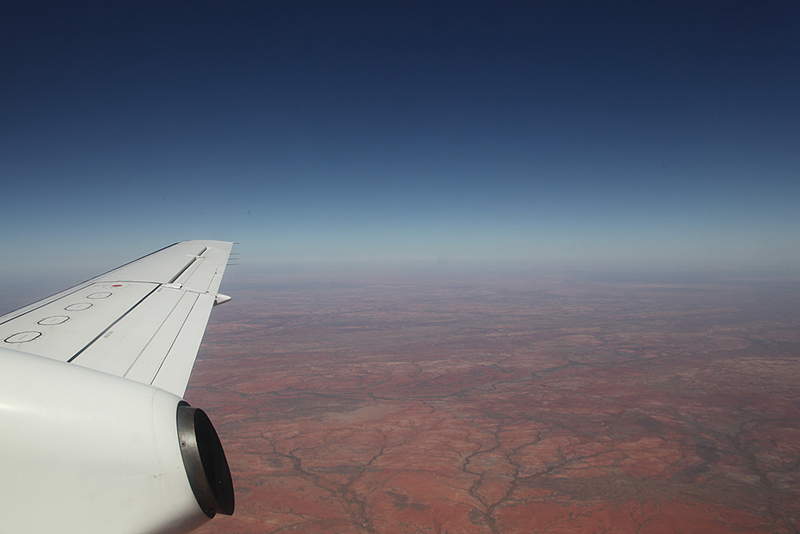 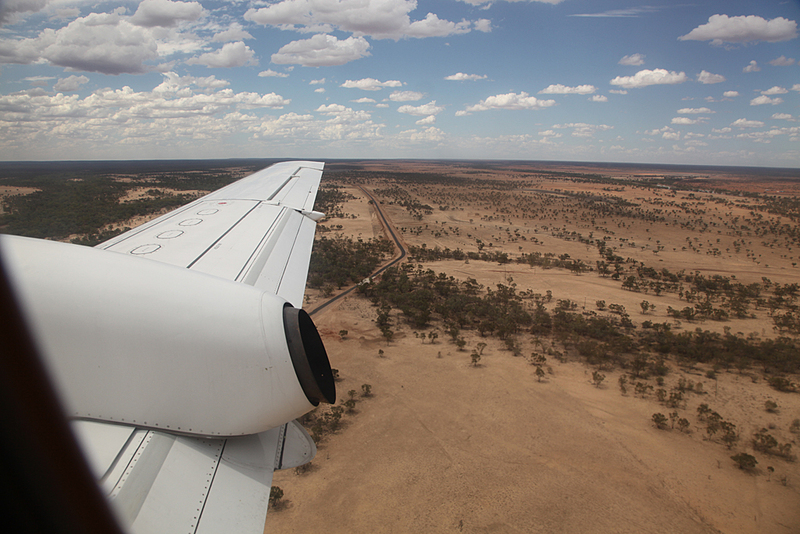 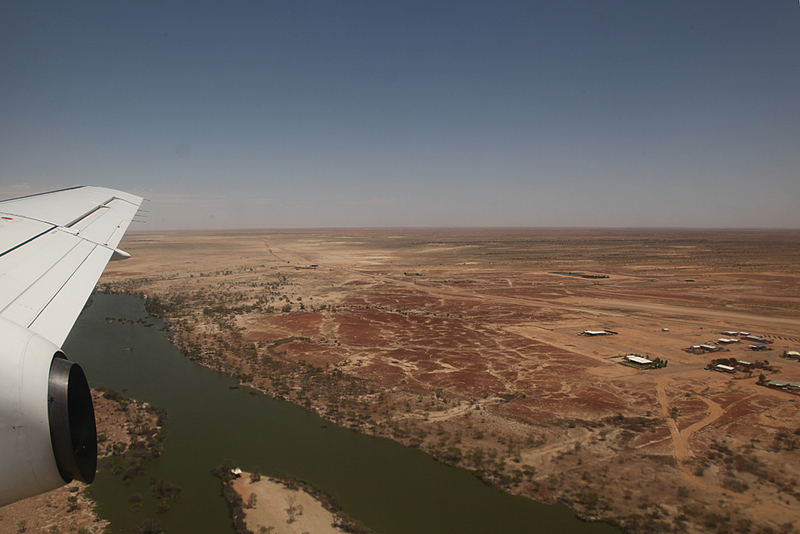 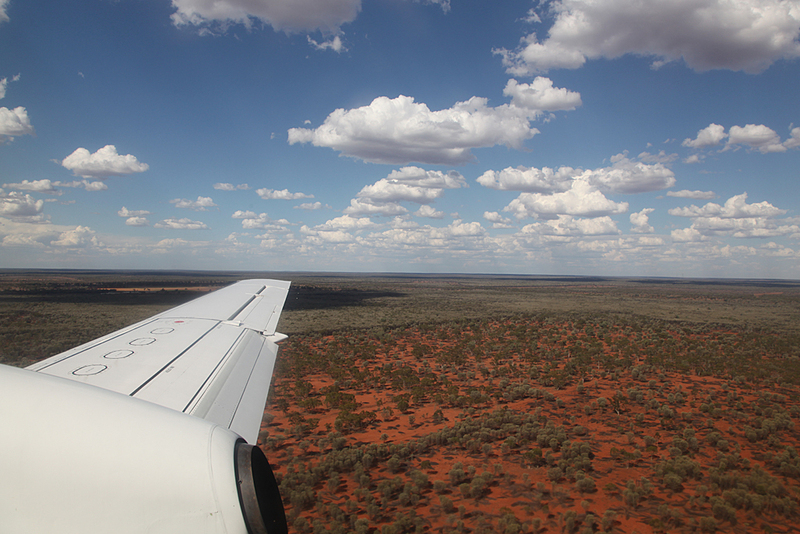 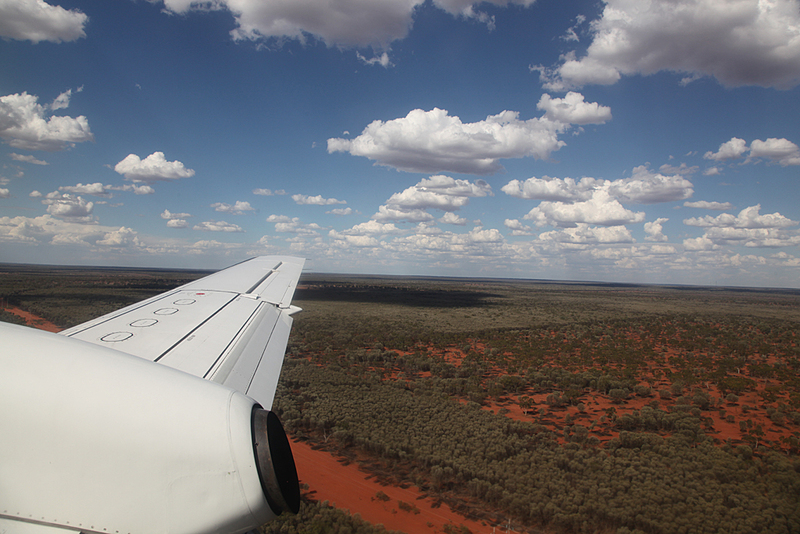 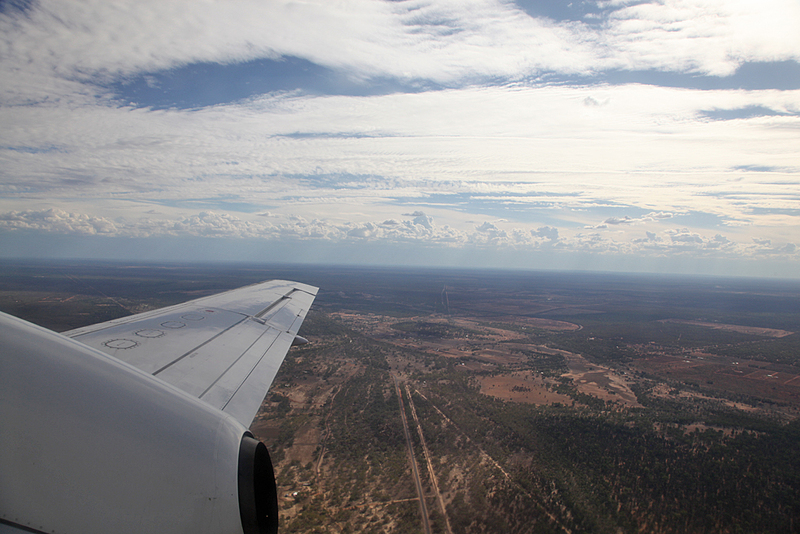 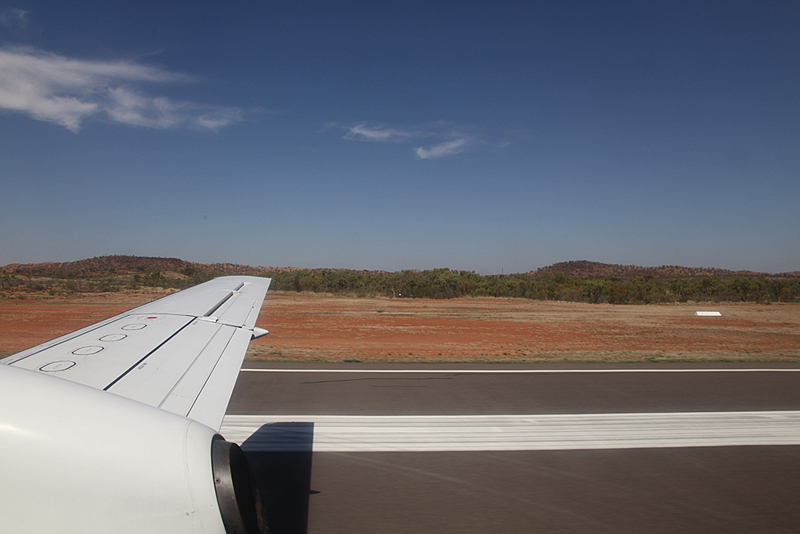 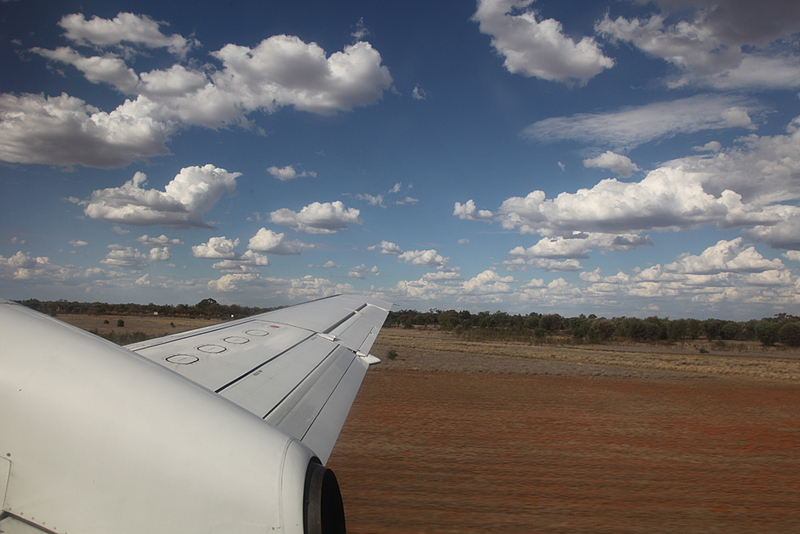 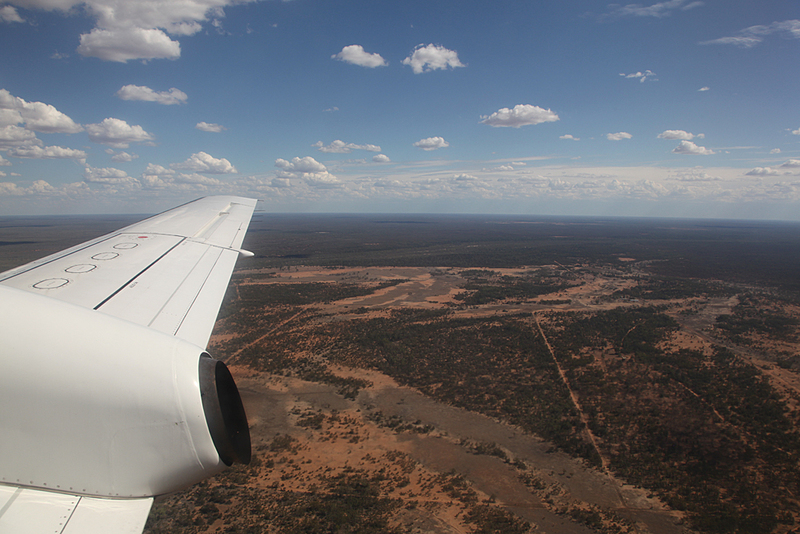 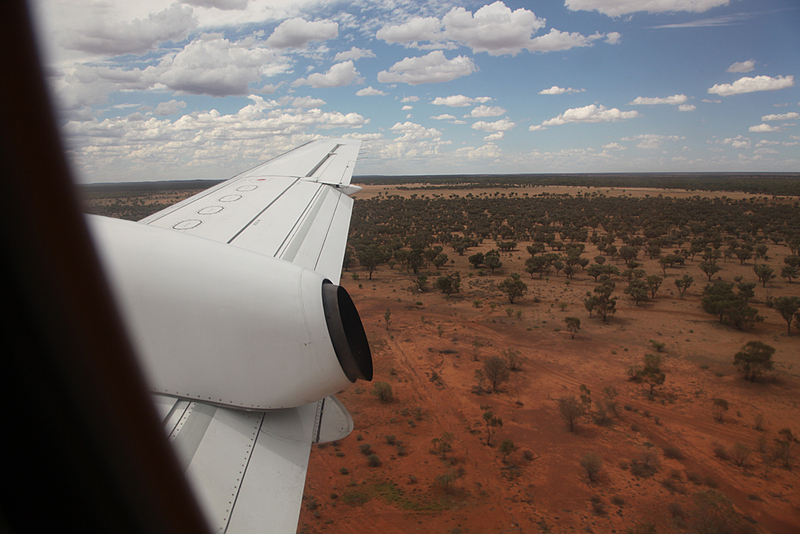 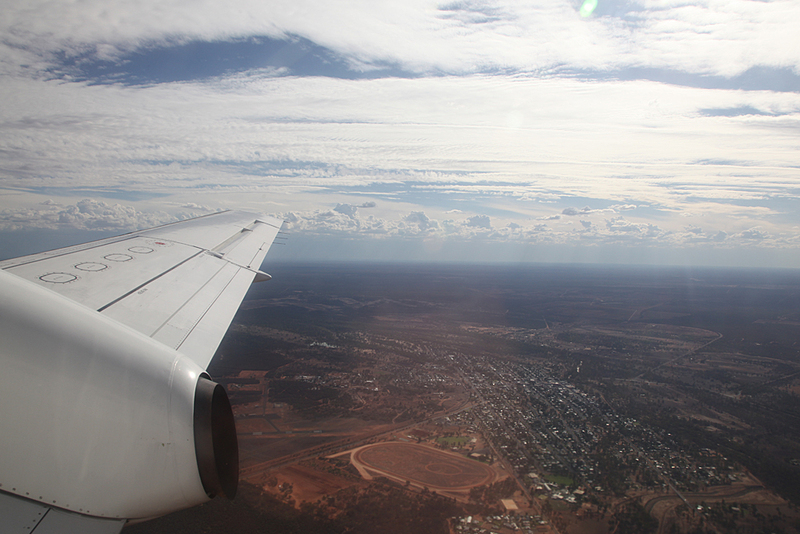 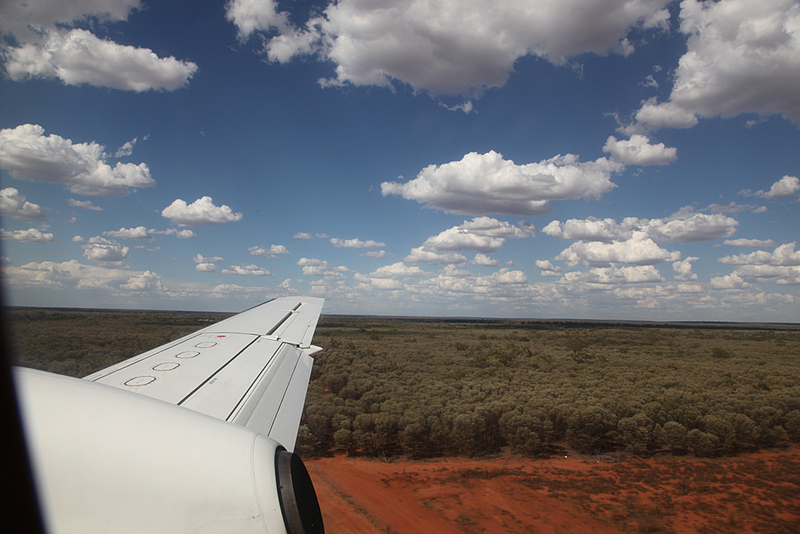 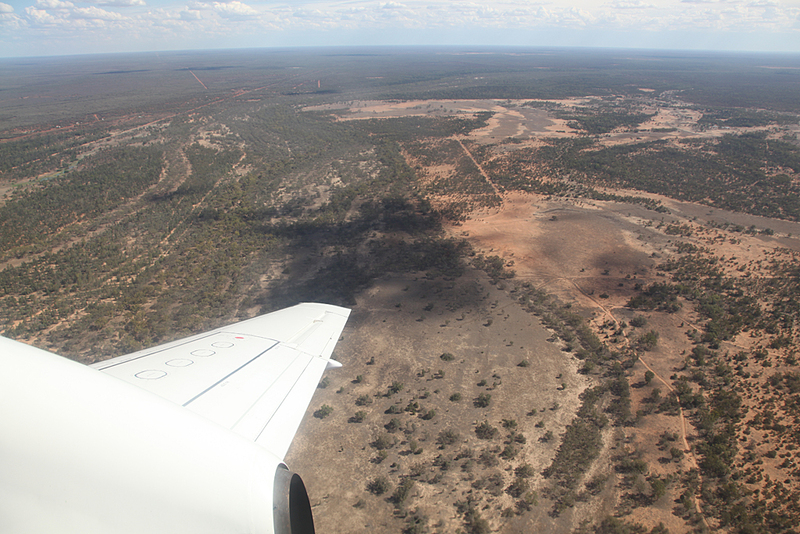 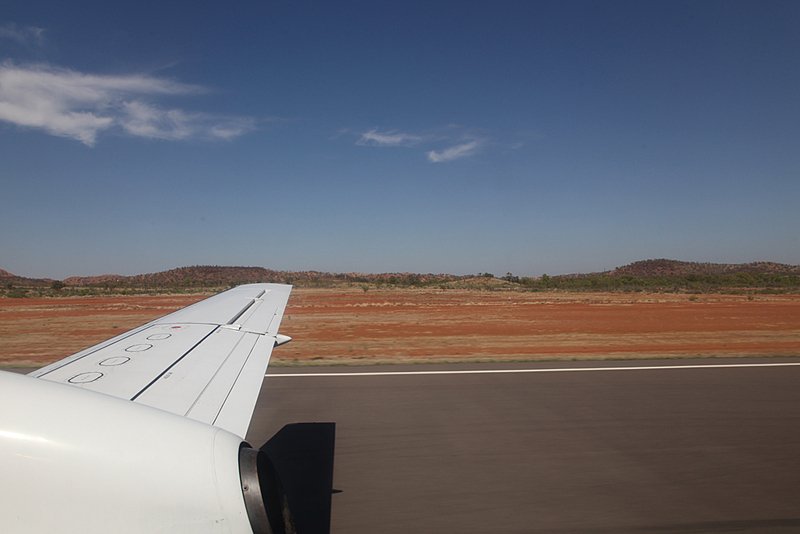 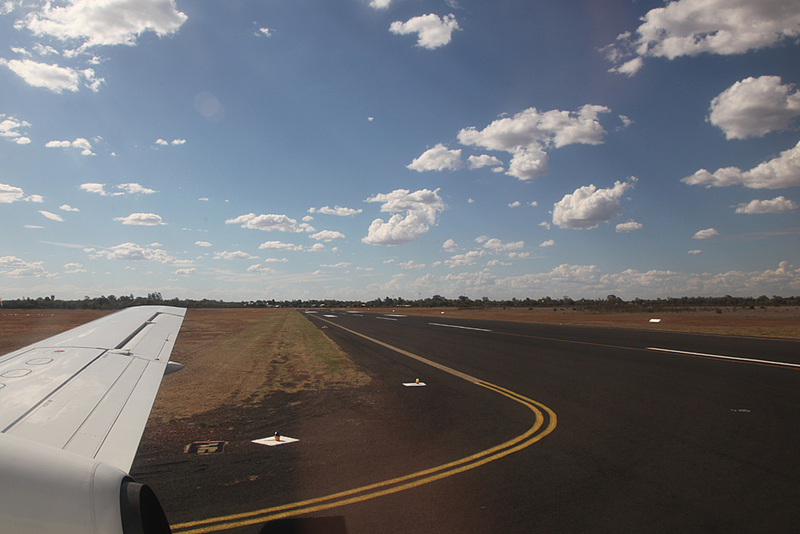 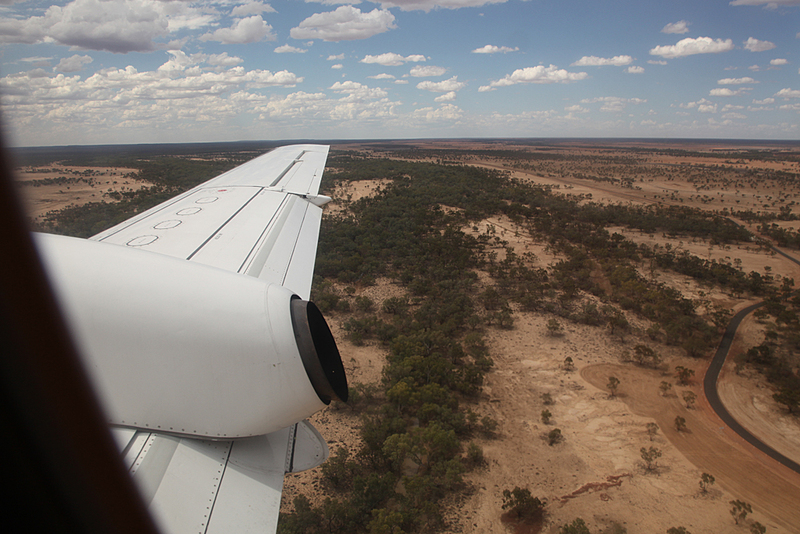 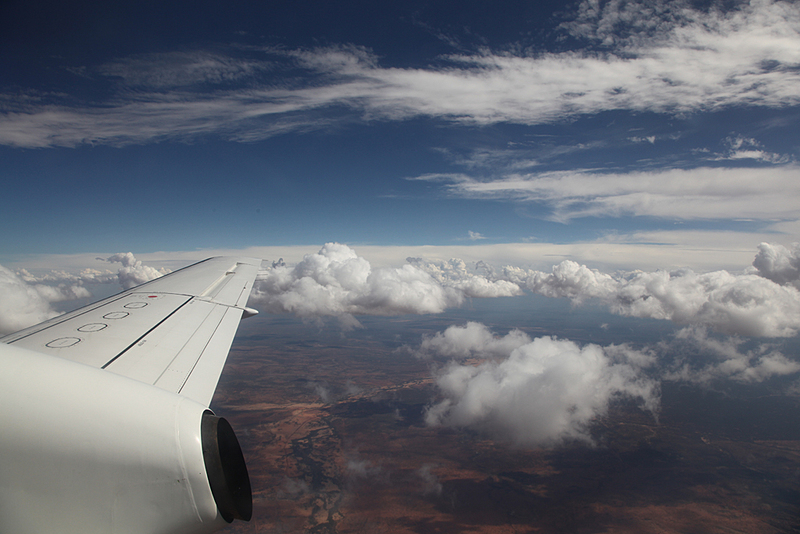 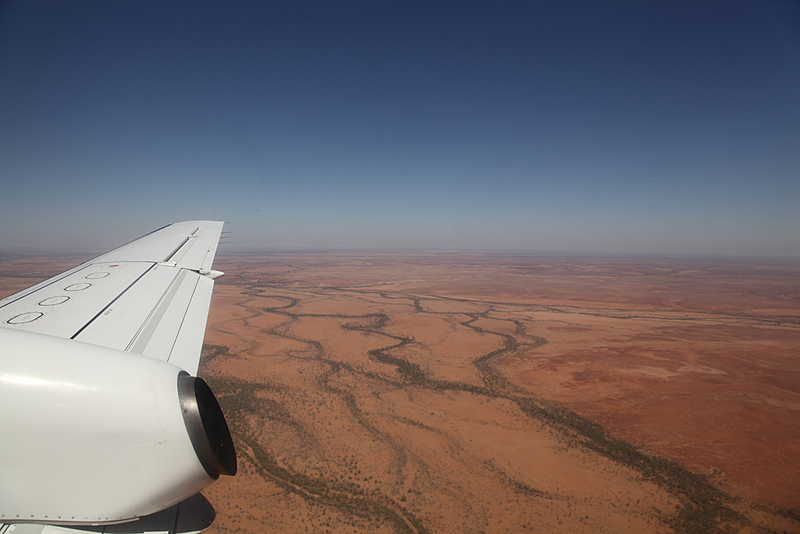 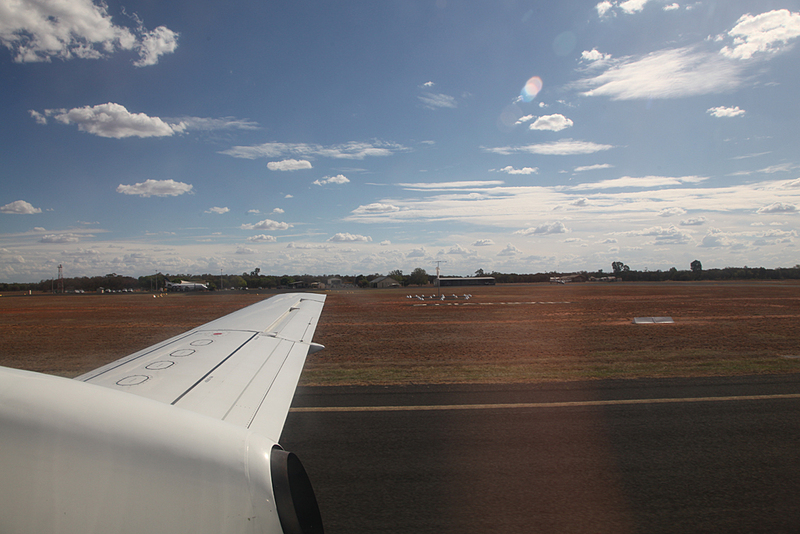 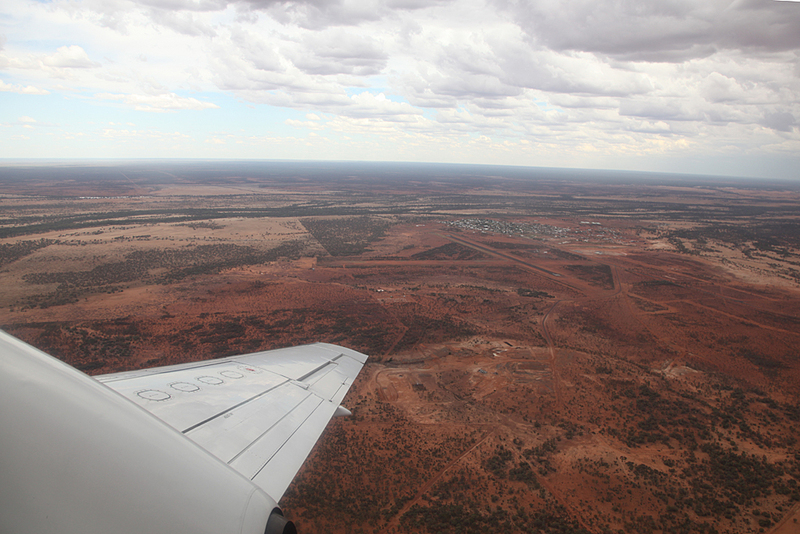 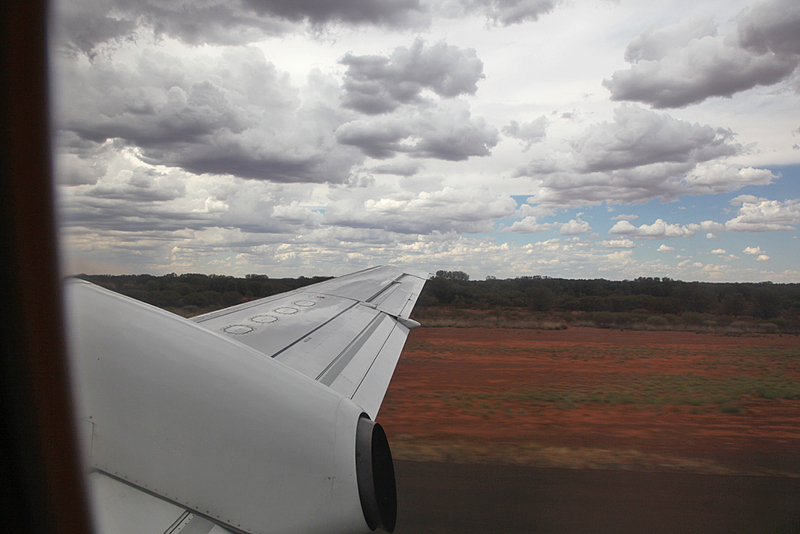 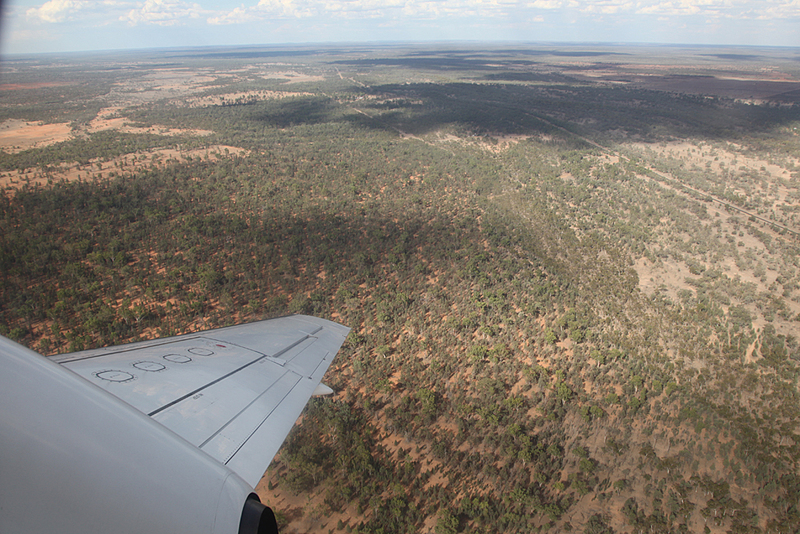 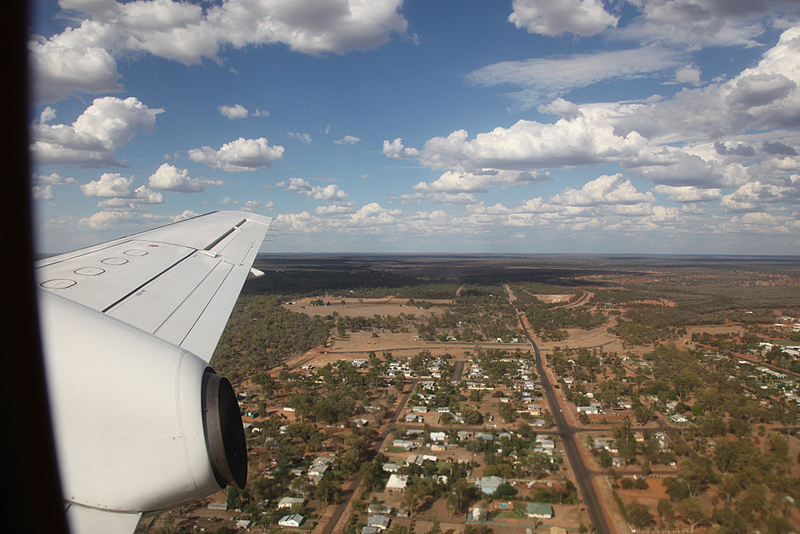 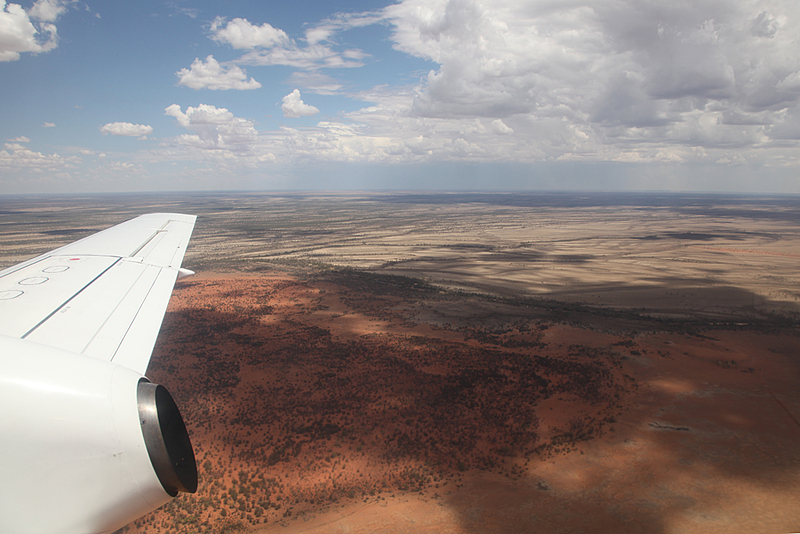 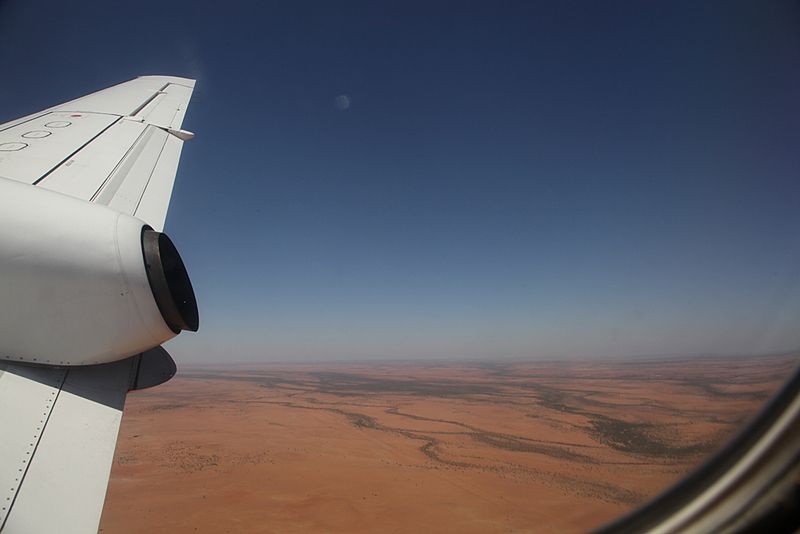 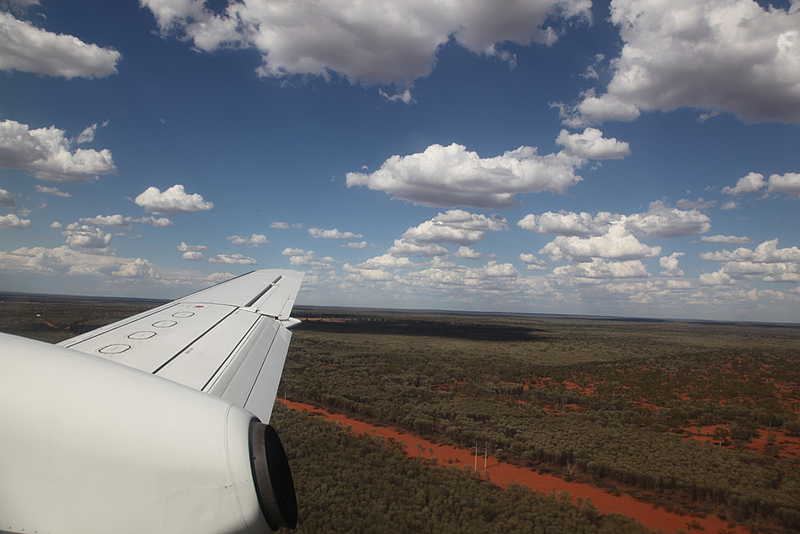 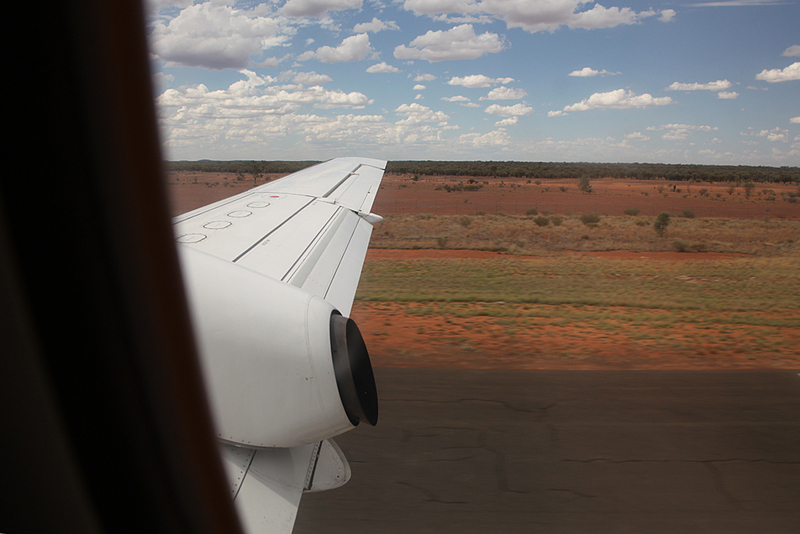 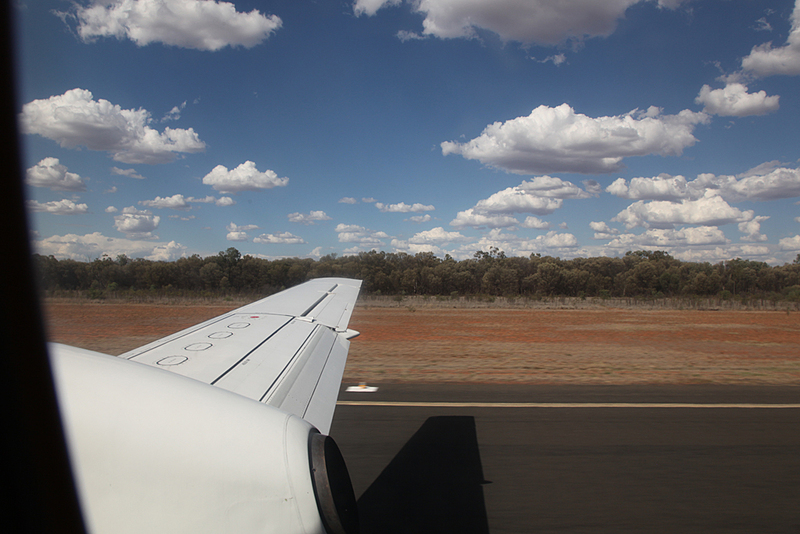 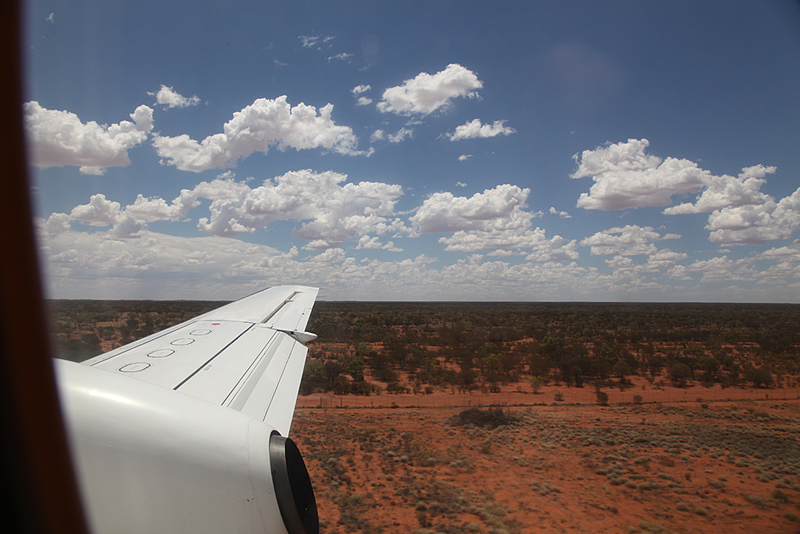 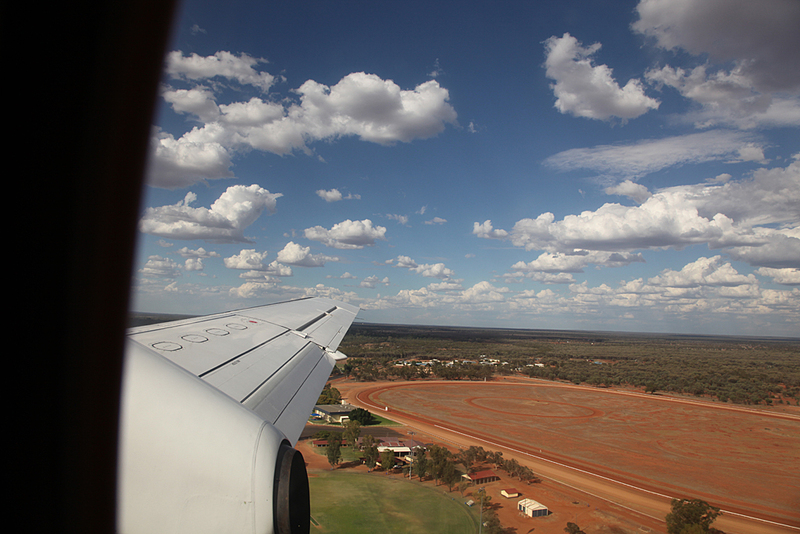 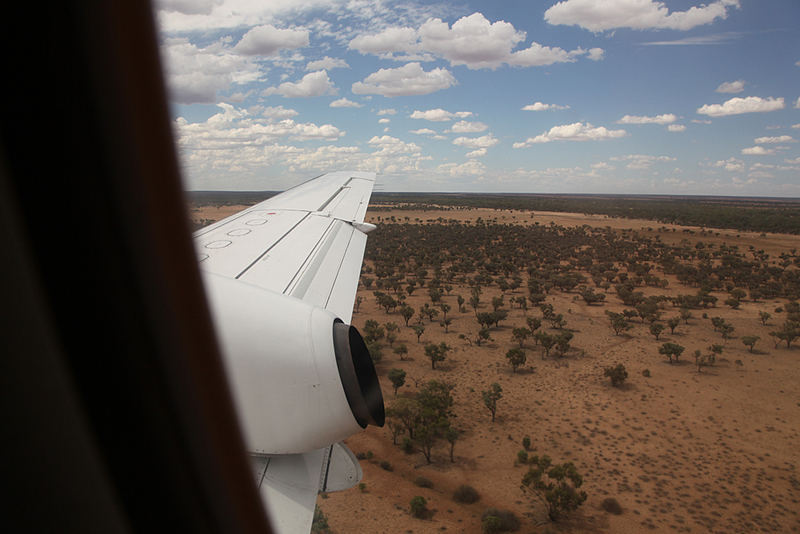 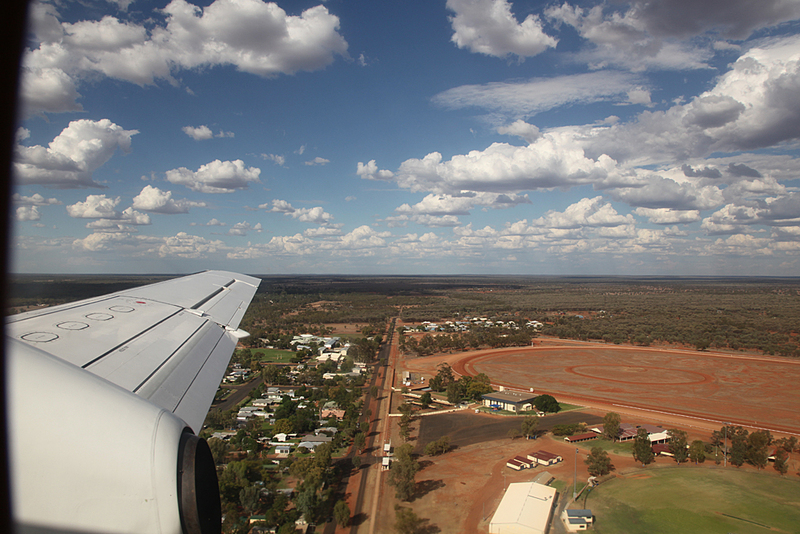 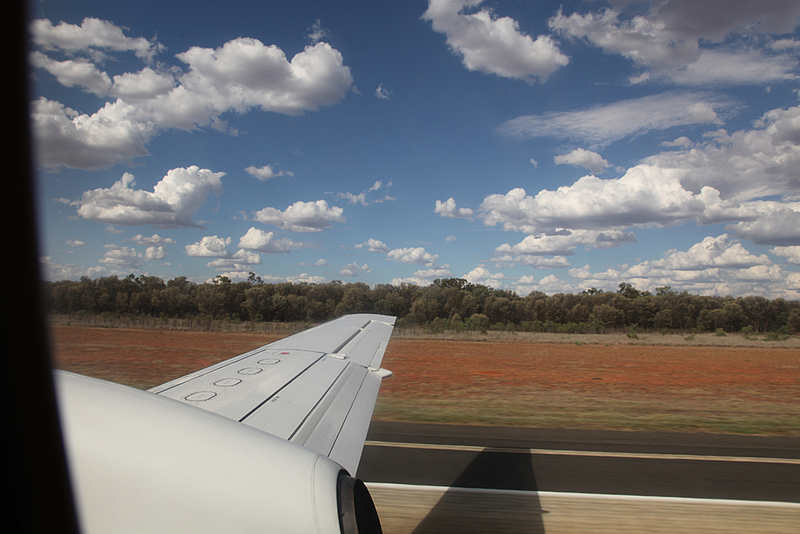 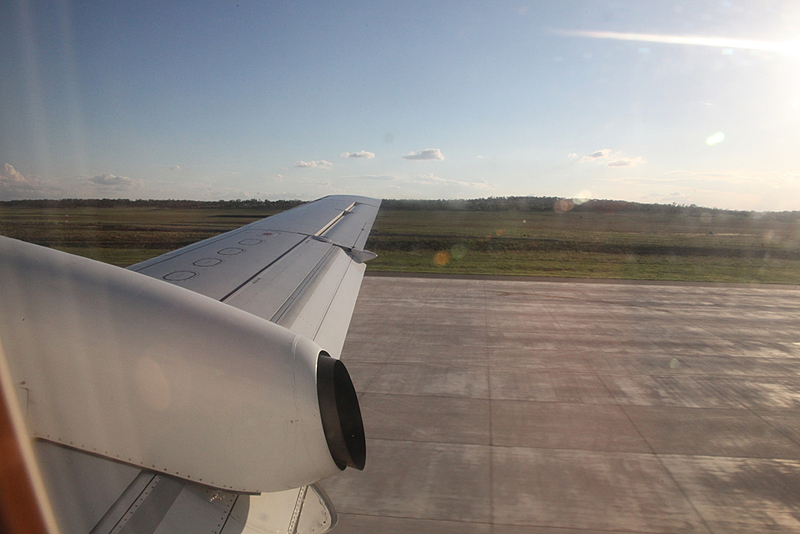 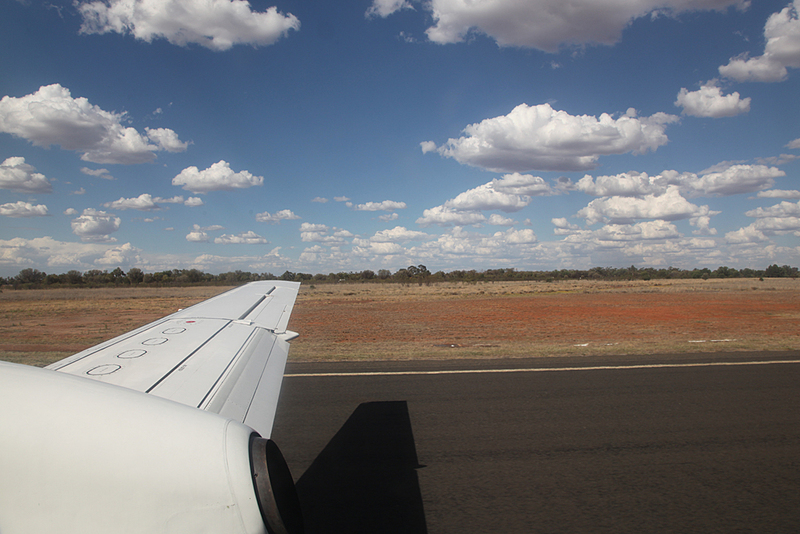 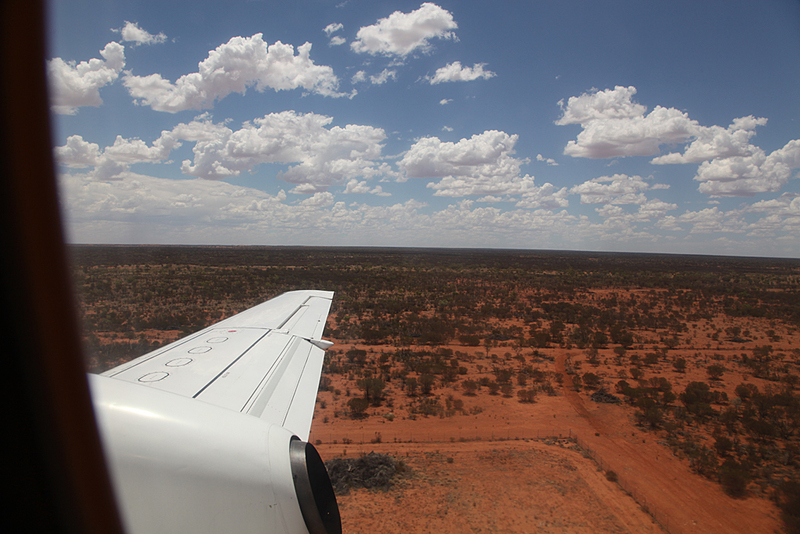 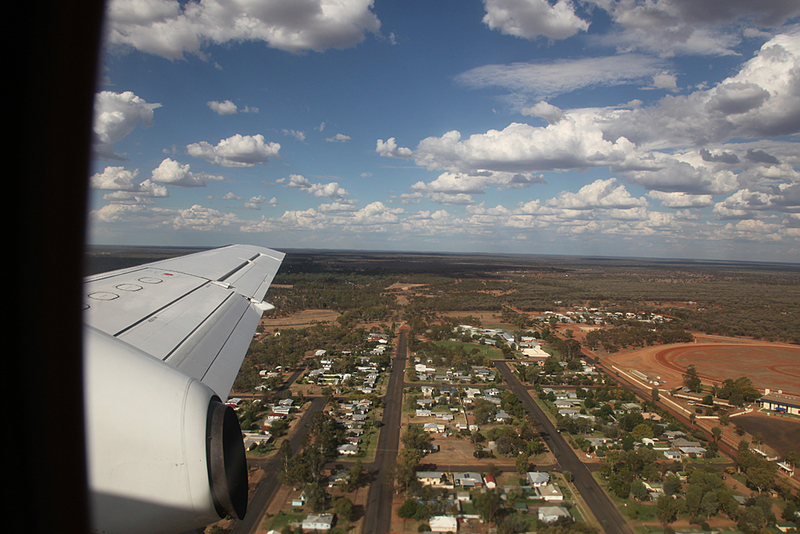 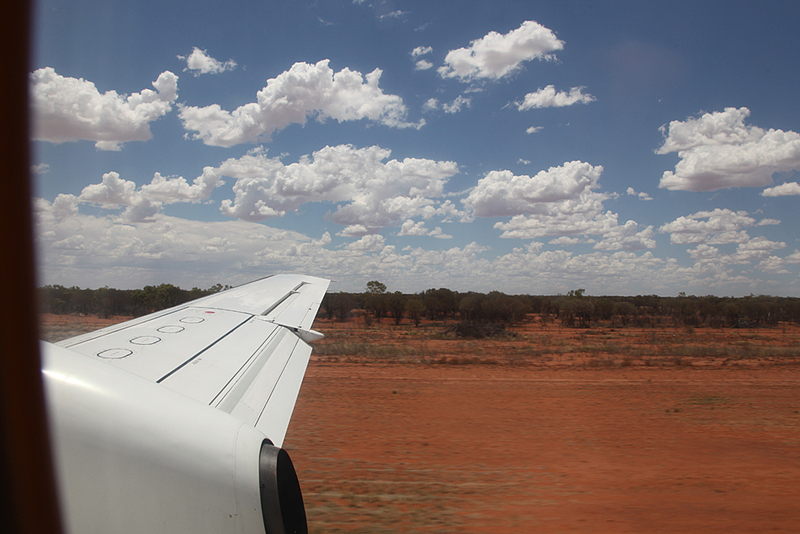 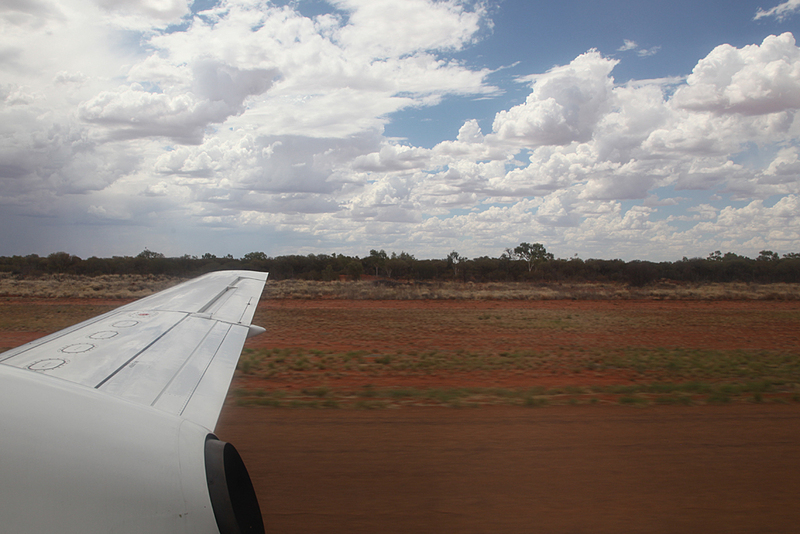 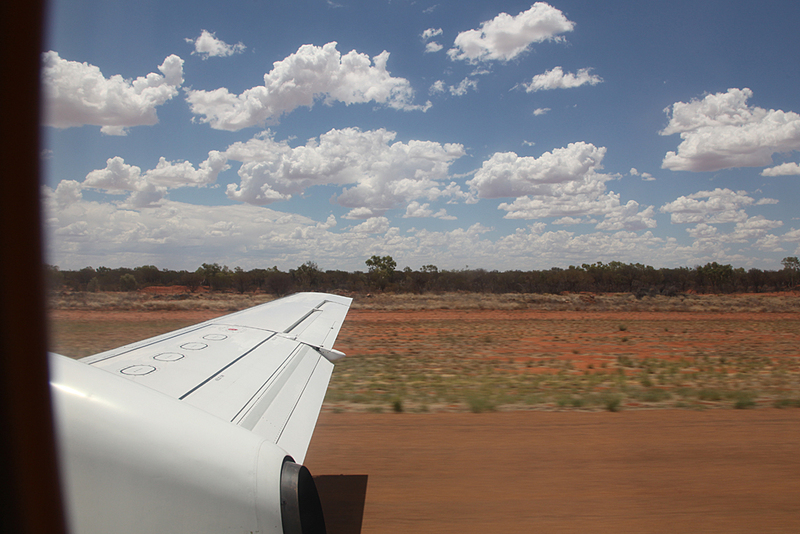 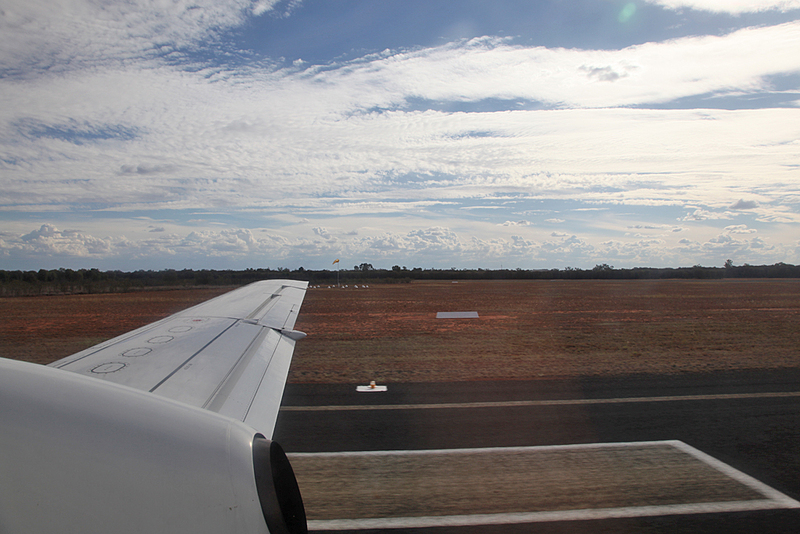 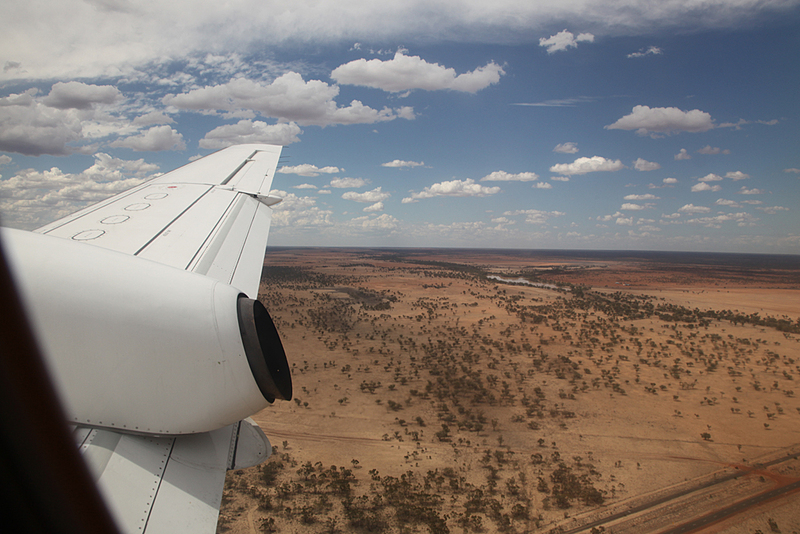 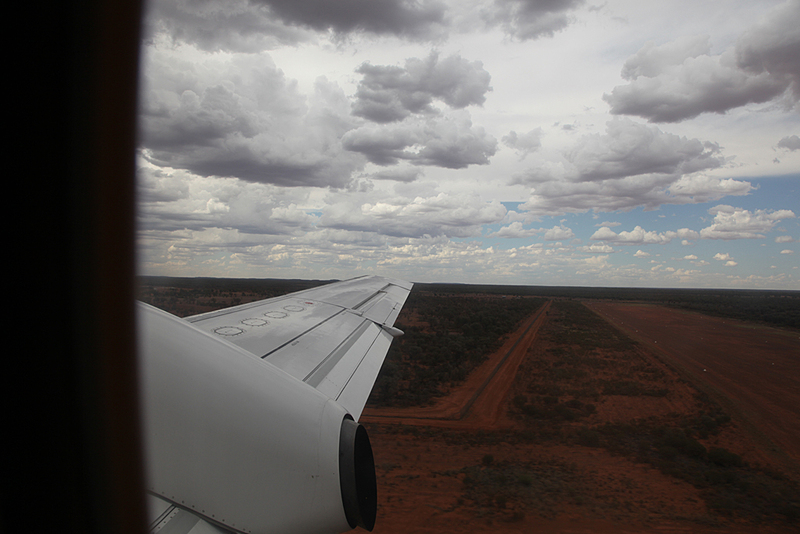 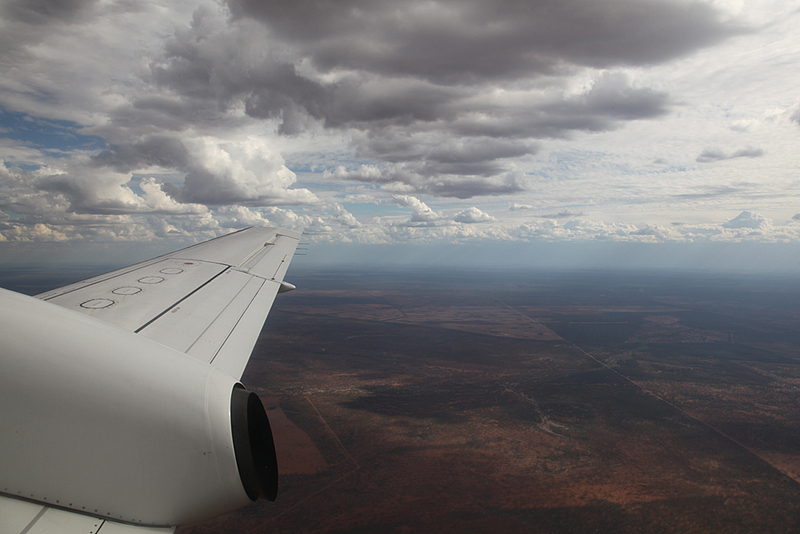 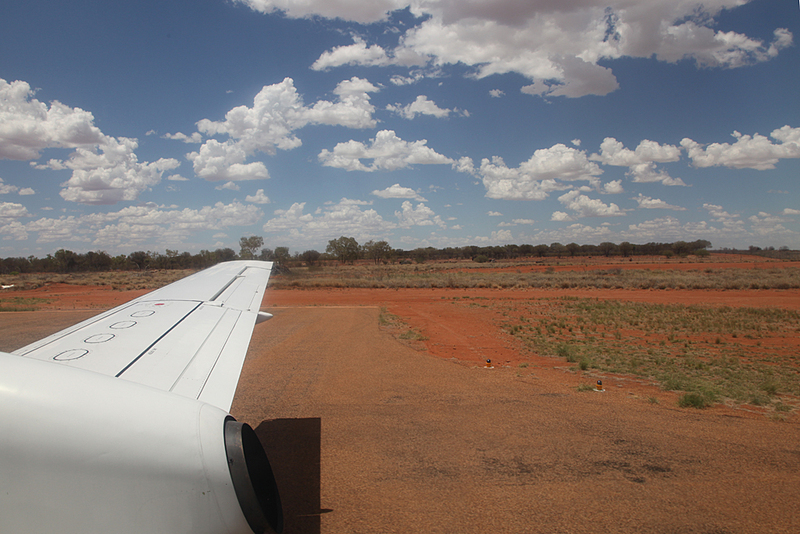 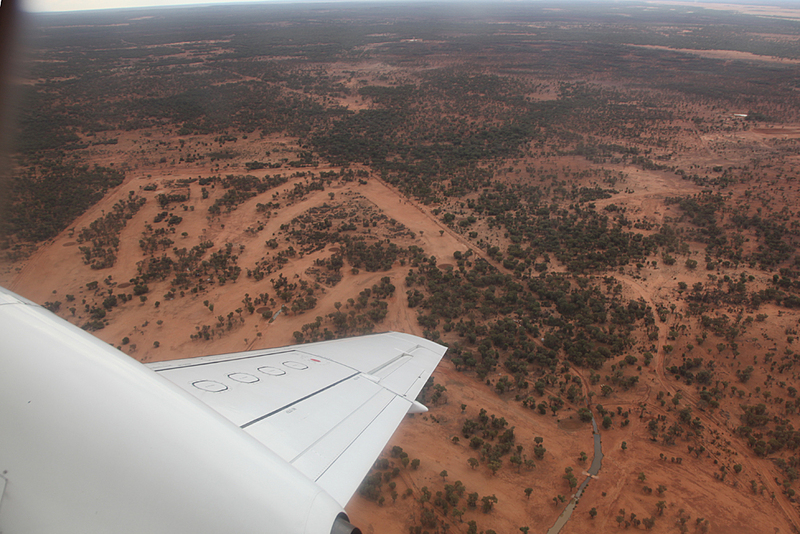 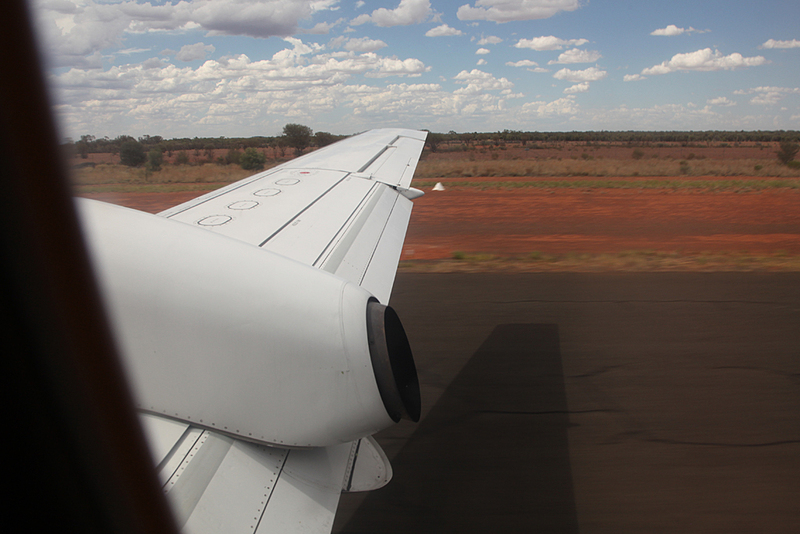 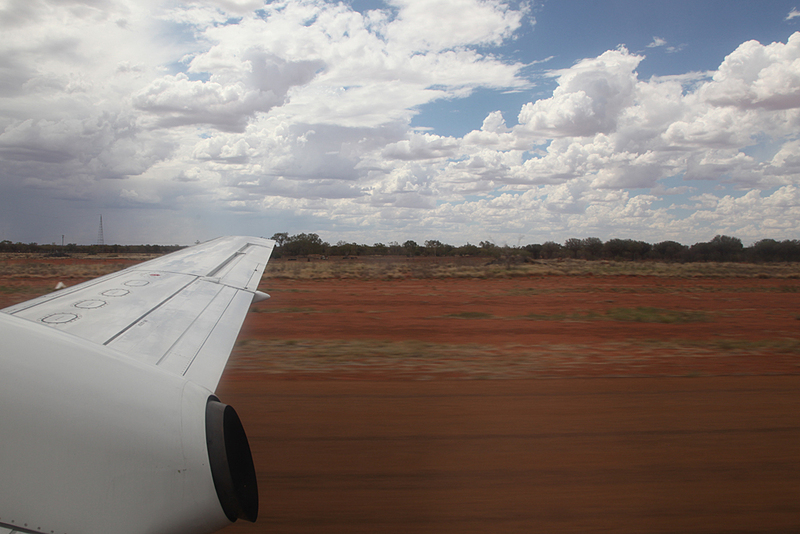 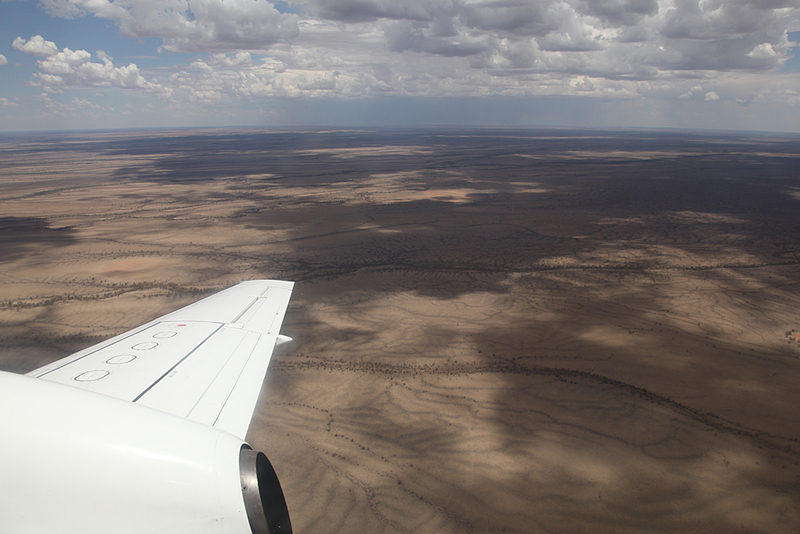 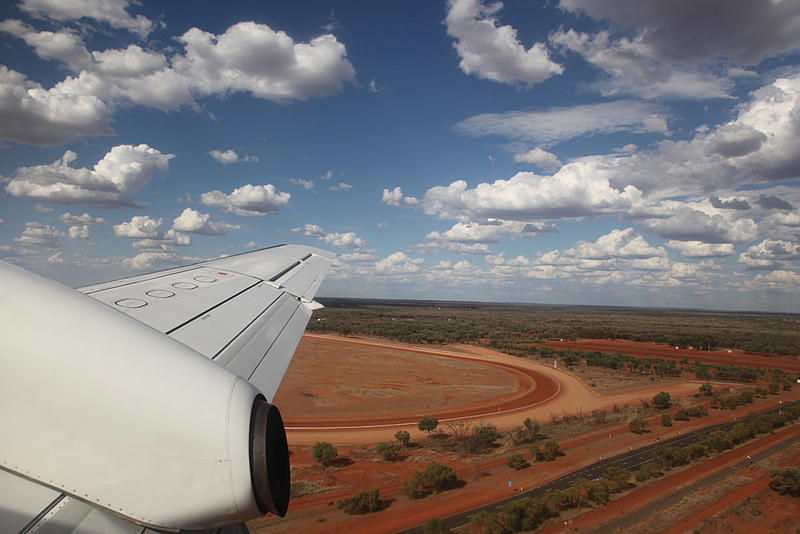 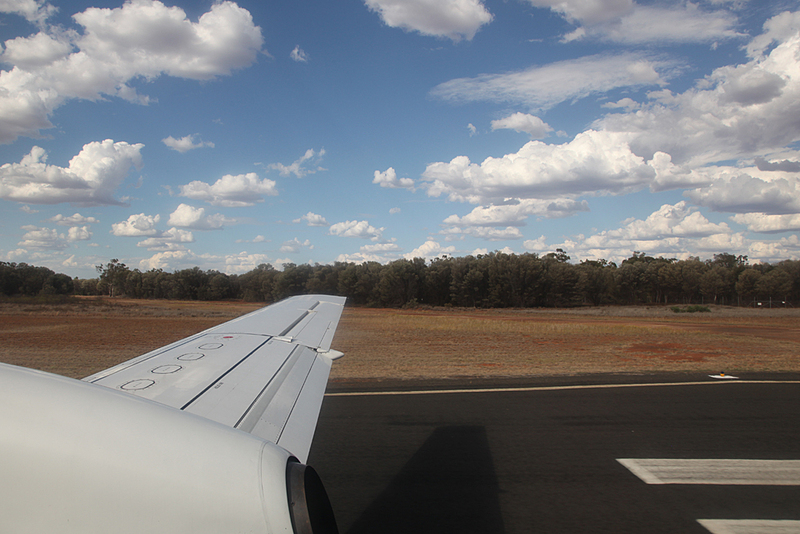 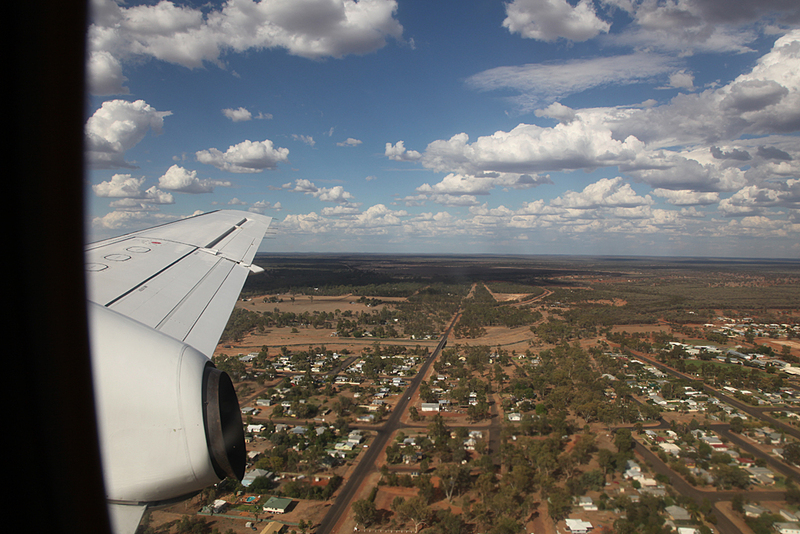 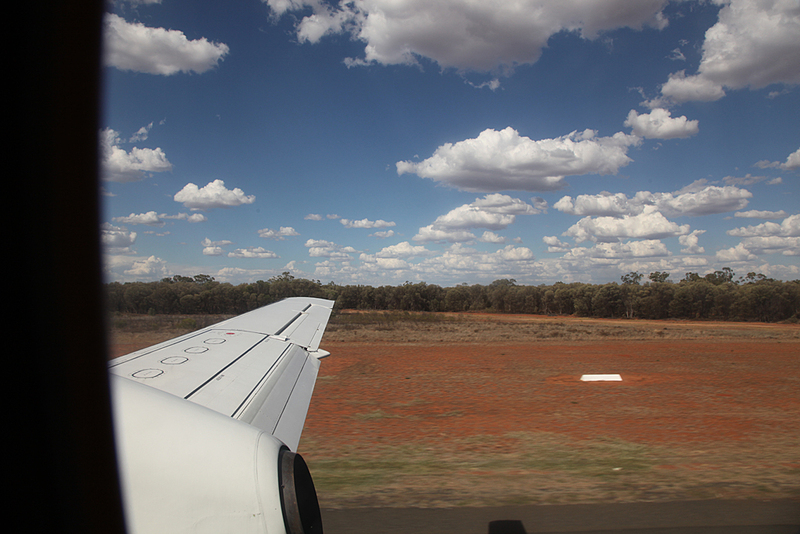 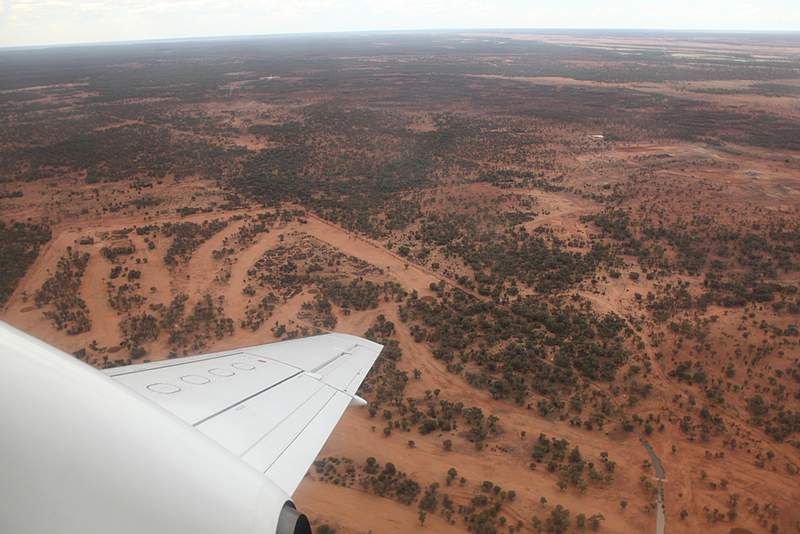 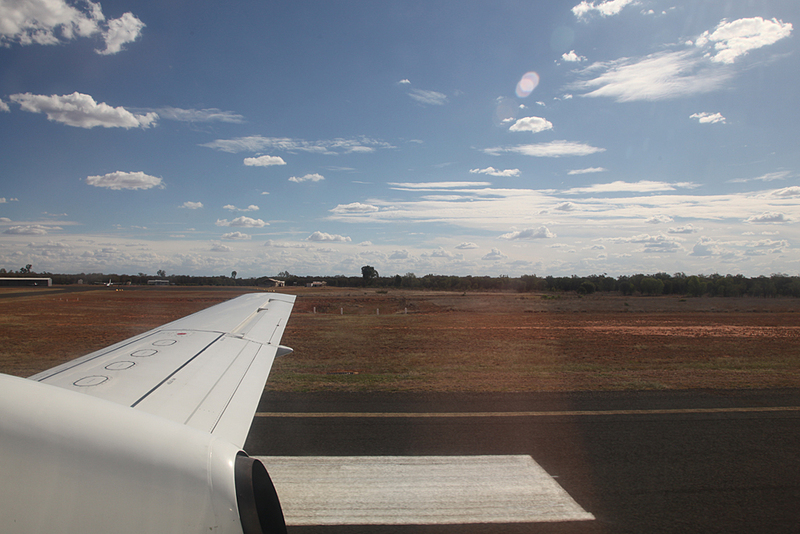 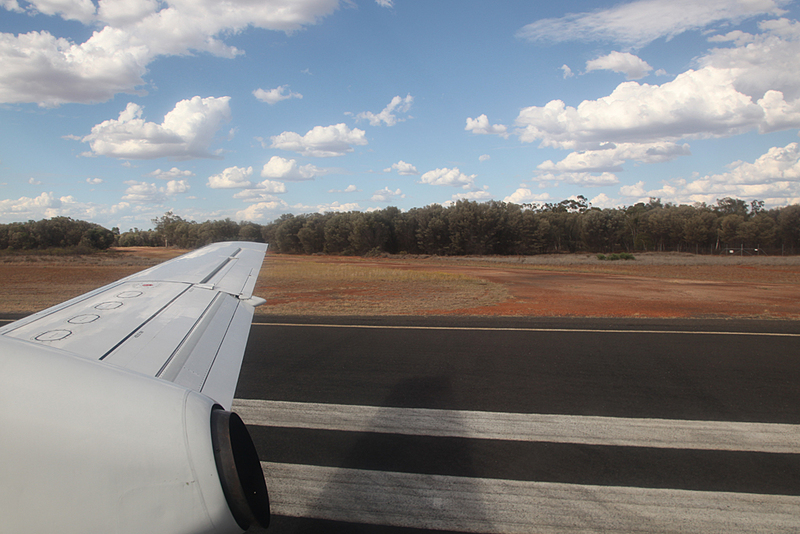 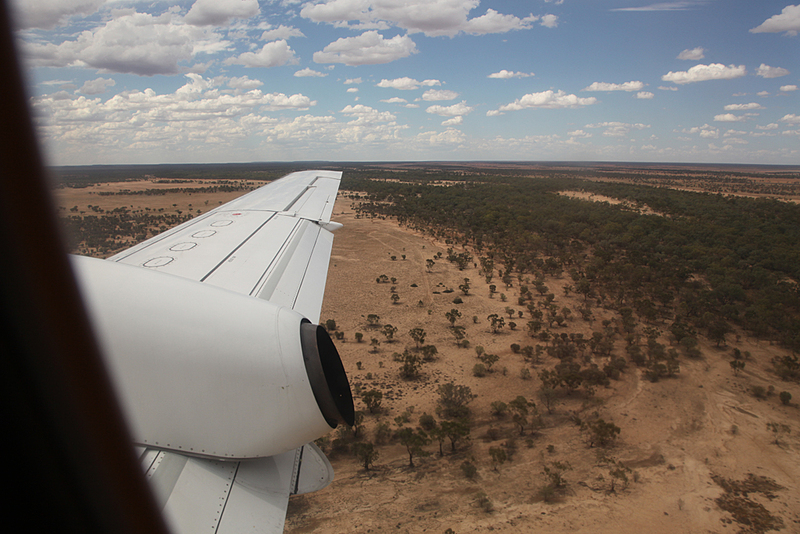 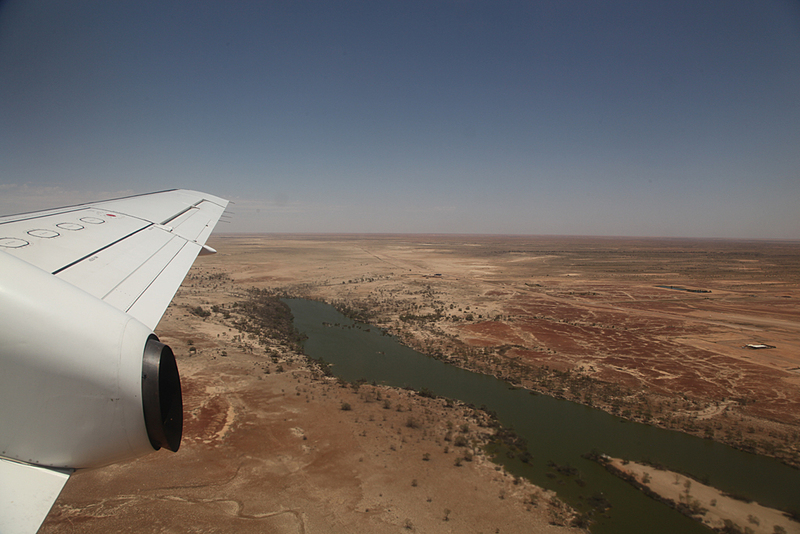 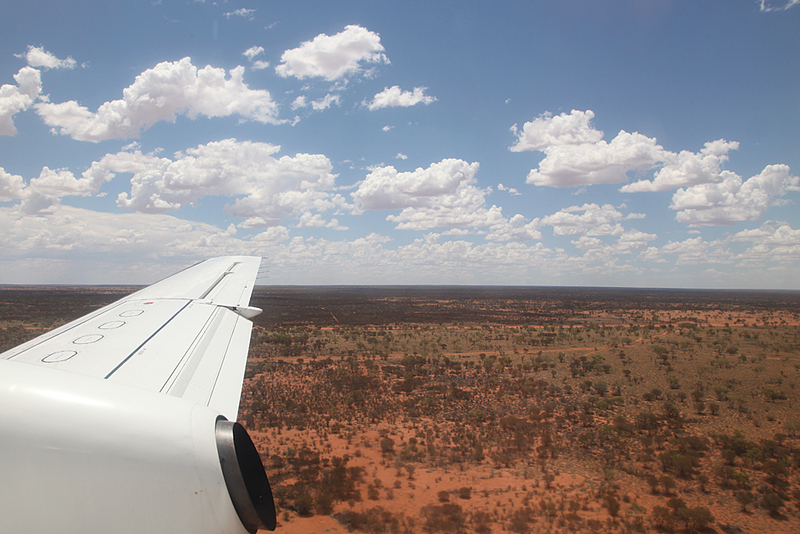 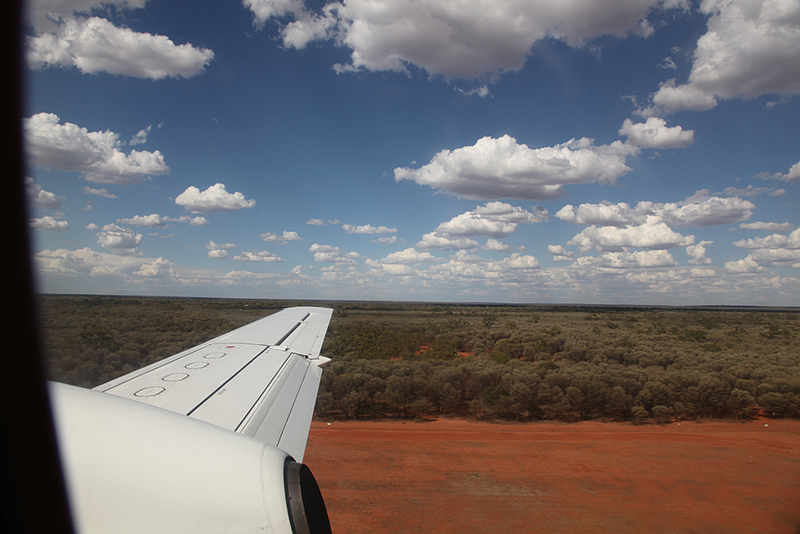 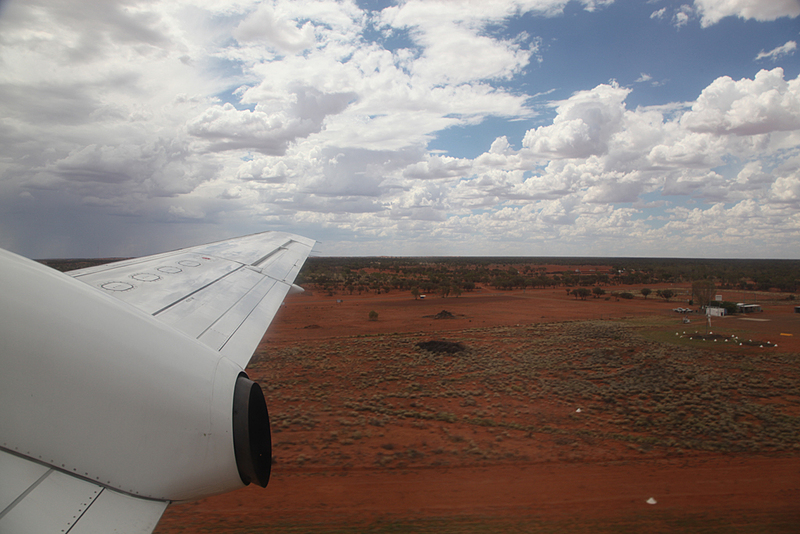 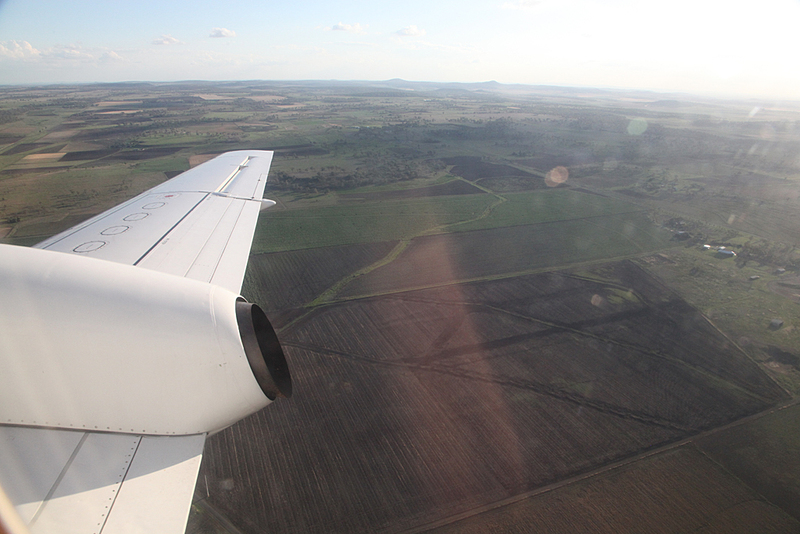 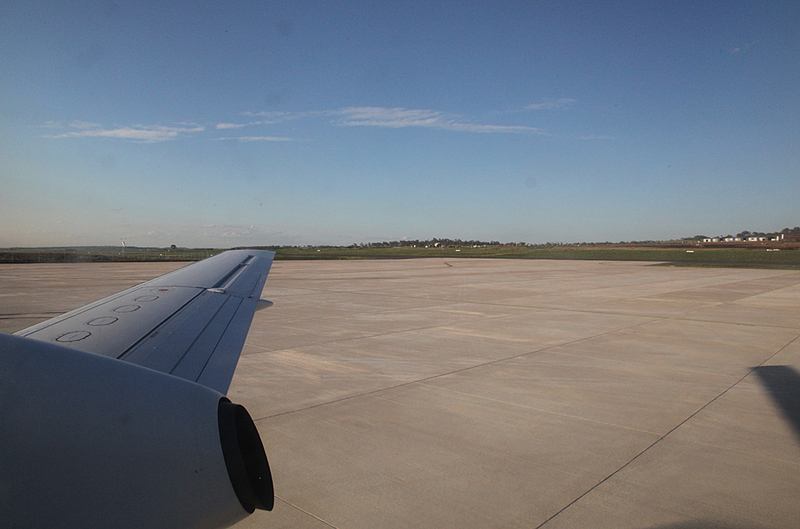 Quite smooth approach and landing in Charleville. 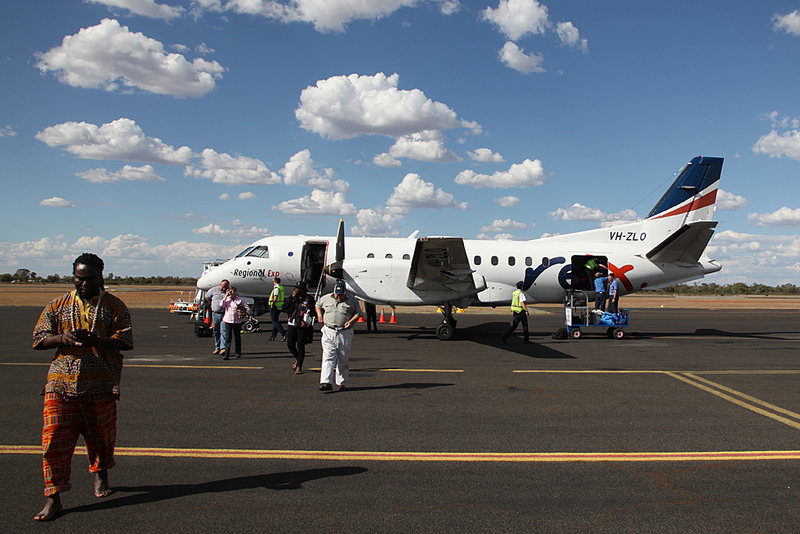 In Charleville, the flight crew changed over to the crew who operated the first part of yesterday's flight before it broke down in Charleville. 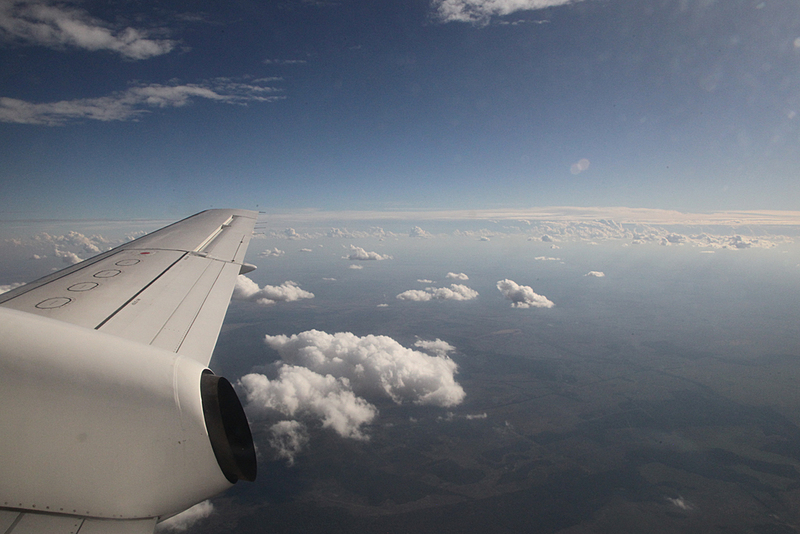 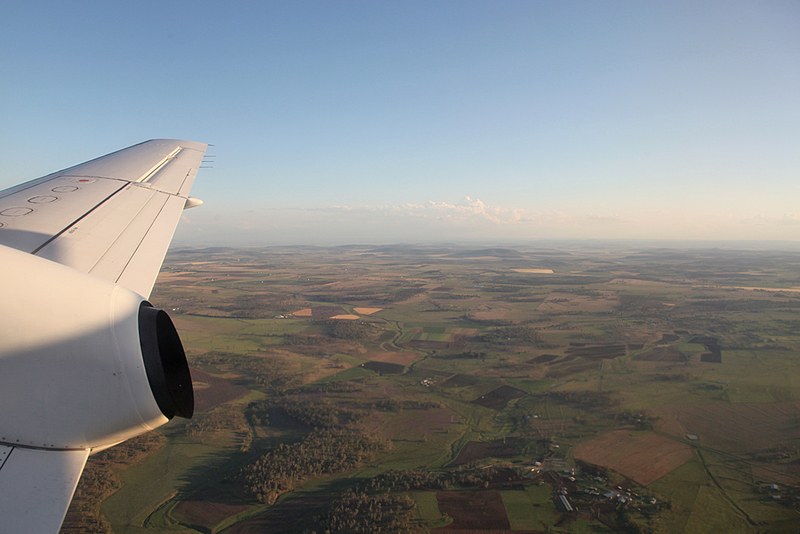 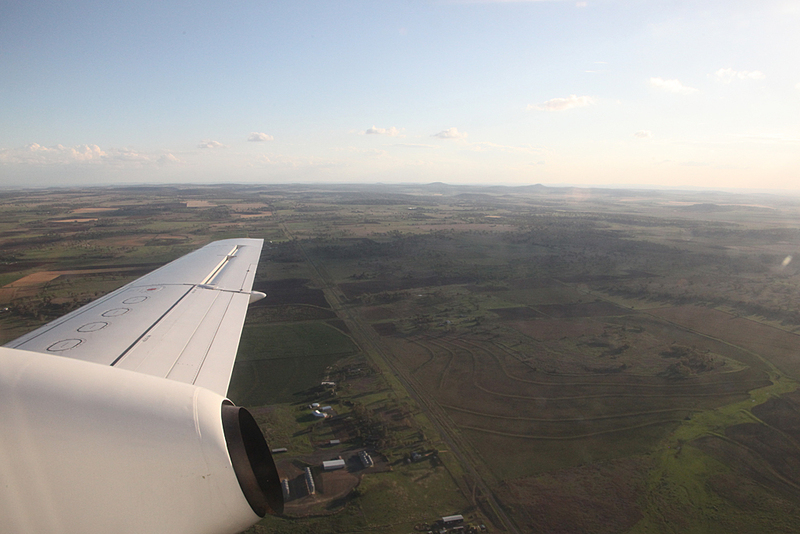 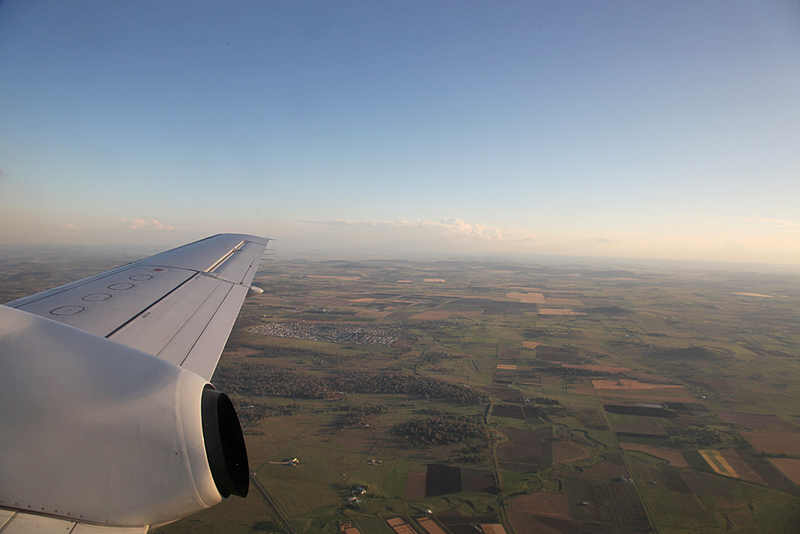 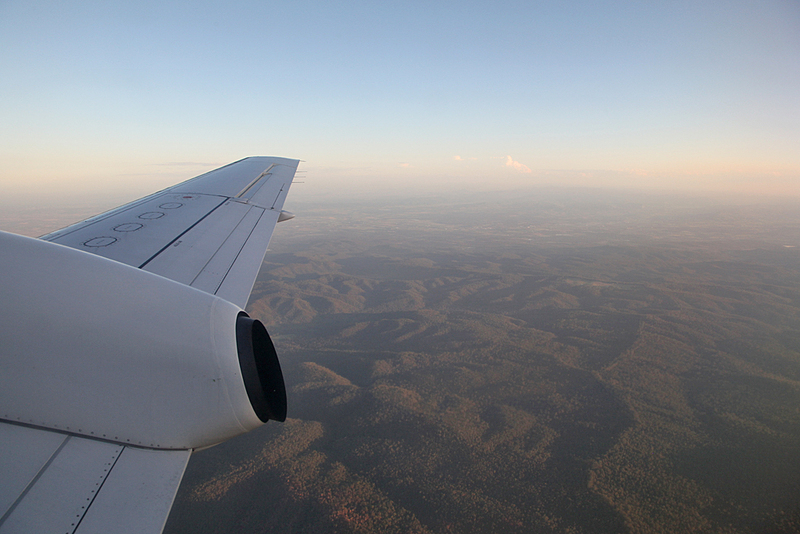 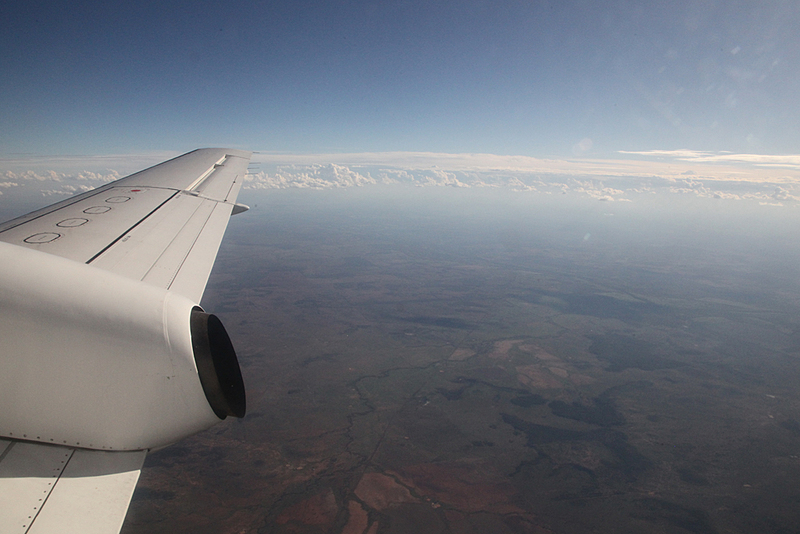 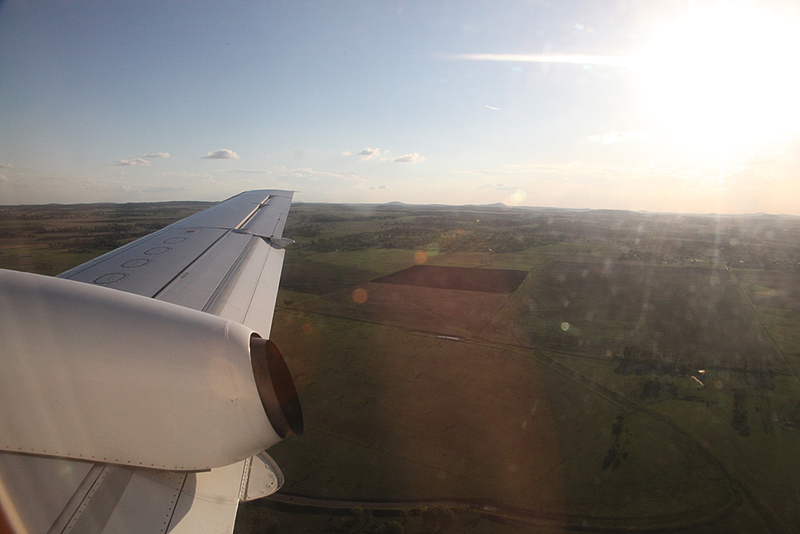 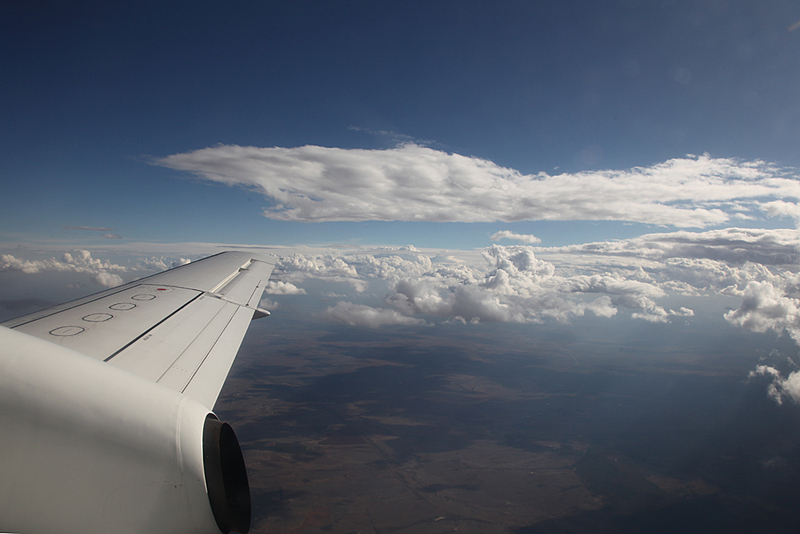 Smooth take off towards Toowoomba and not as bumpy as earlier. 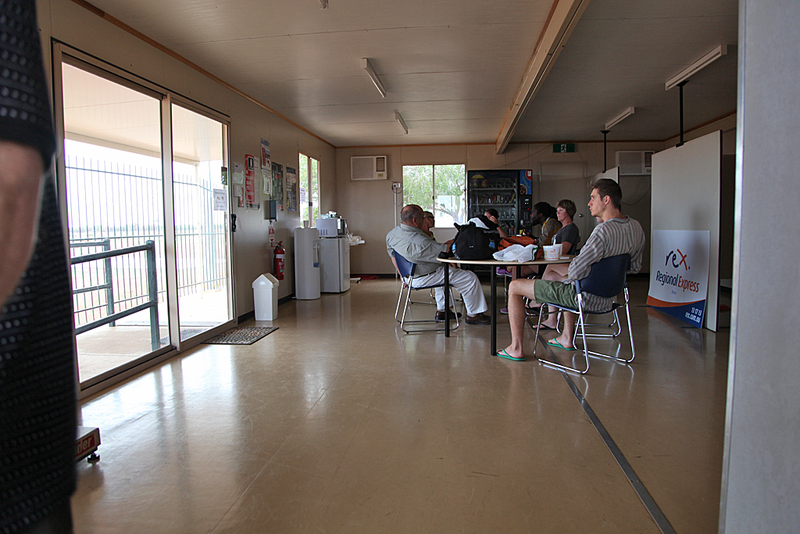 Snacks and water were again offered. 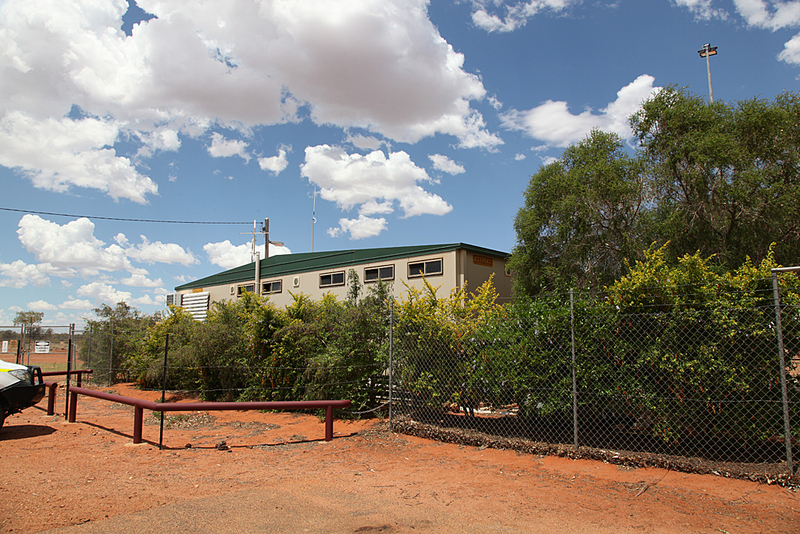 Tea and coffee was offered on this sector. 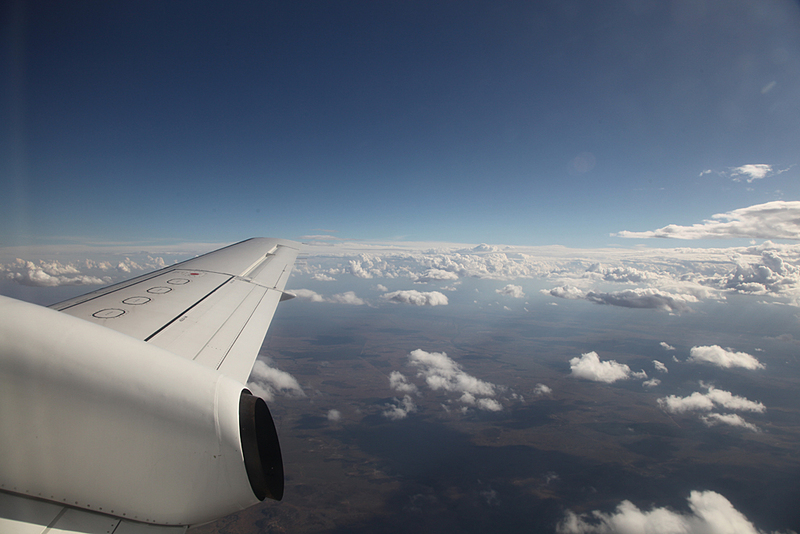 Flight time approx 1 hour 15 minutes. 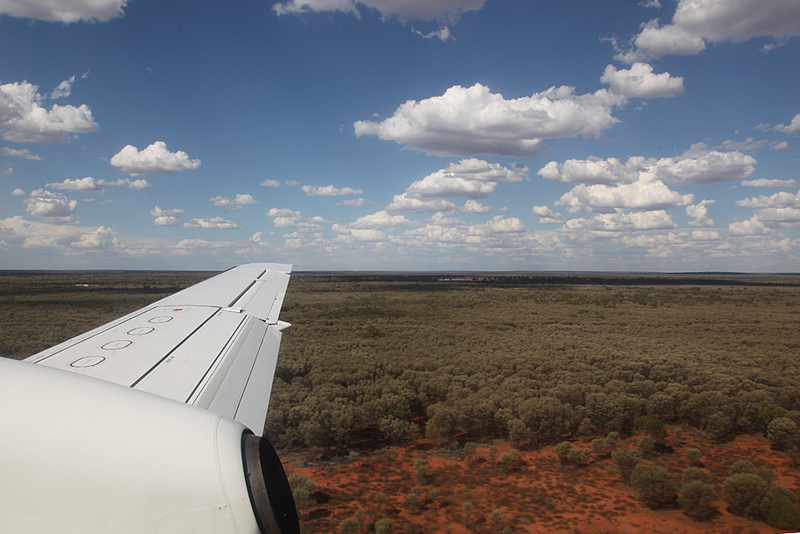 Scenery outside stating to look a bit greener. 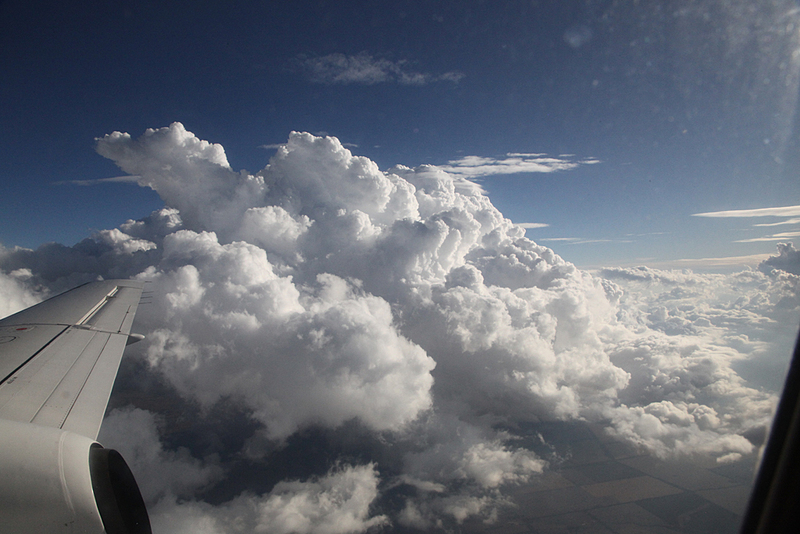 Some big thunderstorm clouds were not far away. 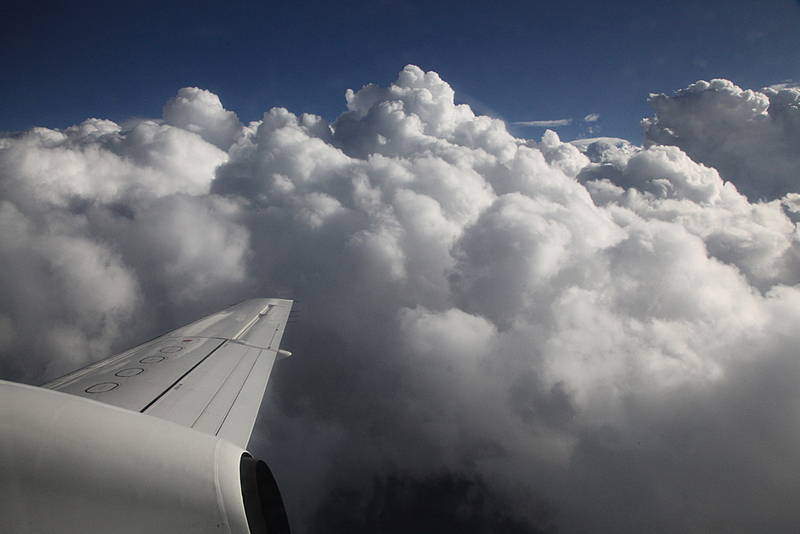 A little turbulence from them. 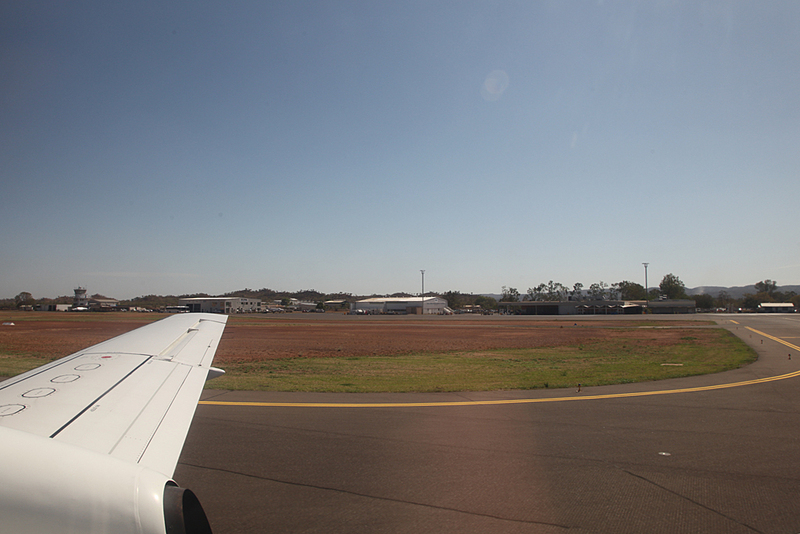 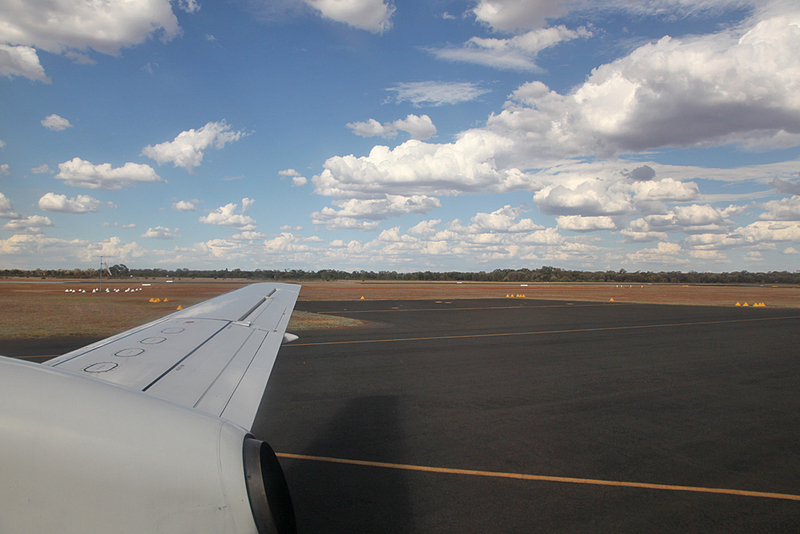 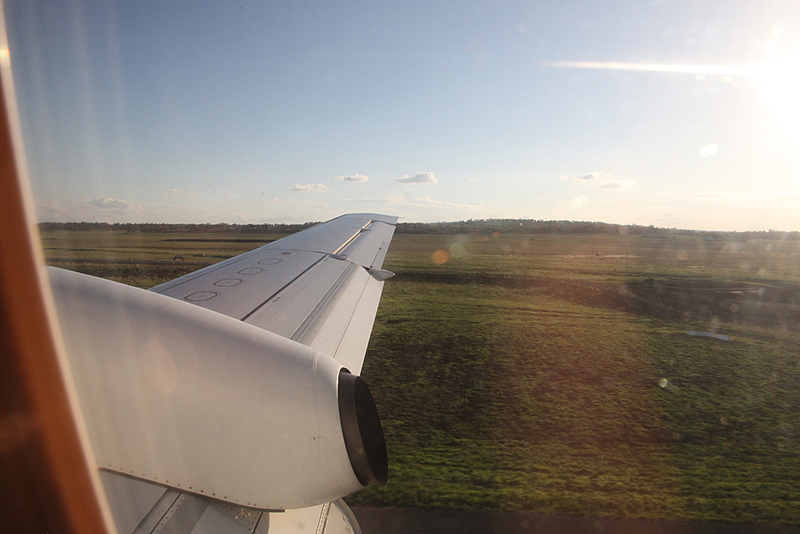 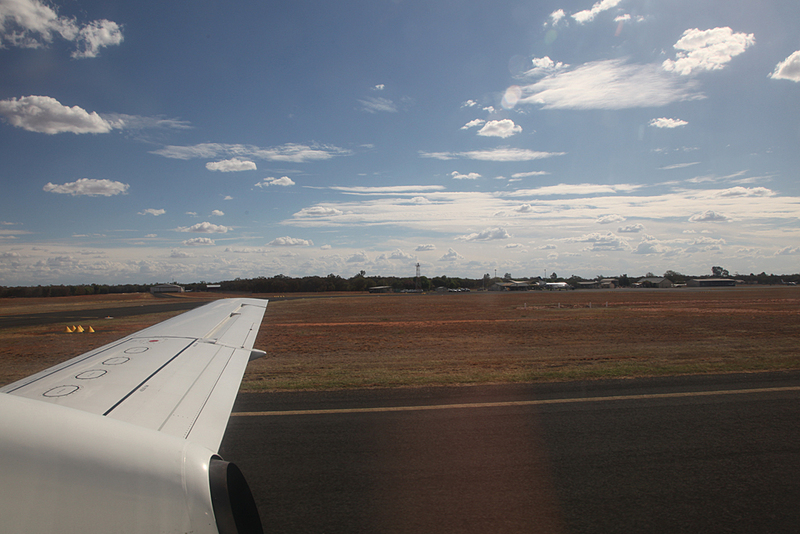 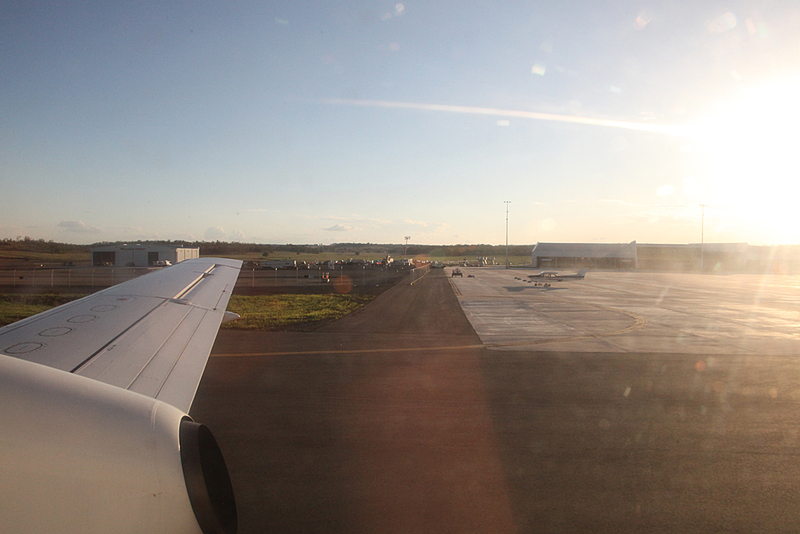 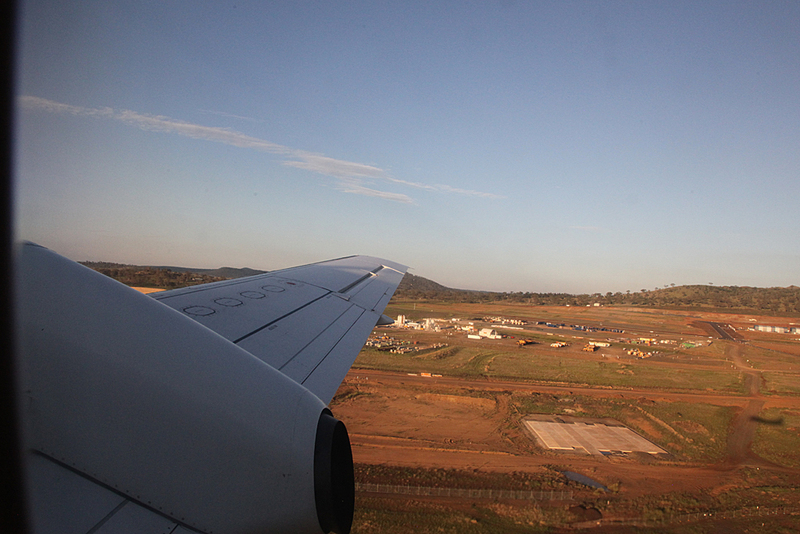 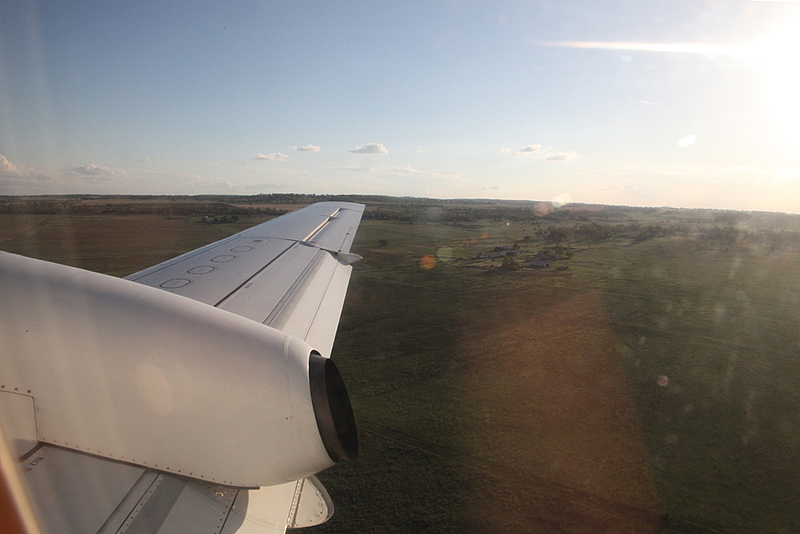 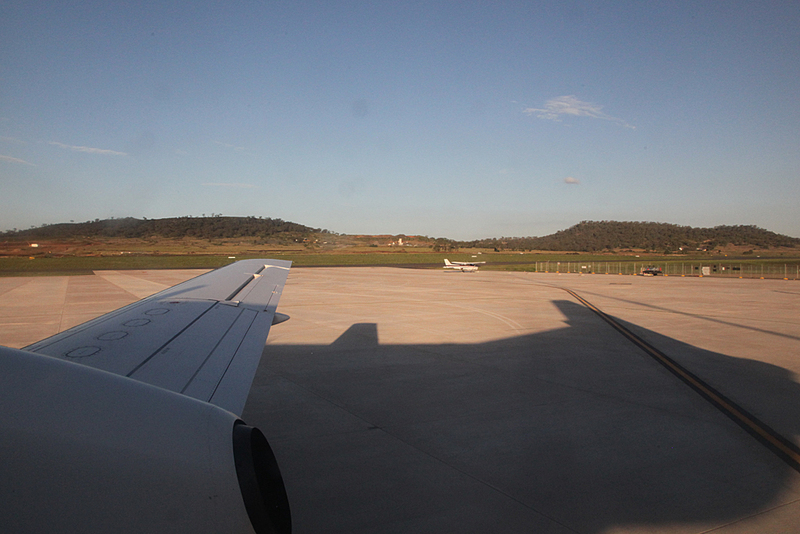 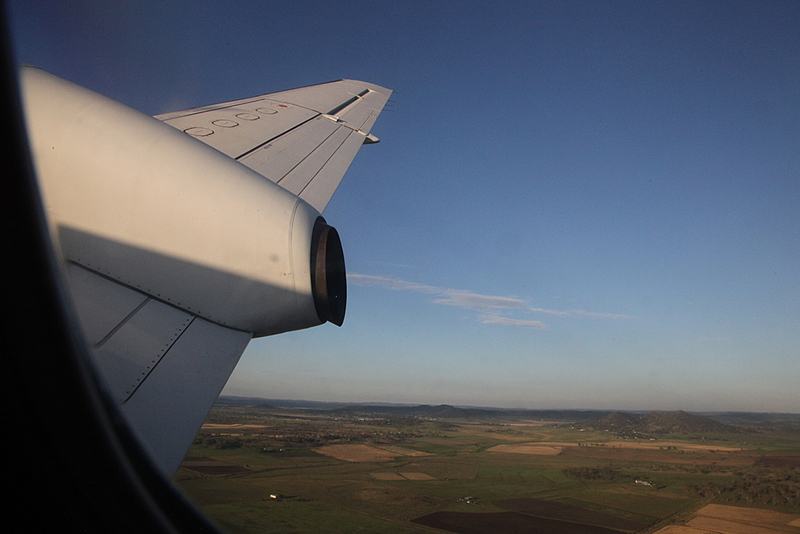 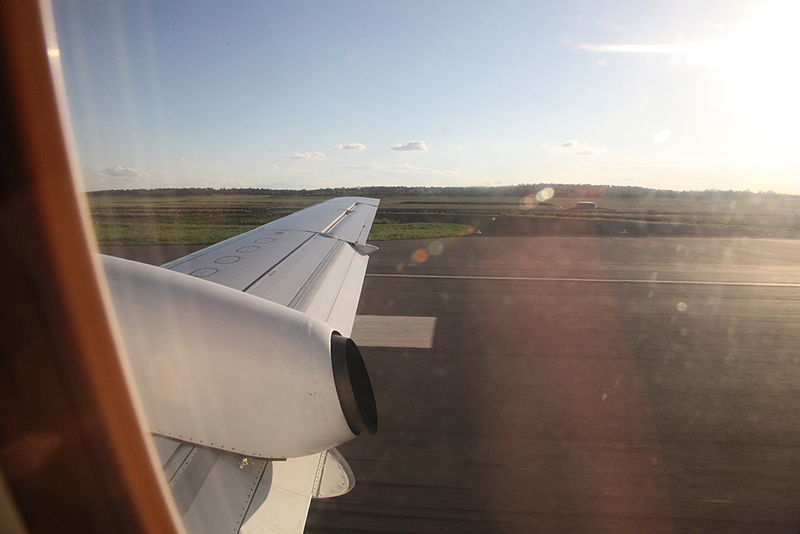 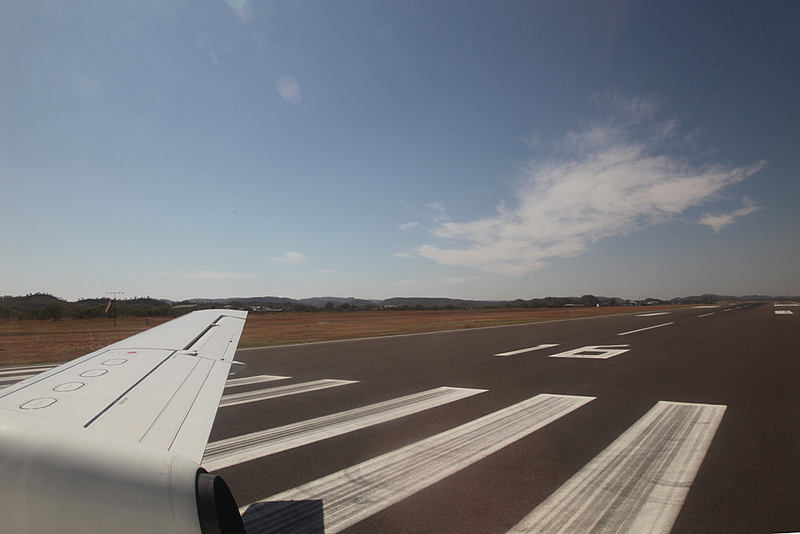 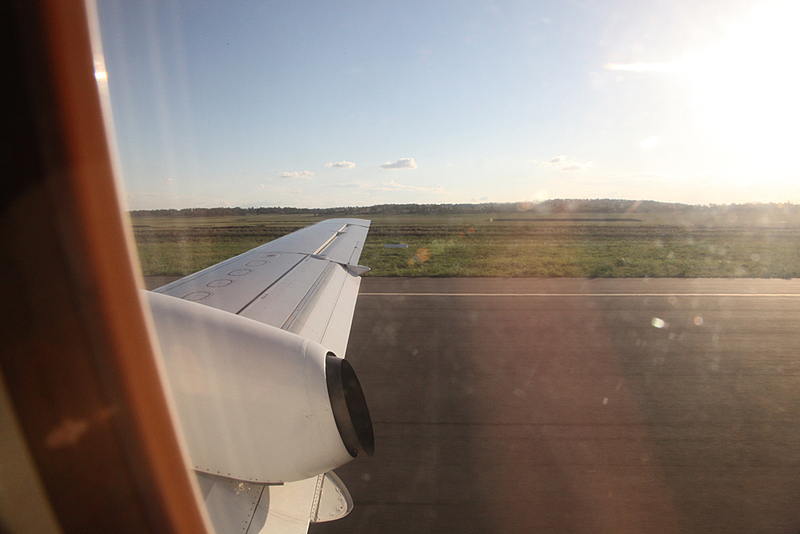 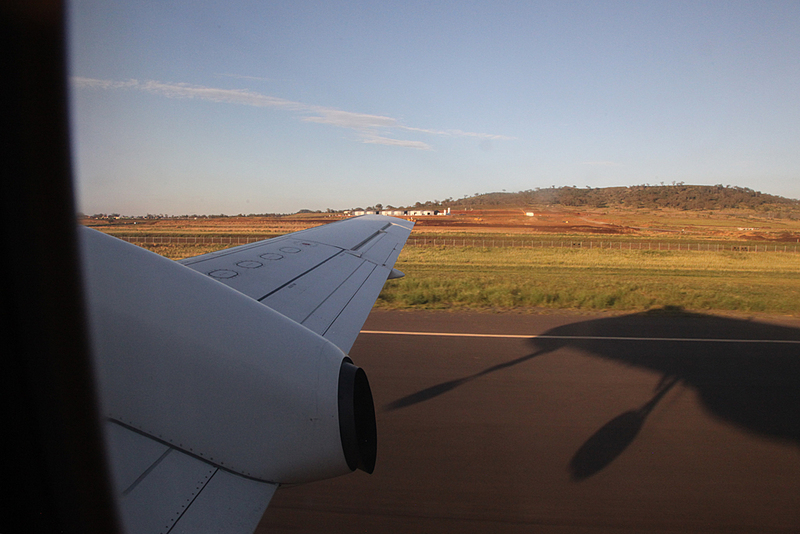 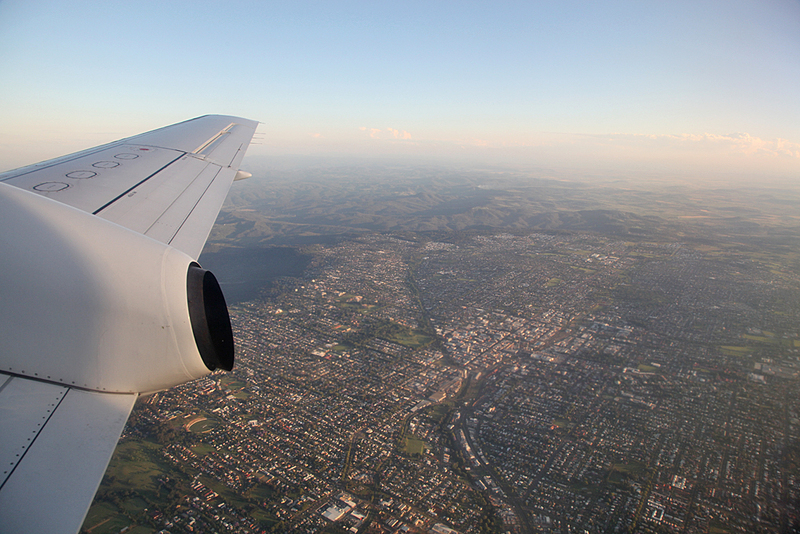 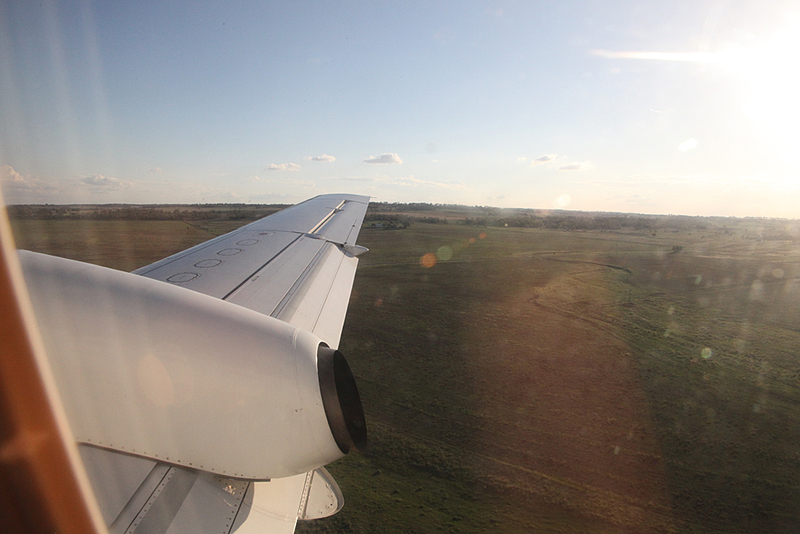 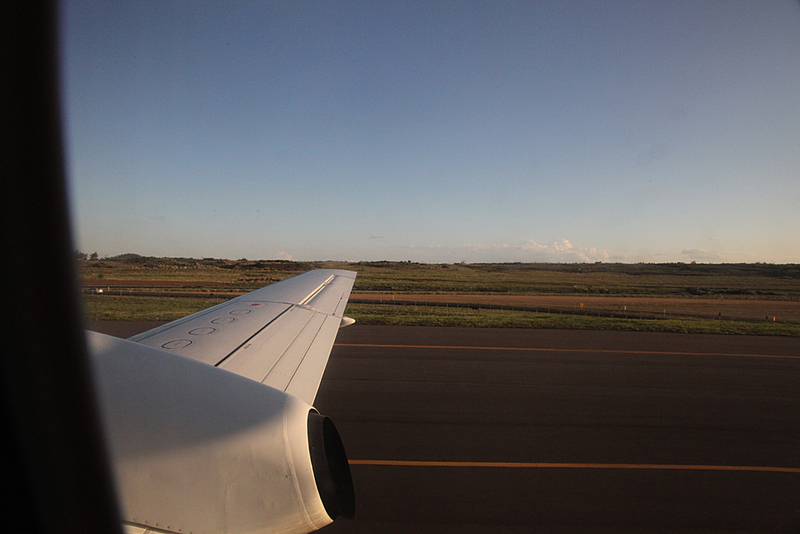 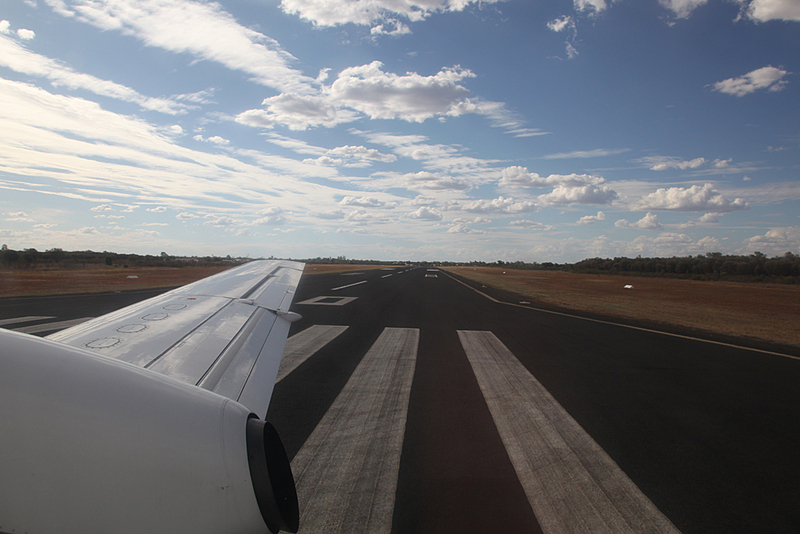 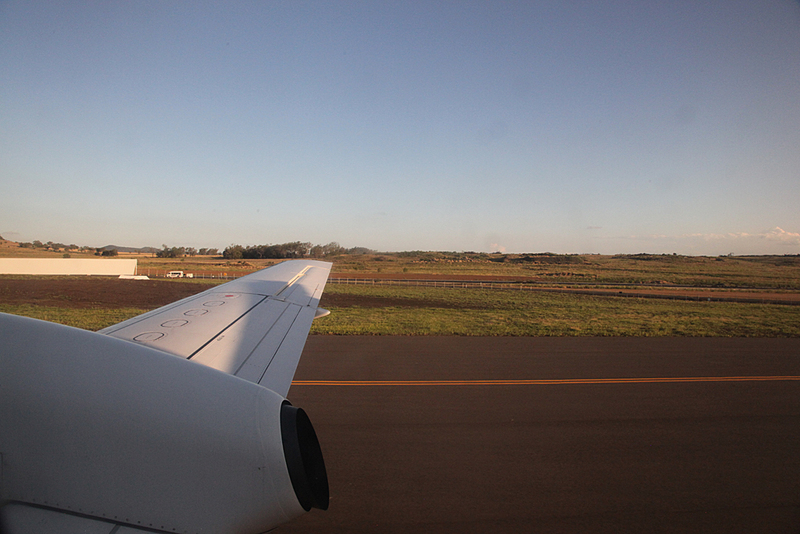 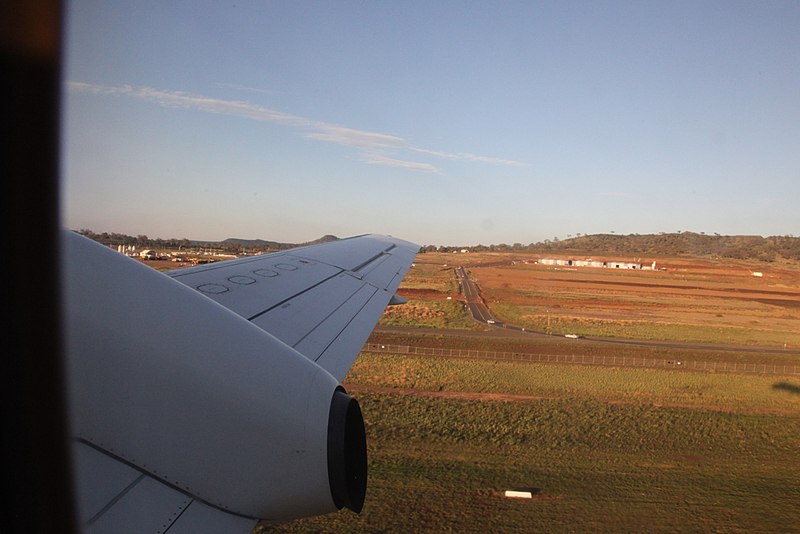 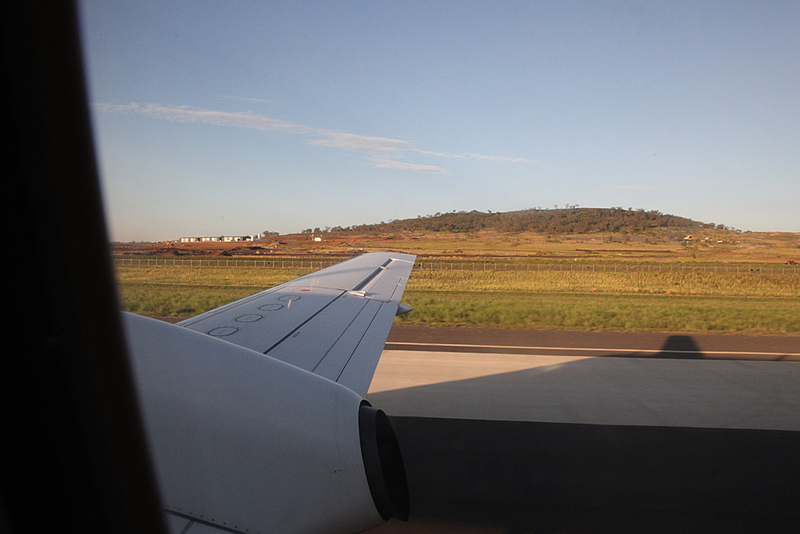 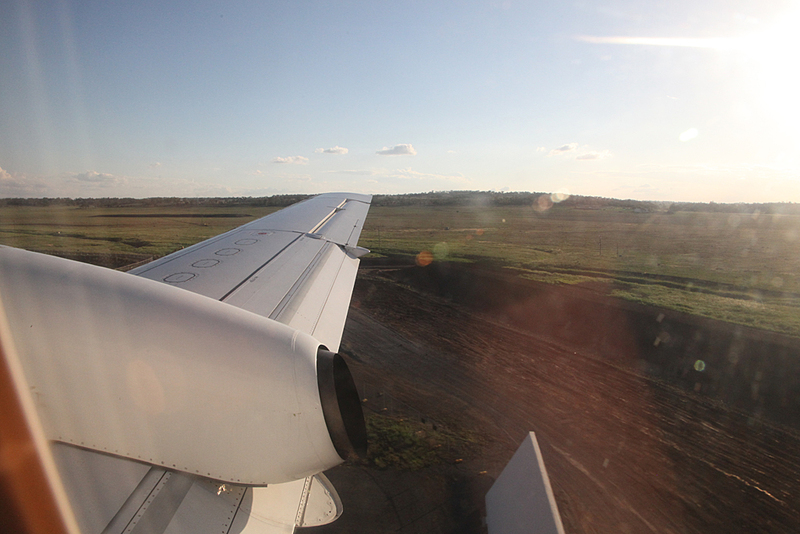 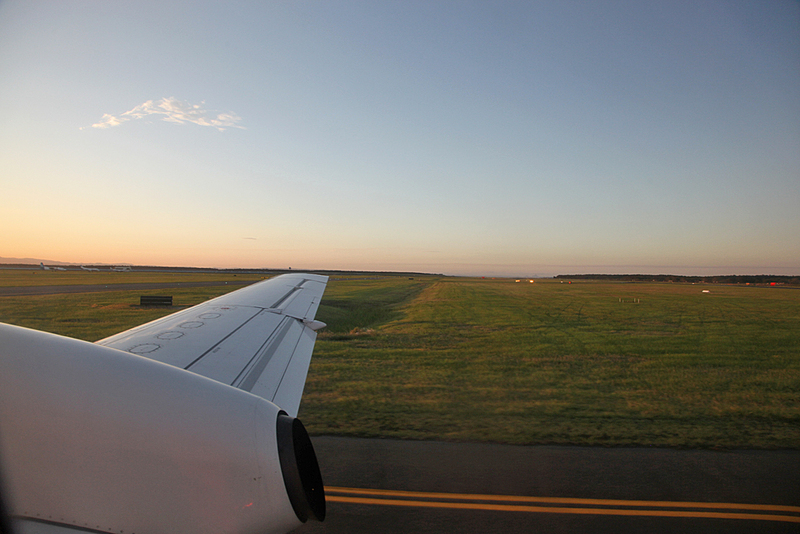 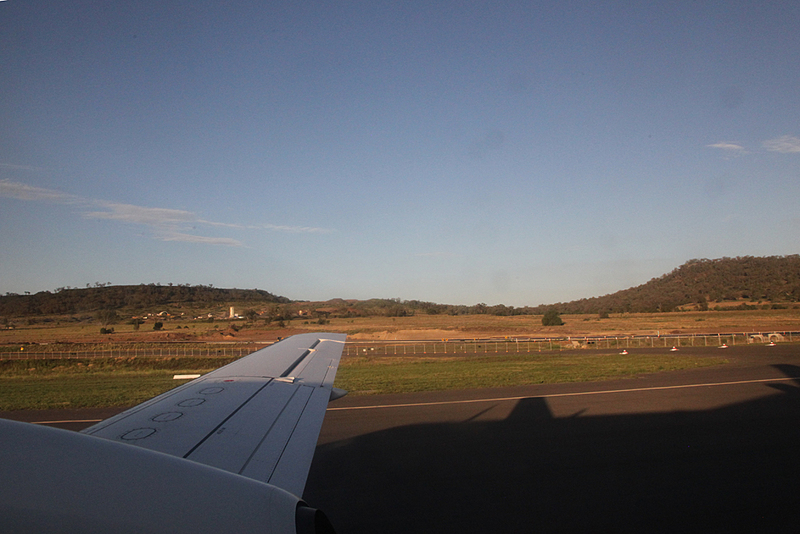 Quite smooth the landing in Toowoomba. 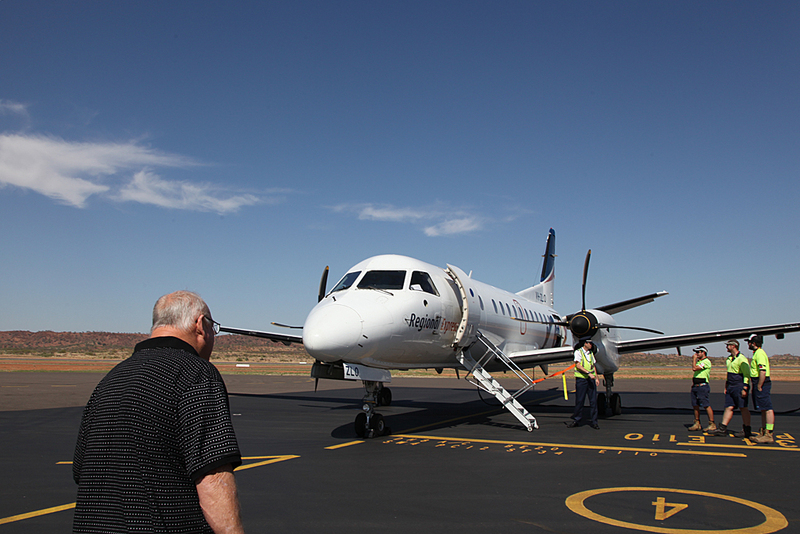 About eight passengers got off here. 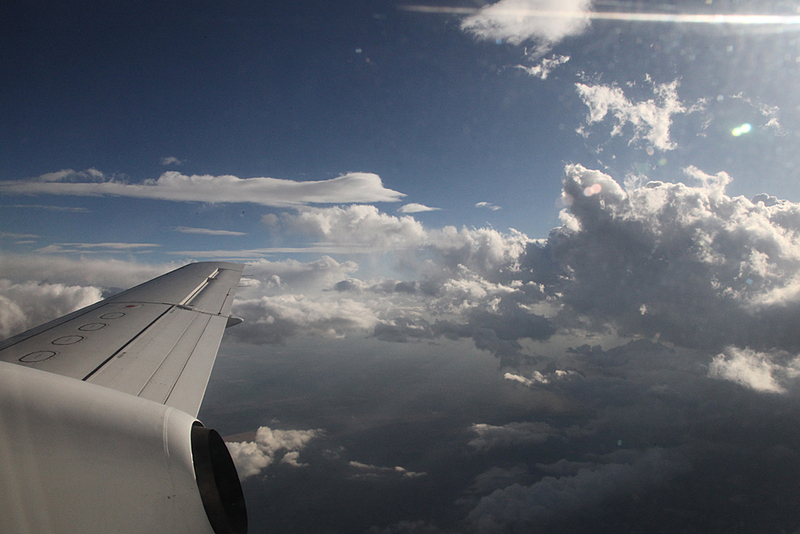 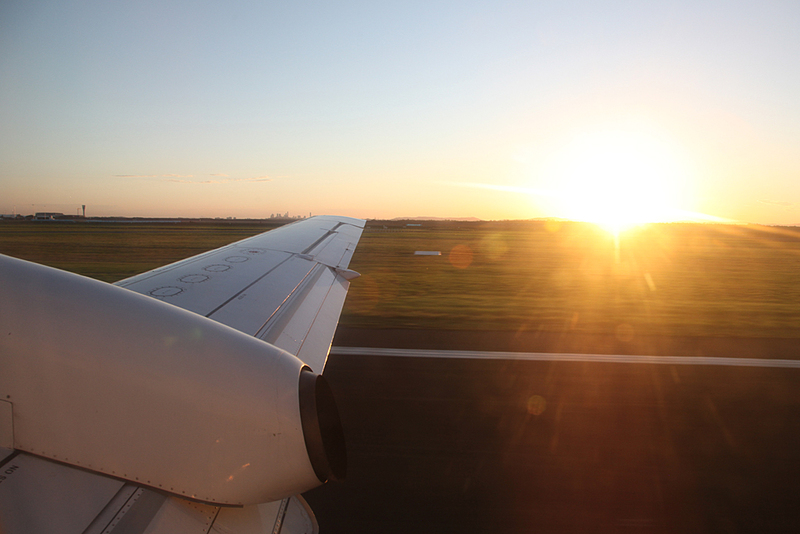 Took off for Brisbane with a flight time of 20 minutes. 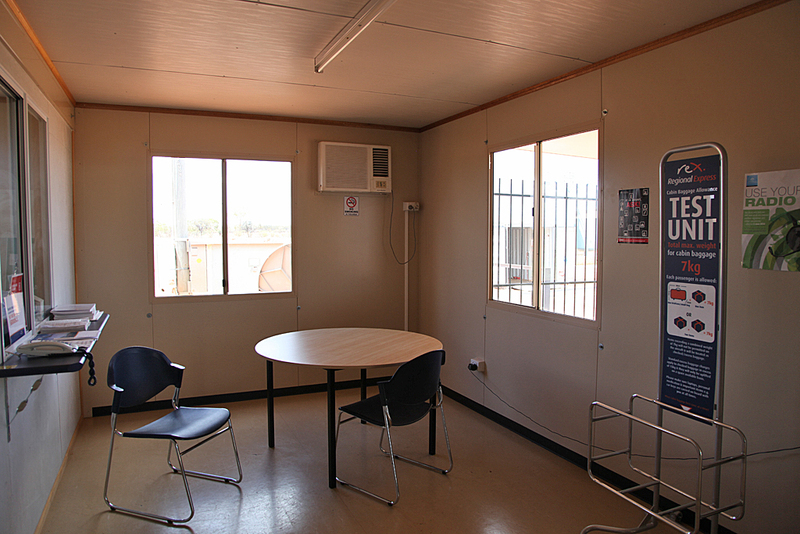 Drinks and snacks offered. 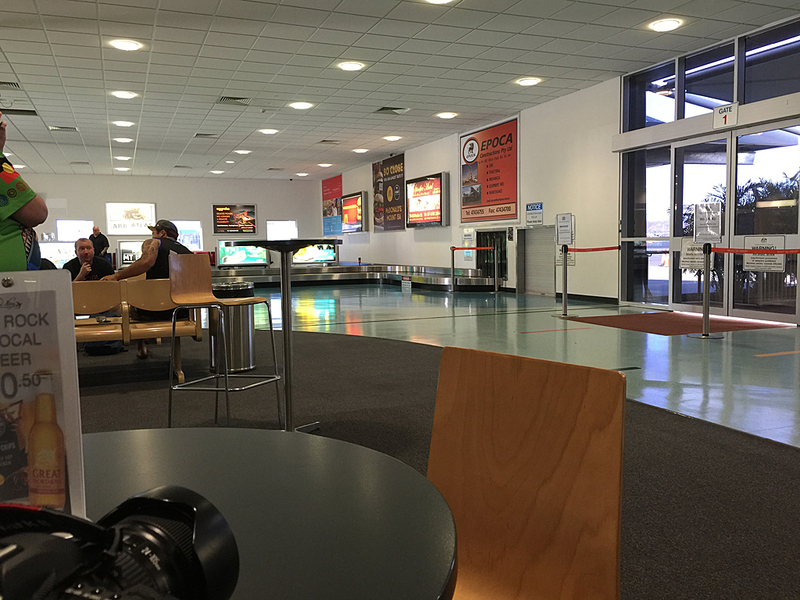 Quite liking the savoury snacks. 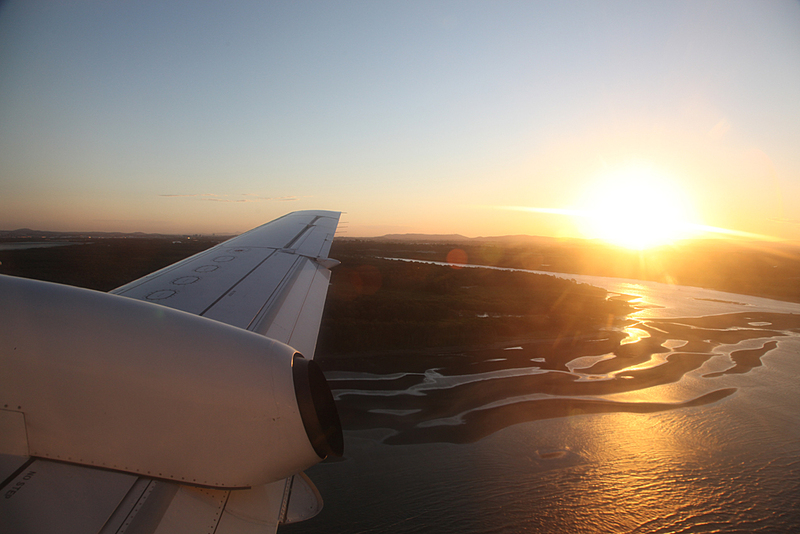 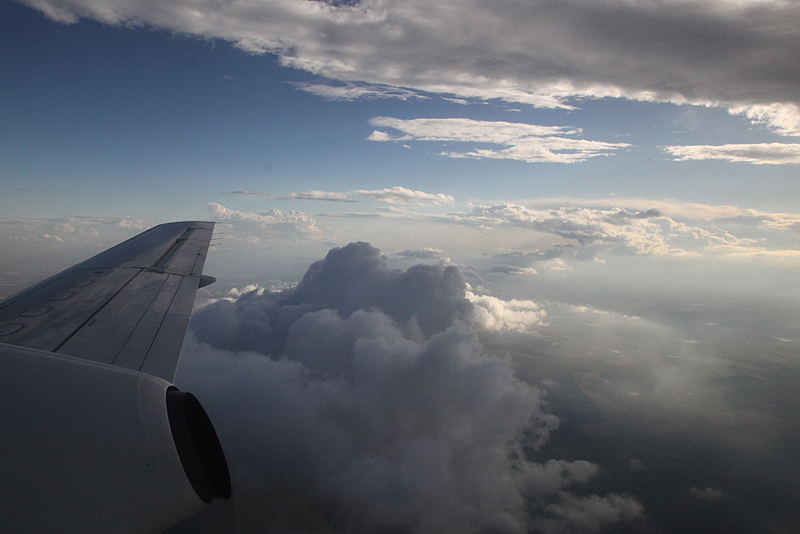 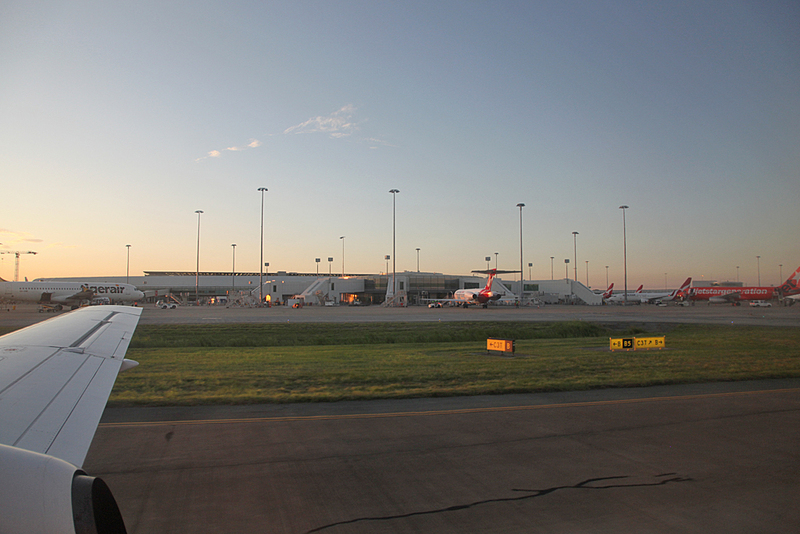 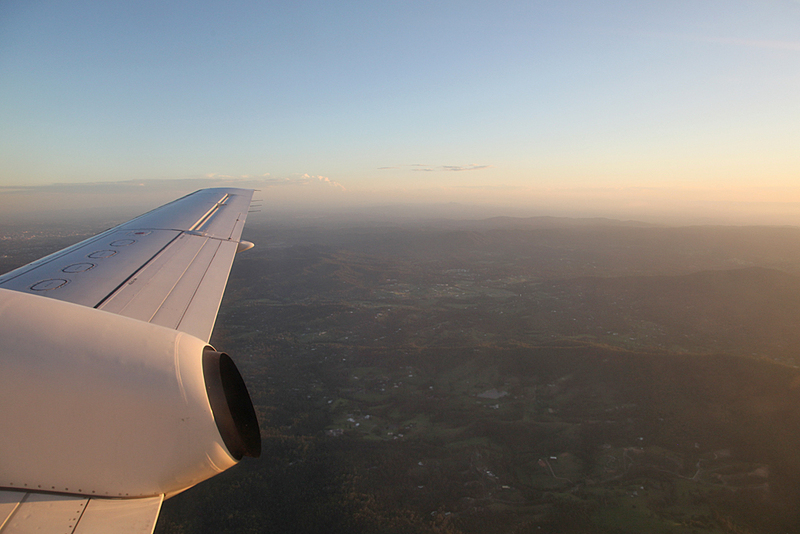 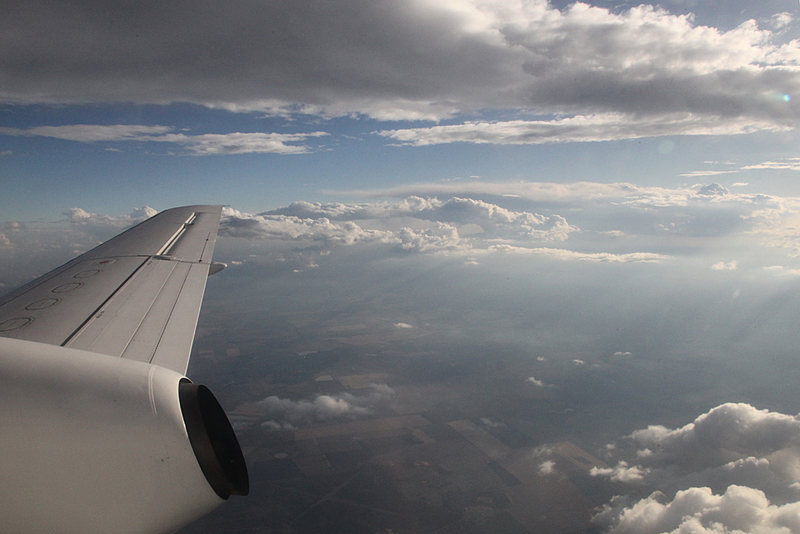 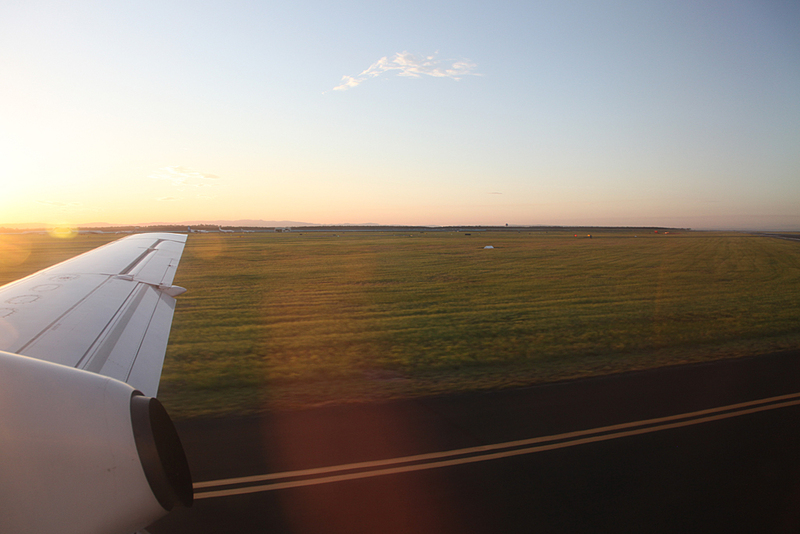 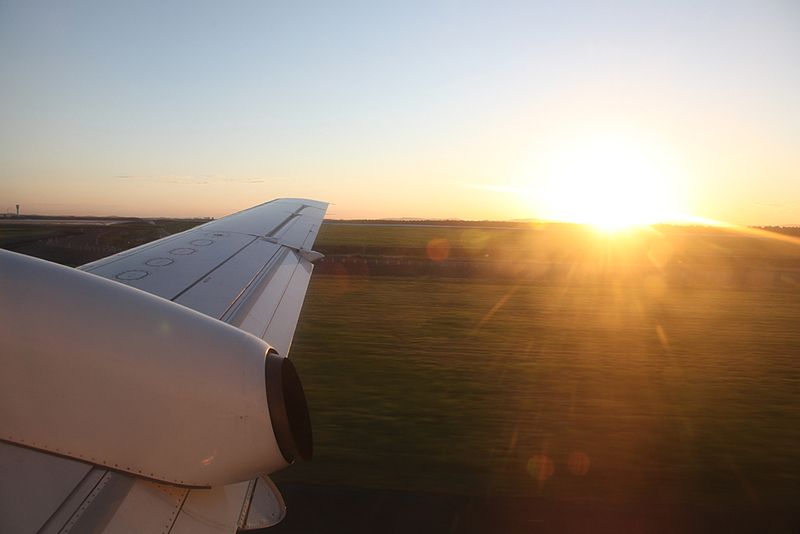 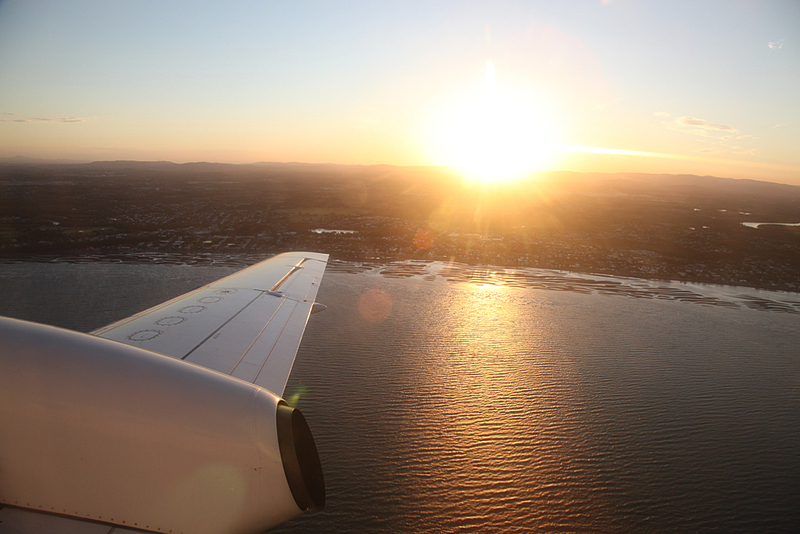 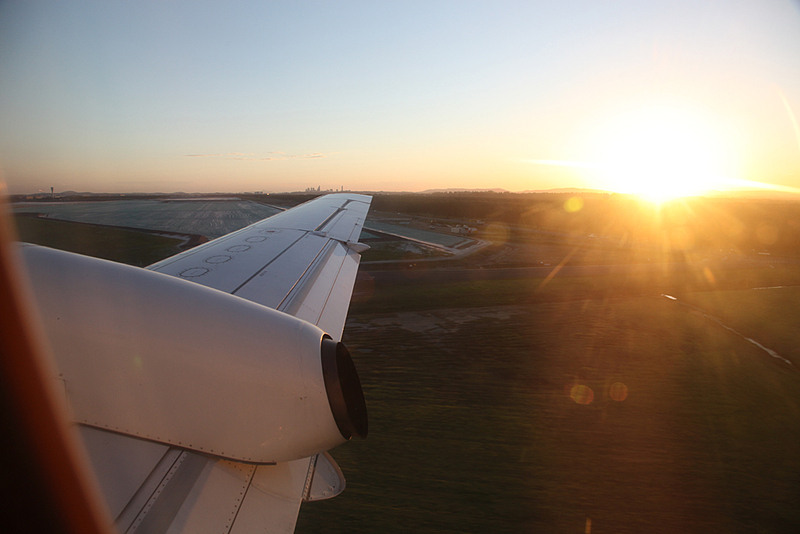 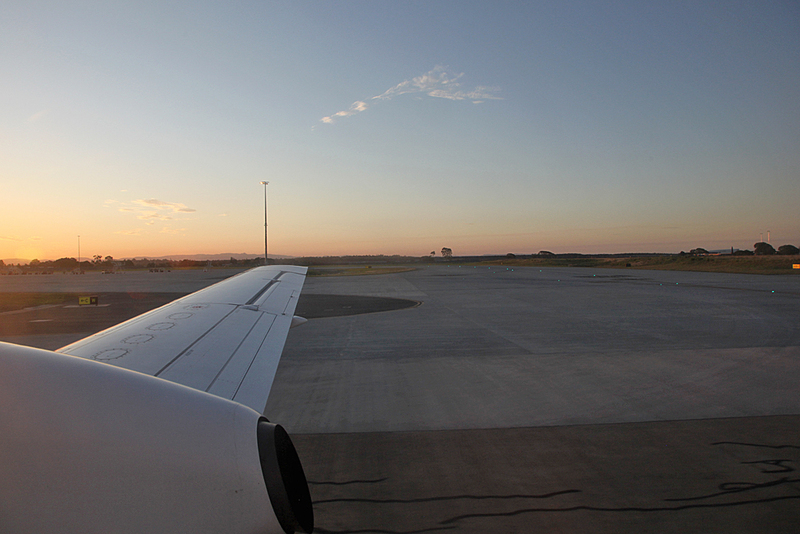 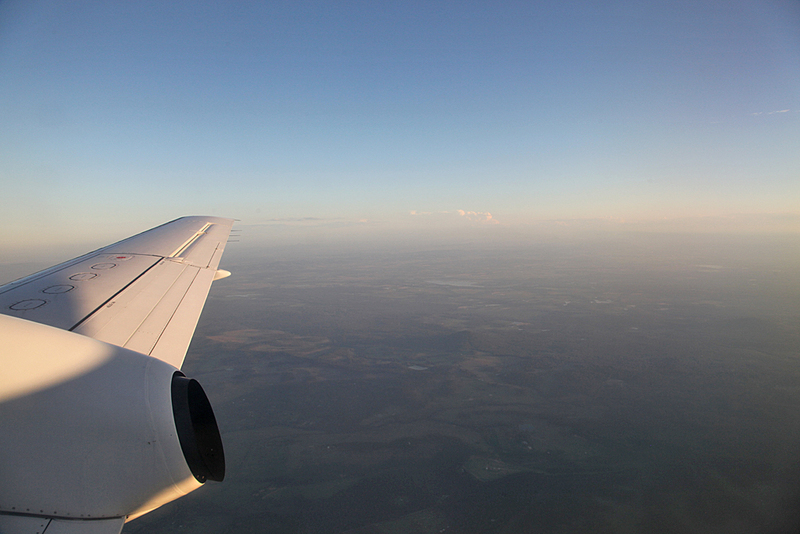 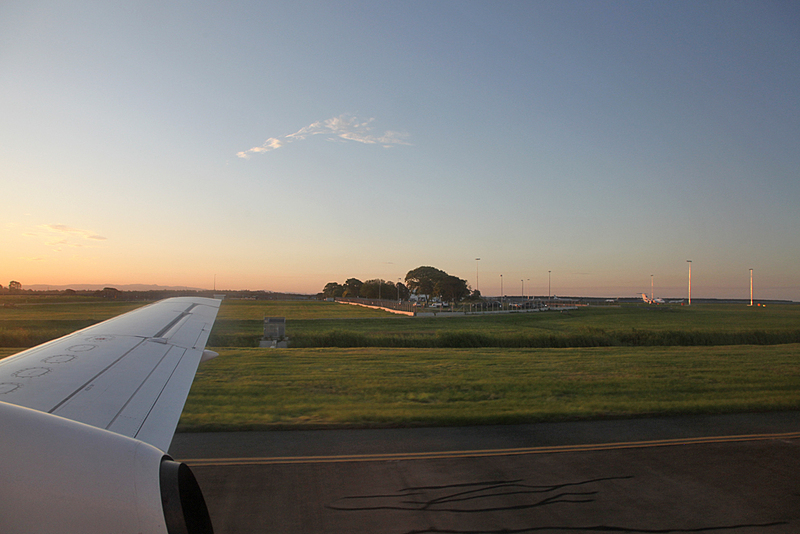 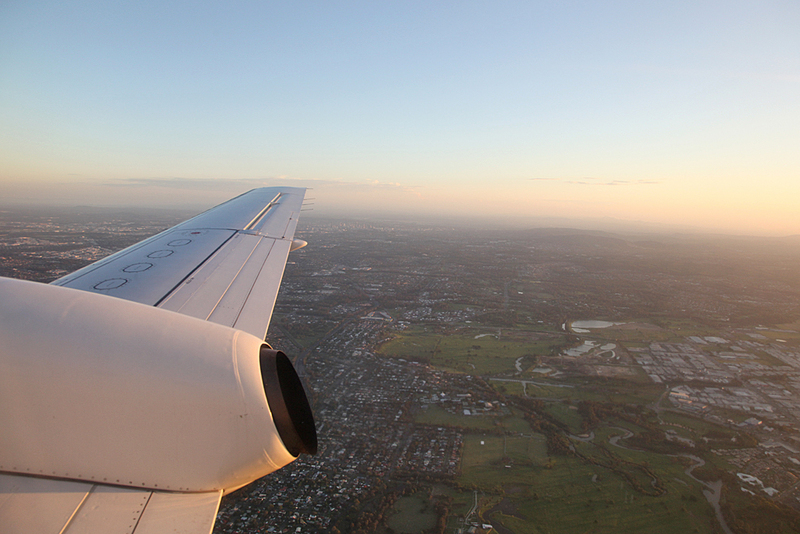 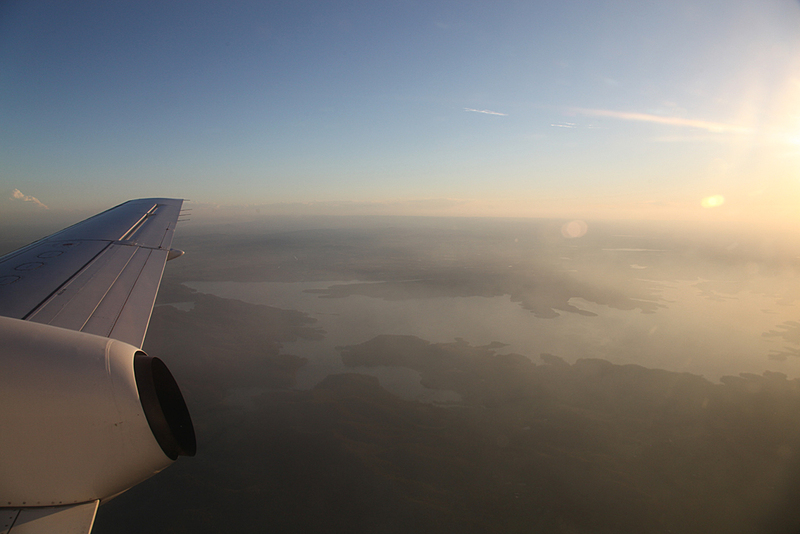 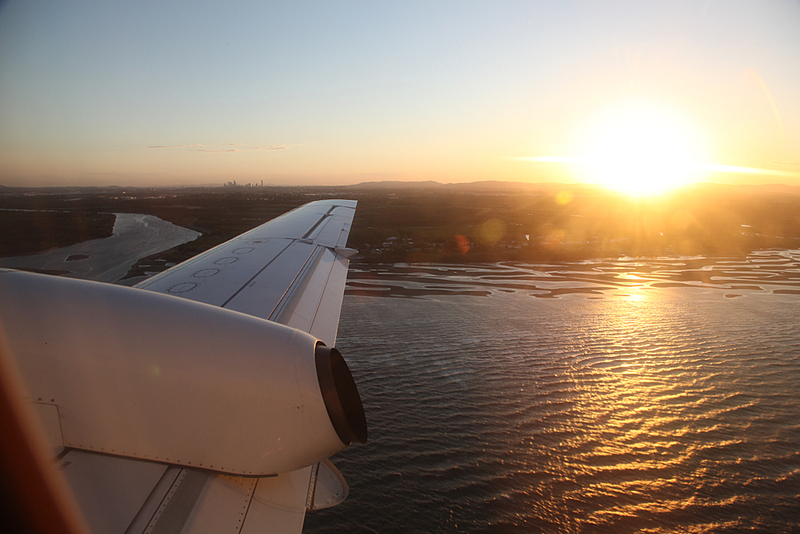 Smooth all the way to Brisbane and landed just before sunset. 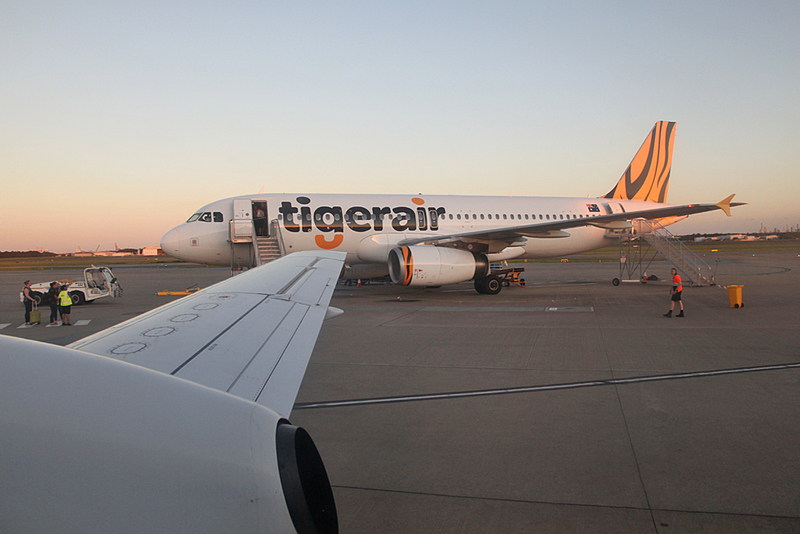 Qantaslink 717 and Tiger A320. 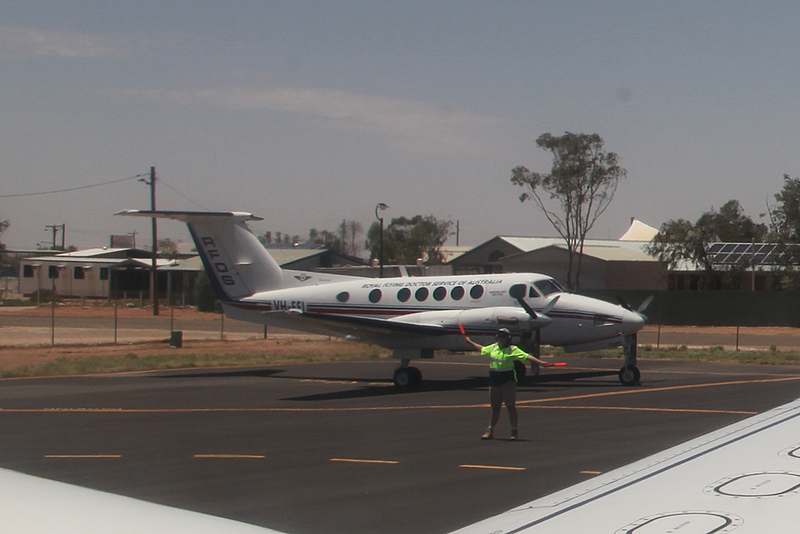 Waited for the crowd to go, had a quick chat to the crew before leaving the aircraft. 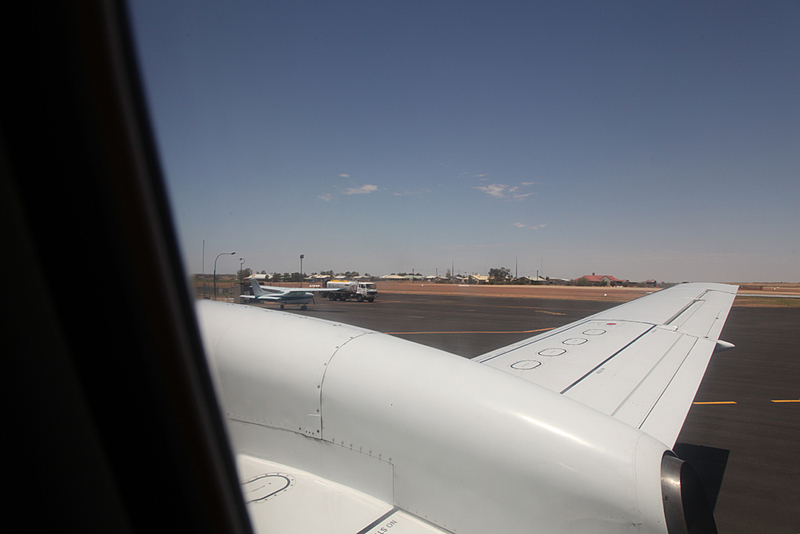 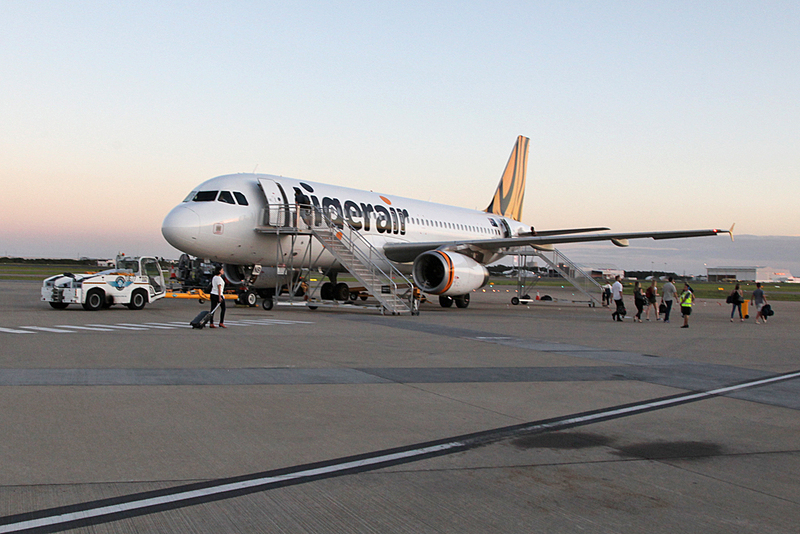 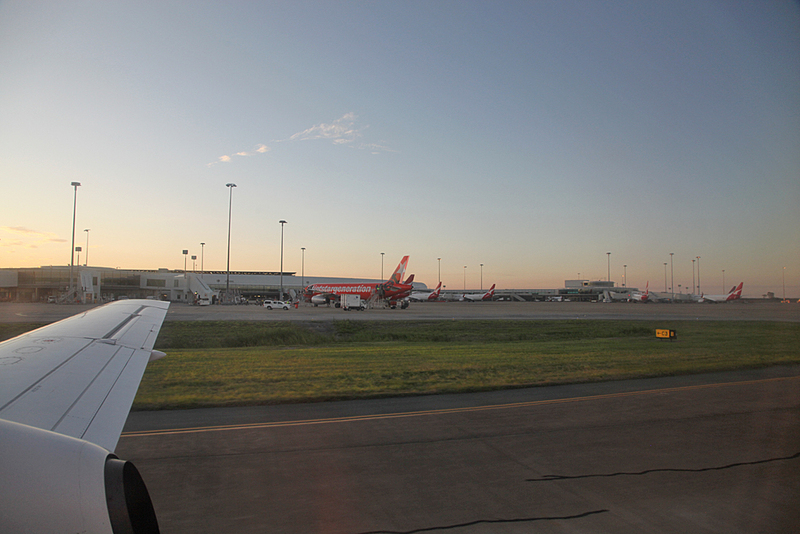 A couple of quick pics of aircraft on the tarmac. 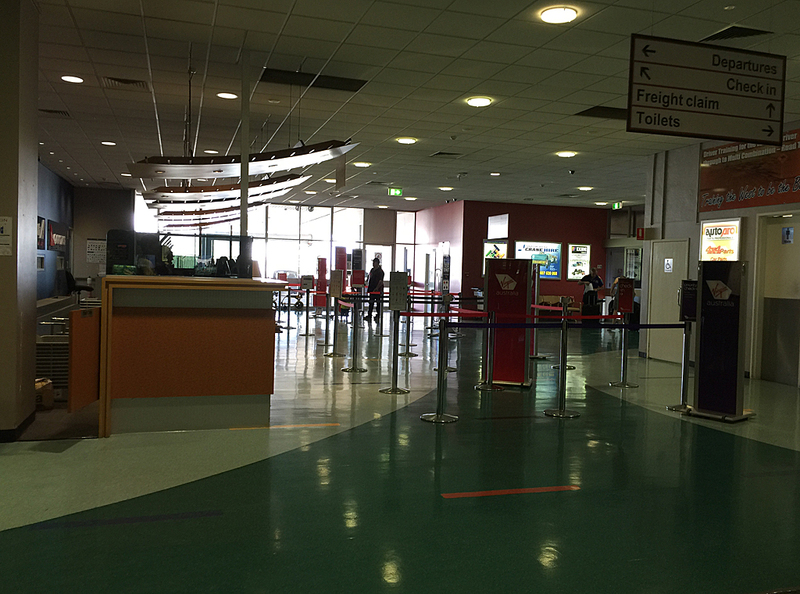 Since we had arrived from airports without x ray and metal detectors we had to go through a network of passageways that kept us separate from other passengers until the baggage reclaim area. 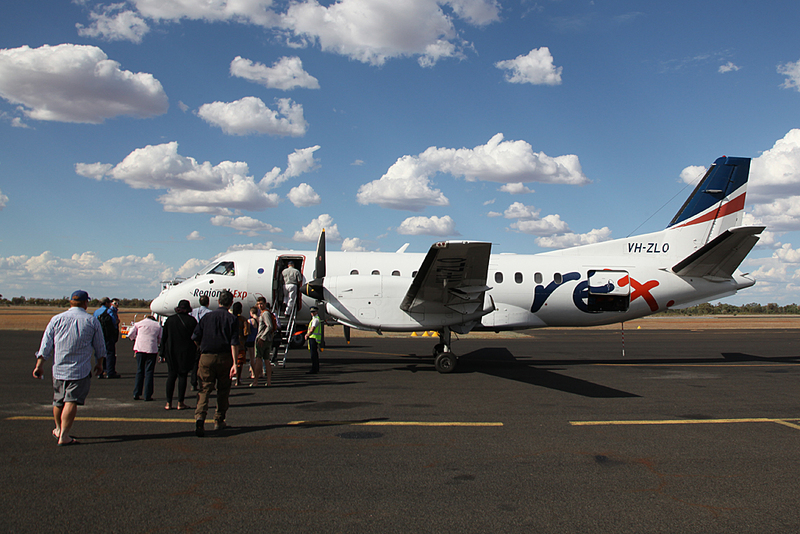 No problems with REX and when the aircraft broke down in Charleville the day before, no one seemed too worried about it.People behave differently out in the bush versus at a big crowded airport. 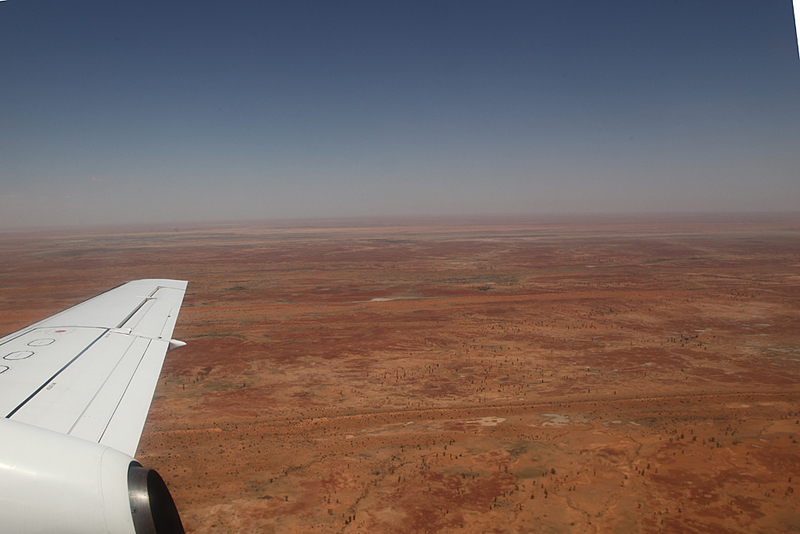 To me this flight seemed to be a good way to get to see some of the outback, without the hassle of driving around in a 4WD etc.